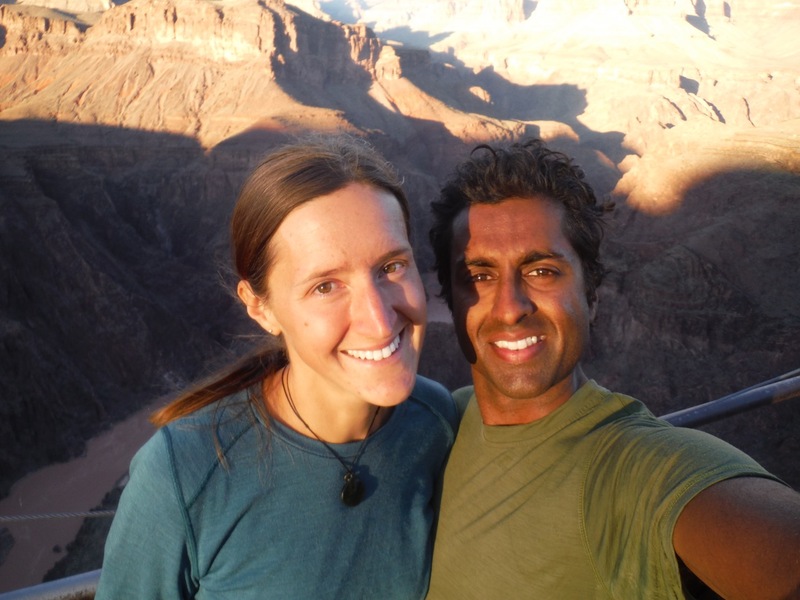 RAVI AND ALISON – Taking a career break to travel the world! 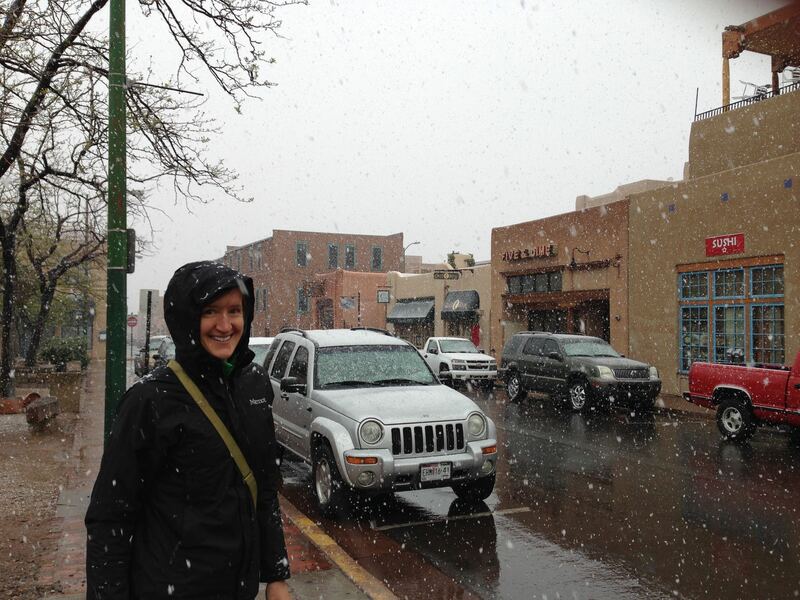 The weather in Colorado this spring is unusually wet and wild-so the locals say. 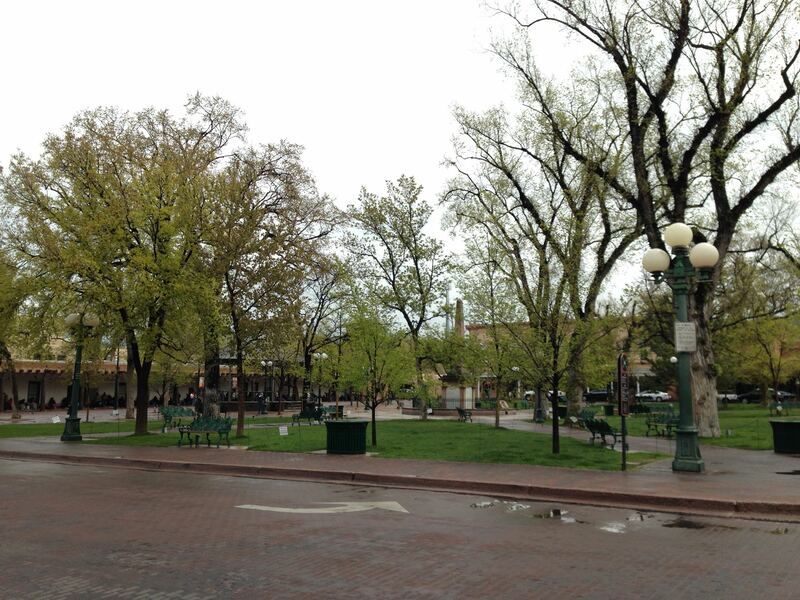 One of the main reasons we moved to Colorado from Washington was to escape the months of grey skys and soaked earth. Of course Washington is an amazingly beautiful state and those months of rain create beautiful flora, but we could only take so much. 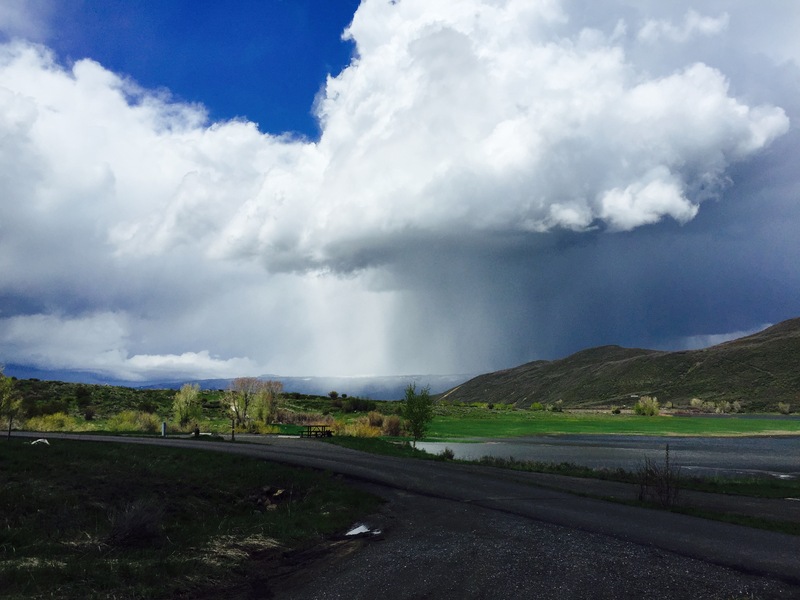 We were expecting a bit more sunshine here, and found it somewhat ironic that the local news had taken to highlighting the difference between Seattle weather (sunny) and Denver weather (rainy) for the past few weeks. I admit we were a bit envious seeing four Seattle friend’s social media posts with clear, sunny, skies and warm weather, while the view out our window was grey. 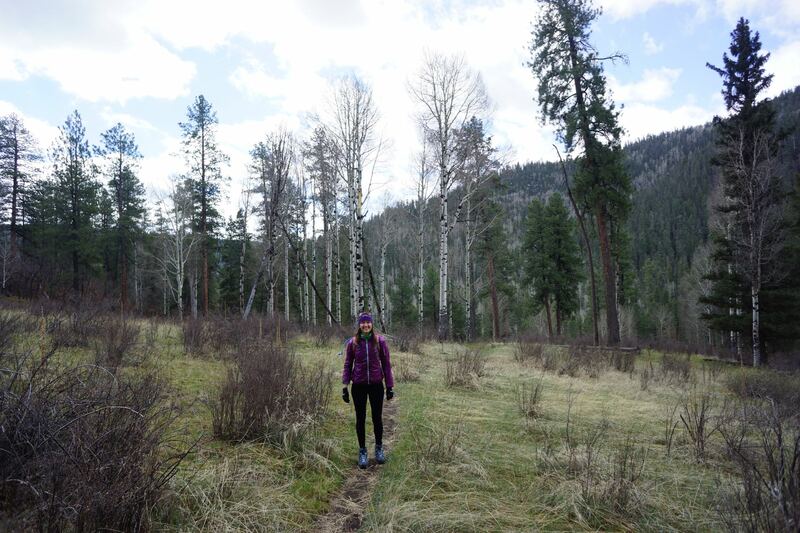 Nonetheless, we were determined to bust out our camping gear and explore our new state. 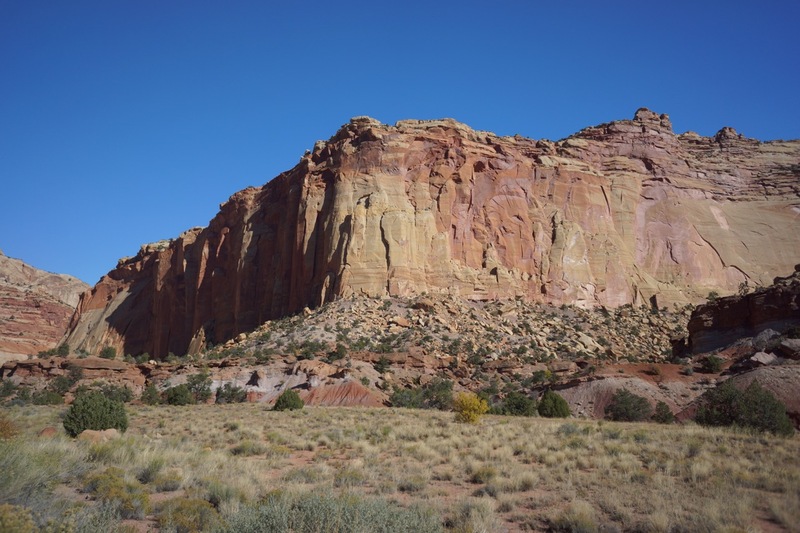 After a diligent search for locales with at minimum a decent forecast and within 4 hours drive, we discovered Palisade. 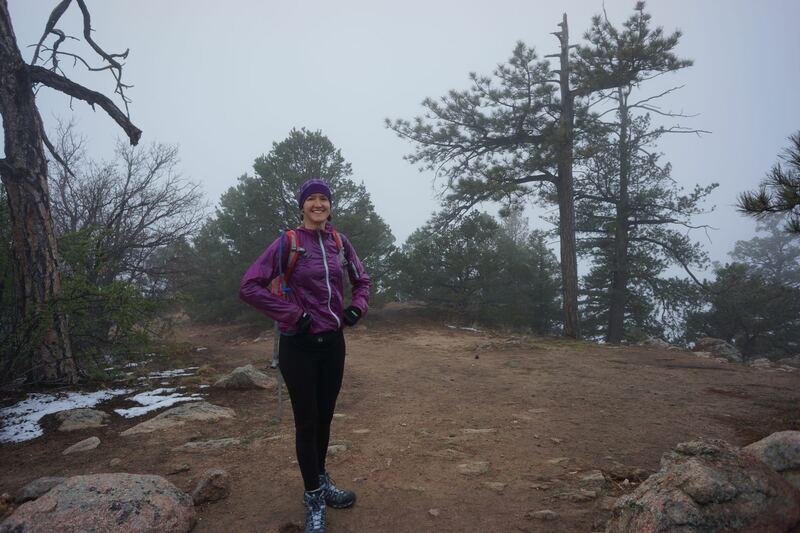 We headed out mid-week and planned on coming back on Saturday to beat the crowds and get back for the Bolder Boulder race on Sunday. 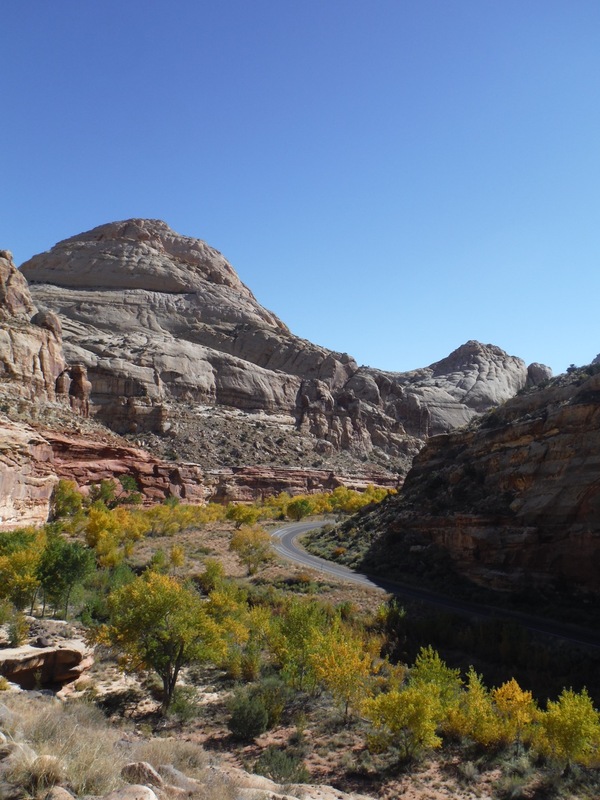 Palisade is a small town on the western slope of the Rockies about 3.5 hours drive on I–70 from Denver. 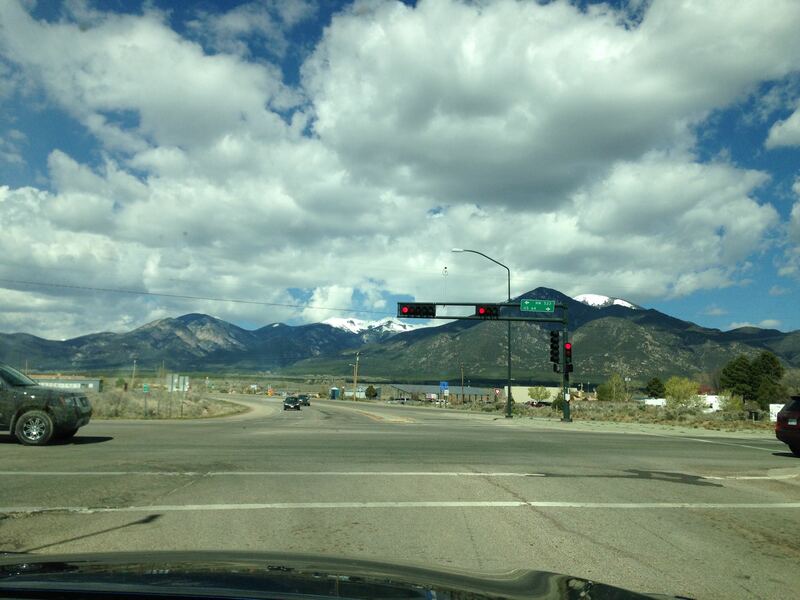 The drive was beautiful, passing by the big ski resorts and driving through canyons. 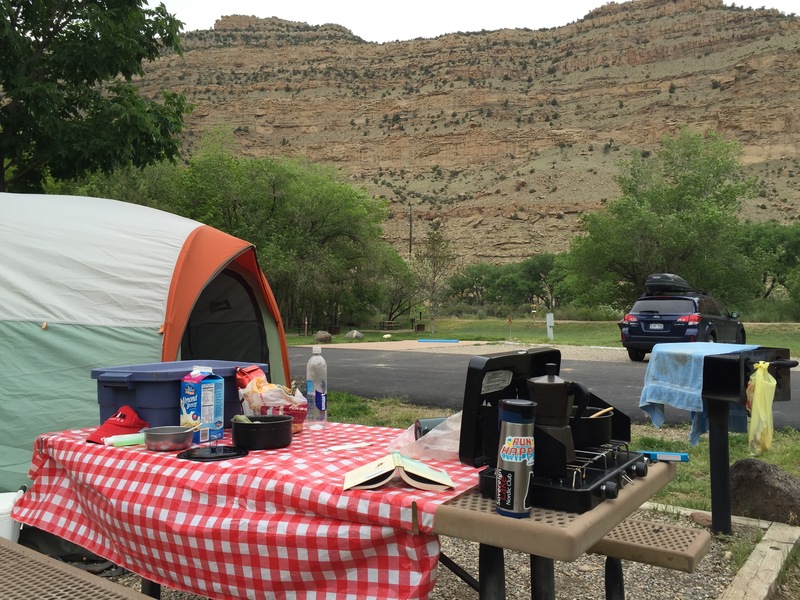 I think most people view Palisade as a stopover on the way to Fruita or Moab, or a break before hitting the Rockies, but we were glad we spent a couple nights there and could have spent more had it not been Memorial Day weekend and had we reserved a campsite. In the end not having made a reservation (sometimes not planning works great!) 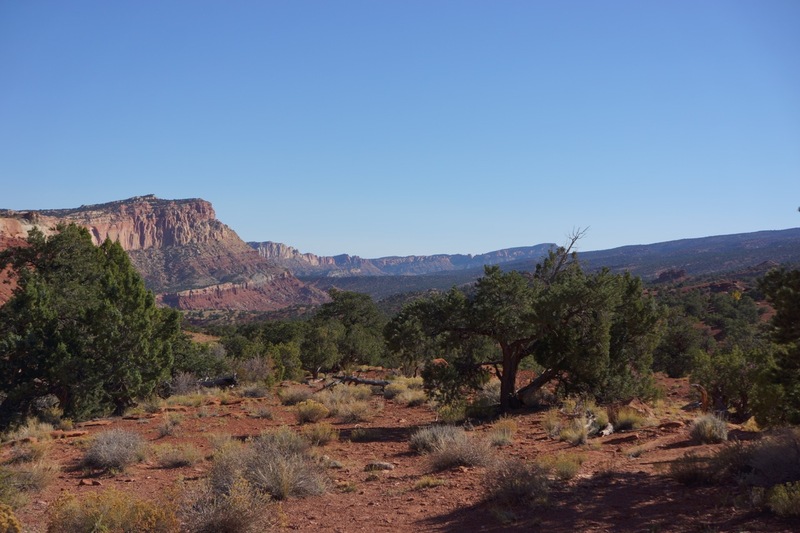 worked out because we ended up finding another state park on the mesa and camped there. We set up camp for the first two nights literally just a stones throw from I–70 at Island Acres State Park. 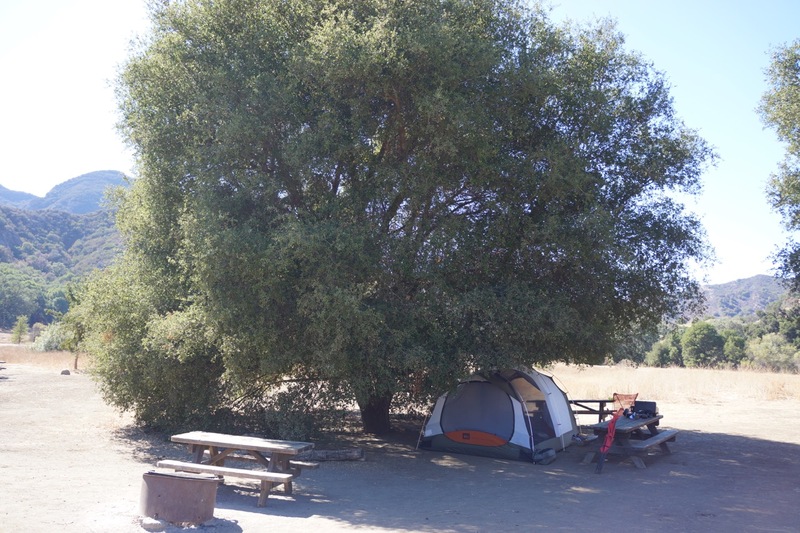 Since it was the week before Memorial Day the campground was pretty empty so we had lots of options to choose from-well at least those sites that weren’t submerged in water. Since we were tent camping we pretty much had the whole tent area to ourselves since other campers didn’t show up until Friday. 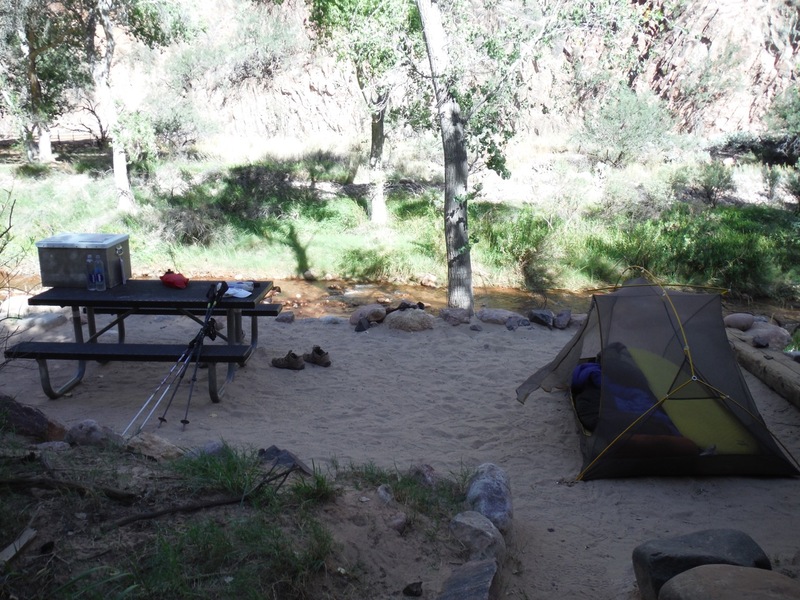 The campsite was great with access to the Colorado river, a nice fire ring, plenty of space for our 6 person tent, and close to the amenities. The only downside about this campground is the noise from being so close to the highway. Our visual and physical surroundings felt like we were camping, but our brains were confused by the auditory input from traffic-wait am I in the city or am I camping? 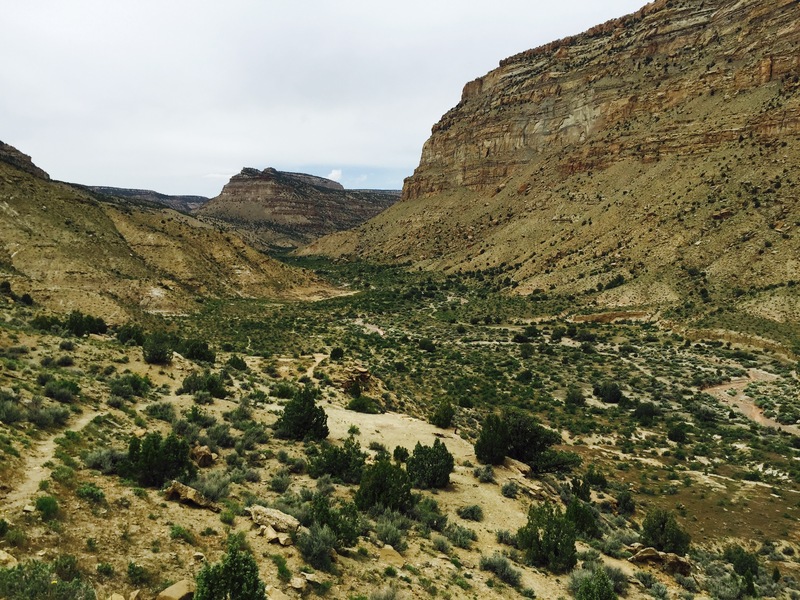 Being close to the freeway had it’s upsides though because we had easy access to the wineries in Palisade and BLM hiking trails with wild horses only a couple exits up. Always an optimist. 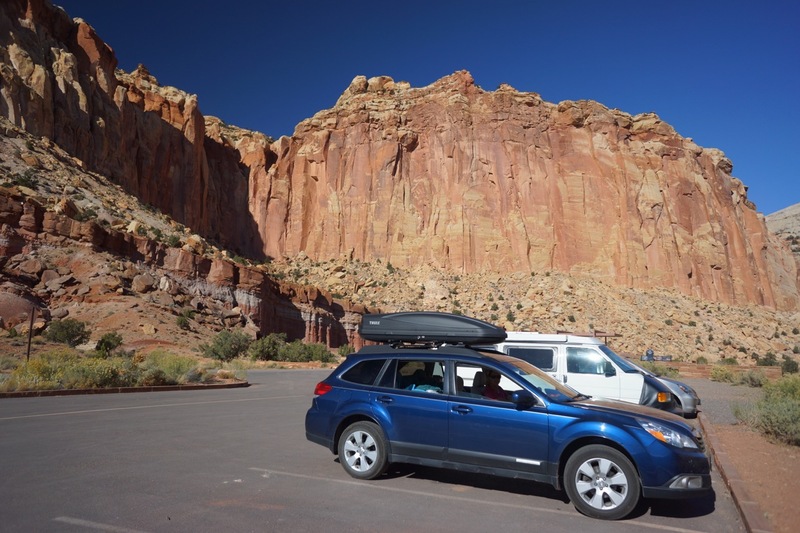 After setting up camp we drove into Palisade to check out the little town and get a glympse of the wineries and pick up some firewood. Yes-Colorado makes wine, and good wine! 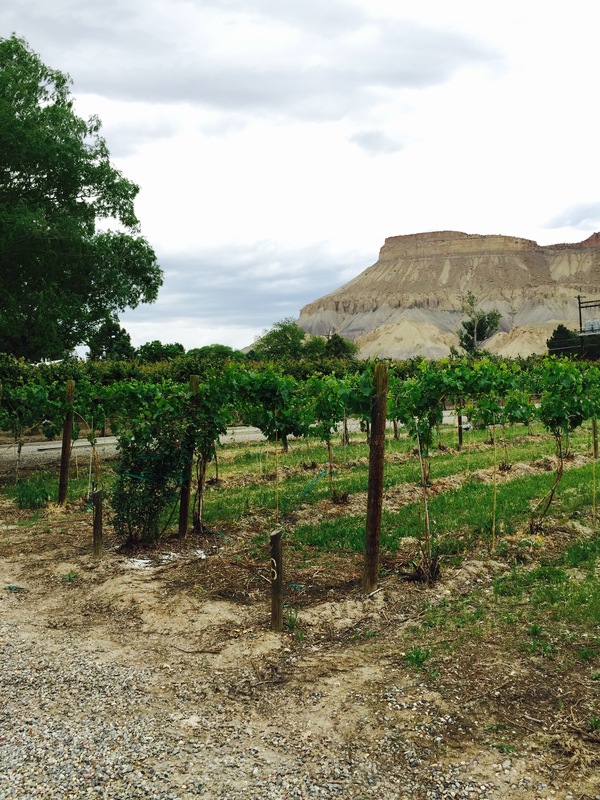 We had no idea Colorado had wineries and I think many Coloradans also are clueless (based on multiple conversations with locals who have no idea about the wine industry here) to the little industry popping up on the Western slope. 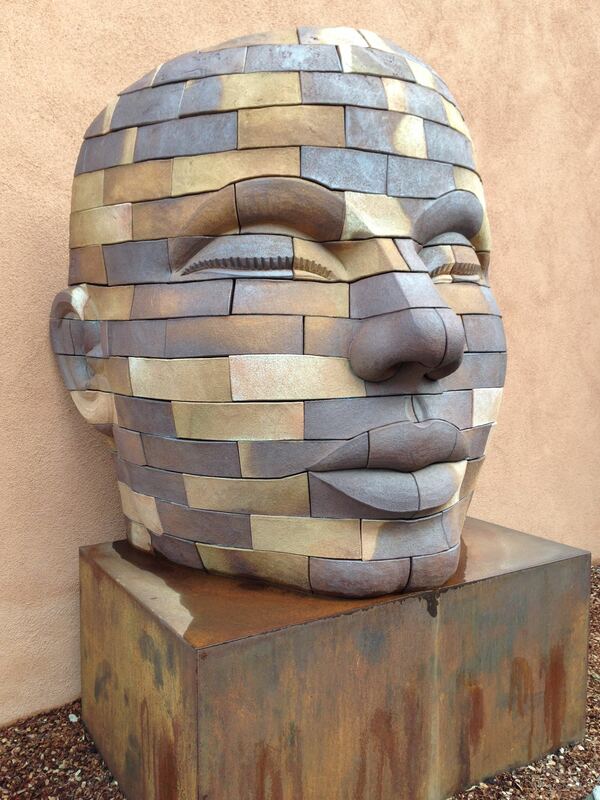 If you live in Colorado and drink wine, Palisade is a must. 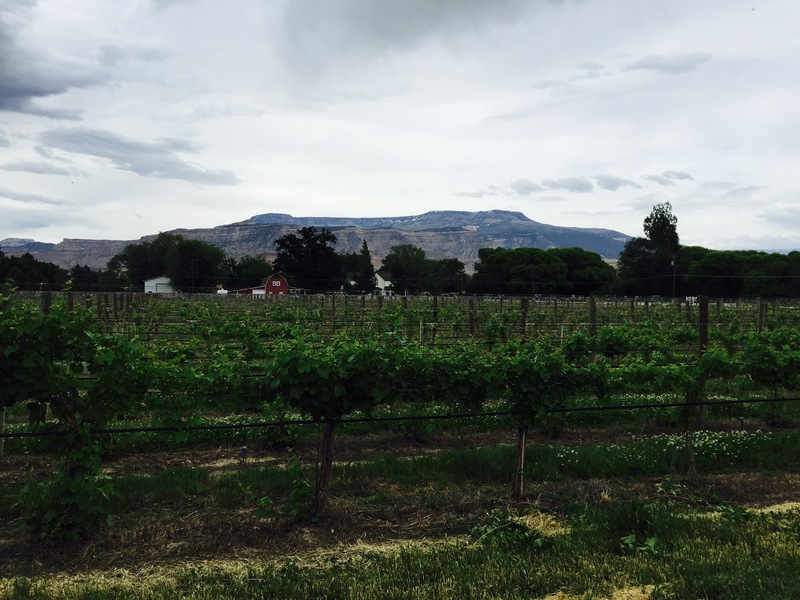 The wineries are small and unpretentious, the staff are interesting and friendly, the wine is tasty and affordable (all the tastings we had were free), getting around is easy, and the scenery is gorgeous. After our hike the next day we felt right at home walking into the tasting rooms unshowered and still in our hiking clothes. The first night at our campsite was very relaxing and we had our first campfire of the season! 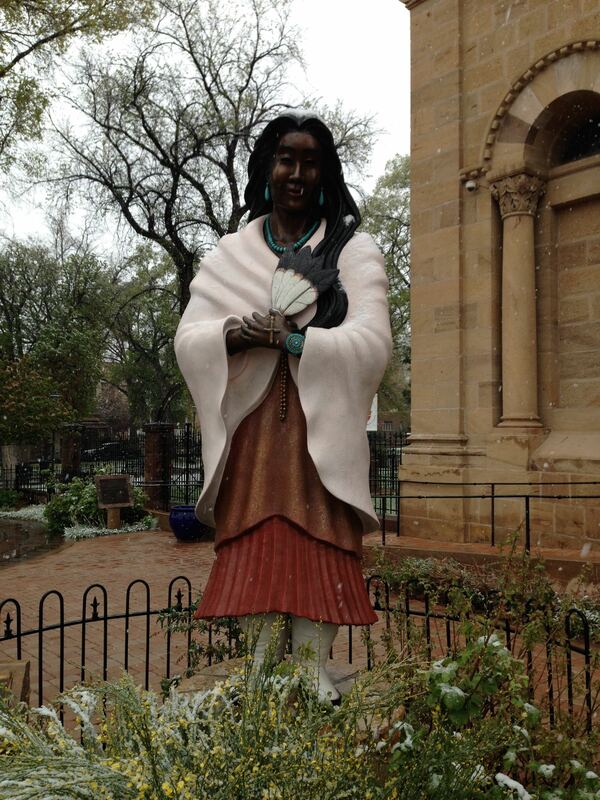 We had been in Santa Fe a couple weeks prior but couldn’t have fires because of the high winds. We have mixed feelings about having campfires due to the impact of cutting down trees and burning them, but there is just something about sitting by a campfire that makes everything just right. There were a couple of mild echos of thunderstorms and slight rain but nothing too major to disrupt our sleep. One of my favorite activities of car camping is waking up to a good cup of coffee and plopping myself into a campchair with a good book. 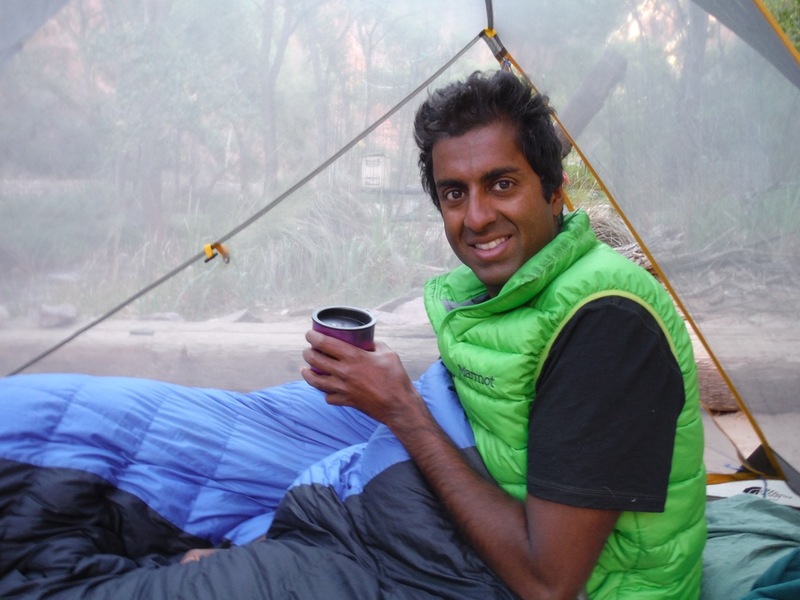 Both Ravi and I spent the better part of the morning reading and sipping on our coffee before we headed out for a hike in the afternoon. 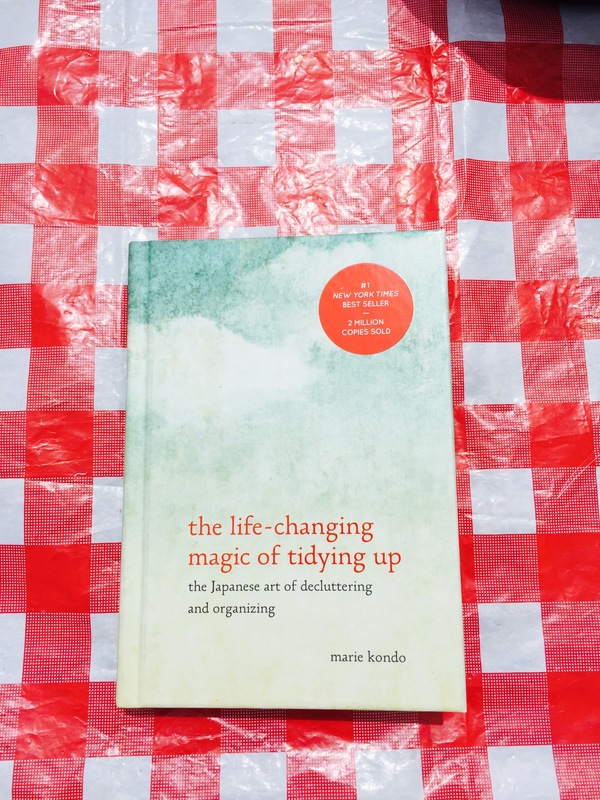 My book of choice was “The Life Changing Magic of Tidying up,” which I promptly finished the next day. Having traveled the last year and a half, moved all our stuff a couple times, and downsized this book hit home and resonated with me in so many ways. My relationship to “things” has evolved this last year and I’ve realized de-cluttering, using only what really is useful or makes me happy, and having less stuff and more experiences is what matters to me. I am by no means minimal and I still have a ways to go, but I’ve made progress. I read this book like I binge watch a good series on netflix. Seriously-buy it. Around lunch time we decided it was time to get moving. 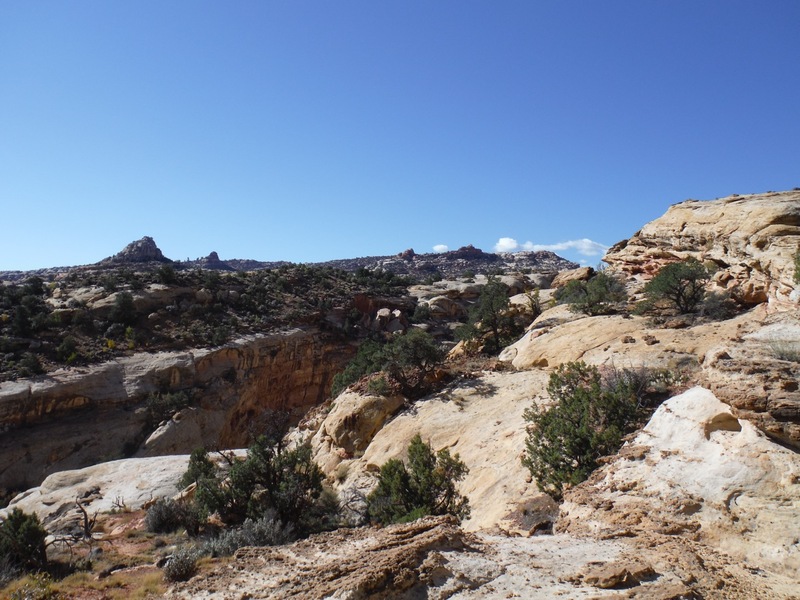 We headed up to the Book Cliffs BLM land to check out the wild horses and do a little hiking. 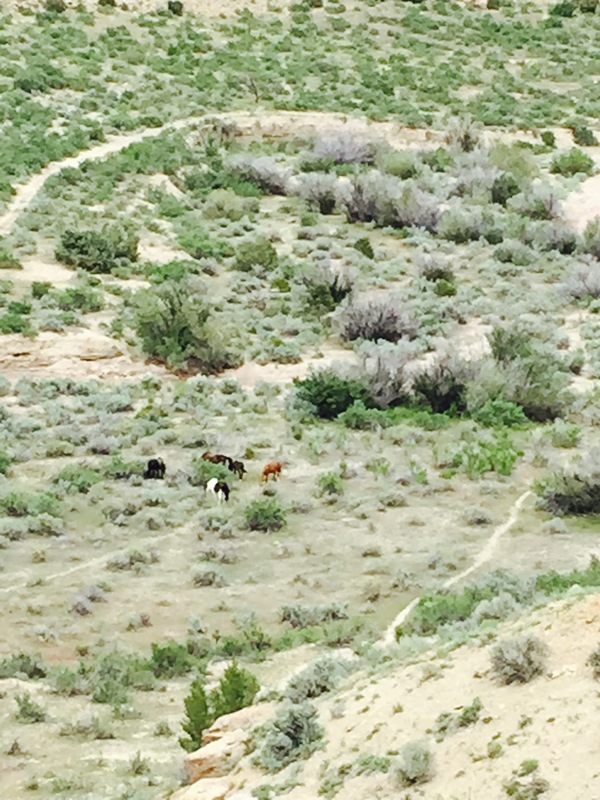 I’ve never seen wild horses hiking before and we were lucky that they happened to be in the vicinity. A local at the trail head told us where they were. We watched the beautiful creatures munch on grass, play or bully each other-not sure, and generally frolic around. This was a highlight of the trip. Wild horses. We didn’t want to bother them and stayed at a good distance, but close enough to watch them frolic. 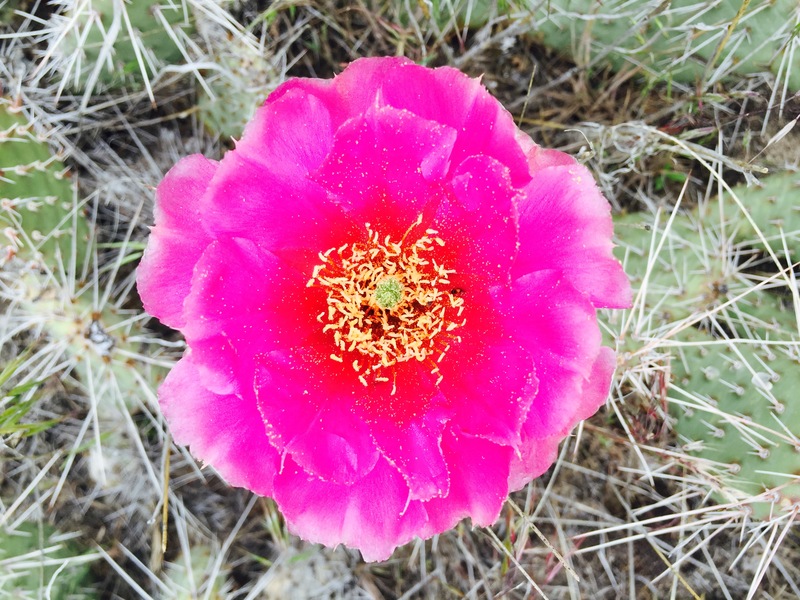 The cacti were blooming everywhere. 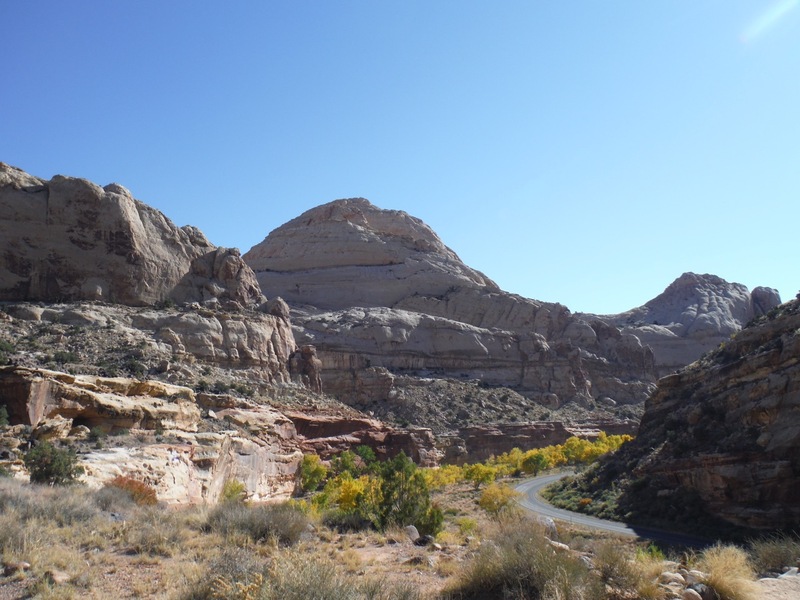 Book Cliffs, BLM land with wild horses. What a better way to wrap up watching wild horses than to do some wine tasting. 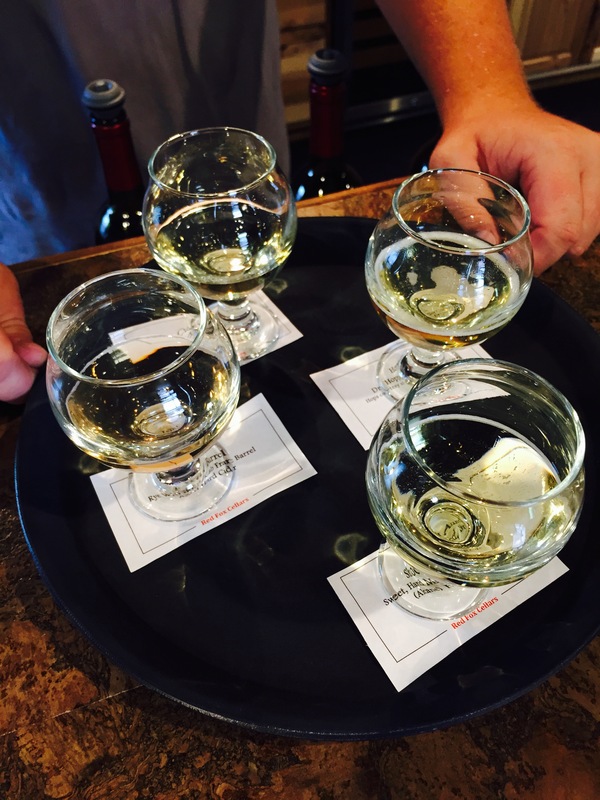 We headed back into Palisade and checked out three wineries; Maison La Belle Vie, Garfield Estates, and Red Fox Cellars. The wines at the first too were delicious and the cider at Red Fox trumpted their wine. 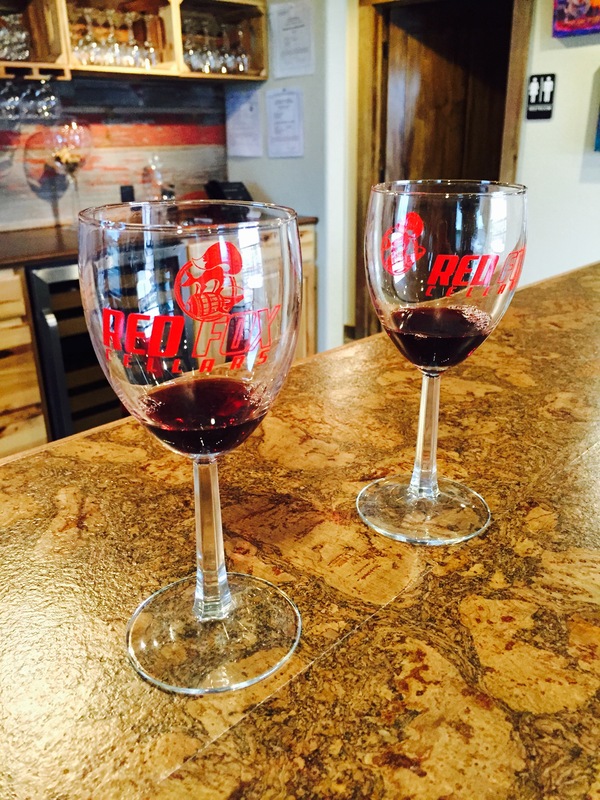 Red Fox is a new trendy/hip winery and cidery. They have some work to do with their wines, but the cider was tasty. Maison La Belle has a french inpsired theme and the tasting room staff happened to be from France here on an internship. She was very pleasant and the wines were good. Garfield Estates looks like you are walking into someone’s home, but again the woman who helped us was interesting and again the wine was very drinkable. We headed back to our campsite with a couple bottles of wine and very satisfied with our day. Red Fox Cellars Cider-much better than their wine. Belle Maison la Vie winery. 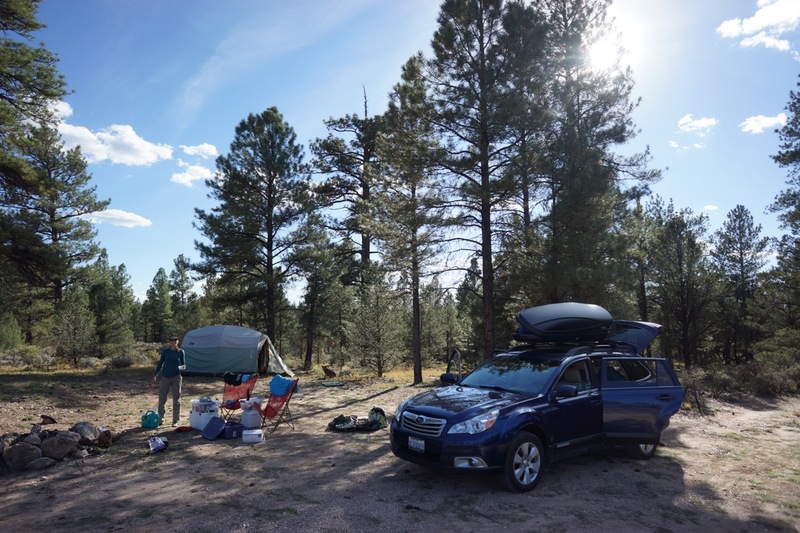 The next morning we woke up and after having a mishap with our coffee maker, and another mishap with our neighbor’s coffee maker, and a burned neoprene coffee holder, we packed up our gear and headed out to find a campsite. 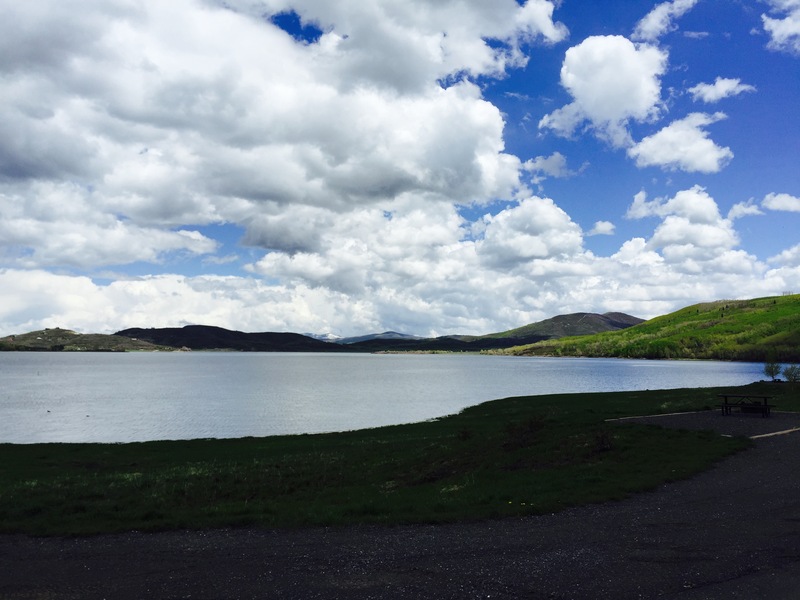 We had asked around as to where we might find an open campsite for the night and a couple people told us that Vega Lake State Park was likely to have a spot and had a nice lake (aka reservoir as I realize folks in colorado use these interchangeably for the most part). 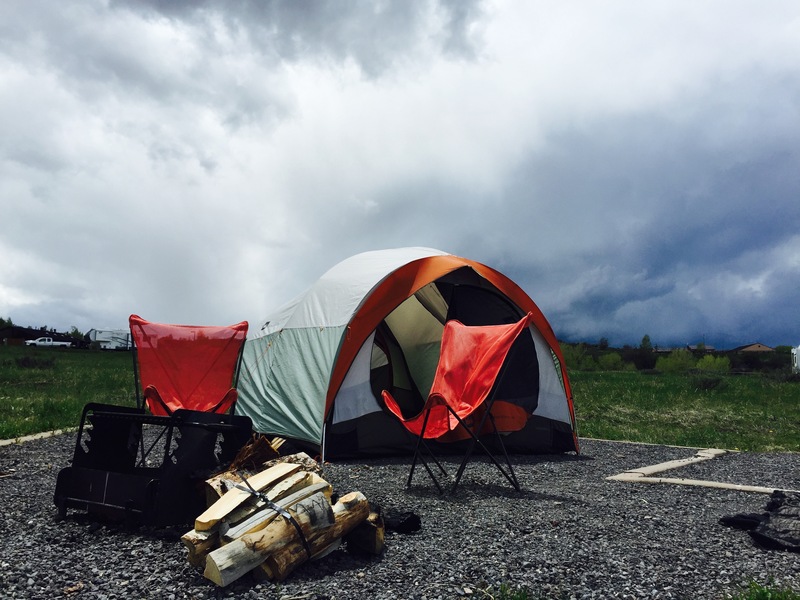 Luckily, when we arrived we did find a spot and set up camp just in time for the next round of rain to roll on by. We had a lovely view of the lake and a spacious campsite free from the sound of the highway. Since it was later in the day we opted for a long walk around the lake, some reading in the tent as it rained, and an early campfire. 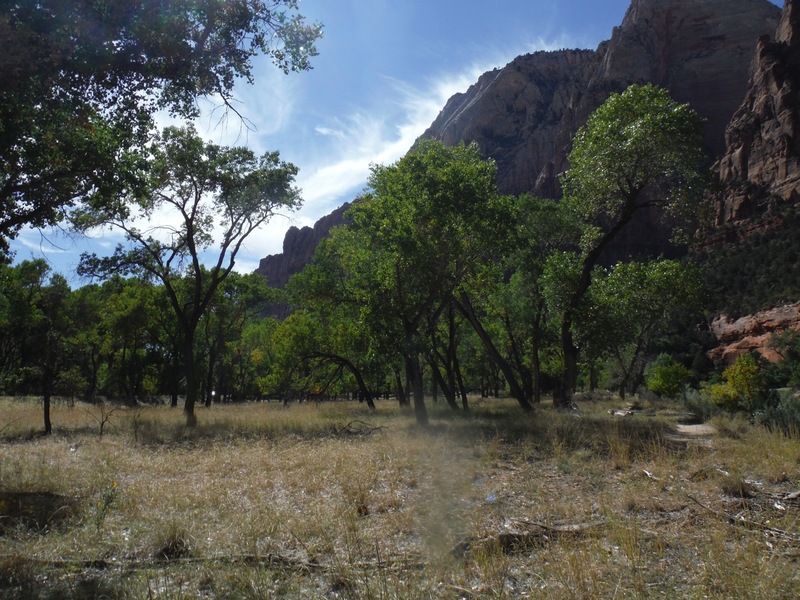 Campsite at Vega State Park. Eventually the weather cued us as to when to head in for the night so we let the rain put out the campfire and headed to bed. When we woke the next morning we enjoyed a liesurely morning before packing up our stuff and heading home. 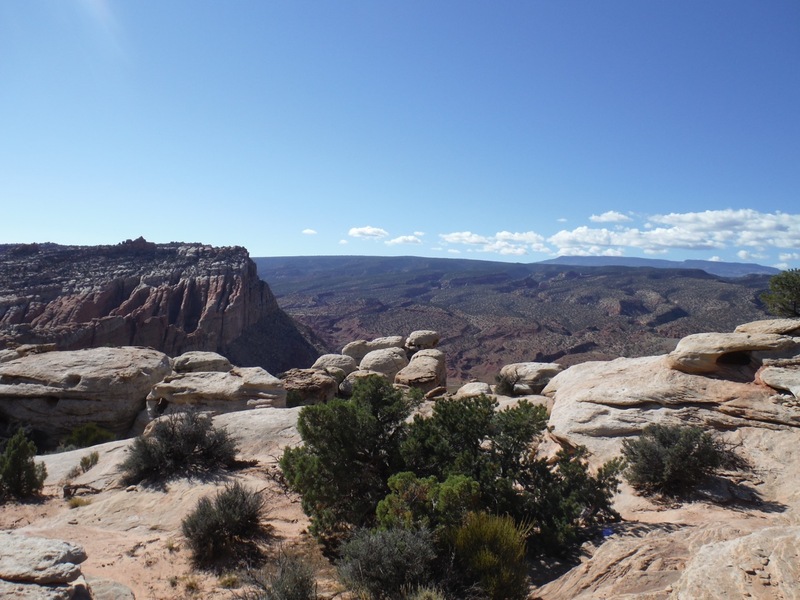 All in all the getaway turned out to be better than we expected and we will definitely be back to the area as we still have lots of exploring to do at the nearby Grand Mesa and Colorado National Monument. Oh yeah, and explore a few more wineries and perhaps meet some other ponies. 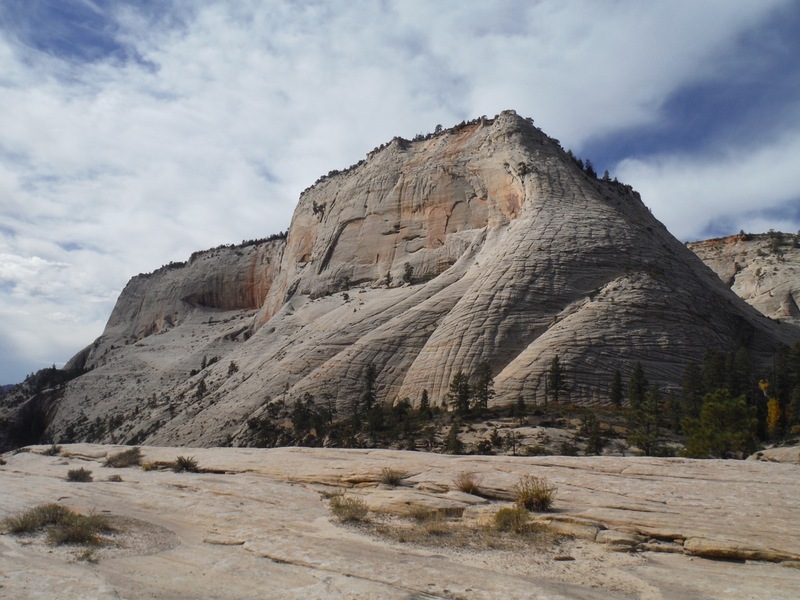 One of the benefits of choosing to settle down in Golden Colorado is the proximity to some epic parts of the Rockies. 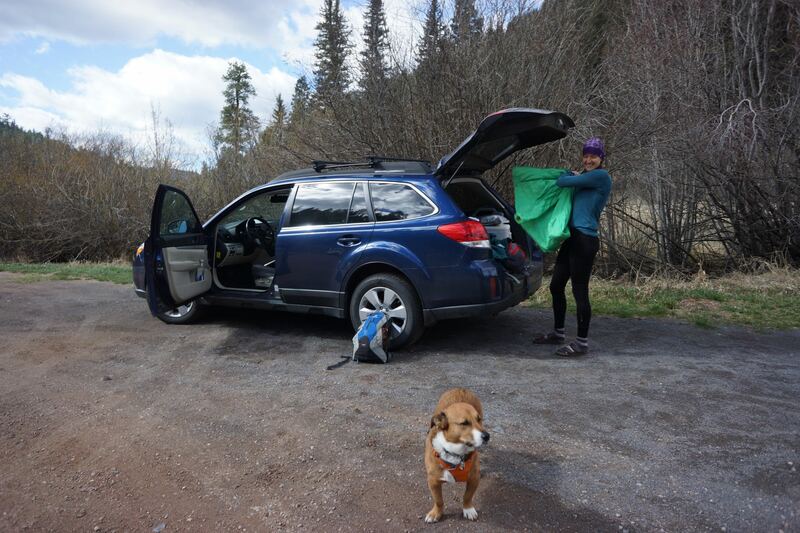 Unfortunately the weather was looking bad last weekend, so we drove as far south as needed to get some sunshine and camping-friendly friendly conditions. 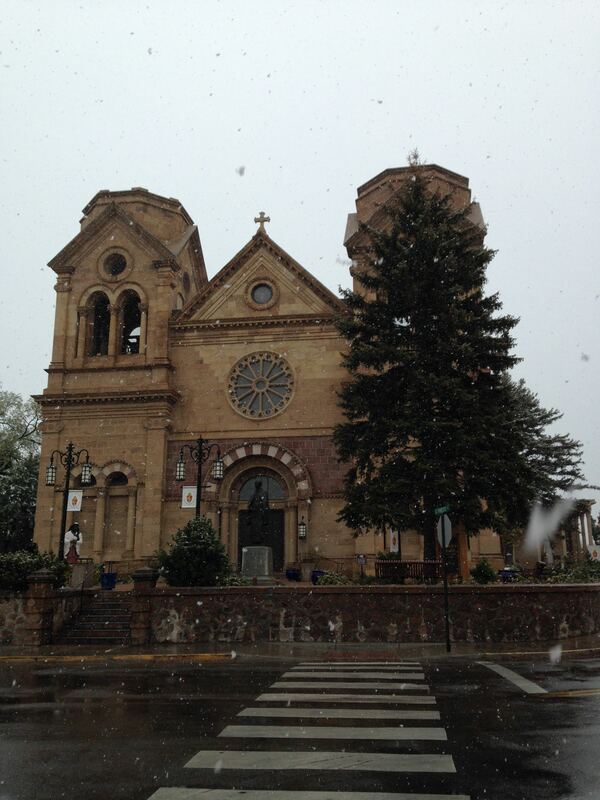 Alison and I had driven through Santa Fe on our way out to Golden a month ago and knew we would be back. 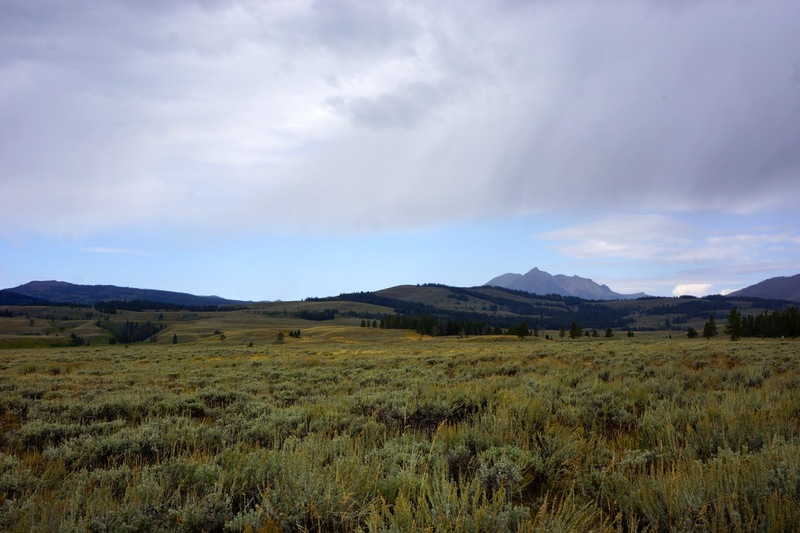 The town is among the oldest in the country and is surrounded by some surprisingly big mountains. 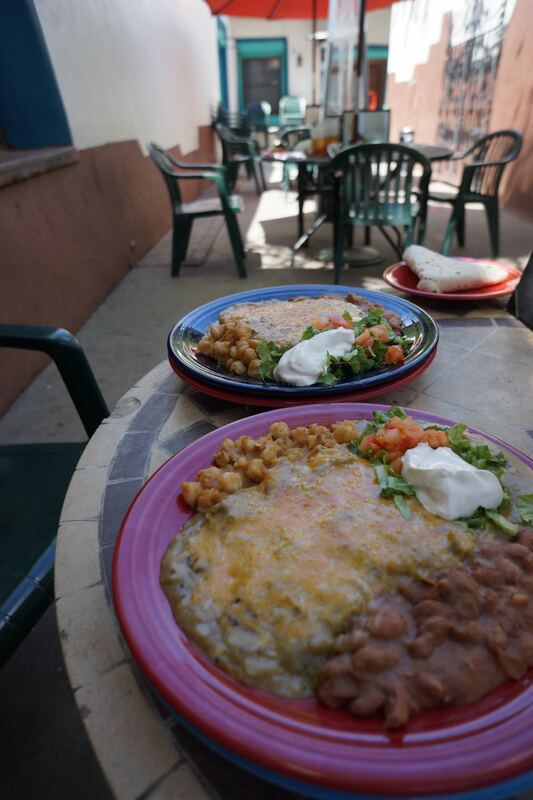 Boasting over 250 art galleries and hundreds of high quality restaurants, we were looking forward to eating our weight in Santa Fe’s speciality – Green and Red Chile sauce smothered New Mexican food! 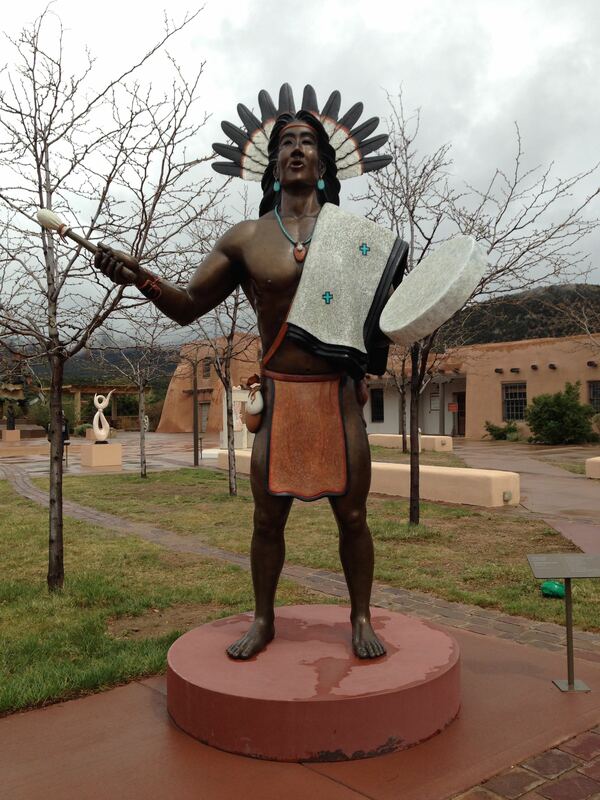 Day 3: Stay in Santa Fe for a night. 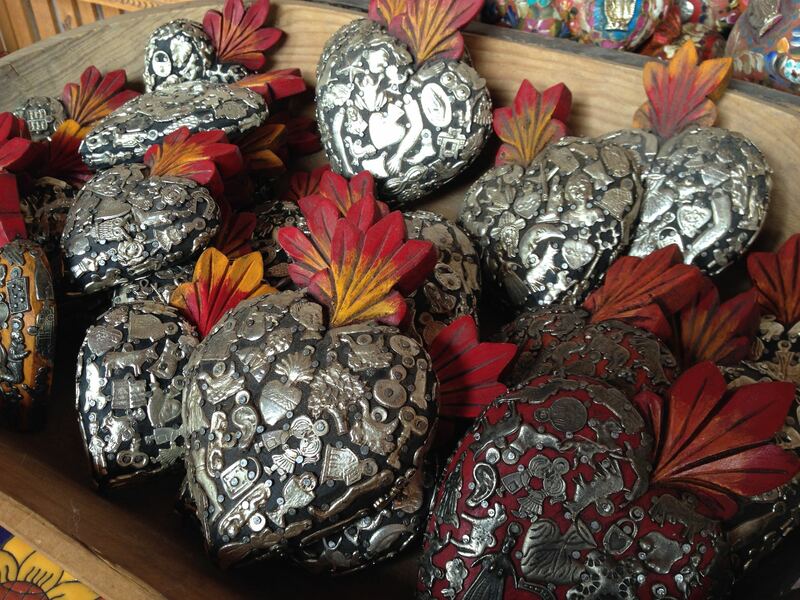 Explore the shops, museums and art galleries. 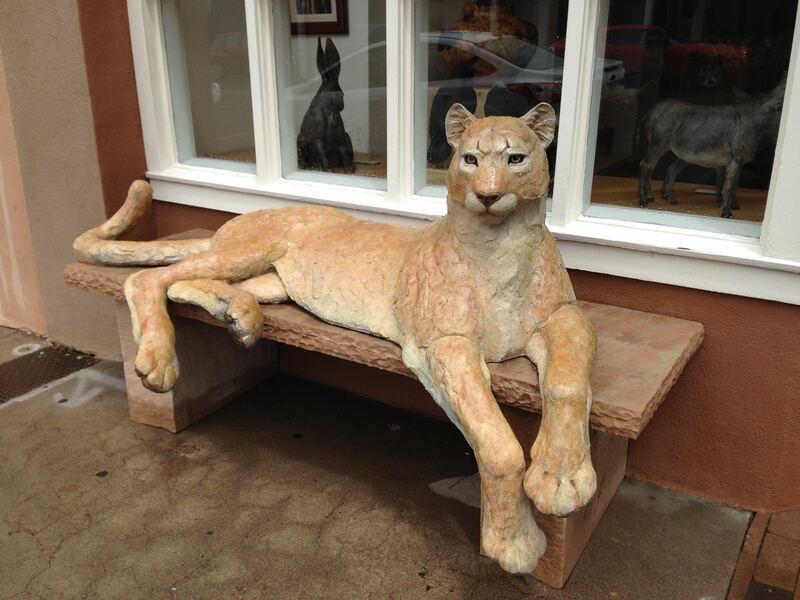 Visit: The Old Plaza Shops, Canyon Road Galleries, The Ark Bookstore and eat a TON OF CHILI SMOTHERED NEW MEXICAN FOOD! 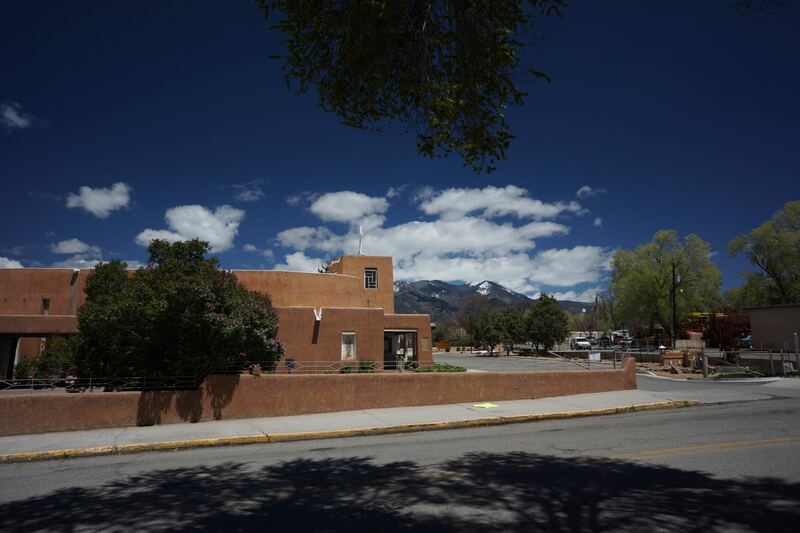 Day 5: Spend most of the day exploring the cool art infused town of Taos, the Hanuman Temple, take in epic views of the Sangre de Christo Mountains, then drive home. Part of the fun of not having “normal” jobs right now is the flexibility to adjust plans as we wish. 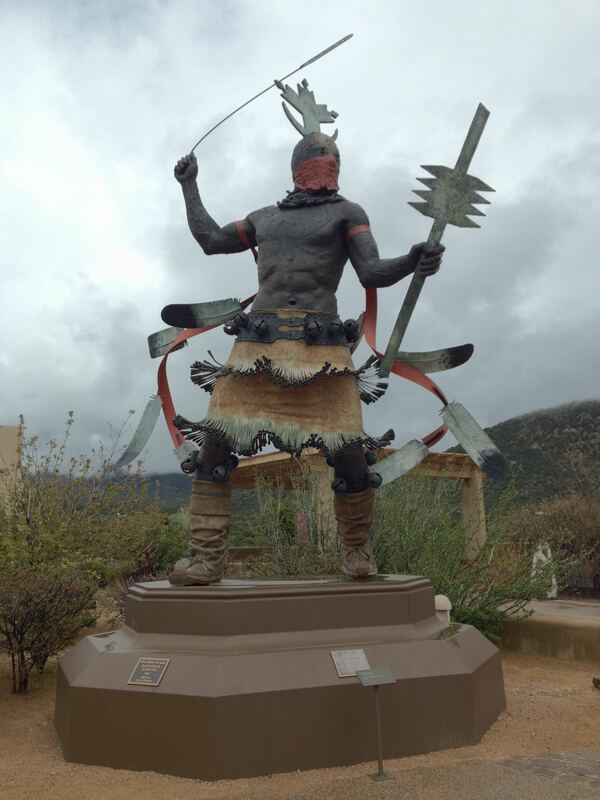 We originally planned to stay just 4 days in Santa Fe, but decided to extend our trip for another day and visit Taos, the Ojo Caliente hot springs and Chimayo – we are glad we did! 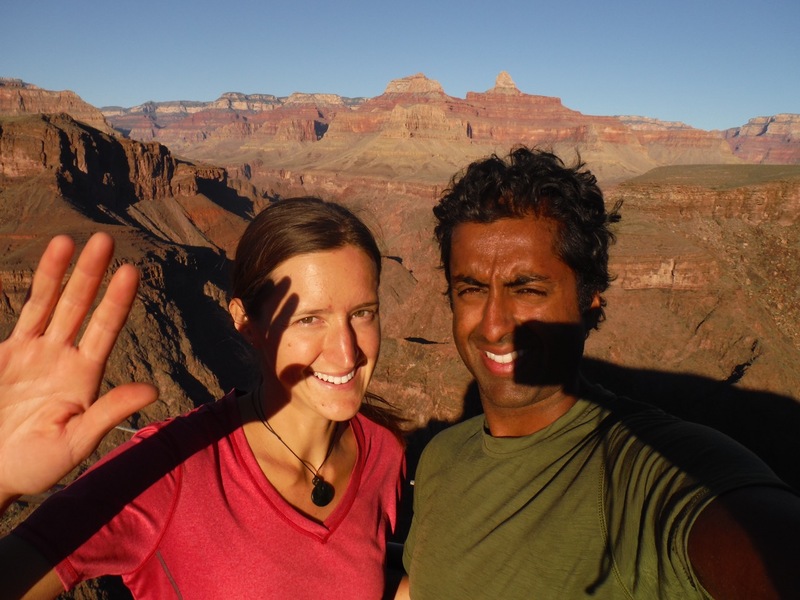 It’s the most fun to explain our adventures through pictures…here we go! The weather was cool with a chance of rain, so we opted to stay in a KOA (with HOT SHOWERS!) 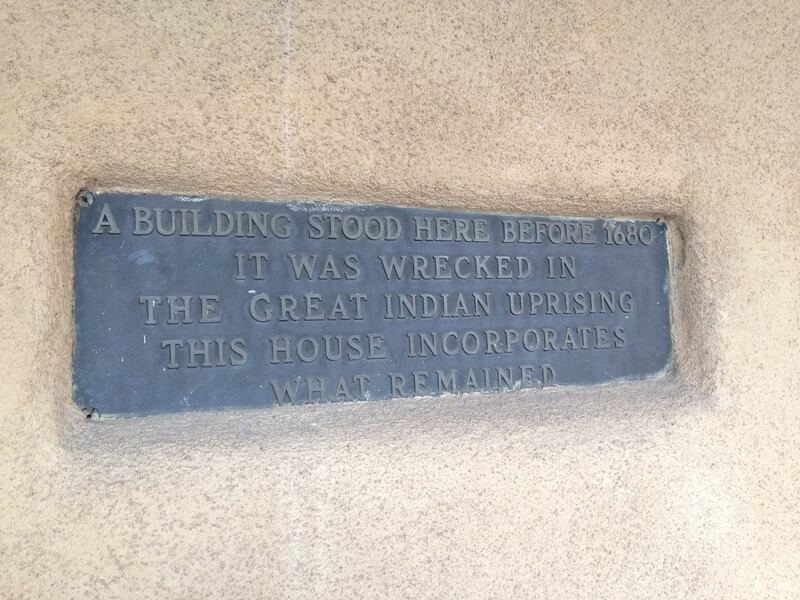 outside of the Santa Fe. Temps dropped into the low 40’s at night. 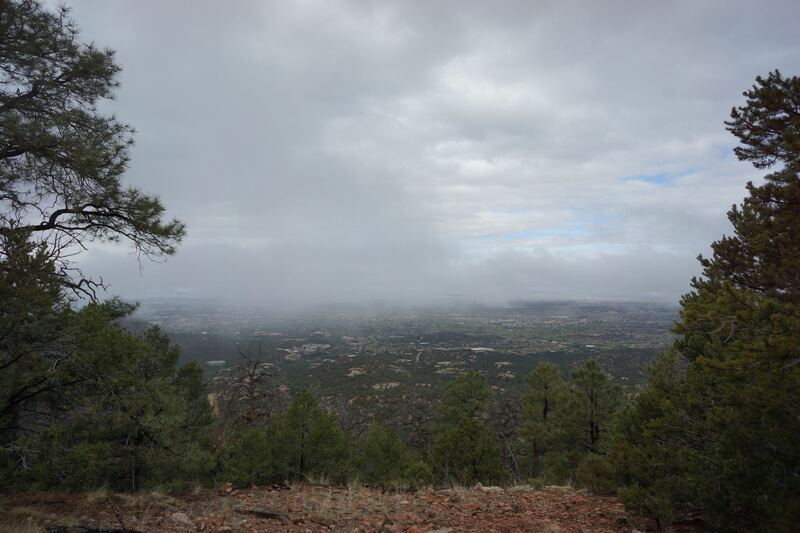 Campsites in the Santa Fe National Forest were getting snowed on! 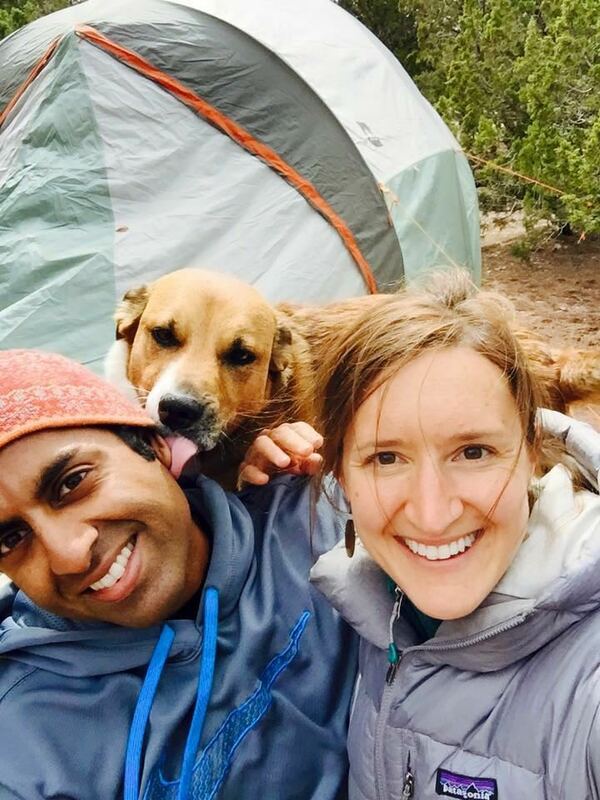 Duke enjoys eating my ear upon arrival to the campsite! Camping dinner. 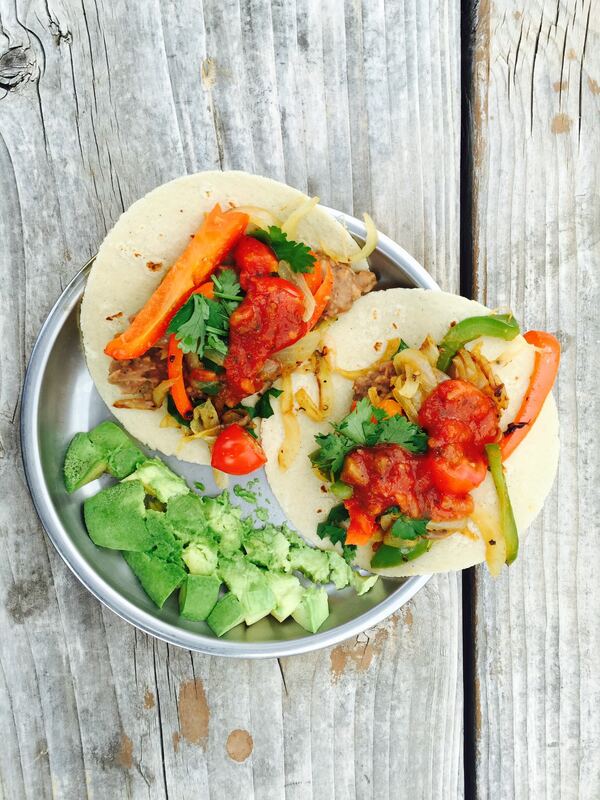 Vegan fajitas! This is one of our go-to camping meals. Lots of fried veggies, beans, avocado, salsa and cilantro. 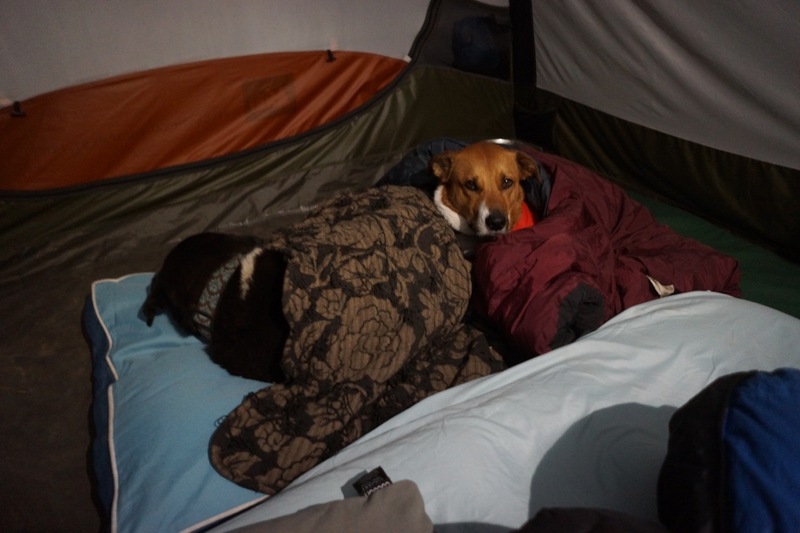 Duke LOVES camping!….and sleeping on top of our sleeping bags when he gets the chance. 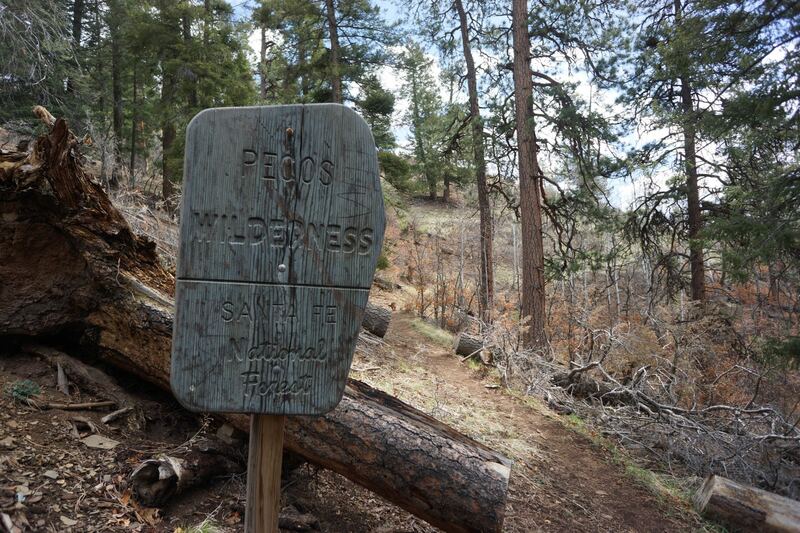 Our first day featured a long hike in the Pecos Wilderness Area. The weather was threatening to rain or snow, so we dressed well. 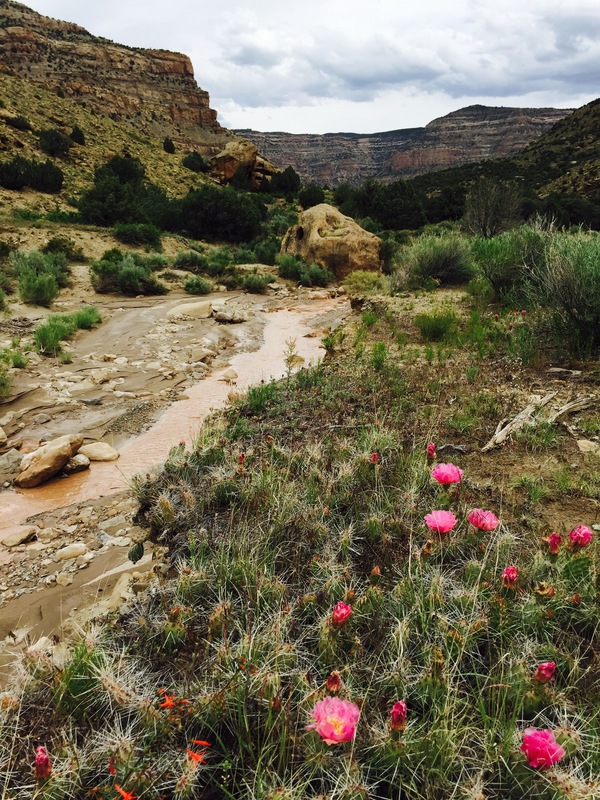 The drive up the canyon along the Pecos River is gorgeous, even with overcast skies. 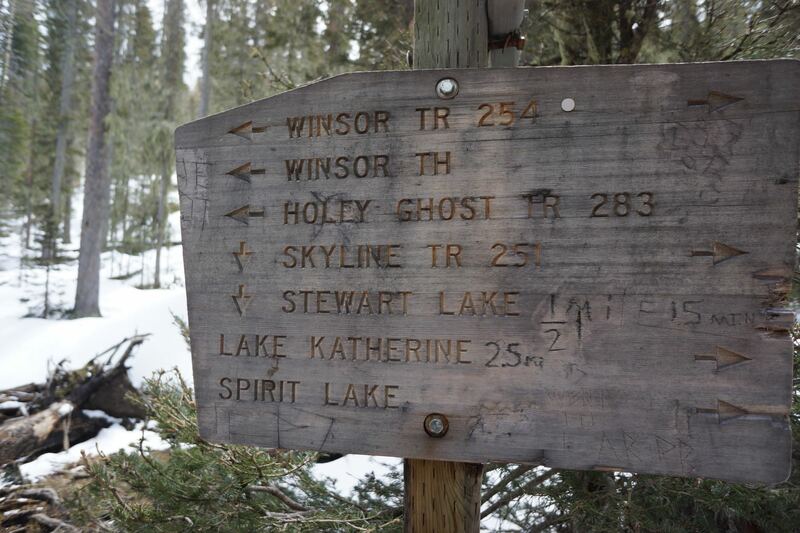 Our hike started at the Winsor Trailhead, and headed up the Winsor Ridge Trail to Stewart Lake. 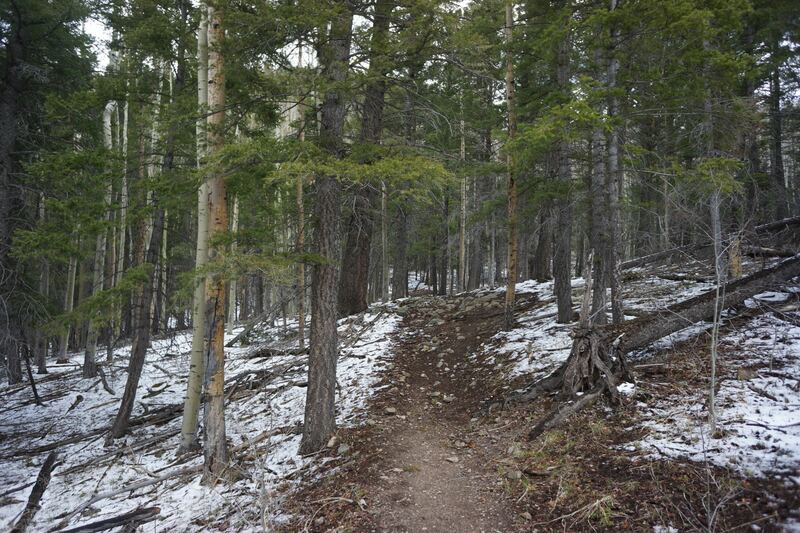 We then descended via a different trail (post-holing through snow for a mile or so!) 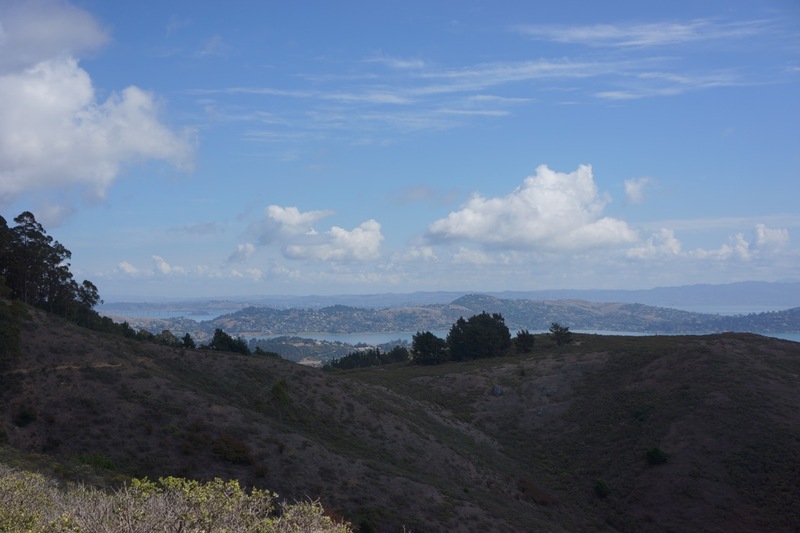 to make it a long 16-17 mile loop hike with bout 2500ft of total climbing. Sawyer Lake, the destination point for our hike. 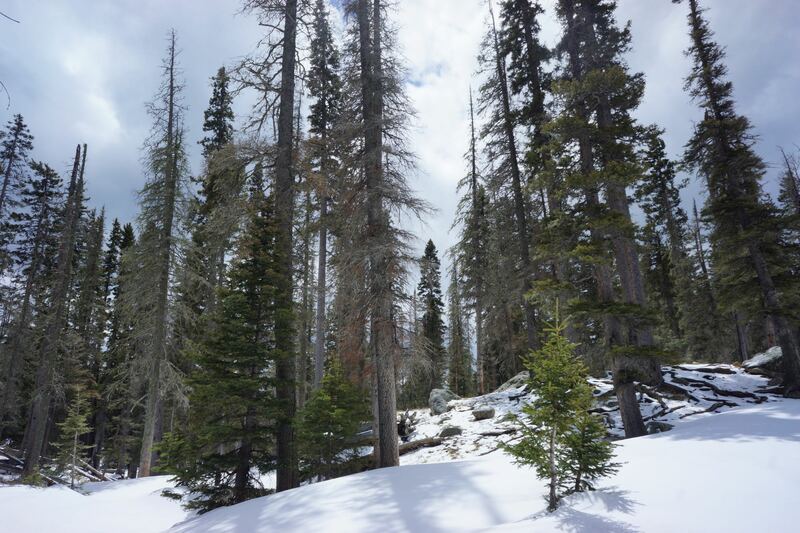 It was super quiet up there, and many people continue hiking onward in the Pecos Wilderness for multi day backpacking trips. 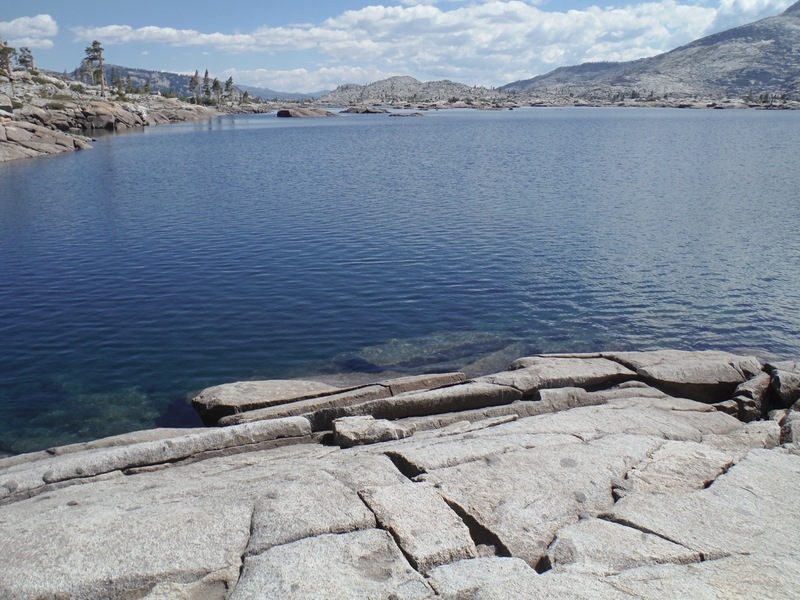 From photos I’ve seen, the lake basins past Sawyer Lake are really epic. Unfortunately, there were a lot of snow past this point so we turned around (and were only planning on going this far on a day hike anyway). 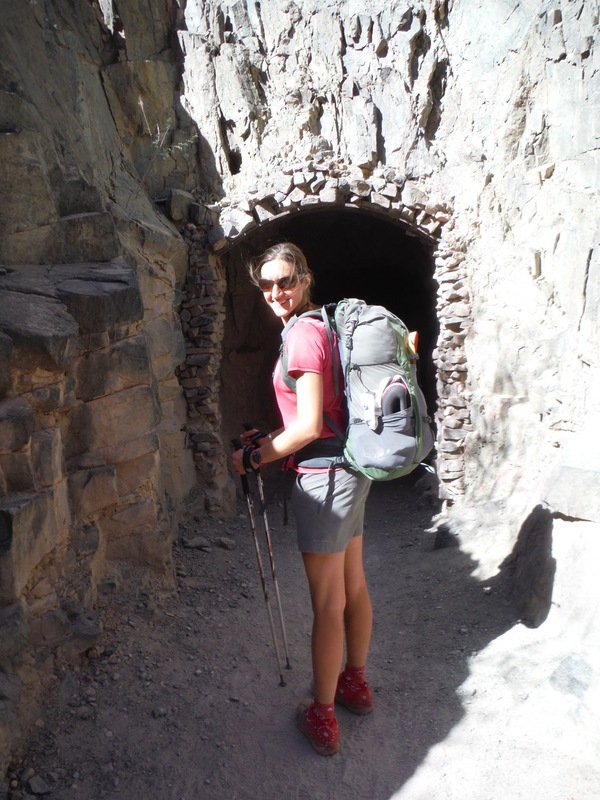 We plan to go back to the Pecos and do a multi-day backpacking trip when the weather warms up. 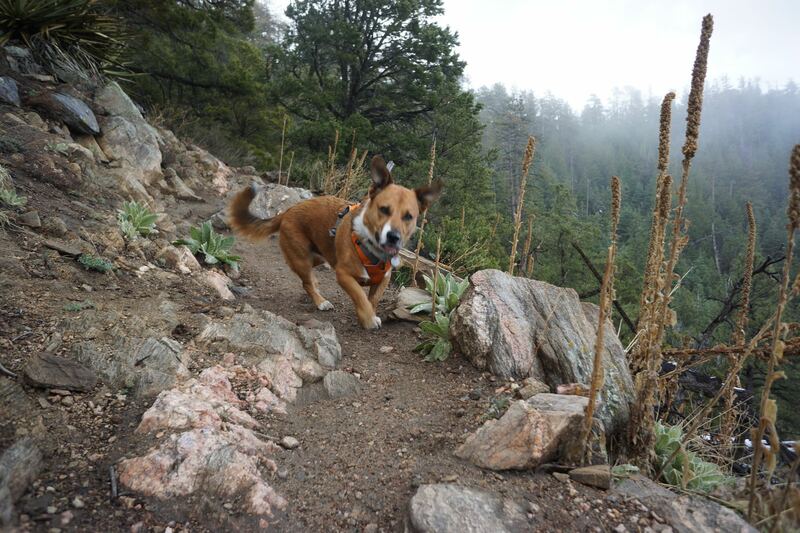 Dogs are allowed on all trails and there is no permit needed! The end of our hike. 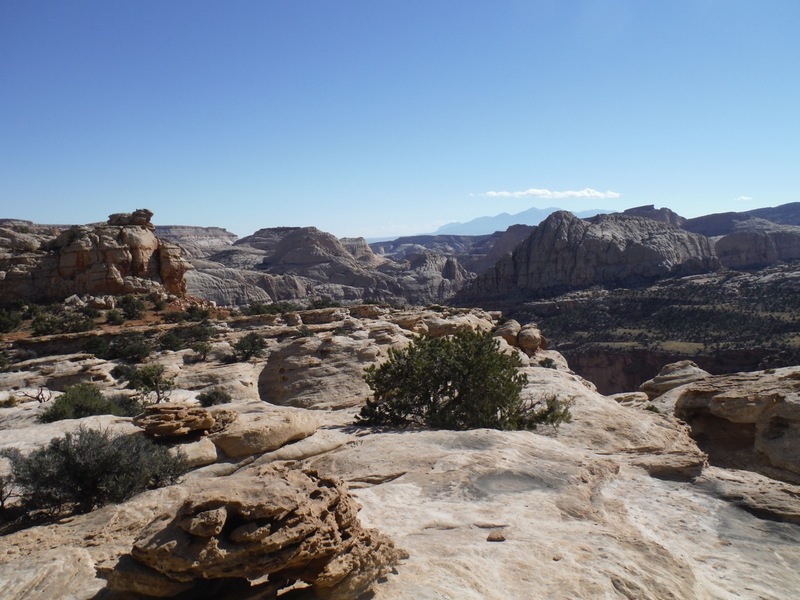 We hiked up from the Winsor trailhead, but came down a different one. I do not recall the name, but we only had to walk about 1 mile along a road to get back to our car. 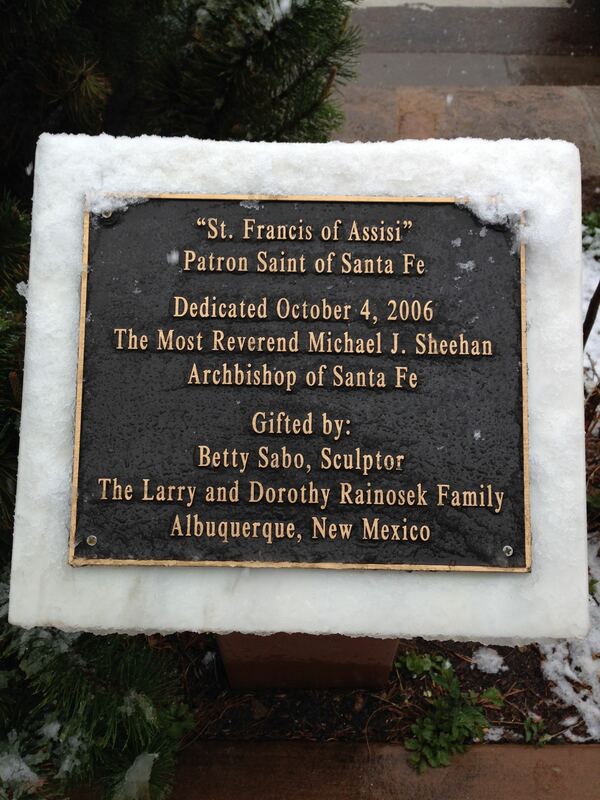 There was a winter weather advisory when we visited, and Santa Fe got it’s first precipitation in over a month, in the form of snow! 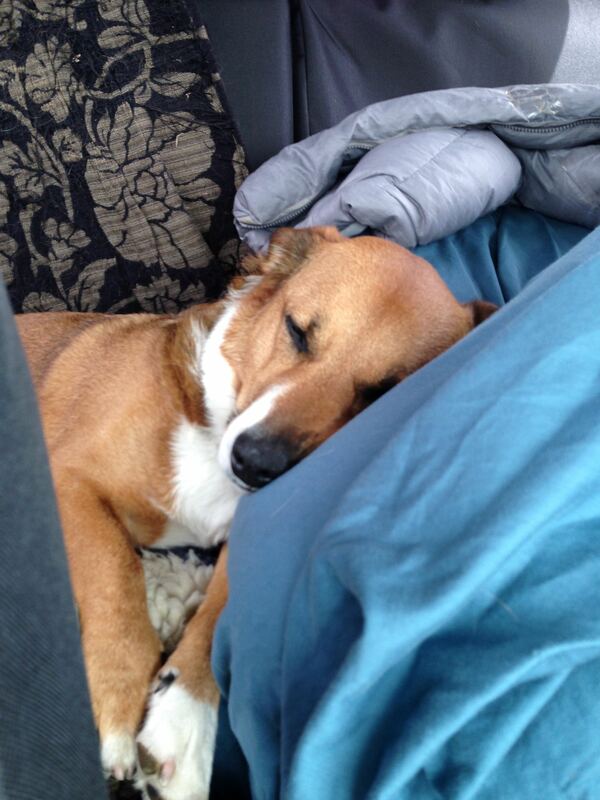 We bailed on our campsite and spent the night in Motel 6 in town. 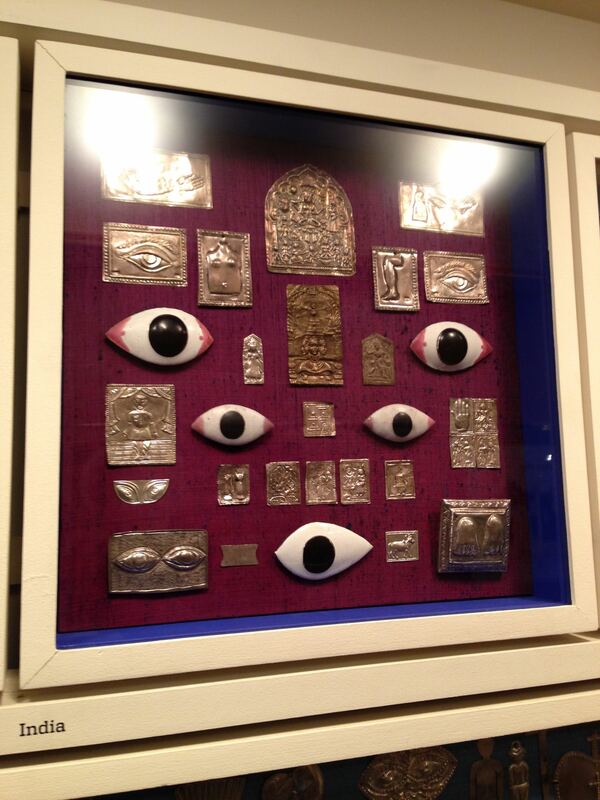 It was the perfect day to visit galleries and museums. 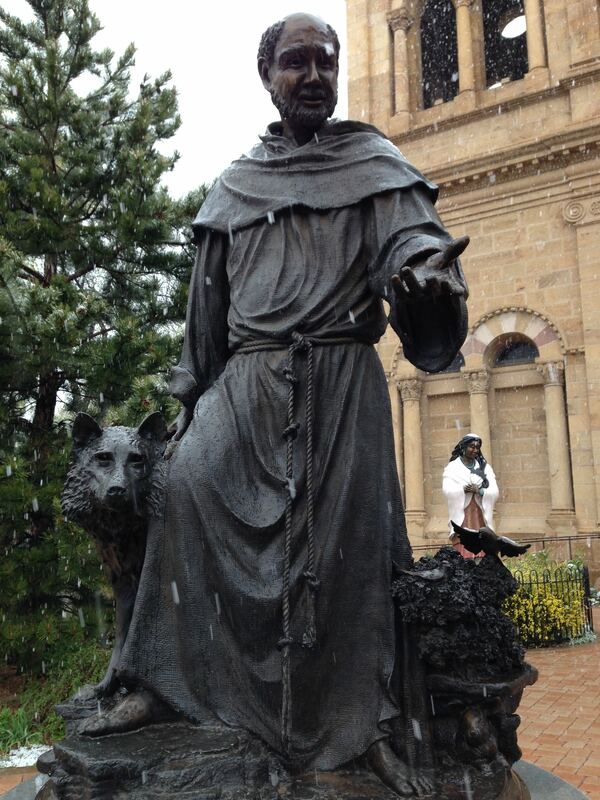 St. Francis, the patron saint of Santa Fe. Look at all the animals around him! Very peaceful guy. Chili sauce on everything please!!!! 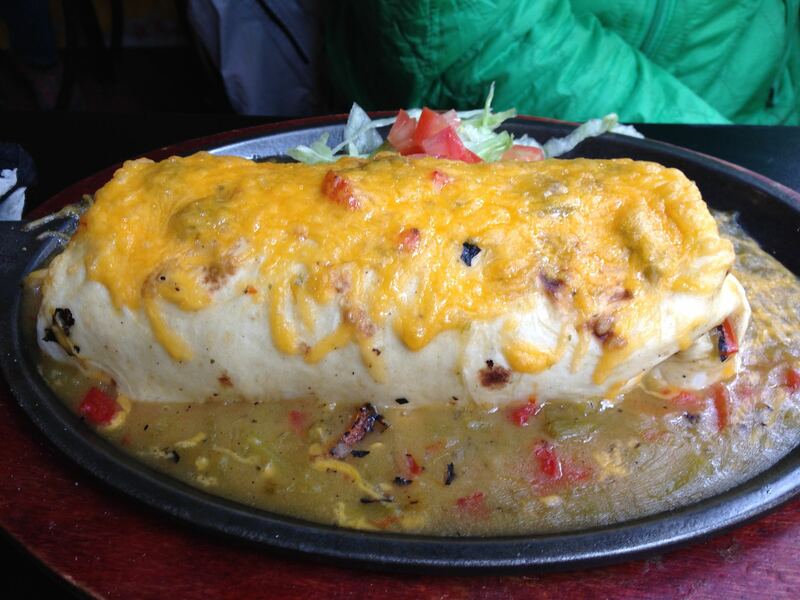 Santa Fe is known for its smothered items and Red/Green Chili Sauce. 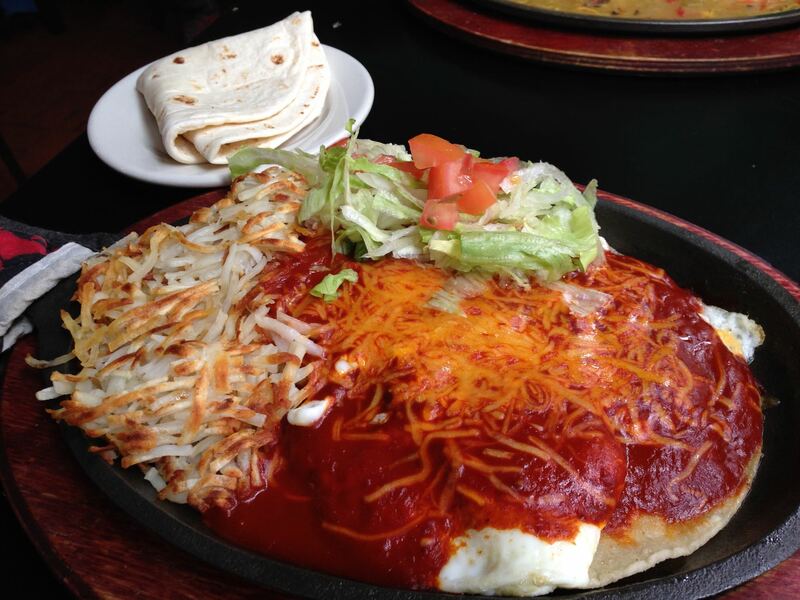 We eventually learned to order our food “christmas style” with a mix of both red and green chili sauces. If you are vegetarian, make sure to check that the sauce doesn’t have meat. Most of the time we found the sauces to be vegetarian. However at one place the server pointed out that their red sauce had “brisket” in it. 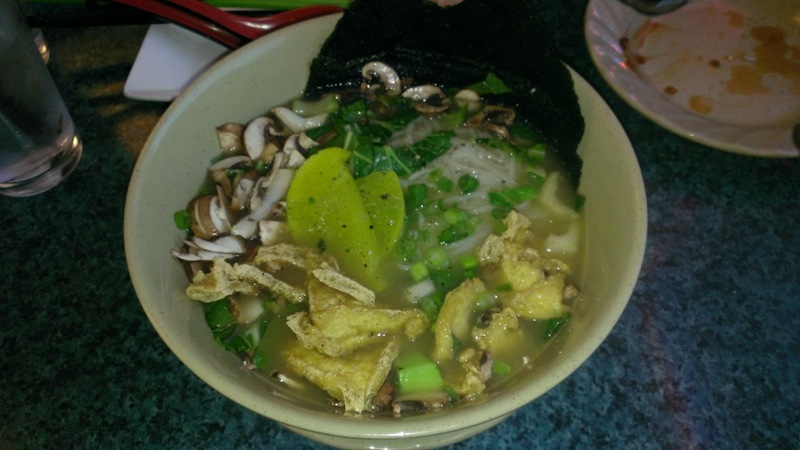 We found most places had plenty of great vegetarian options. Vegan is another matter….some placed had vegan items…though you would have to order creatively. 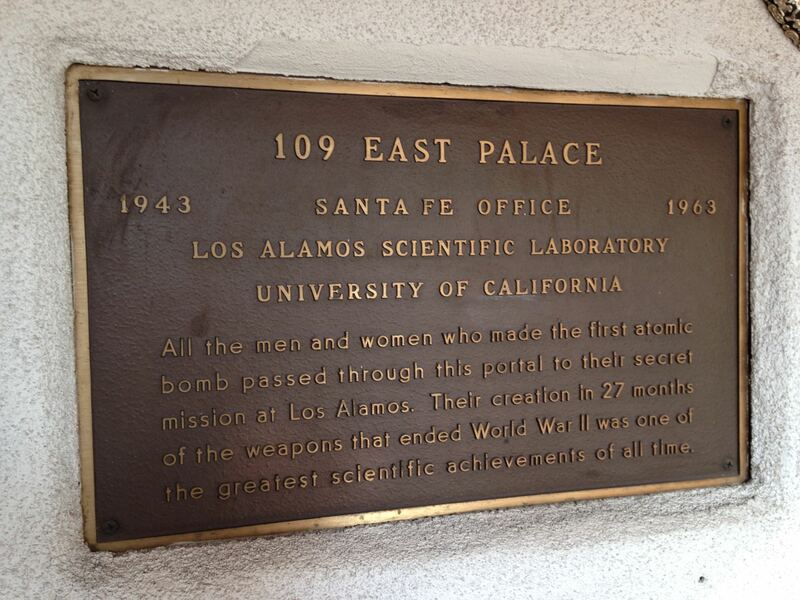 The irony of little trinkets being sold at a place where the greatest scientific minds in the world once gathered en route to Los Alamos (where they worked to build the atomic bomb and stop WWII). 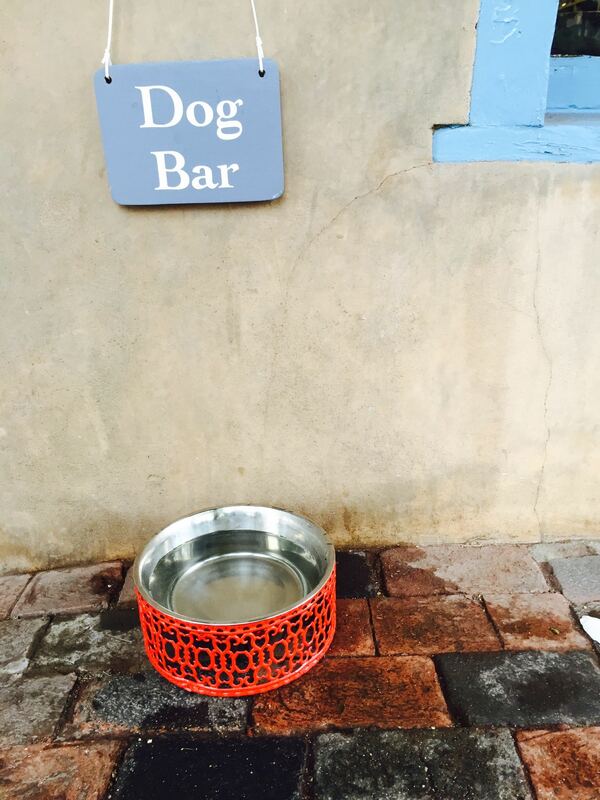 Santa Fe is very dog friendly! 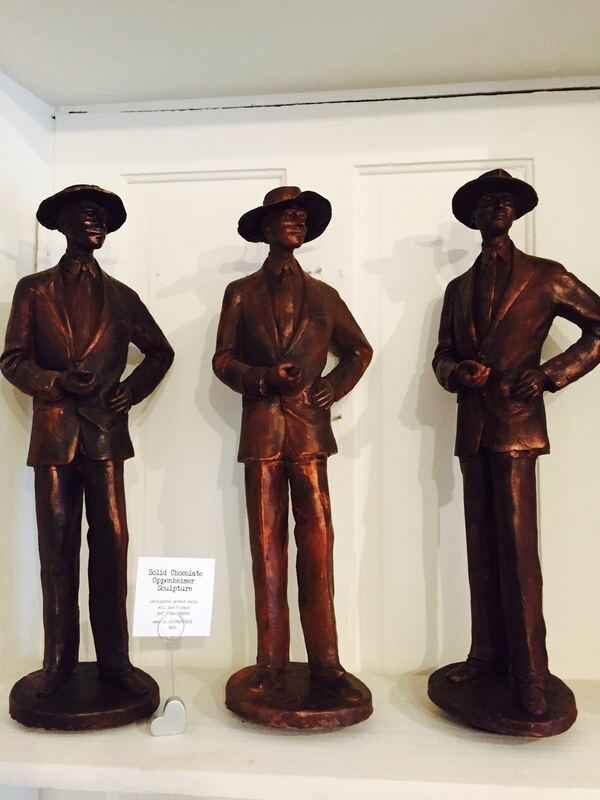 They are made of chocolate…don’t ask me what happens when the weather gets hot! 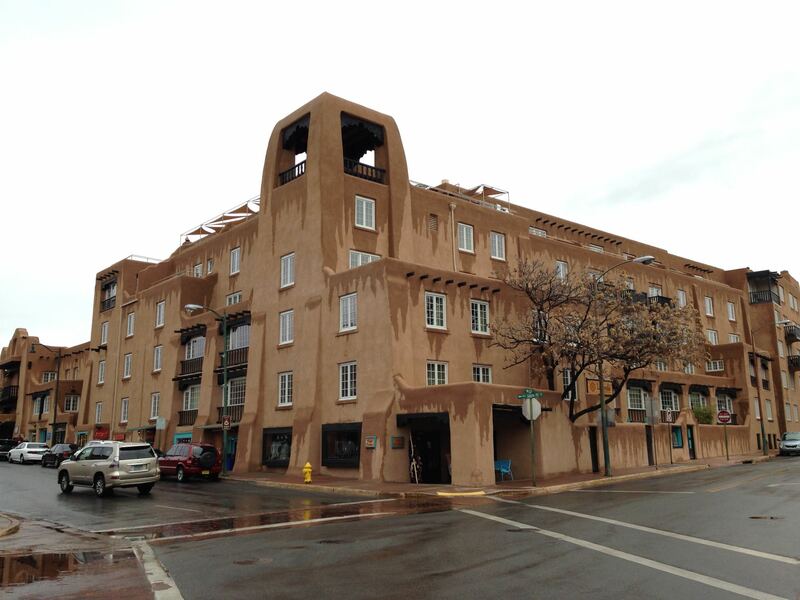 Even newer buildings adopt the Adobe style architecture. 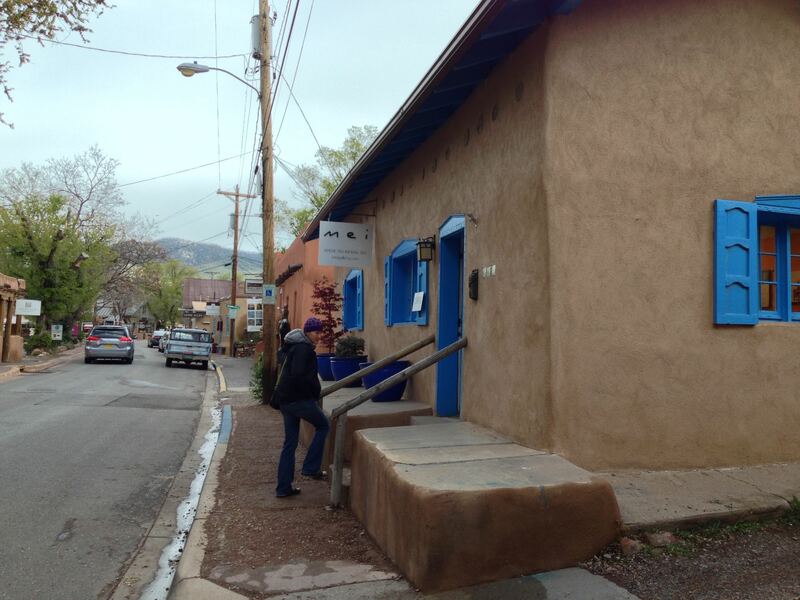 Saw this place on TripAdvisor as a top attraction for Santa Fe, and we were glad we went. It is a small chocolate shop with very high quality sipping and eating chocolates. 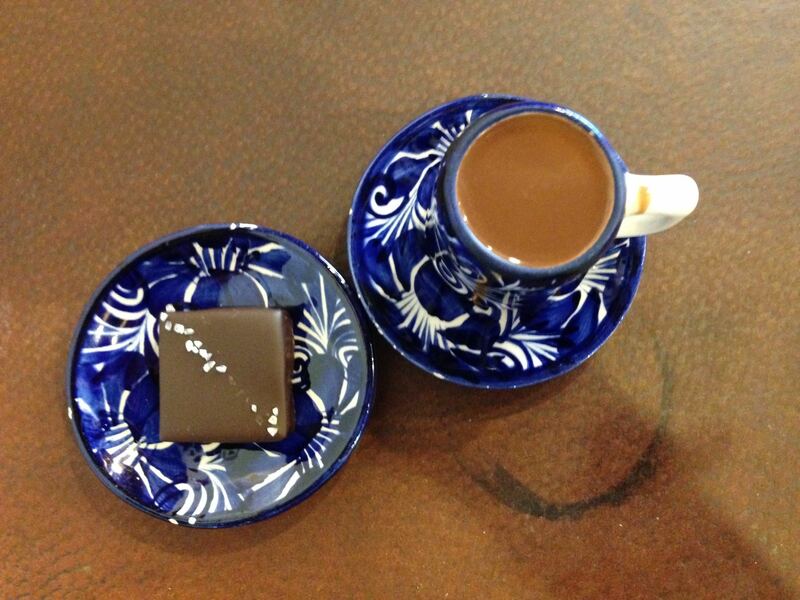 Sipping and eating chocolate at Kakawa Chocolate House. The salted caramel square is amazing. We had the Americano chocolate – it is made with almond milk and 72% dark chocolate. There are vegan options here, but the kind we enjoyed had dairy in it. 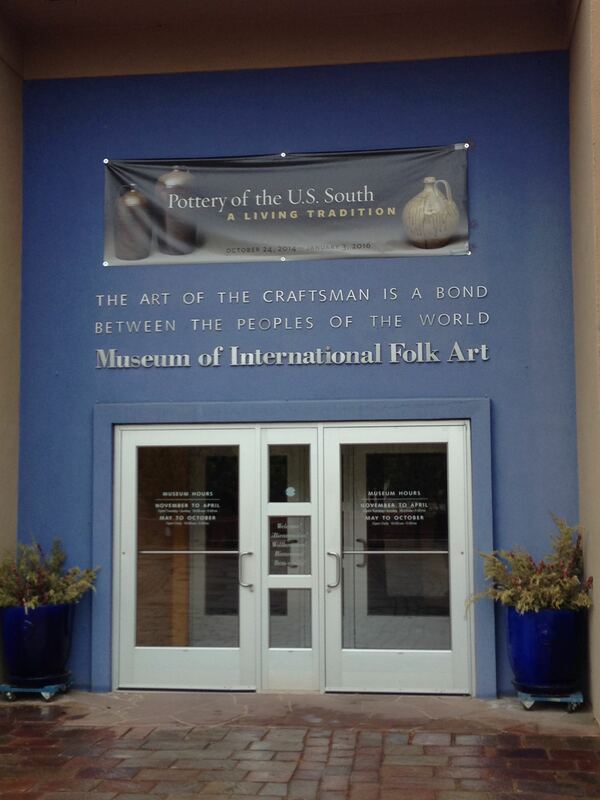 The Museum of International Folk Art is worth going to. 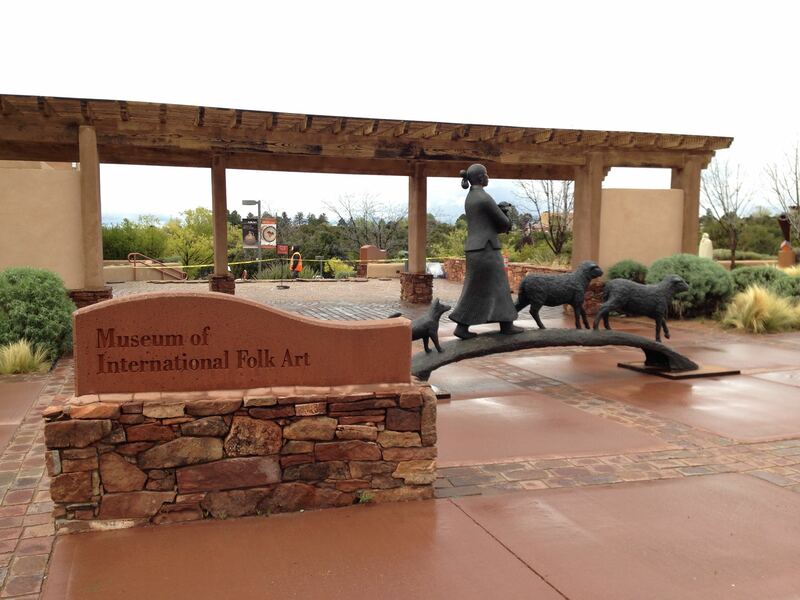 I am usually not a big fan of museums, preferring to spent time outdoors, but this one is awesome. 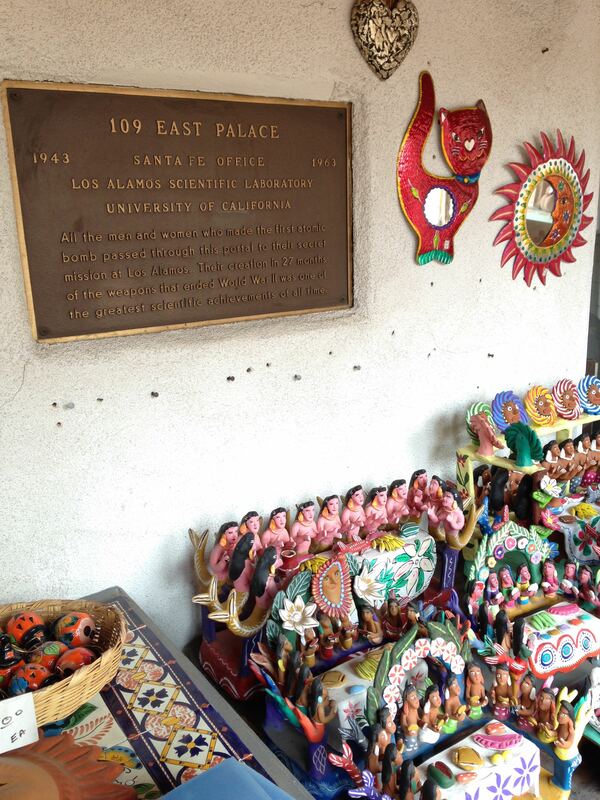 It is full of very cool trinkets, toys and keepsakes from a variety of world cultures. 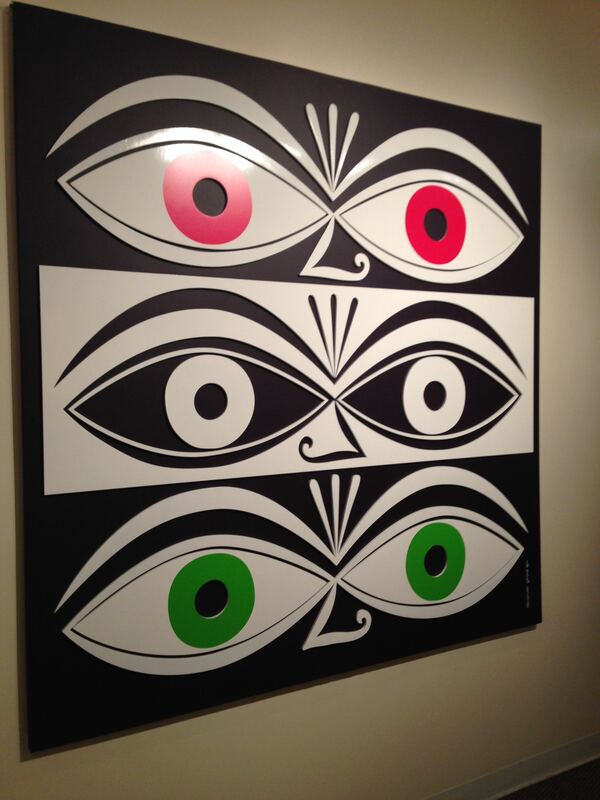 Much of the collection was donated by a collector during his travels to over 100 countries! It is impressive! 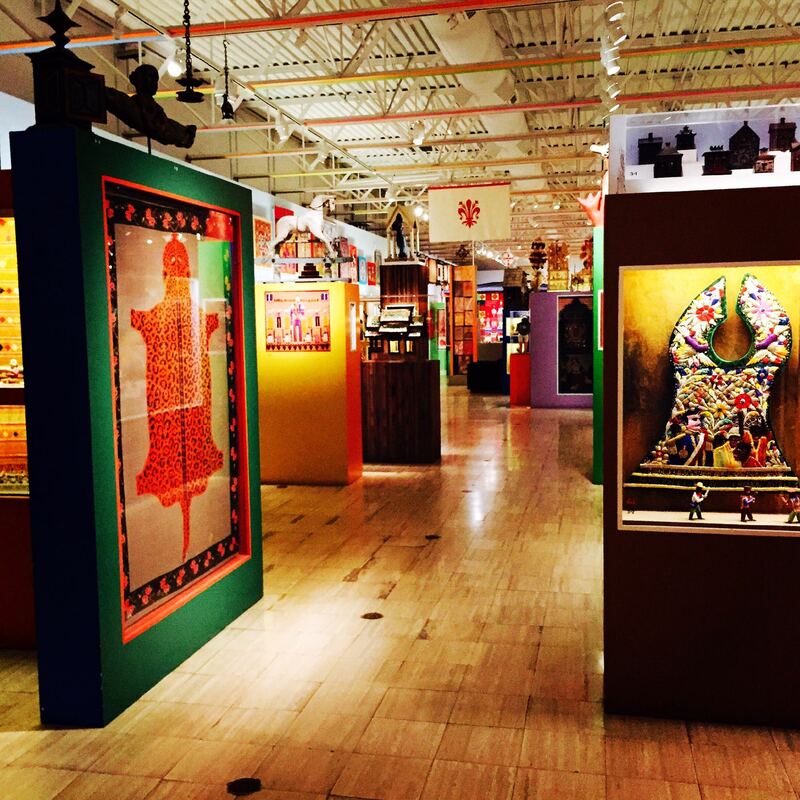 This is the gallery inside the Museum of International Folk art. This entire warehouse is PACKED with all kinds of stuff from around the world. You could spend a day in here…we chose to spend about 2 hours. 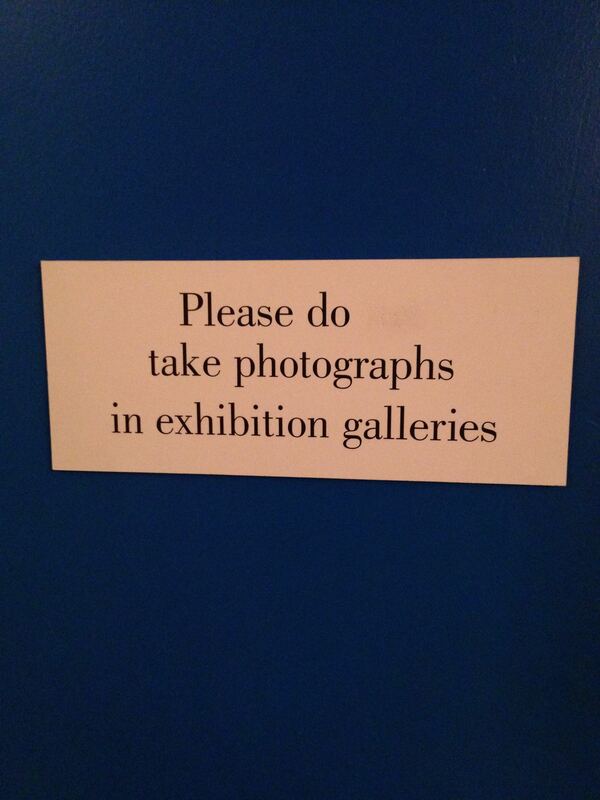 They encourage photography in this museum! 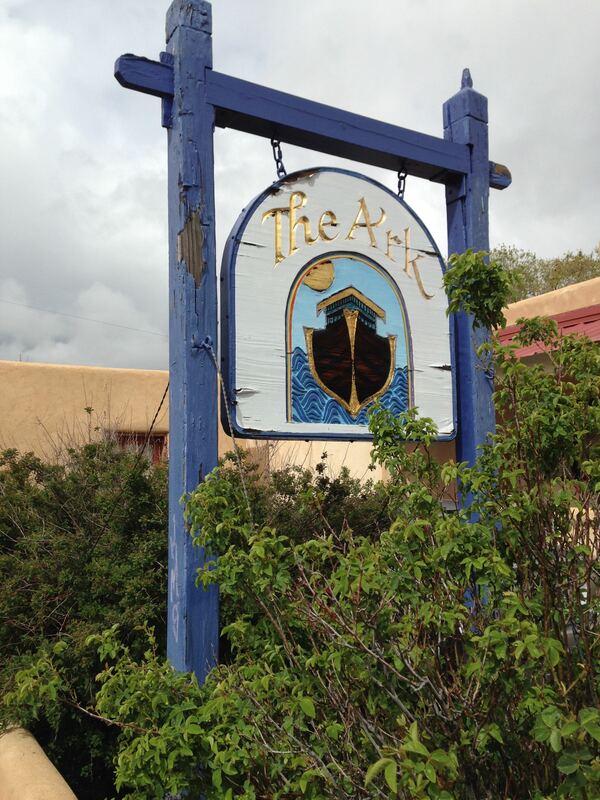 An epic metaphysical and spiritual bookstore in Santa Fe. 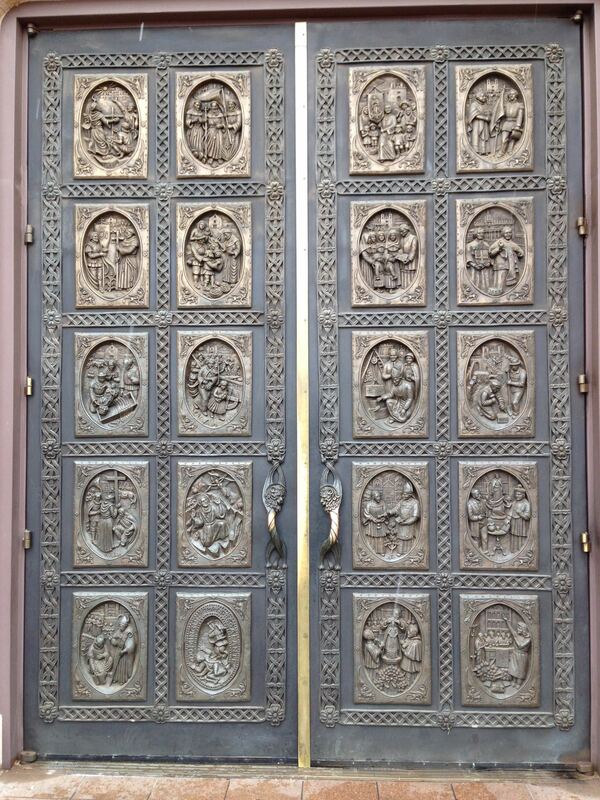 It has been around for like 35 years and they have some great books and gift items here for the spiritually inclined. 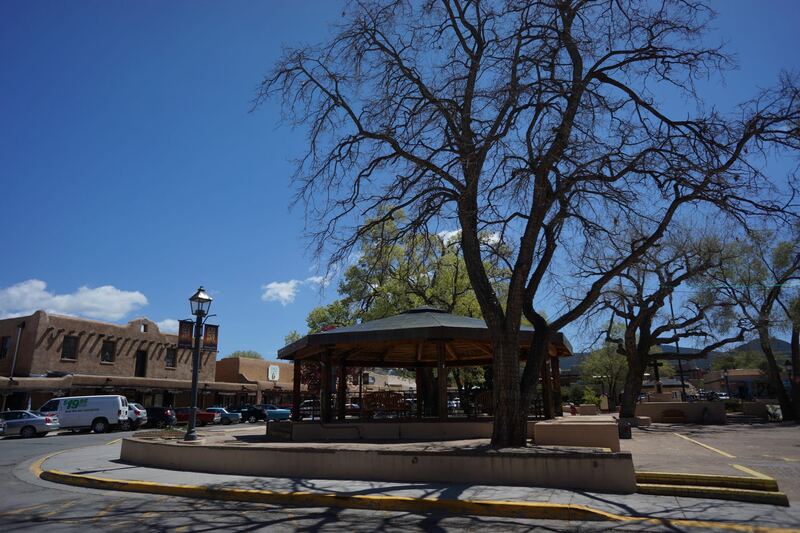 Sante Fe has several areas with galleries, and surprisingly, the majority of them are NOT located around the old town plaza. 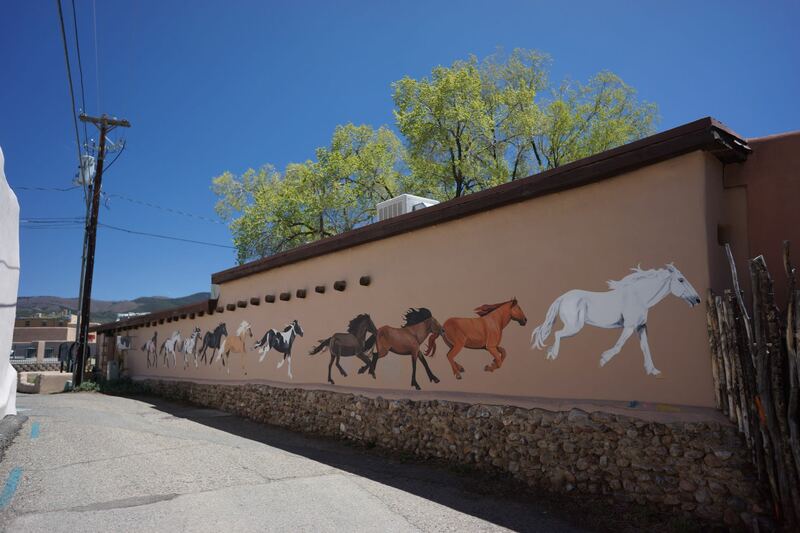 Visit Canyon Road (about 2 miles from the old town plaza) and you will see dozens of galleries and tons of street-side art like the works you see in this photo. 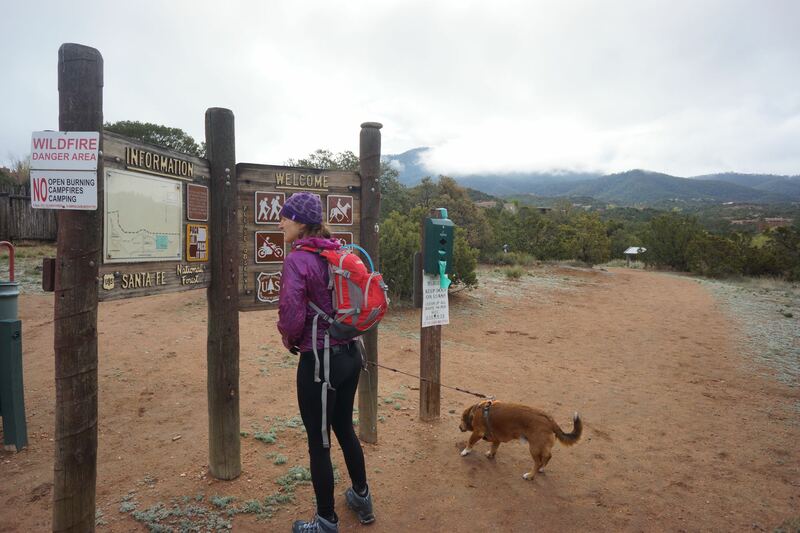 Before leaving Santa Fe we wanted to do another shorter hike. 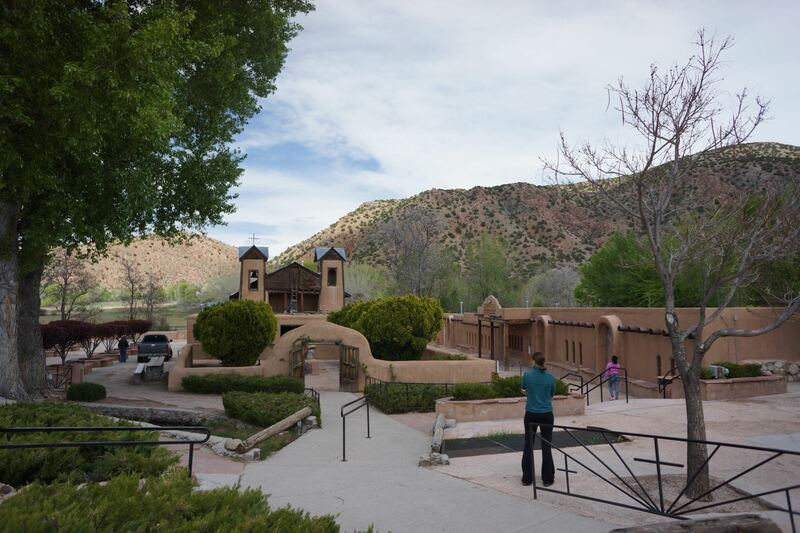 Atalaya is easily accessible from the east side of town. Just park in the St. Johns college parking lot and head out. 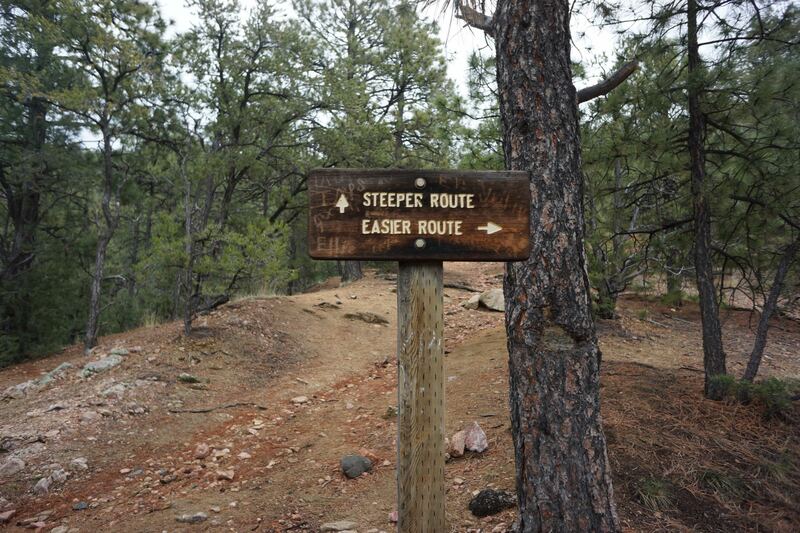 It is 6 miles round trip with about 1500 feet of climbing. You can stop part way up if you don’t want to go to the top, and on a clear day have amazing views. 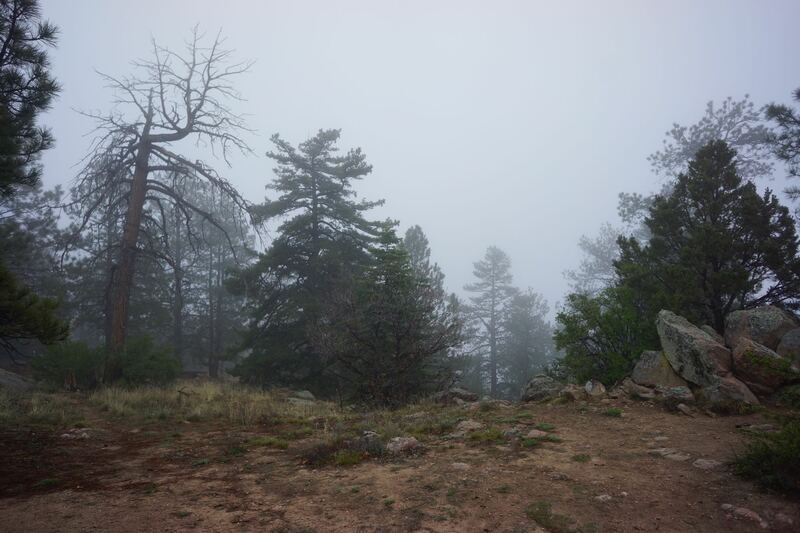 We didn’t have clear weather, but hiked to the top anyway. 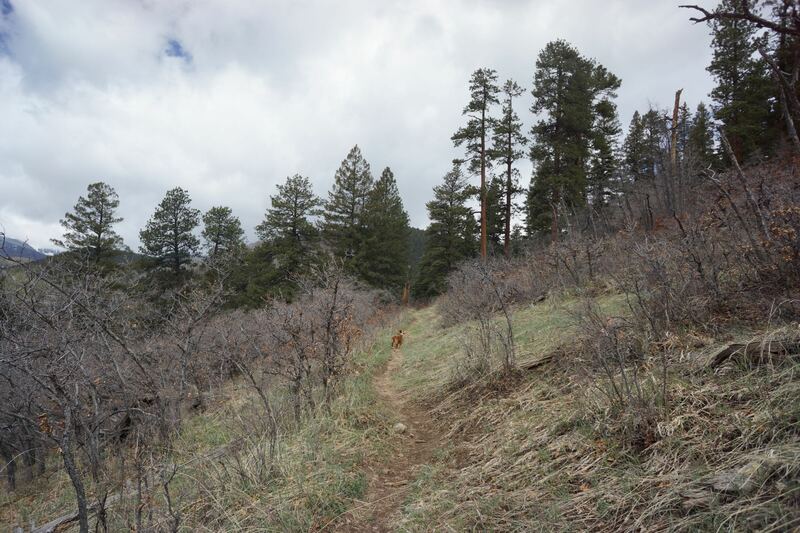 Duke went with us of course….and after the first half-mile we kept him off leash the entire way with no problems. 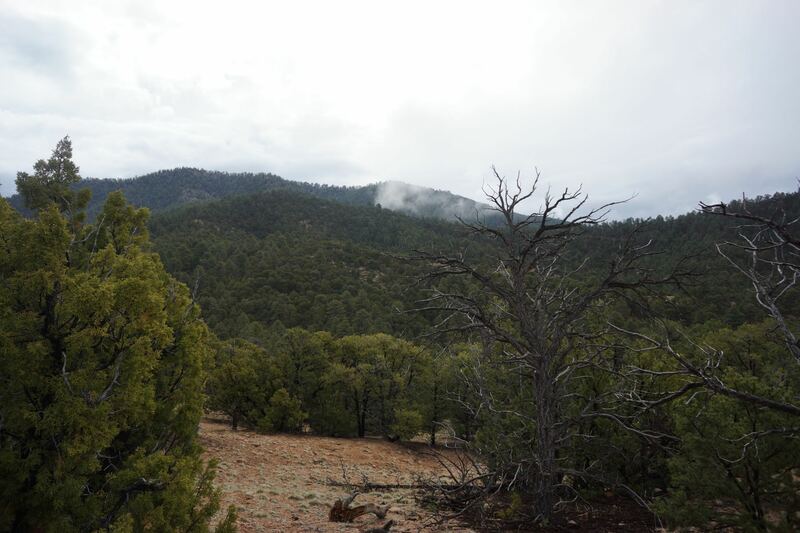 Hiking up Atalaya Mountain near Santa Fe. 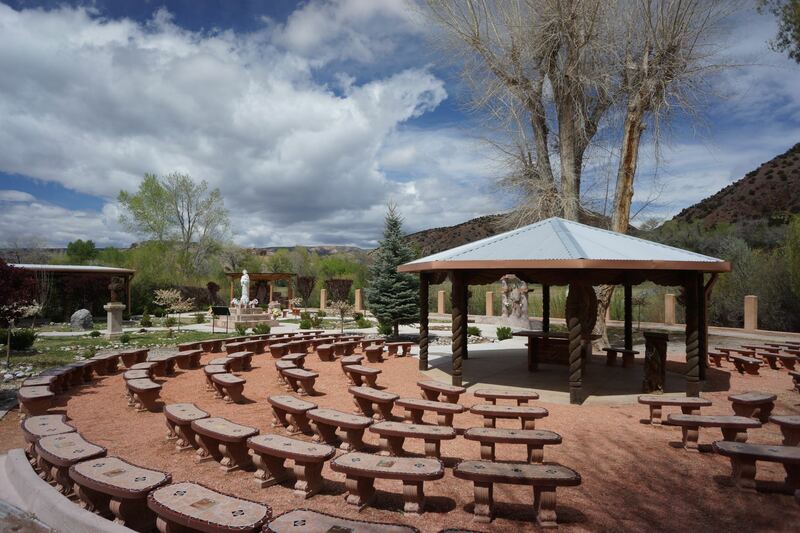 ‘Atalaya’ trailhead in the front of St. John’s College. 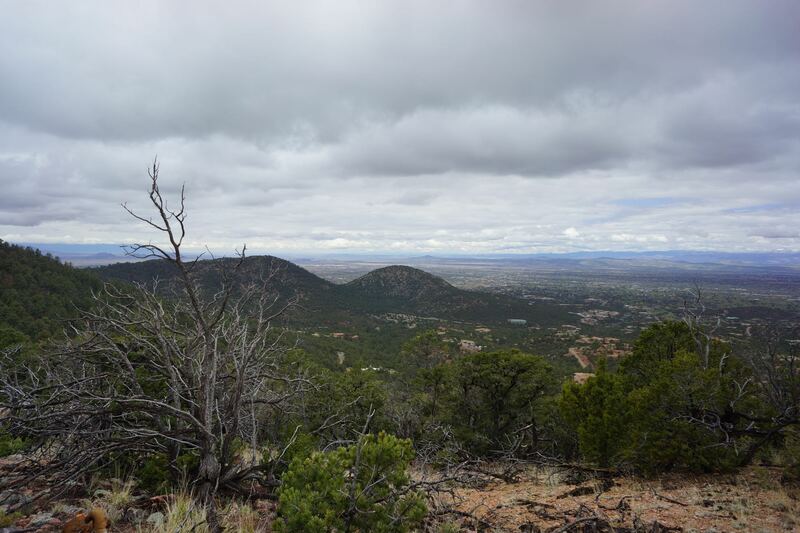 This trail is about 3.1 miles each way (6.2 miles roundtrip) to the top of a mountain with epic views of Santa Fe and the surrounding mountains. 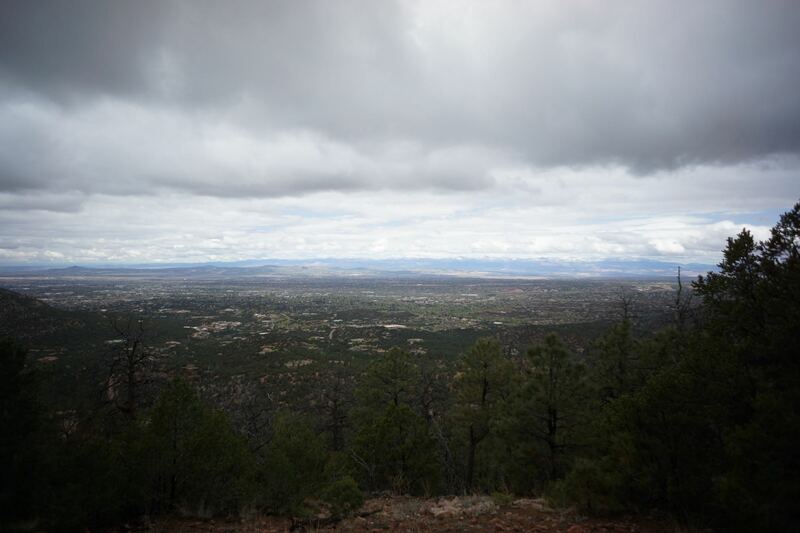 It was a rarely cloudy day so we didn’t get great views. 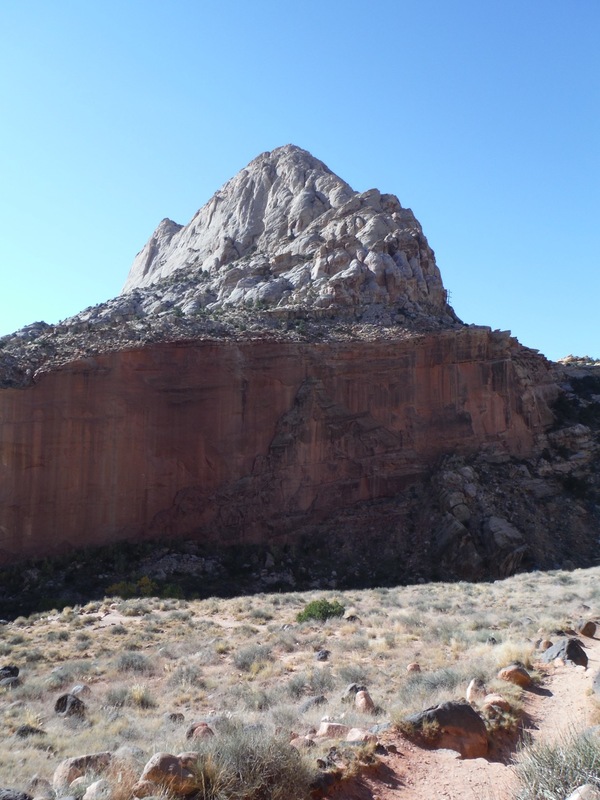 The hike has about 1500 ft of climbing to the top. 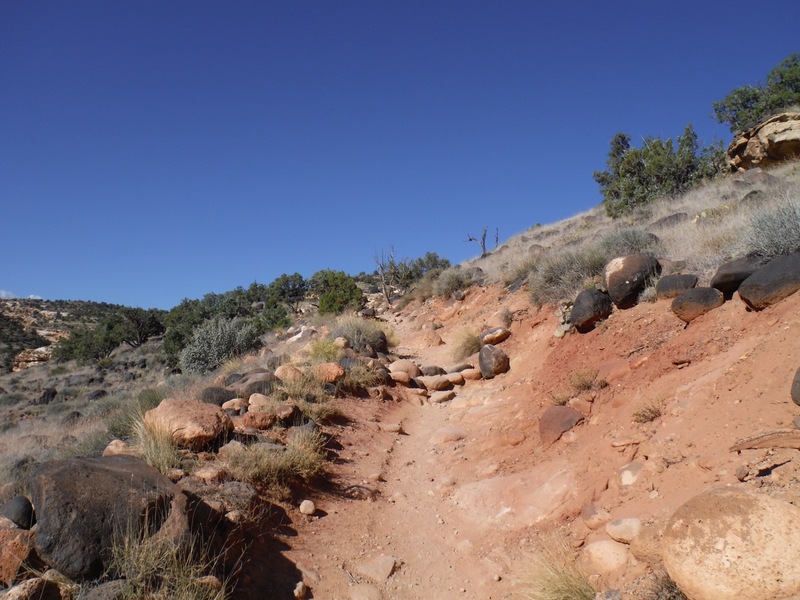 The trail starts gradual then gets steeper. It took us 3 hours roundtrip moving at a good pace. 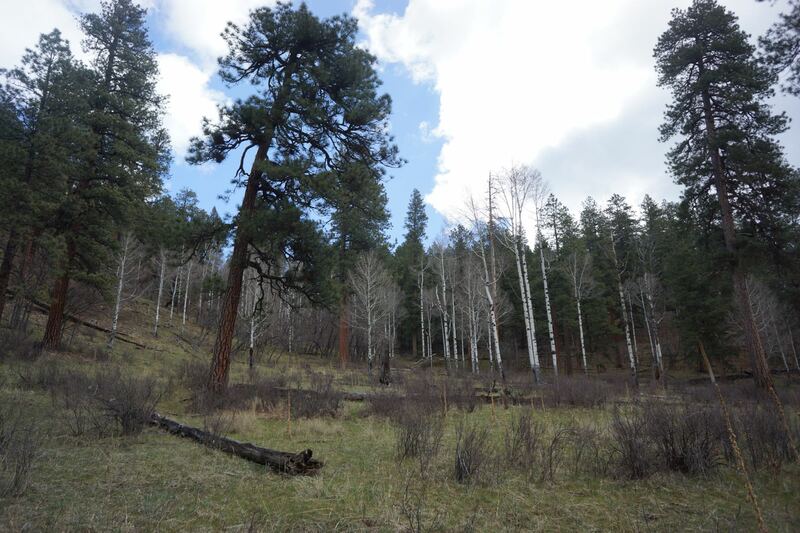 Use your imagination, there is an epic view right there! 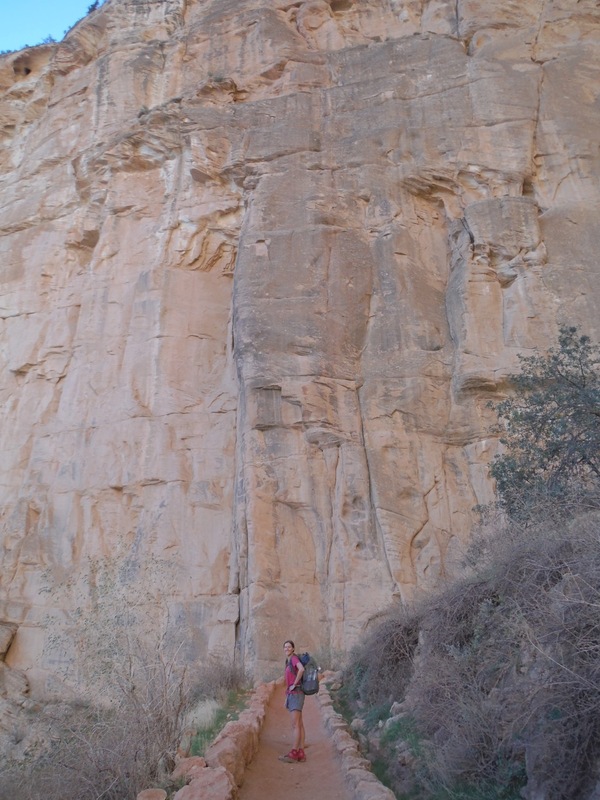 We chose the easier route…which was still sorta steep. 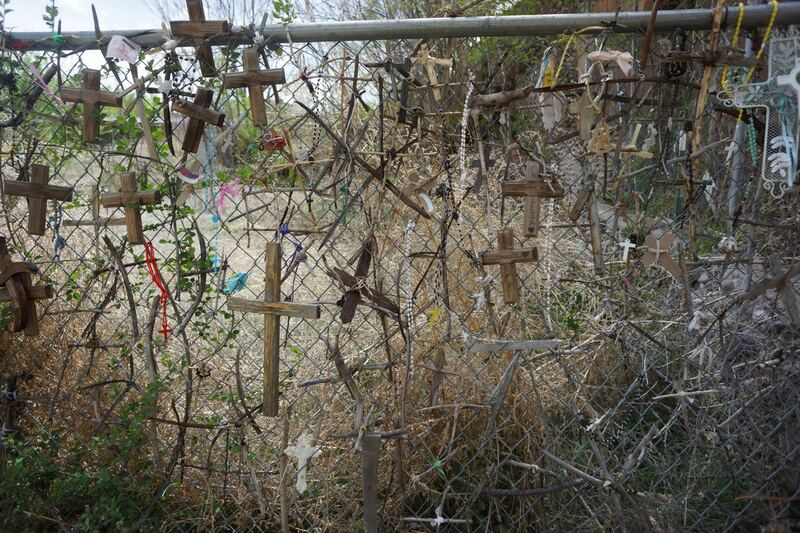 The fence of crosses as we entered the Sanctuario. 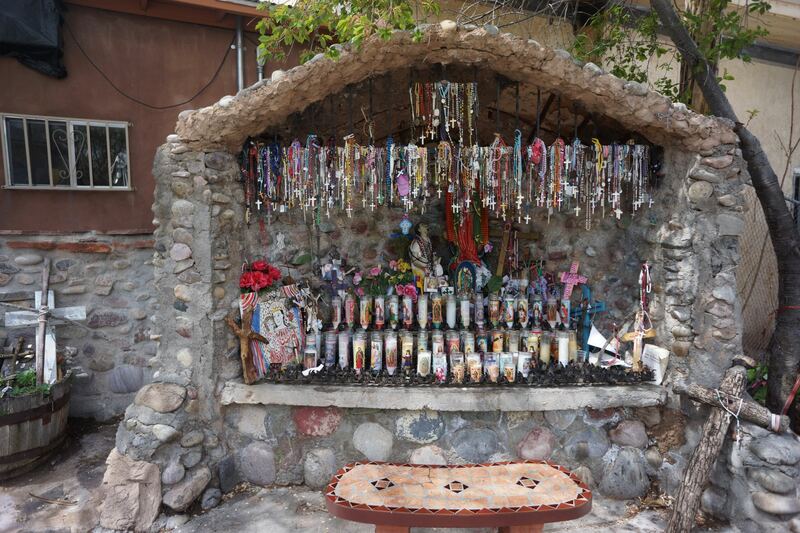 People leave memorials for people who have passed away or are in need of prayer. 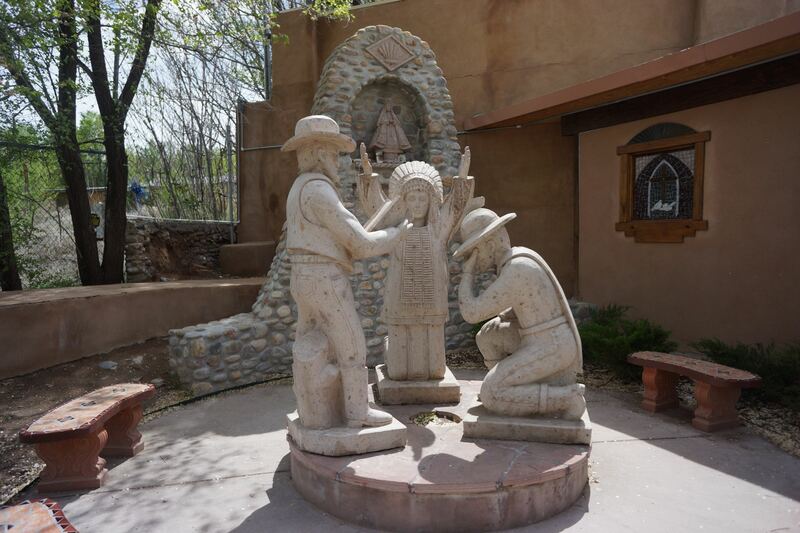 There are several sculptures in the gardens surrounding the church. Frito Pie? 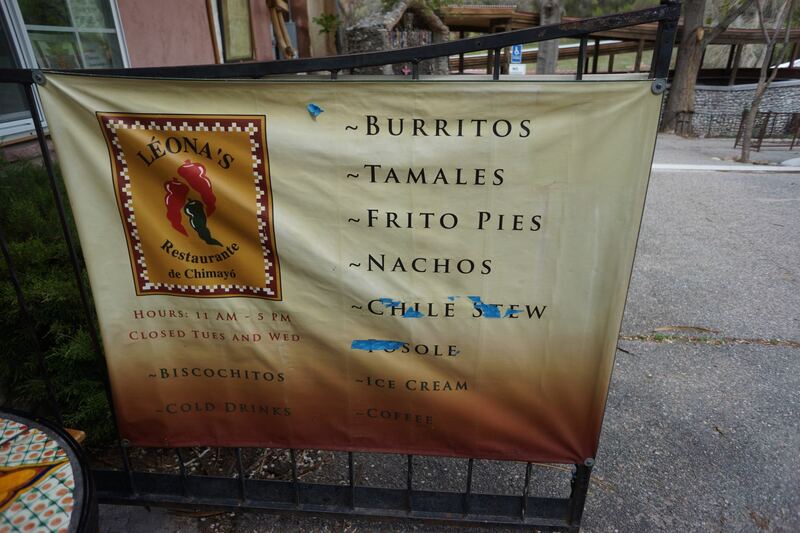 Apparently it is a specialty of the Santa Fe area. 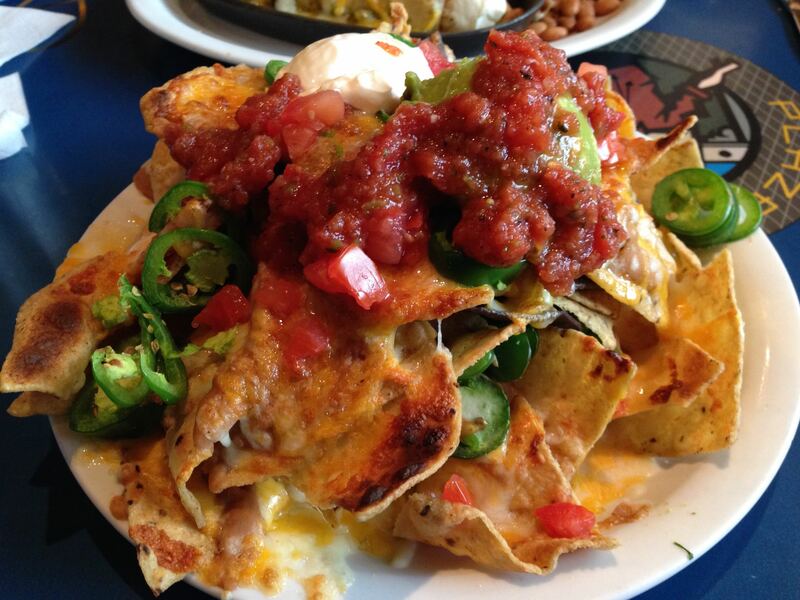 They cover a bunch of Frito’s corn chips with chili and other toppings. Sometimes it is served in the Fritos bag! The Sanctuary! 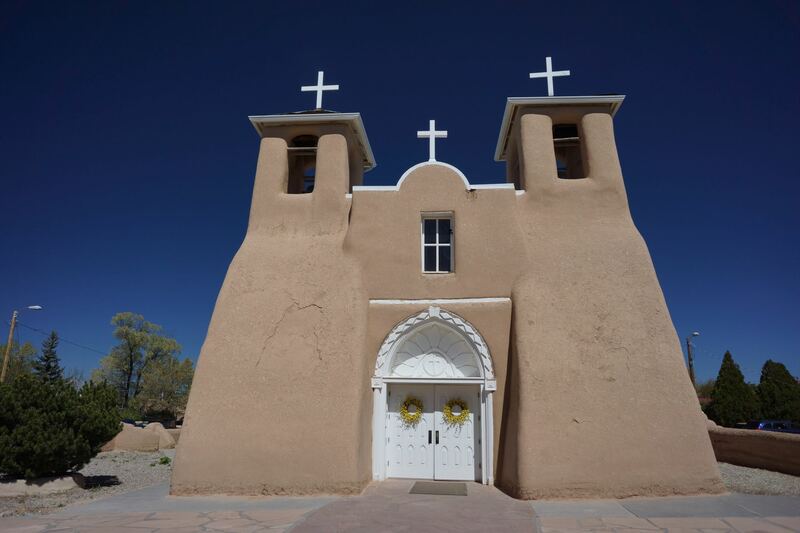 It was built in the 1800’s, and inside is a hole in the earth that is said to have once contained a cross. 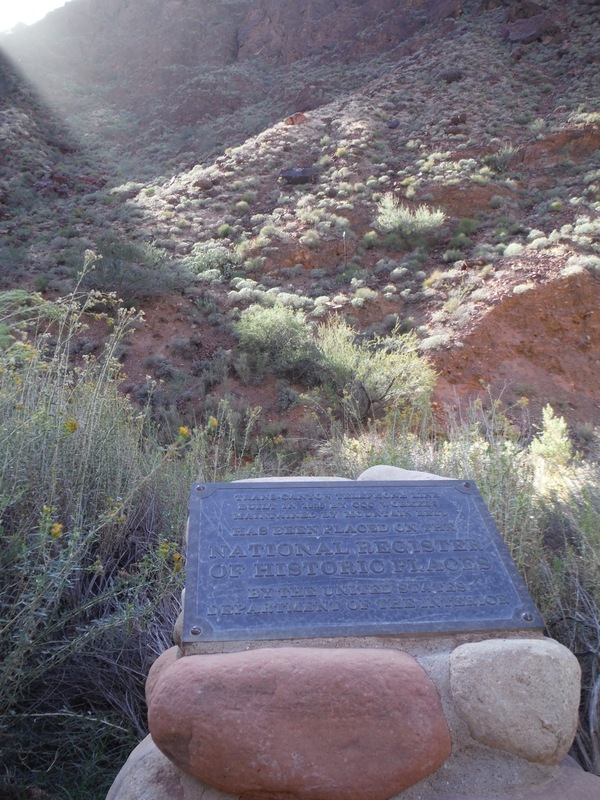 The cross was found by an early explorer who took it as divine providence. The church has an entire room filled with crutches and walkers from people who claim to have been cured by visiting this holy site. 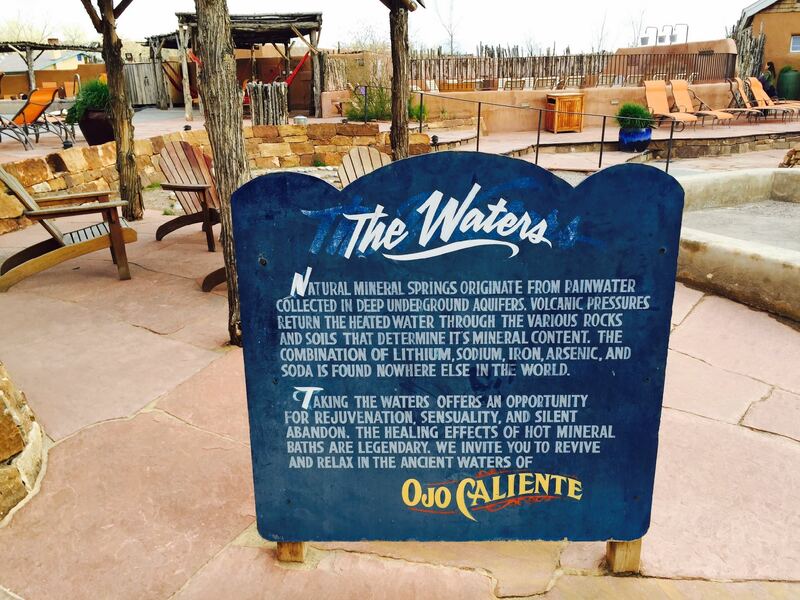 We didn’t take any photos of the Ojo Caliente hot springs. It is definitely worth a visit! 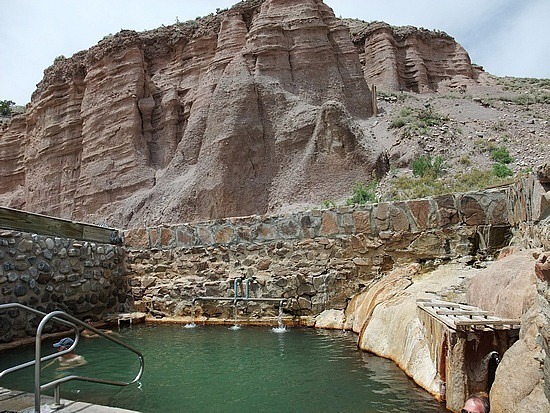 They have private and public natural hot spring fed pools. 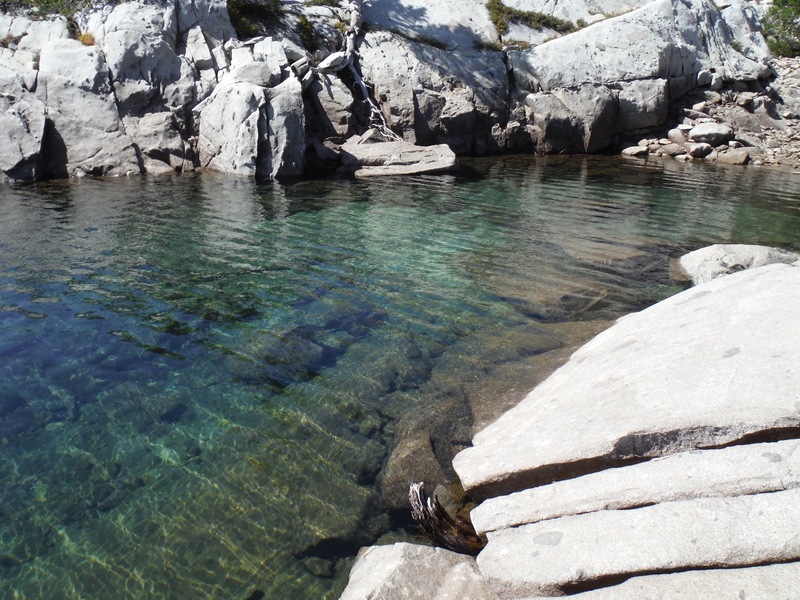 The private pools were of varying temperatures and mineral contents. They even had a mud pool! Worth spending a few hours here on a lazy afternoon or evening. There is also a bar, restaurant and accommodations for the well-heeled traveler. 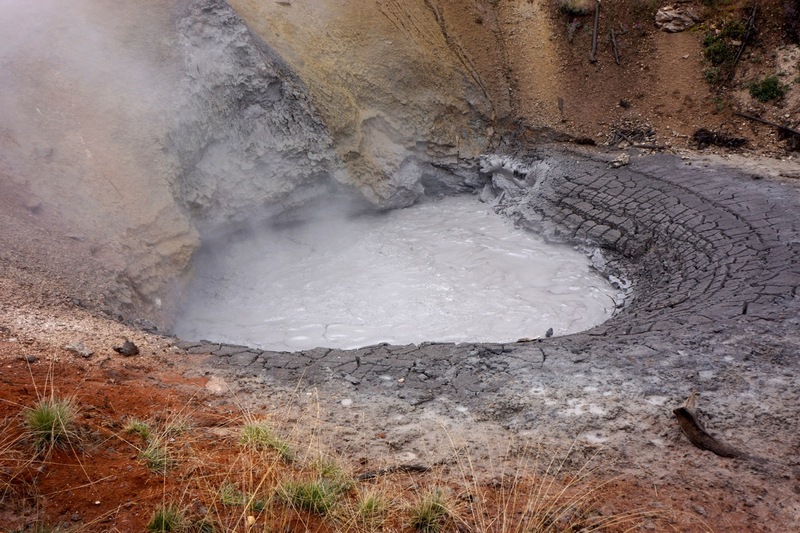 An image I stole off the internet….We spent a lot of time in this particular hot pool, though there are 7 pools to choose from! 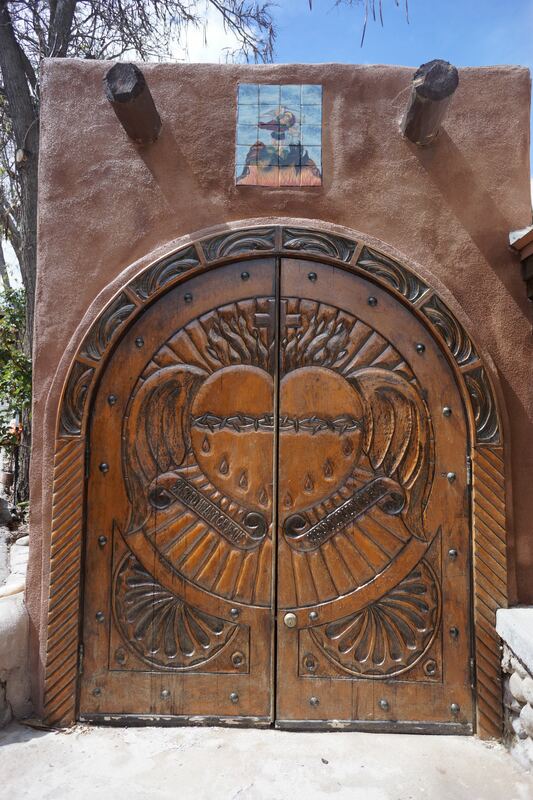 We had heard a lot about Taos and were excited to check out this mountain town known for great food, cool art and spiritual pursuits. 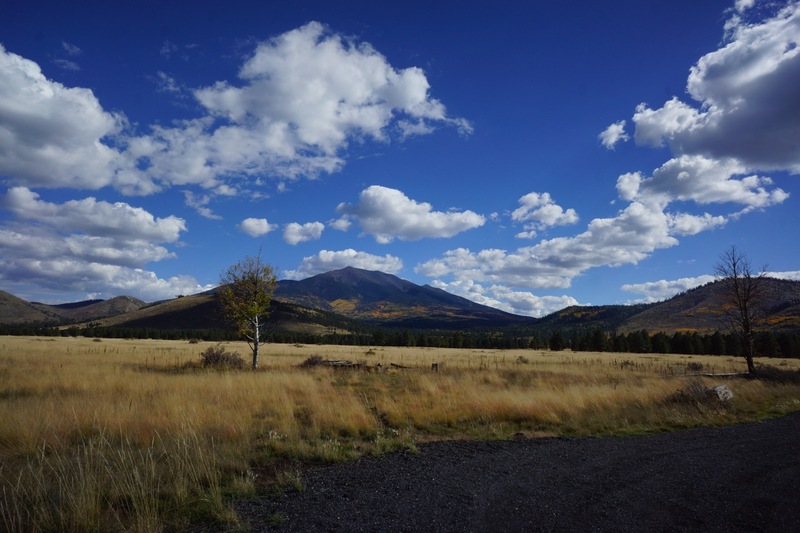 The drive up to Taos from Santa Fe is stunning. 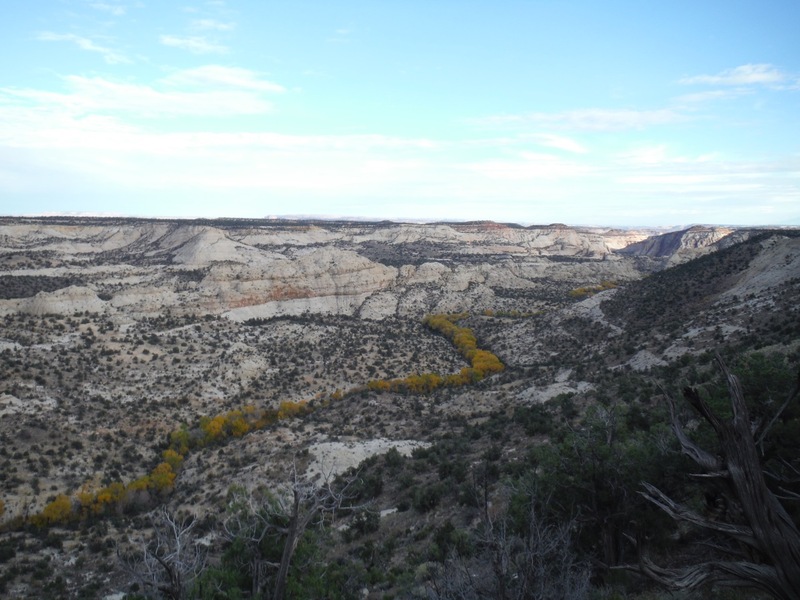 We did not take the HIGH ROAD TO TAOS, as we were coming from Ojo Caliente (a different direction). 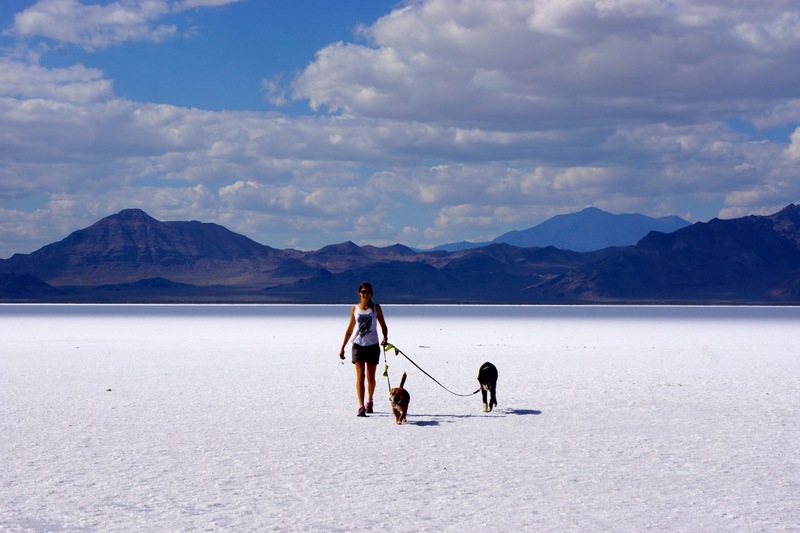 However, the high road is supposed to be a MUST DO ACTIVITY when visiting the area. We will try that next time! 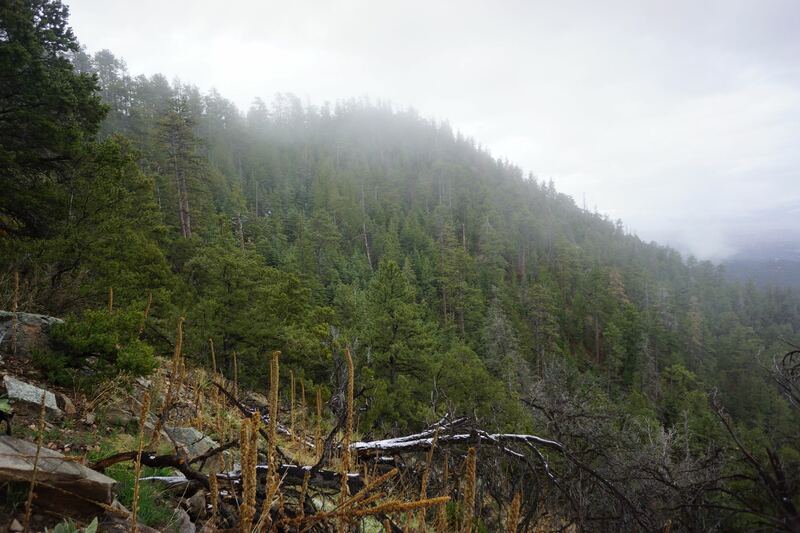 Sangre de Christo Mountains fall right into the town of Taos. One of many old churches in the area. 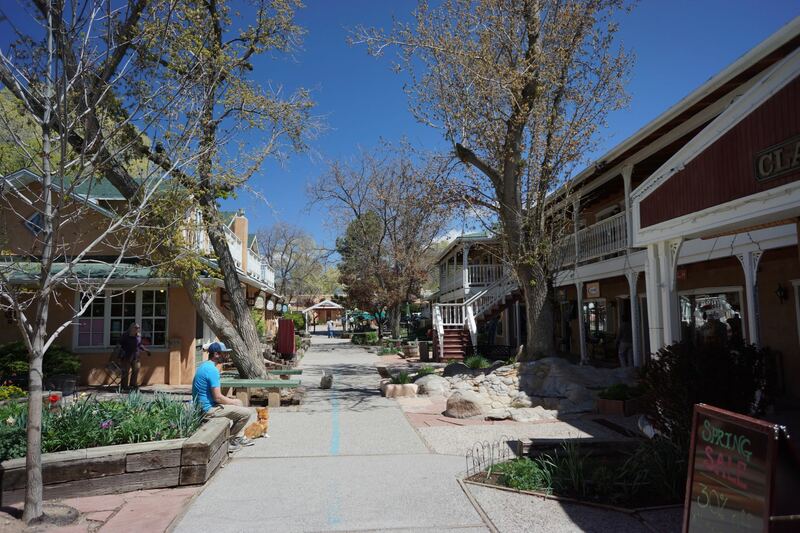 The Taos Plaza is surrounded by galleries and locally owned shops and cafes. This area, known as “Bent Street” is super cool. More shops and galleries are located here. Sangre de Christo mountains in the background! Hanuman Temple grounds. The temple itself is very small, though there are plans to build a larger one at some point. 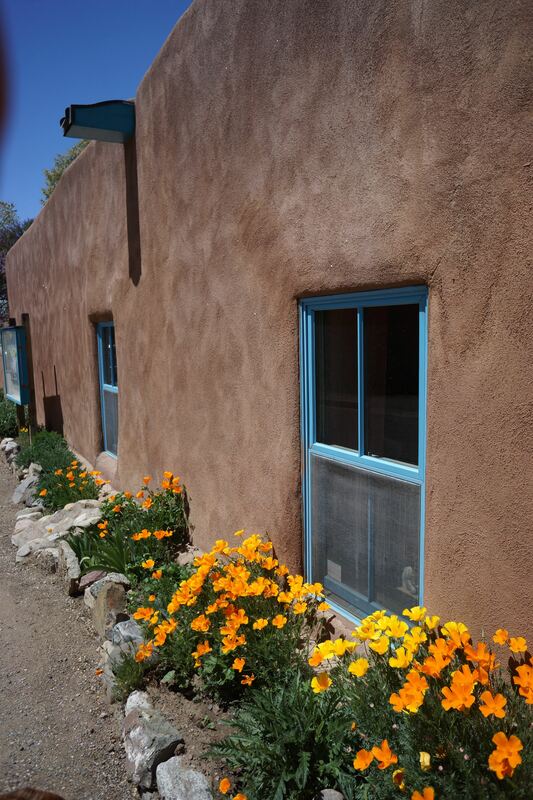 This is the Ashram for Neem Karoli Baba. If you are familiar with Krishna Das or Ram Dass, he is their guru. 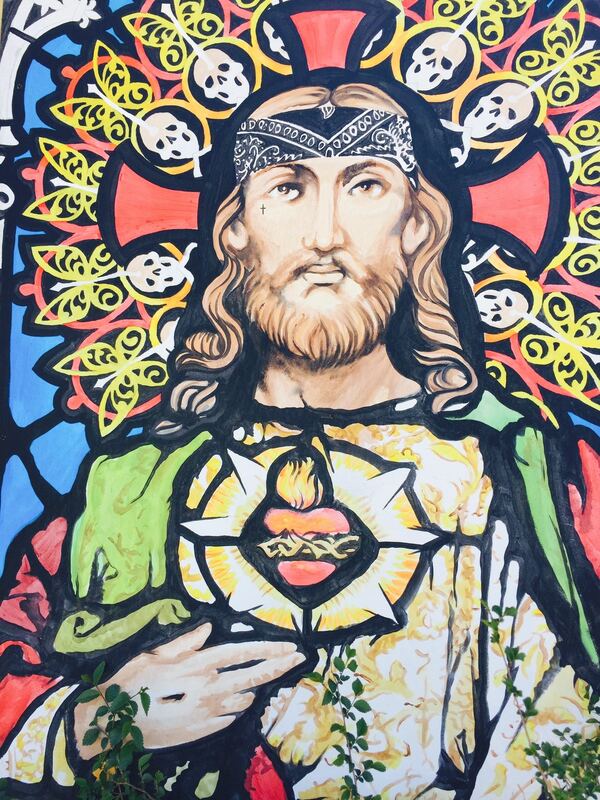 He has passed away but devotees keep his message of love and compassion alive. The ashram has a neat little bookstore, a small worship area with a Hanuman murthi (idol) and there are kirtan, satsang and meals served periodically. Our last meal in New Mexico, with more chili sauce!!!! 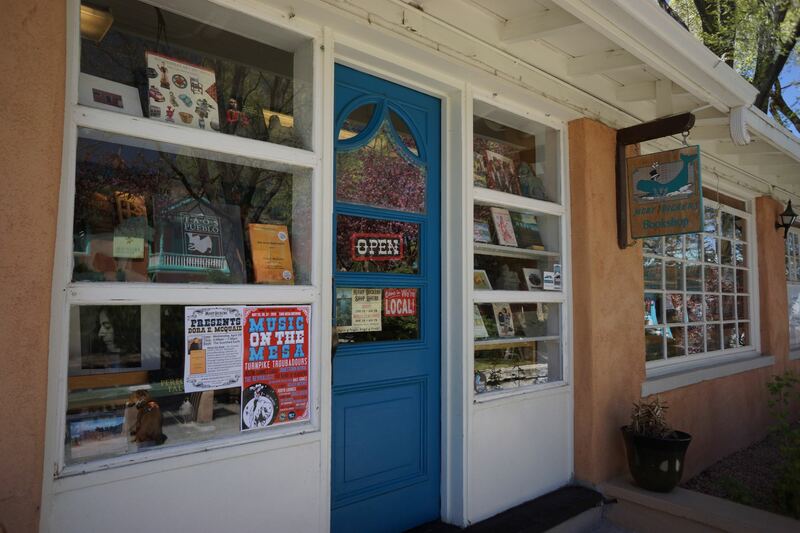 Very cool book store in the Bent Street area in Taos. 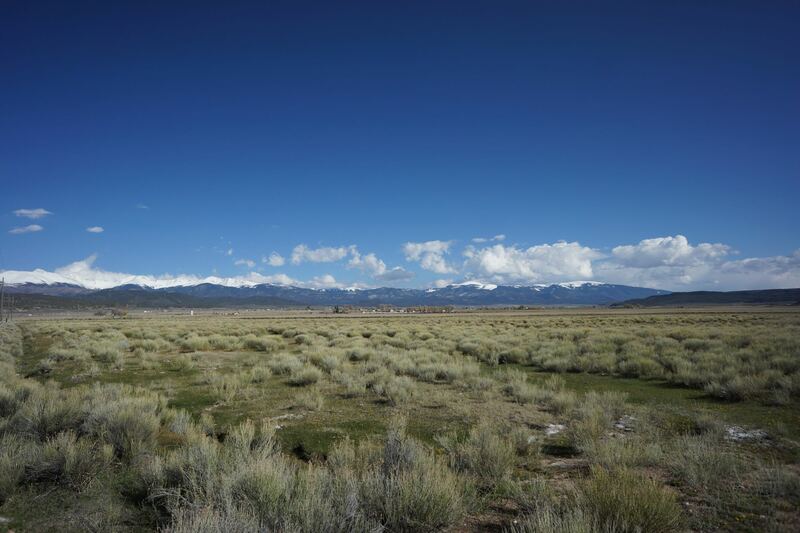 Driving from Santa Fe to the Denver Colorado area via Taos and the northern route is very scenic. We didn’t stop to take many photos, but it was awesome. Take our word for it! 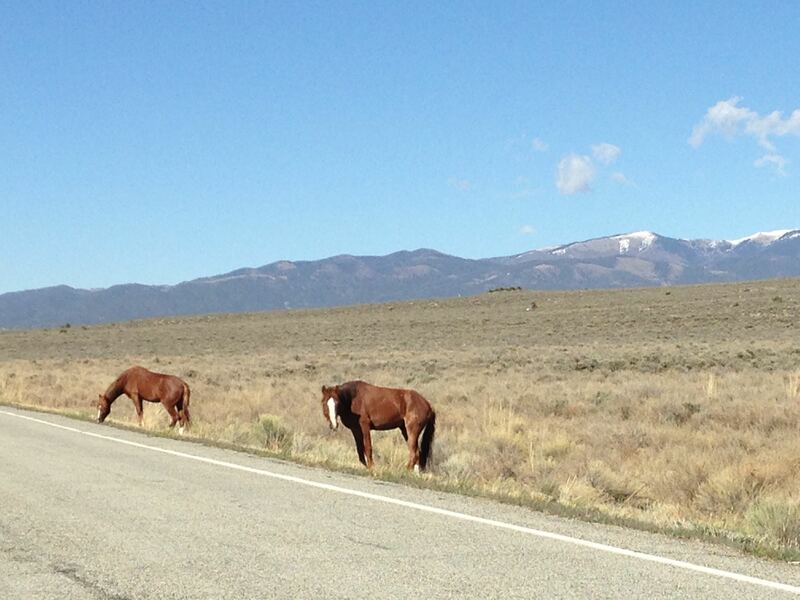 Wild horses along the road! 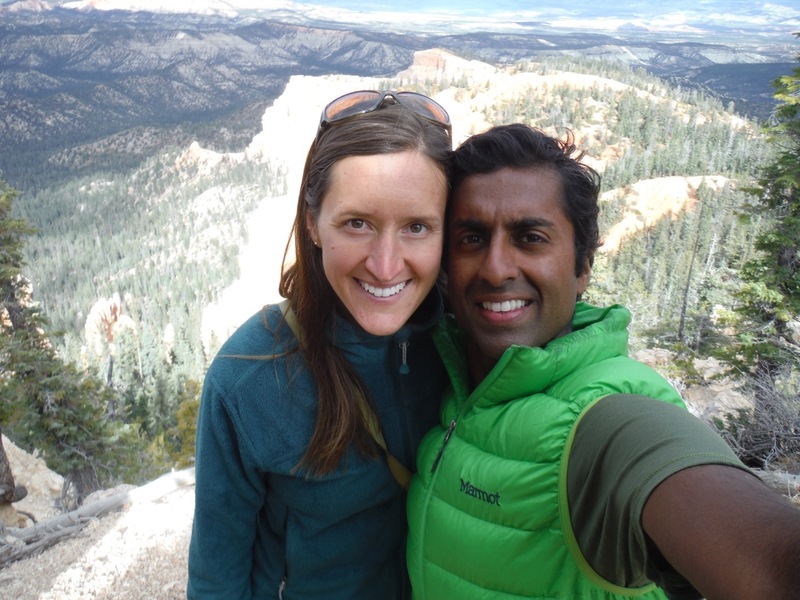 Where in the world are Ravi and Alison? 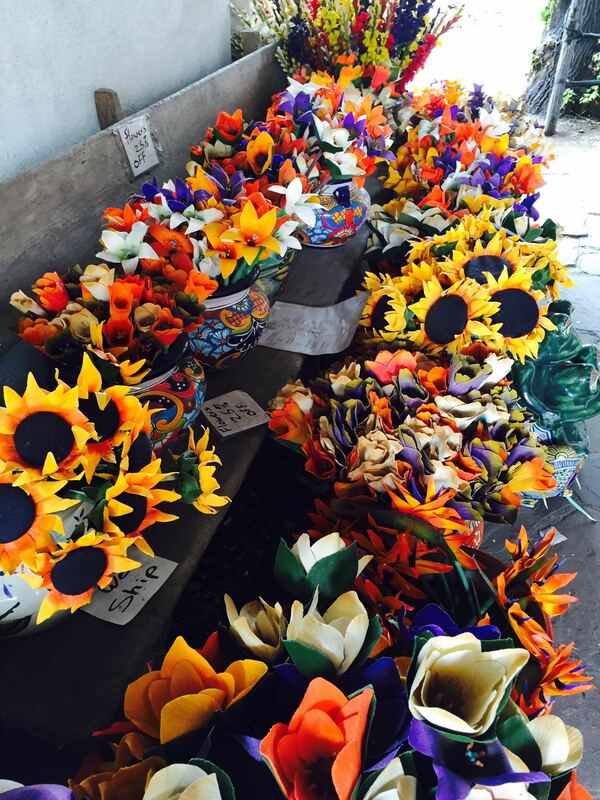 It’s been a long time since we posted on this blog. That doesn’t mean we have been sitting still! 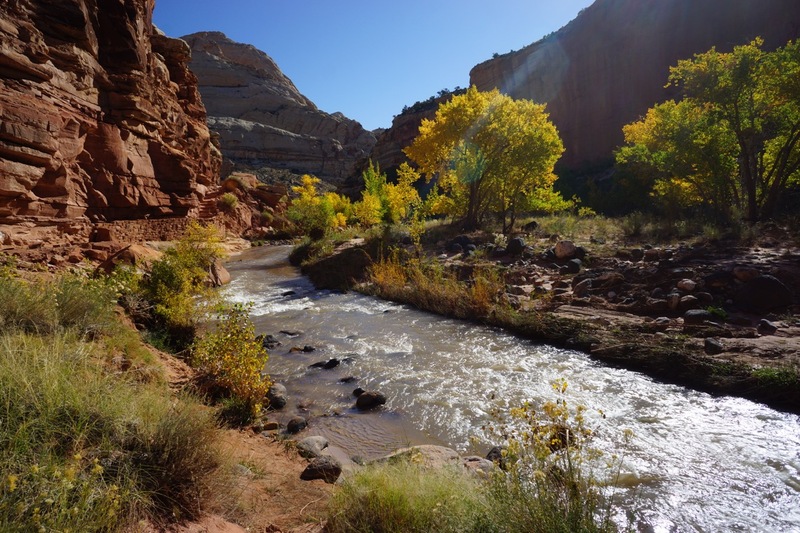 Since visiting Capitol Reef National Park in October, 2014 in we explored several other cool spots in Southern Utah, Death Valley California and did some epic road-tripping around the West and South Western parts of the U.S.A.
After being on the road for over 15 months, we decided that it is time to settle down (for the time being!). Our big question was, WHERE? We decided to make our way to the middle of the country, to a place where the sun seems to always shine and the mountains (I mean BIG MOUNTAINS) are at our doorstep. 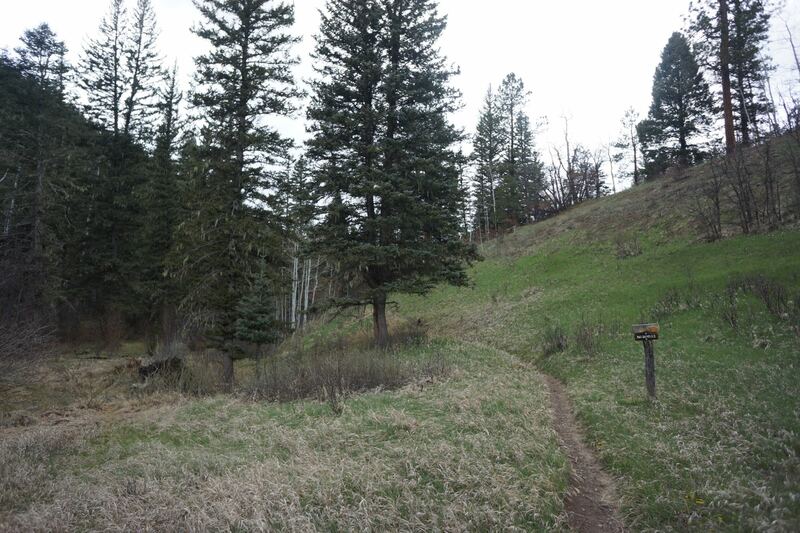 We have rented a little house spitting distance to some nice trails, and a short drive to the wonders of the Rocky Mountains. 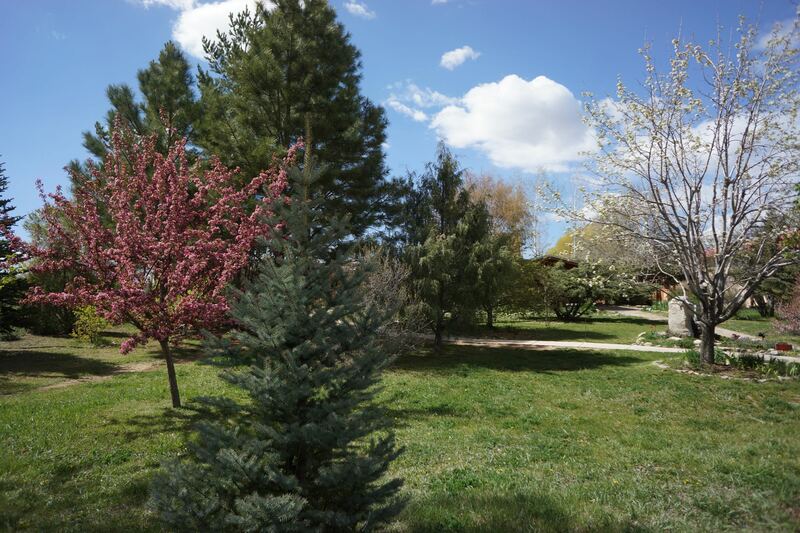 conveniently, Denver is only a 25 minute drive away. Now that we are settled down, you can expect a series of blog posts to catch you up on our whereabouts over the last 6 months. We have done a lot and have some cool photos to share! 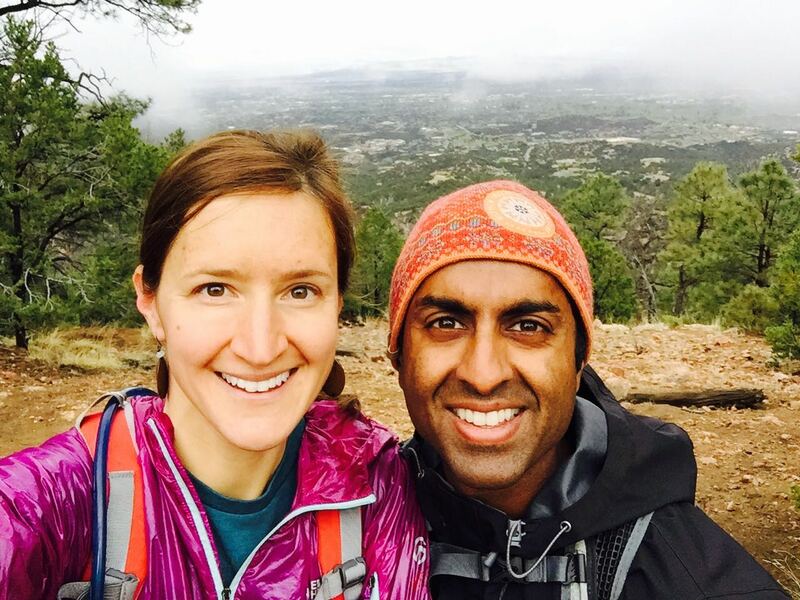 I took this photo from partway up the mesa behind our house, a few days after a light dusting of snow in Golden, CO.
Posted byraviandalison April 29, 2015 April 29, 2015 Posted inUncategorizedTags: Golden Colorado1 Comment on Where in the world are Ravi and Alison? October 18-20, 2014. By Ravi. 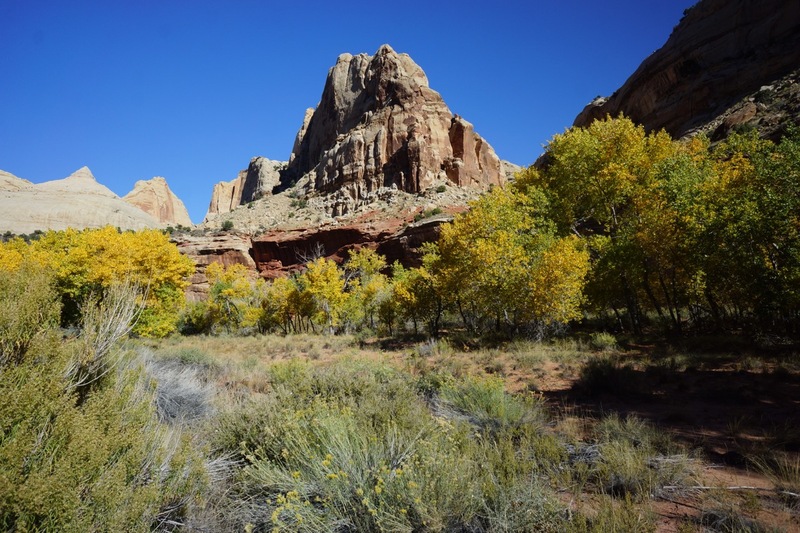 After Zion and Bryce Canyon National Parks, we headed to Capitol Reef National Park. 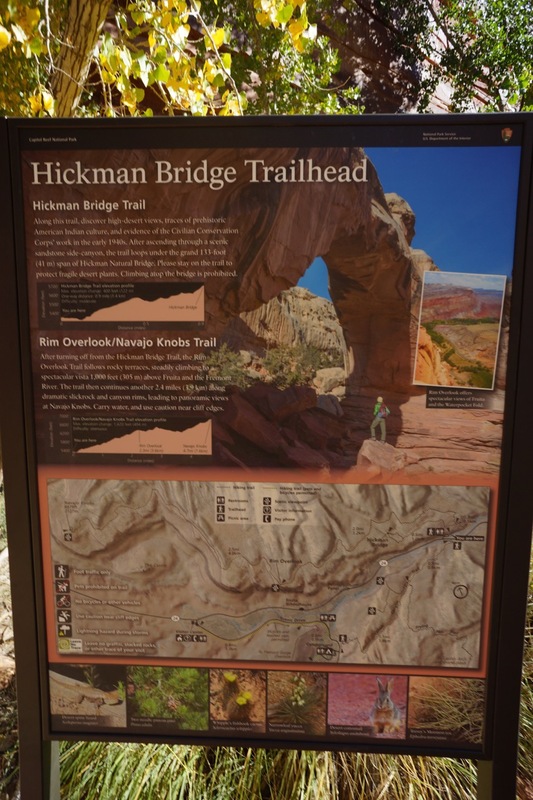 Neither Alison nor I had heard of it before….but it was on the way to Arches National Park….and figured we would be lame to not check it out. 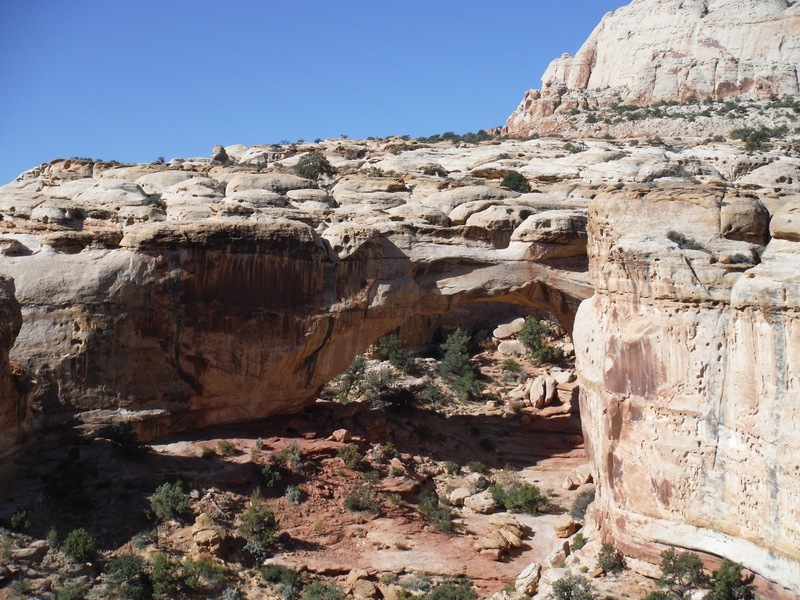 Plus, the road we were on (the scenic road through southern Utah, not the highway) literally cut right through it. The name was perplexing, and even after driving through a portion of the park we weren’t really sure what it was all about. 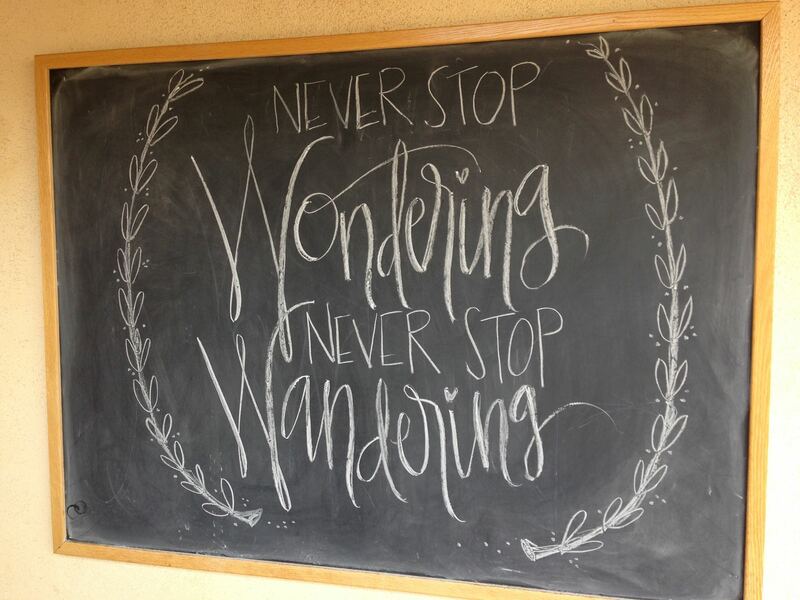 It took a full day of exploring to really appreciate it. 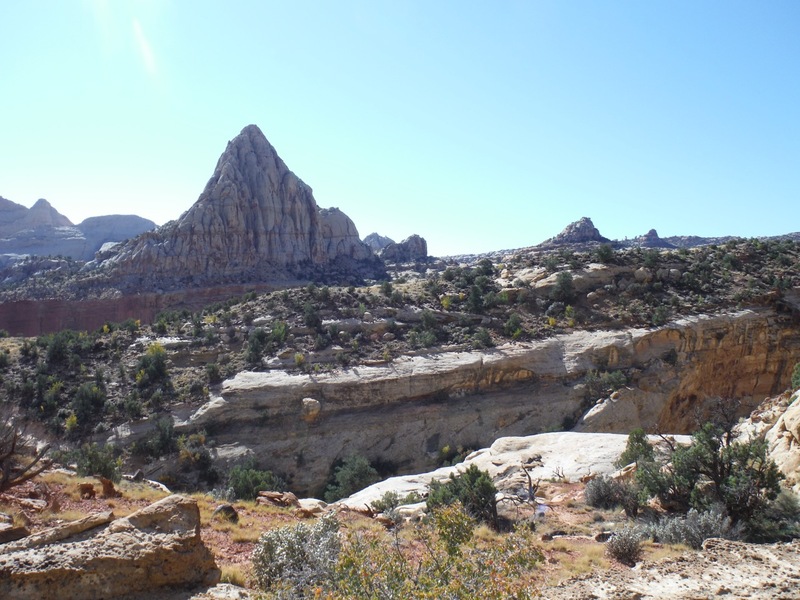 We both did a trail run to a high vantage point (separately, to keep the dogs company) and also drove a 20+ mile scenic road along the most beautiful part of the park, along the “anti-cline” with views of the “waterfold pocket”. 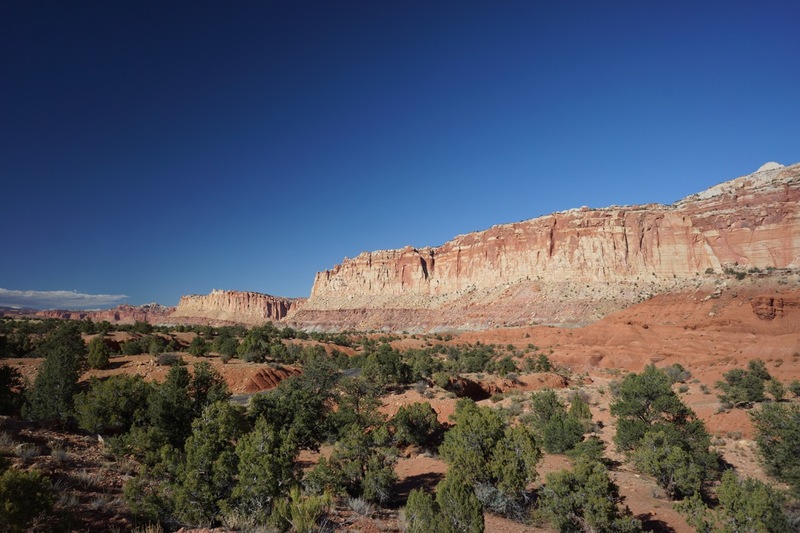 Capitol Reef was named since it is full of rounded white-colored sandstone domes, that reminded early explorers of the domes in US Capitol in Washington D.C. 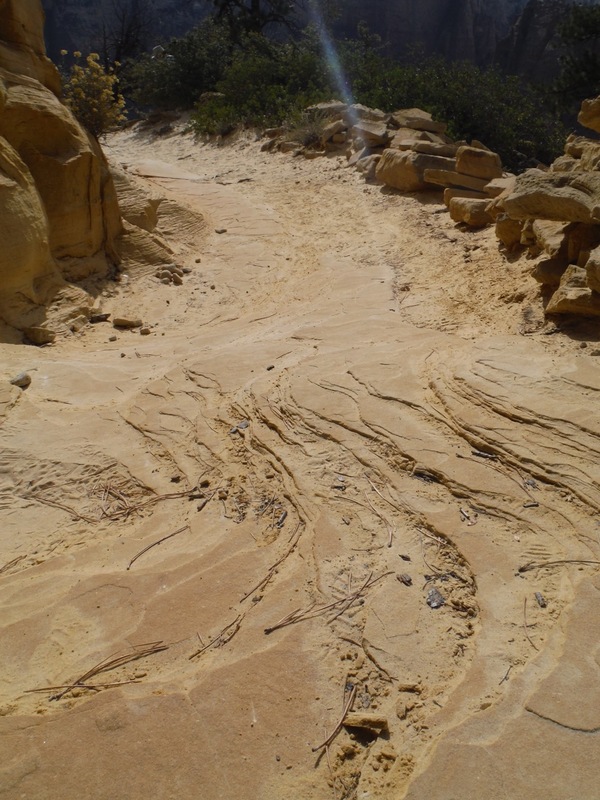 It also is a rugged place, and reminded them of ocean reefs that caused havoc on ships. 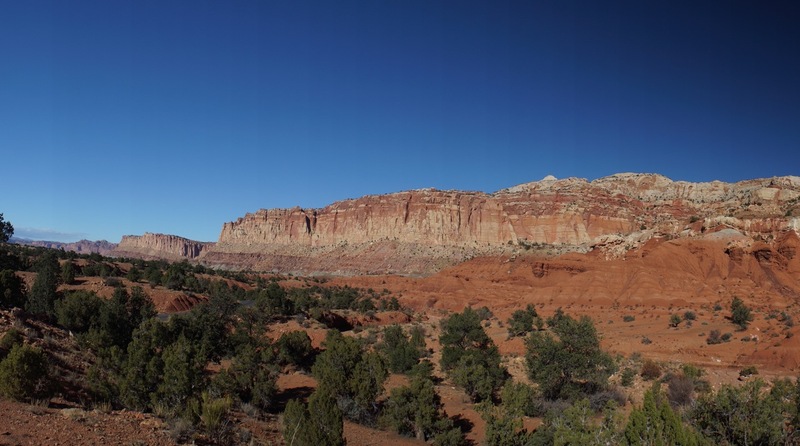 Thus the name “Capitol Reef”. 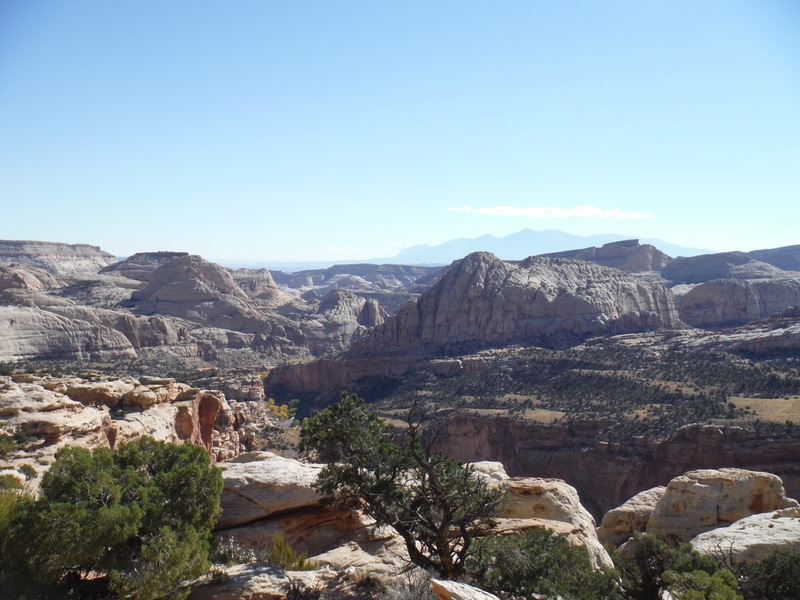 Early settlers and native people used to travel 100+ miles out of there way and around this rugged place just to go from southeast to southwest utah. It was impenetrable. 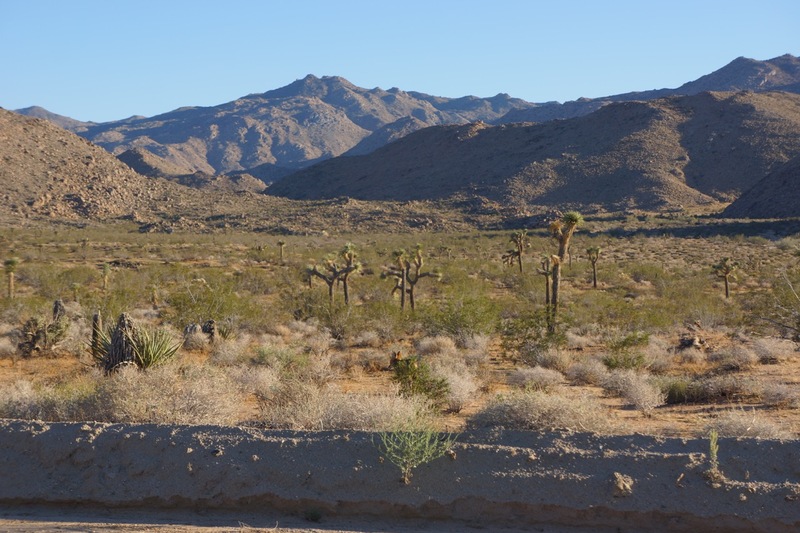 The park is pretty narrow (15 miles or so wide) but very long (well over 100 miles) and its main feature is a 100+ mile “anti-cline” or fold in the earth’s crust. It looks like a giant shard of the earth, stuck in the ground at a weird angle. 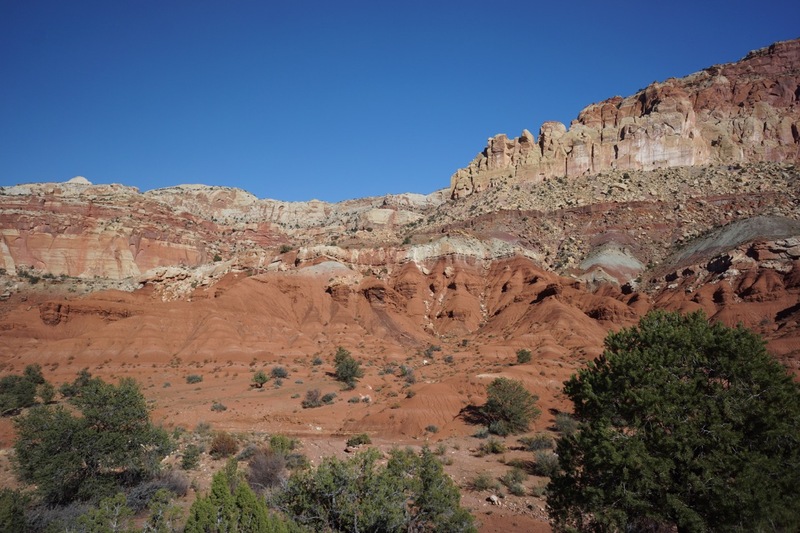 The pressure of the ancient geologic activity caused all kinds of neat earthen formations to appear, and multiple layers of colored rock to be visible, as if in a layer cake, whereas normally they would be hidden deep underground. 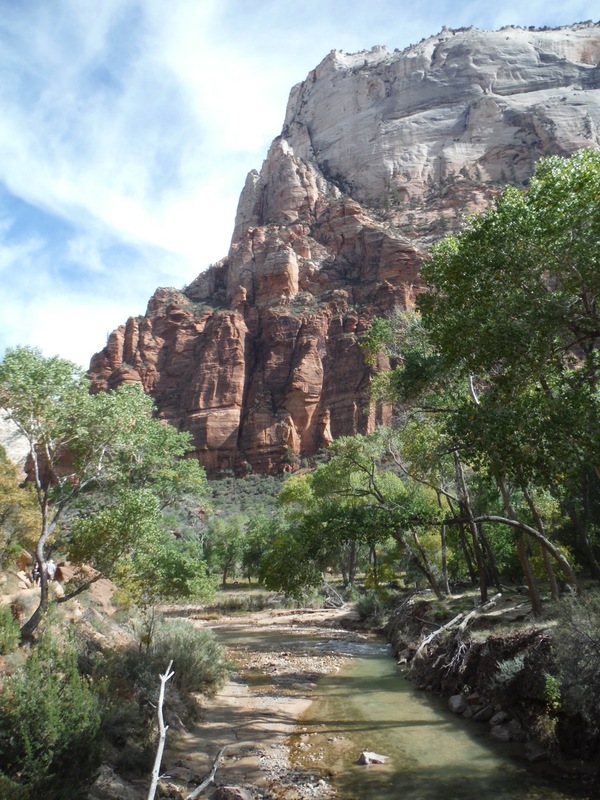 The “waterfold pocket” is another term used at the park. 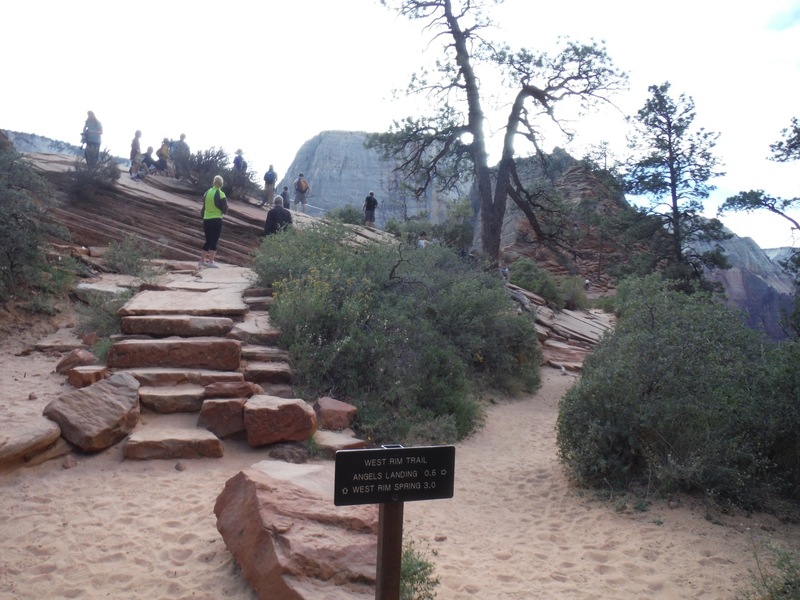 It represents large and small rounded dips in the stone throughout the park, that collect and hold rainwater in this otherwise dry climate. 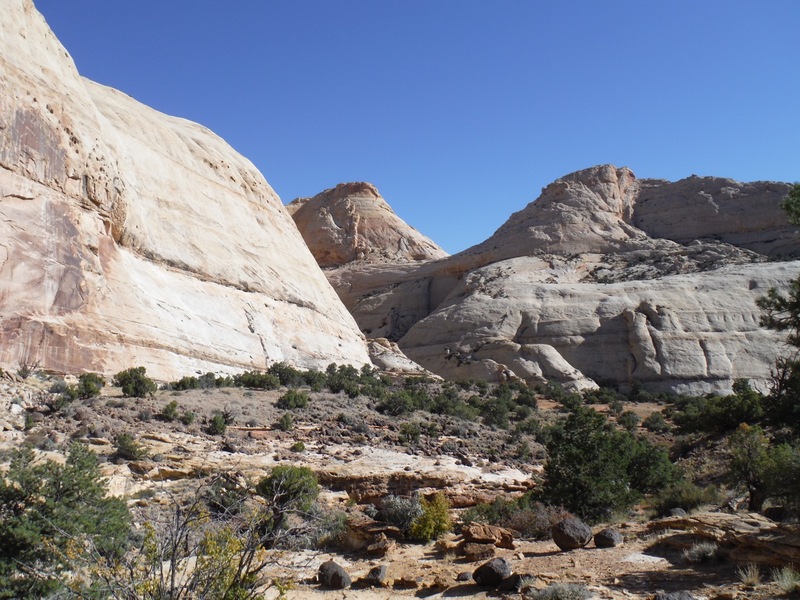 There are thousands of these waterfold pockets in the park (though you need to go hiking to see most of them) and they create interesting microclimates supporting all kinds of plants and animals. 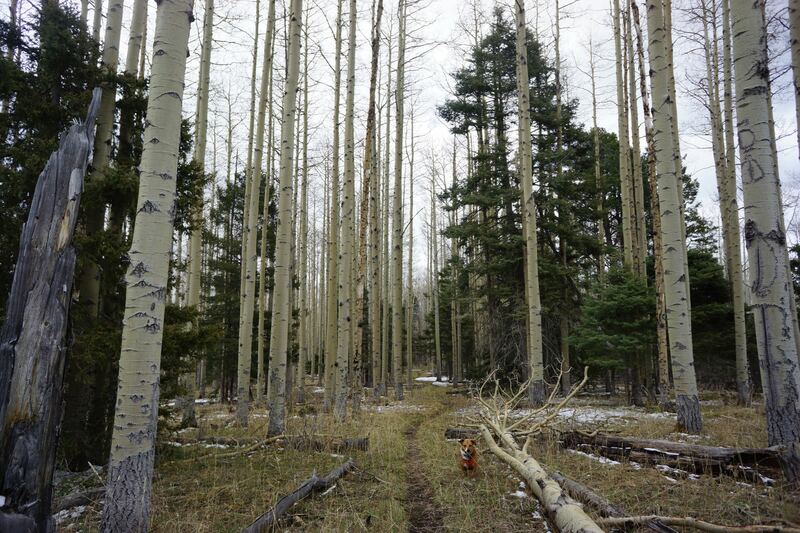 This would be a cool place to do a backpacking trip. 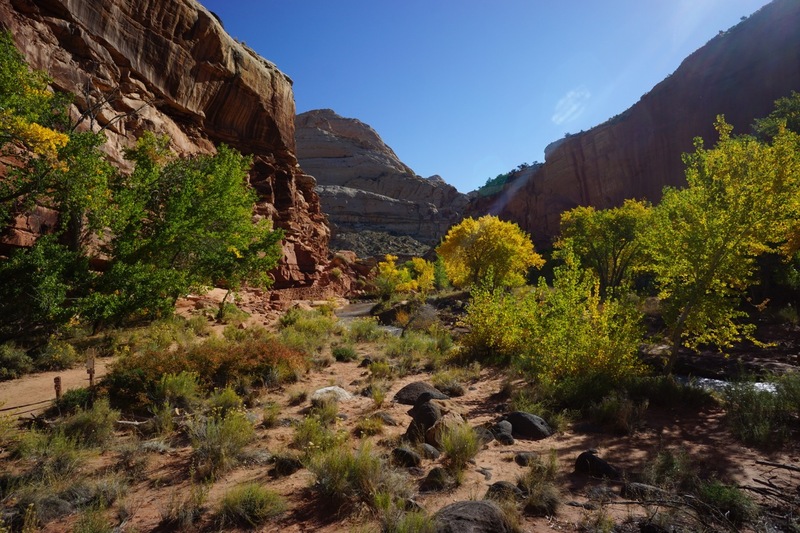 We liked Capitol Reef a lot. 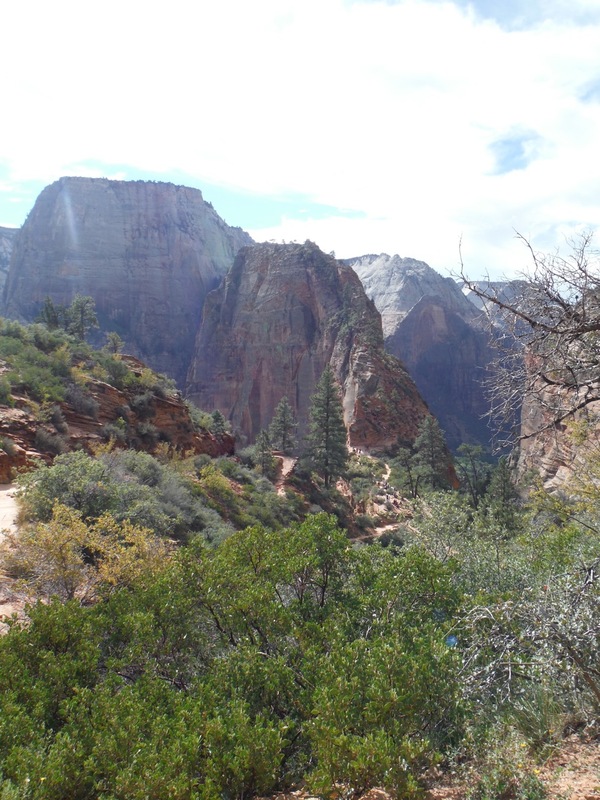 Unlike Bryce and Zion, there were hardly any crowds (though the sole campsite in the park was full when we arrived). The weather was warmer as well, which is a bonus when camping late in the season. During the summer, it would probably be too hot to deal with here. We camped at a private campground on the eastern side of the park, where we were one of only three guests in the entire place. 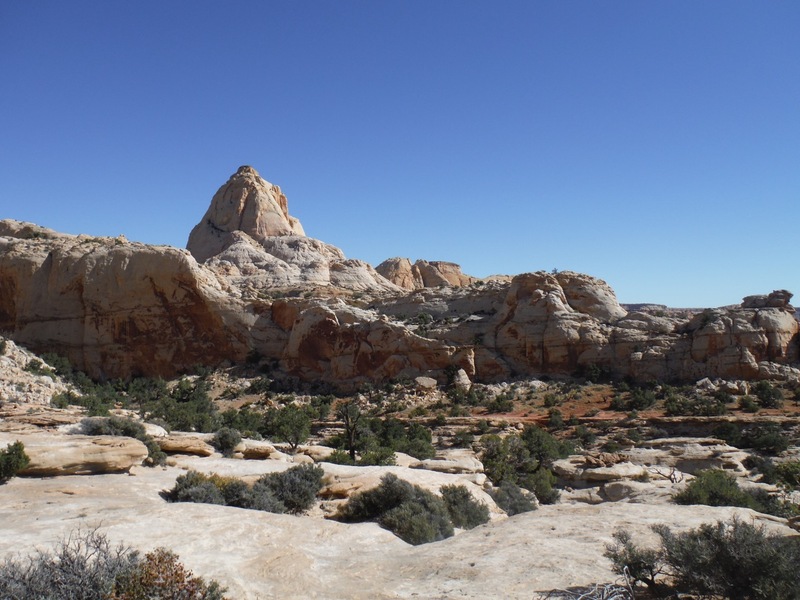 After a couple nights, we packed up and drove further eastward toward Arches National Park, just outside of Moab. 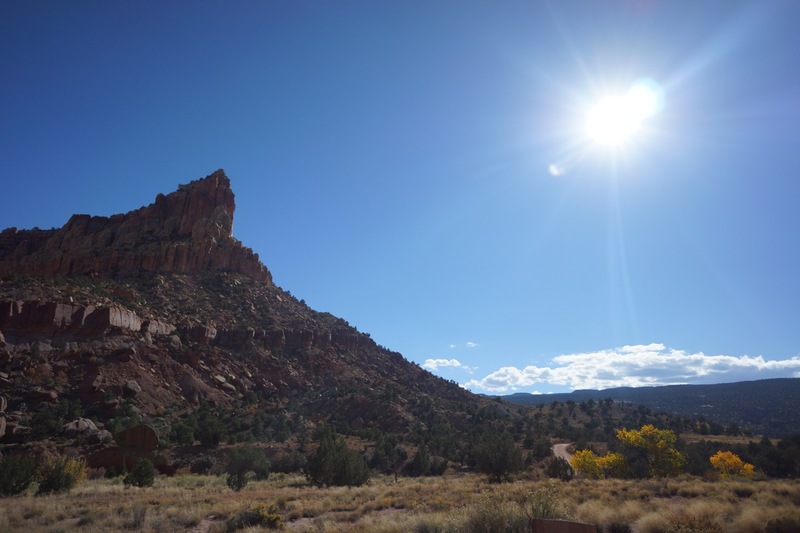 Bright skies at Capitol Reef National Park! Weather was warm and in the 70-80’s during the day, with lows in the mid 40’s. The trees were changing color. 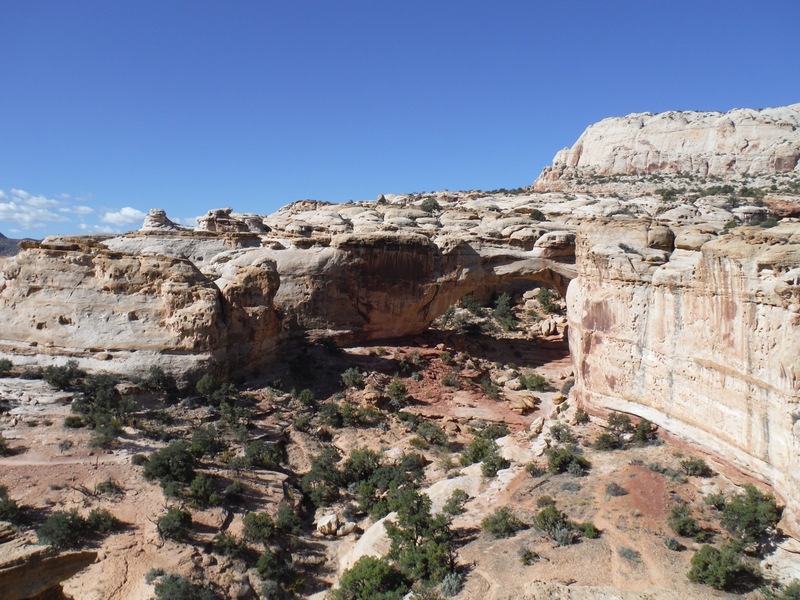 The hike we did, to a lookout over the valley and a natural stone arch. 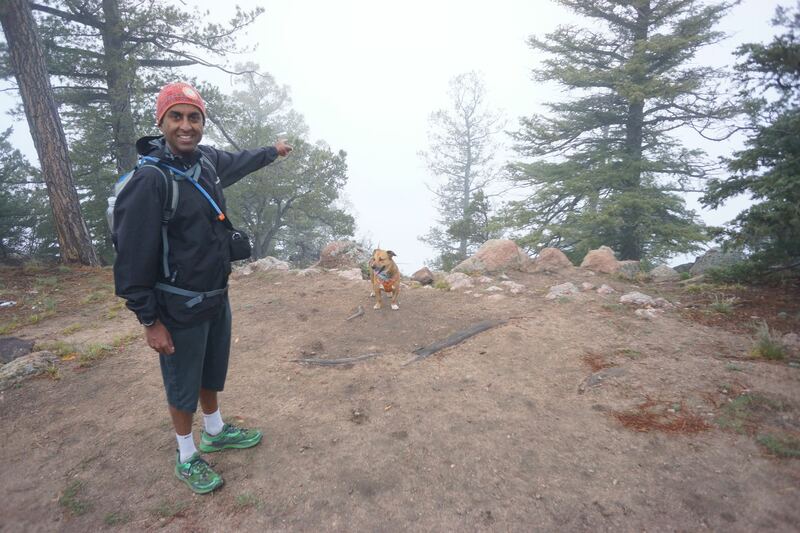 About 5 miles roundtrip and 1200ft of elevation gain. Remind you of the Capitol Building in DC? 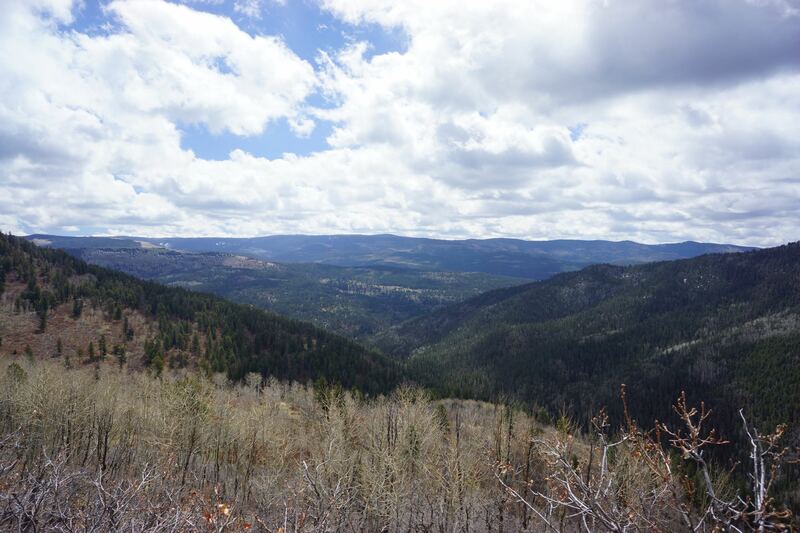 View while running up to the top of top of the canyon rim. The arch! 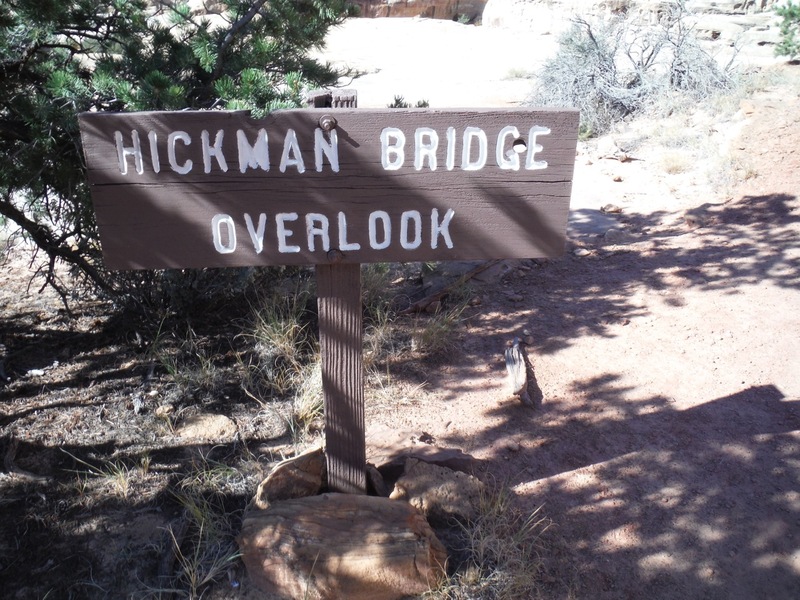 Technically, it is a “bridge” not an arch…Hickman Bridge. The tilt of the earth here looks like a Salvador Dali painting. 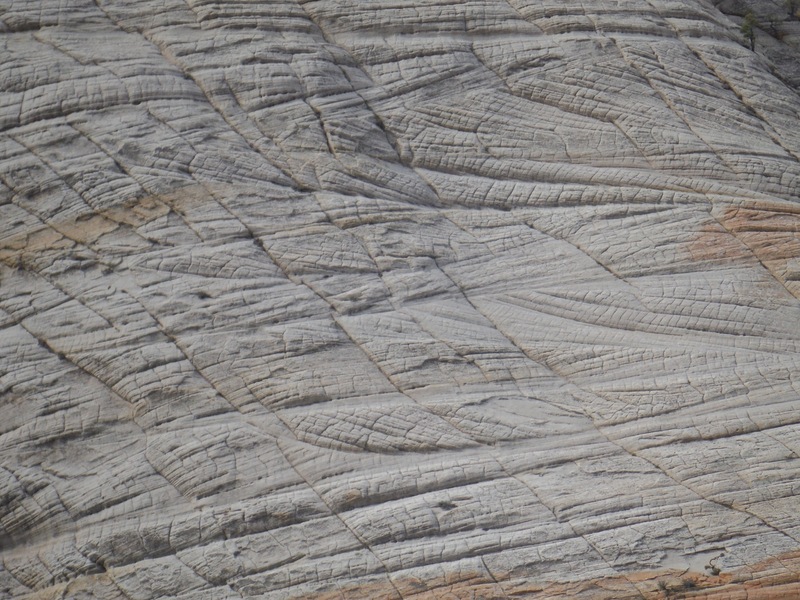 Look at all the weird shapes in the earth! 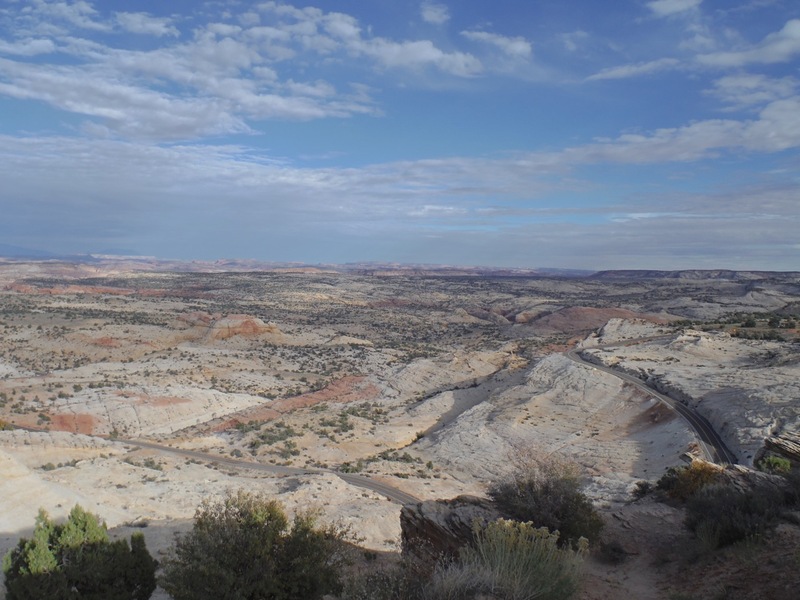 Partly caused by erosion of the Colorado Plateau (that covers most of southern and eastern Utah and West colorado) as well as the buckling of the earths crust that is unique to and visible in this park (called an “anti-cline”. Look at that! 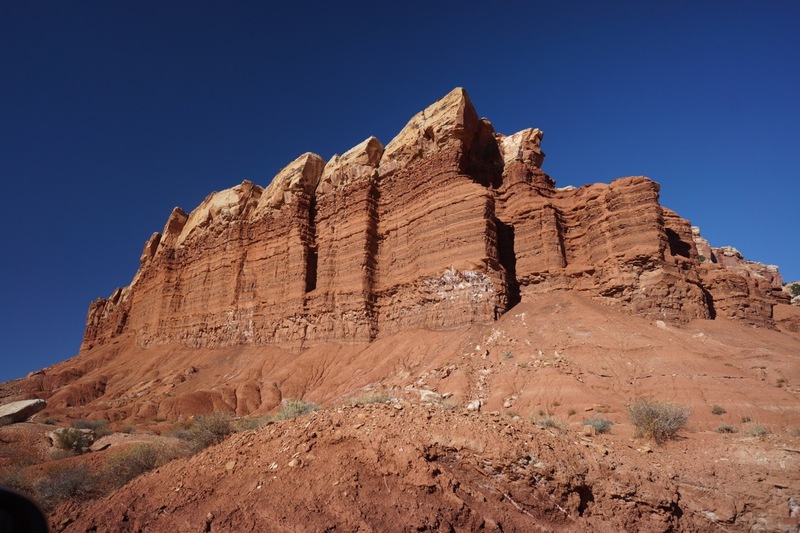 The earths crust sticking out at a weird angle….at first it just looks like a cliff, but it is more cool than most cliffs. 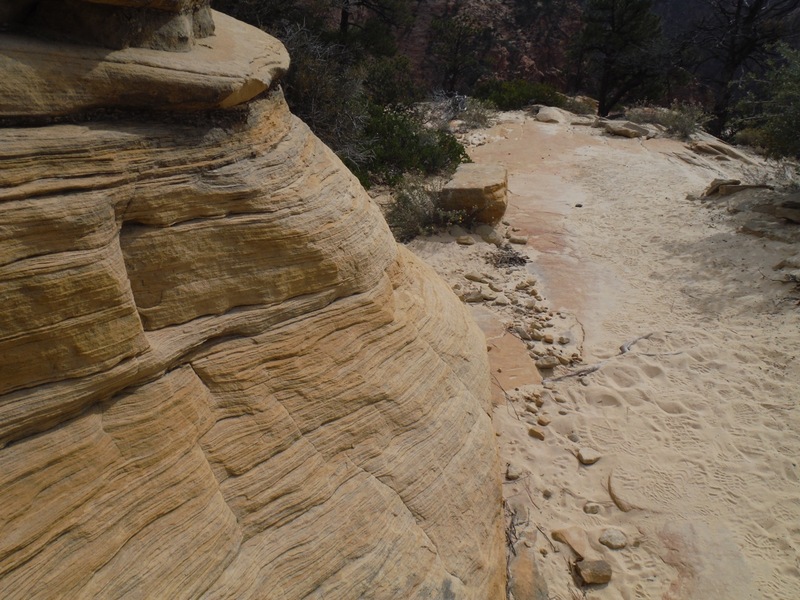 You can see a lot of different rock colors and types in once spot. View while driving the scenic road. 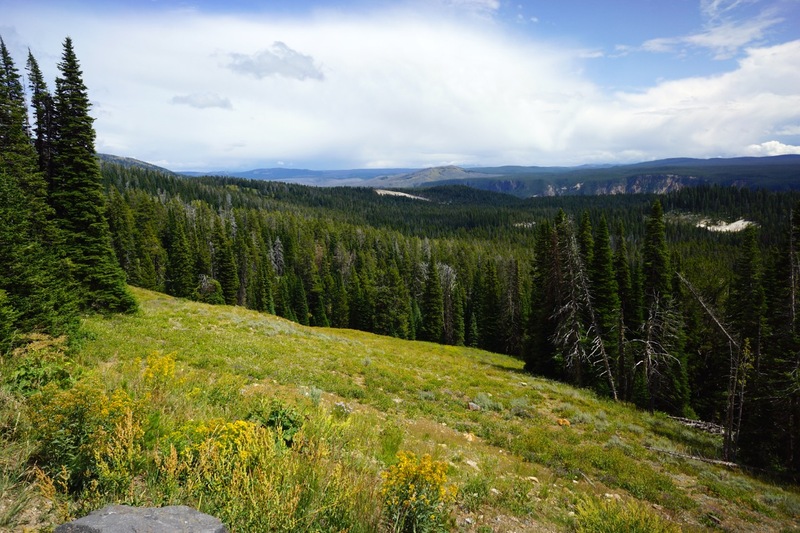 You only get to see a small slice of the park from the road, backpacking would be really cool here. We will do that on a future trip. 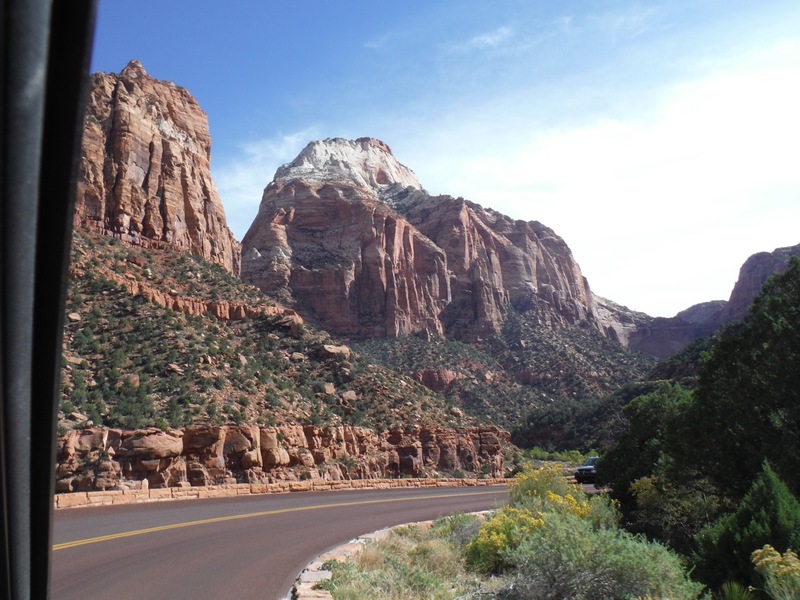 The end of the scenic drive through the park. There is a 4×4 road here that goes another 80+ miles….that jeeps go on (and supposedly was safe for any 4×4 car) but we didn’t want to risk it. 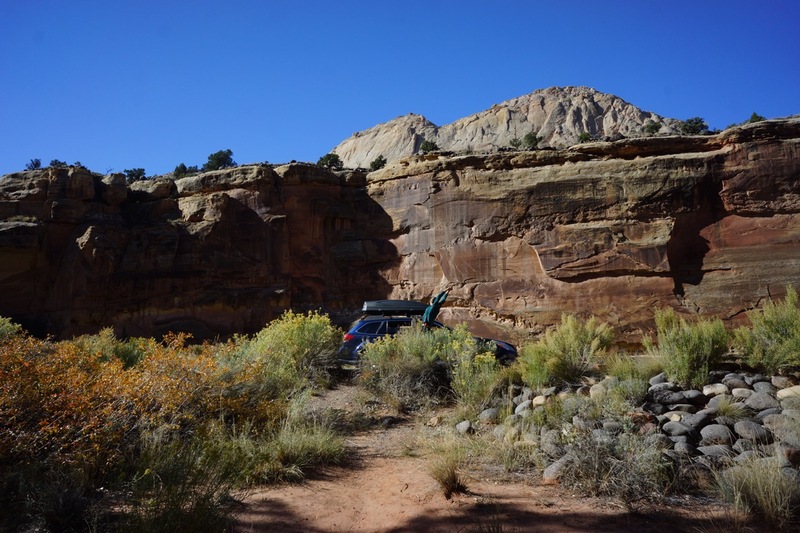 If you have a truck or rugged car, it would be worth doing. 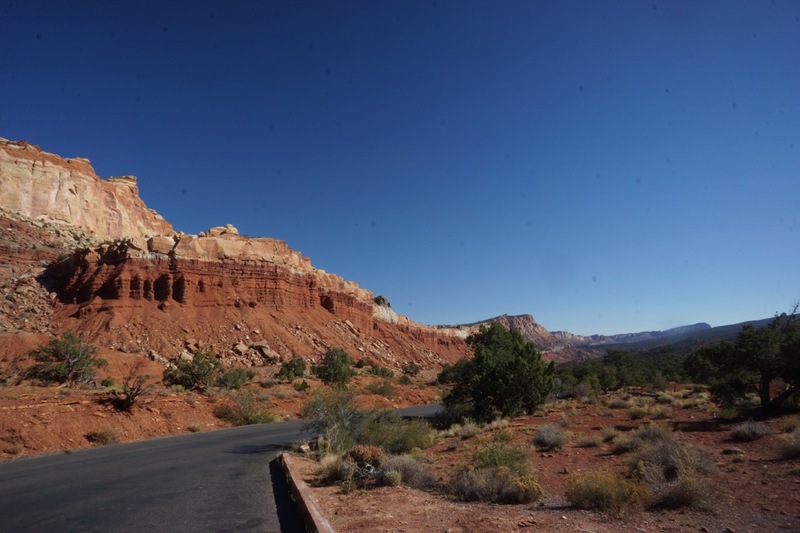 After Zion National Park, we drove the crazy scenic road to Capitol Reef National Park, with a slight detour to drive through Bryce Canyon National Park. 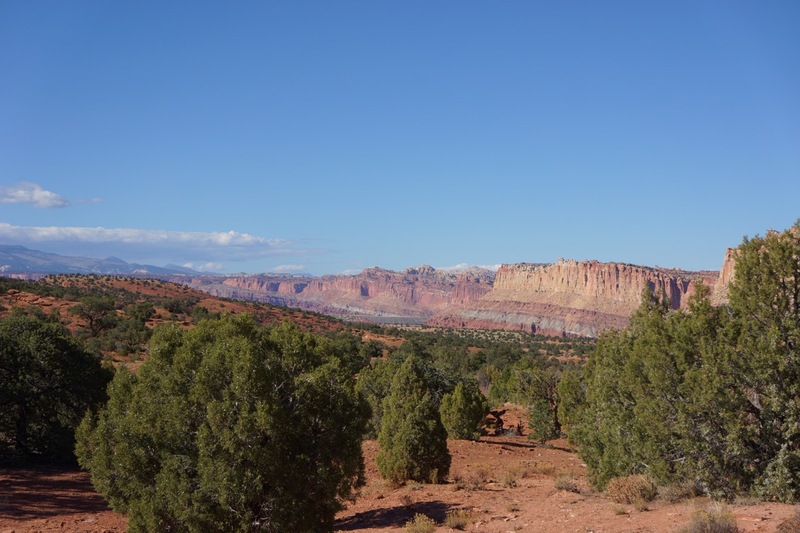 Bryce was at 8,000 ft elevation, and temps were pretty cold there (highs in the 50’s, low in the 30’s), so we opted to just check out the park by car and head over to the lower, drier and warmer Capitol Reef NP to camp for a few more days. 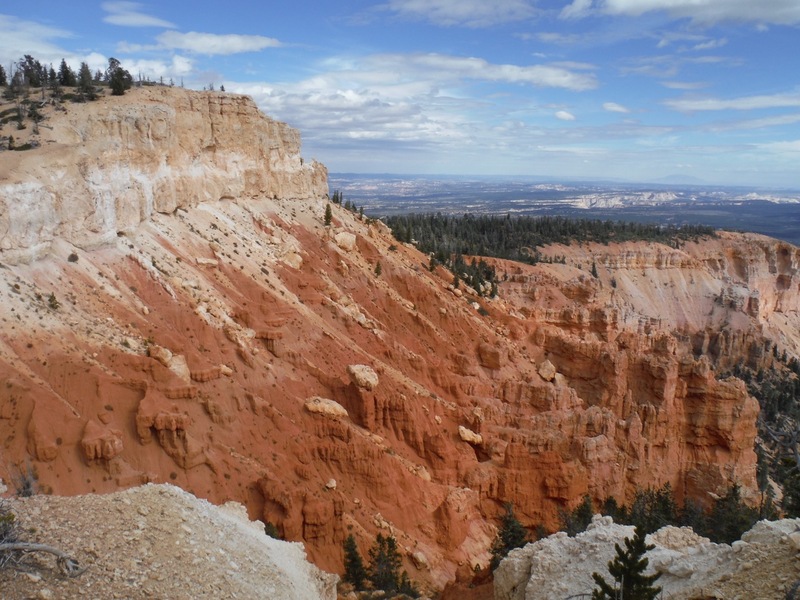 Bryce’s claim to fame, is heavily eroded orange sandstone, formed into “hoodoos” or tall spires. 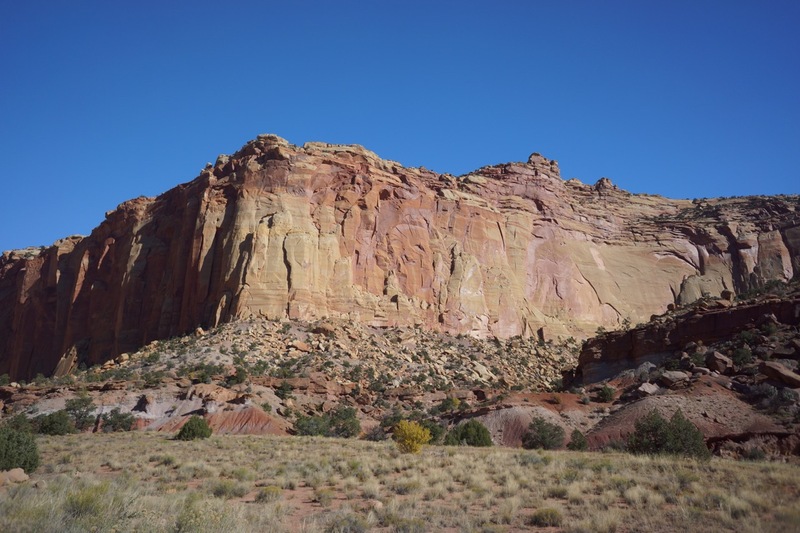 The cliffs have a sharp edge to them in many places, and the scenic drive travels on top of the cliffs along a flat mesa, affording epic views. 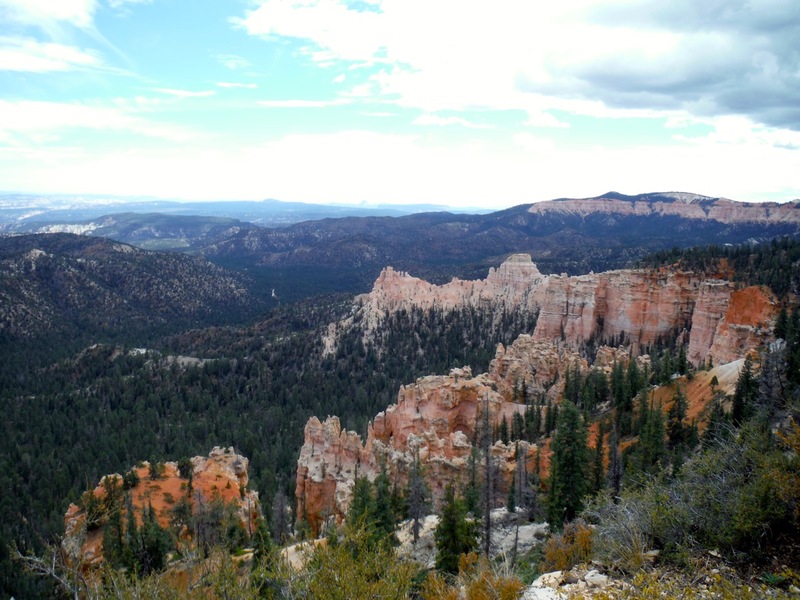 The drive out to Bryce Canyon was amazing…there were many miles of terrain like this…and the drive from Zion to Bryce and Capitol Reef National Parks is as pretty as the parks themselves. 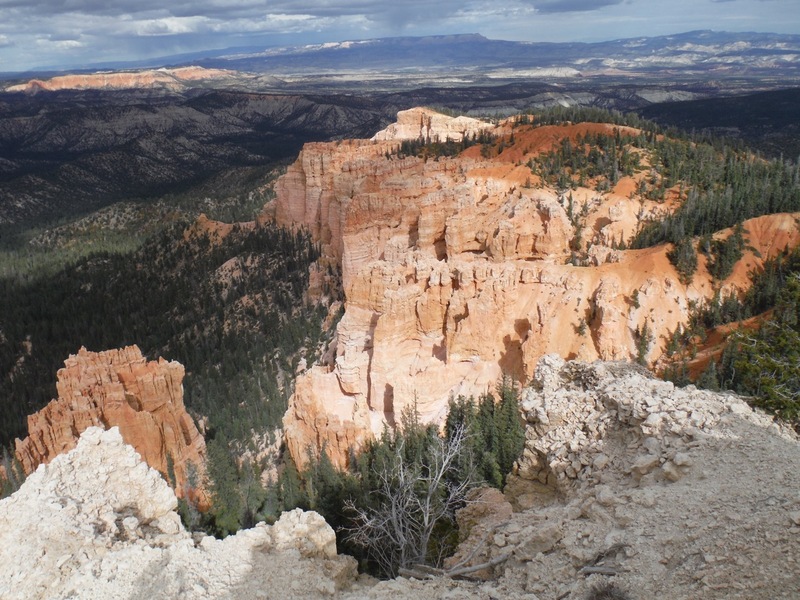 Drive out to Bryce Canyon. 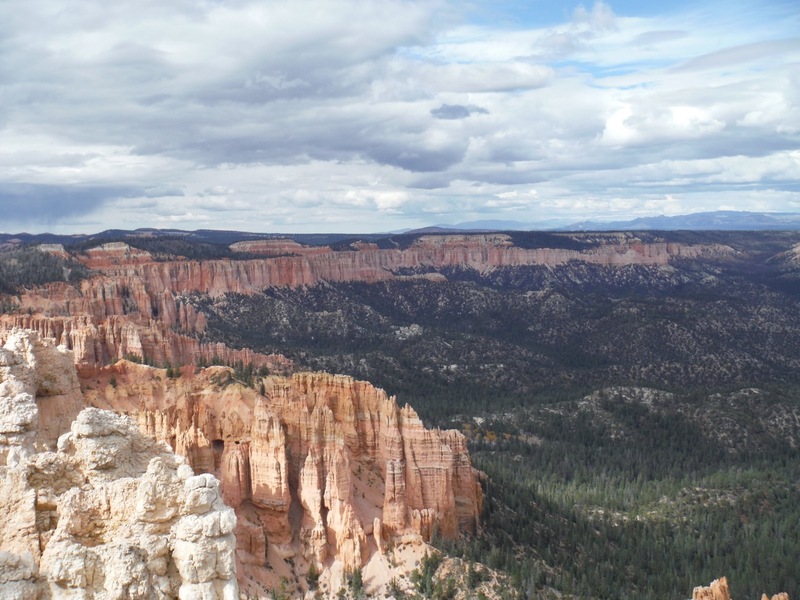 Looking off into the distance, from Bryce Canyon NP. 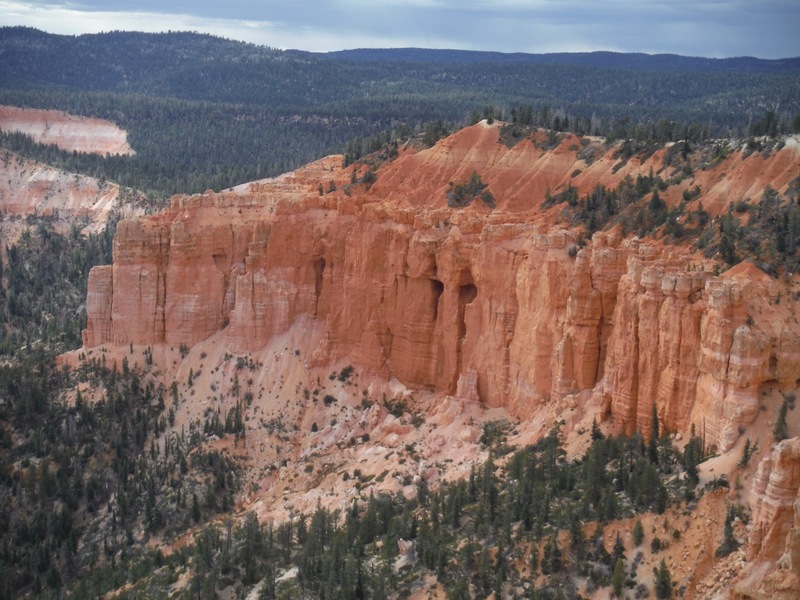 Notice the “hoodoos” or tall eroded spires in the sandstone cliffs. 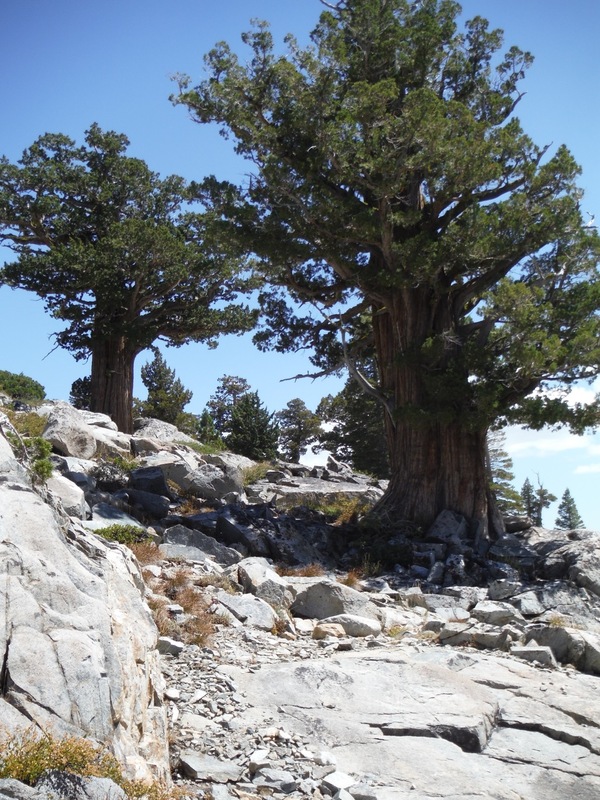 Bristlecone Pine tree – estimated to be 1500 years old! 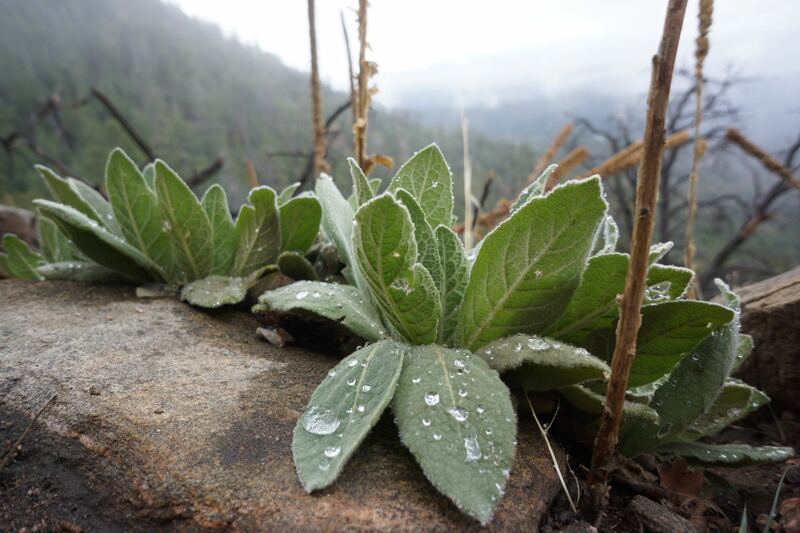 It looks dead, but it isn’t….they are remarkable survivors. 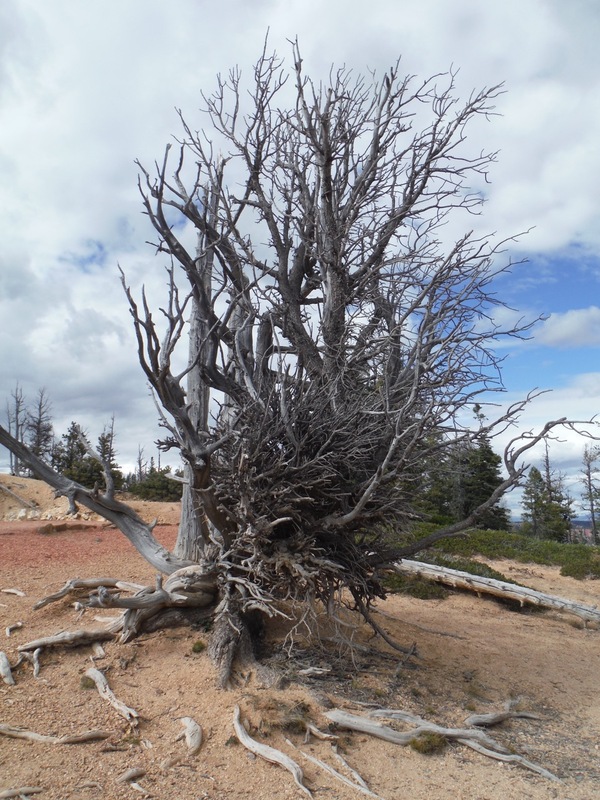 Even if the main trunk dies, a branch may assume the role of trunk and keep the tree going on living. 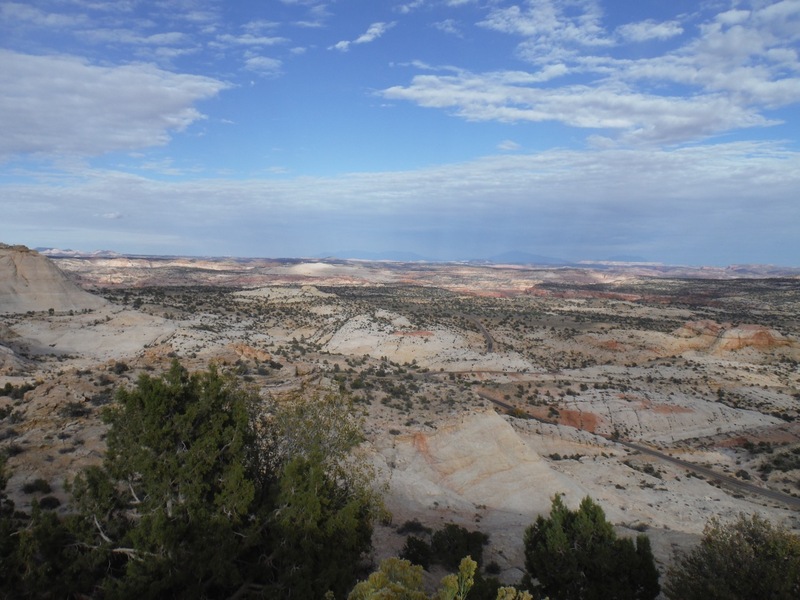 View as we left Bryce Canyon and headed to Capitol Reef NP. 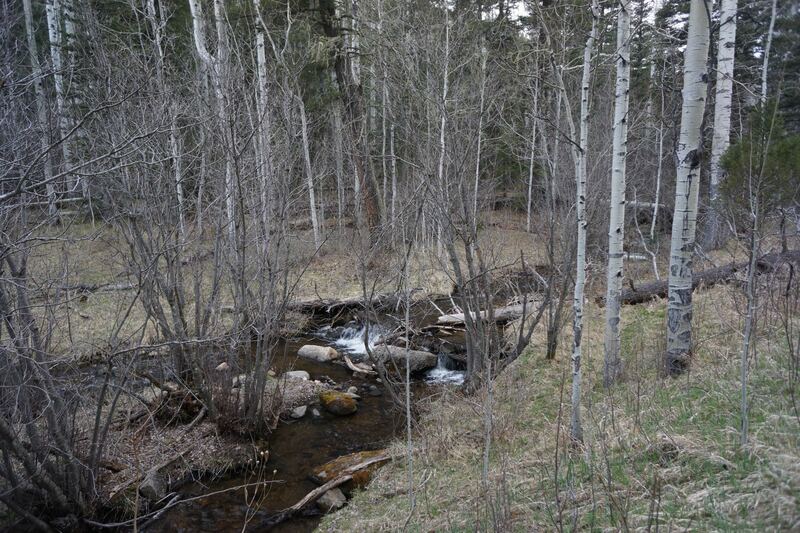 Check out the yellow line…that is a creek, lined by bright yellow Aspen Trees. 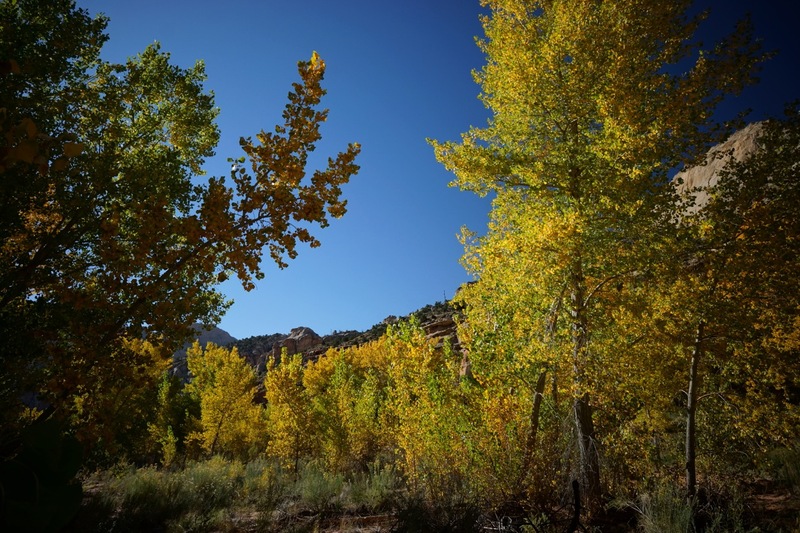 The colors were remarkable during our drive through Southern Utah…the Aspens were totally lit up! 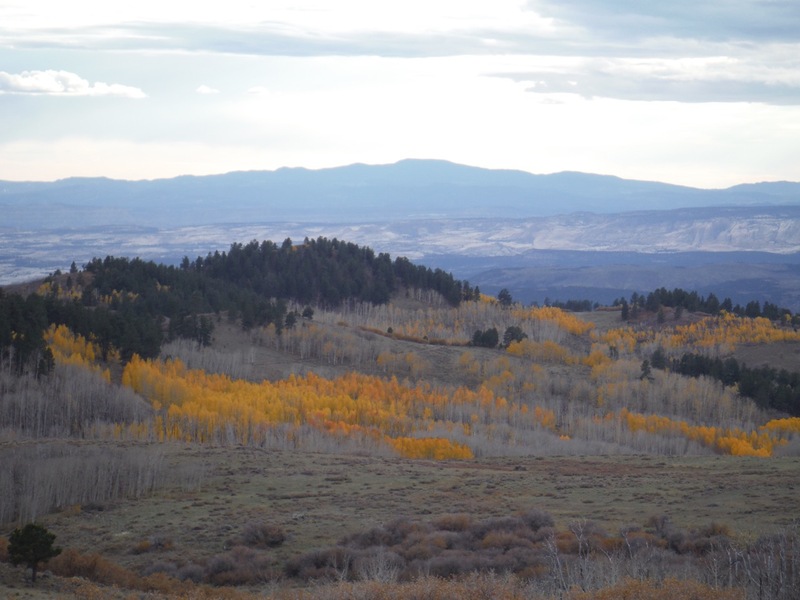 On the way to Capitol Reef National Park (after Bryce Canyon), we drove through the Dixie Forest, up to about 11,000ft over a mountain pass, all along the pass we had epic views of yellow Aspen fields like this. There were tons of deer all over the place as well. As if was opening weekend of deer hunting season, we moved quickly through this area (we saw a TON of people out hunting….some doing so right from the road via ATV!). October 15 – 17, 2014. Post by Ravi. 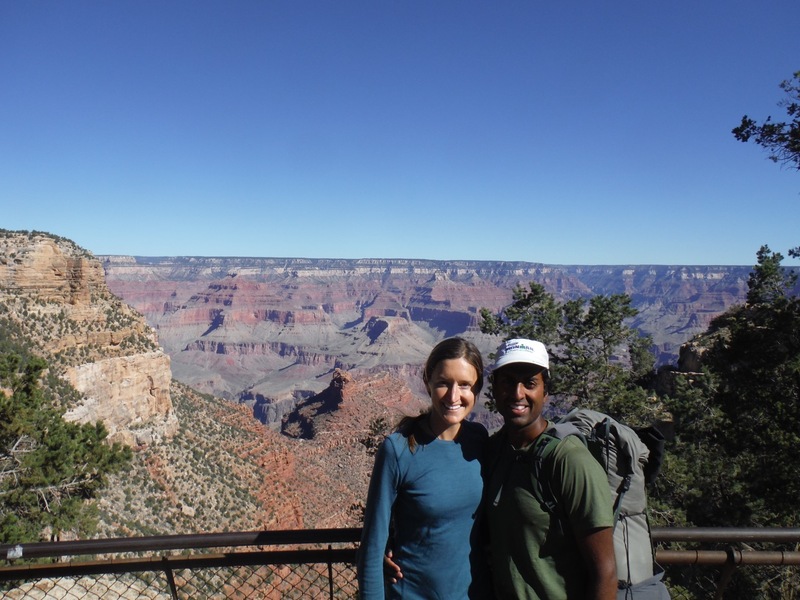 After our trip to the Grand Canyon, we were looking forward to continued warm weather. 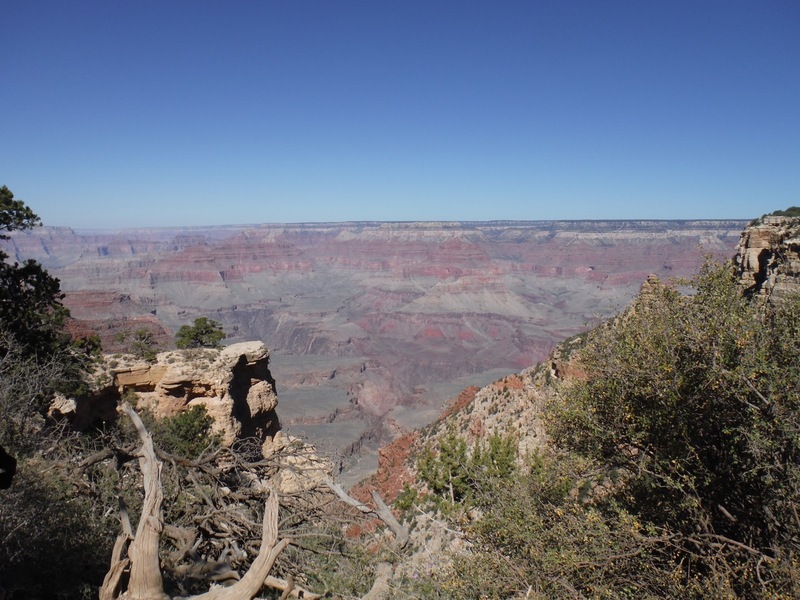 While it was hot down low IN the Grand Canyon, up HIGH on the Grand Canyon Rim was breezy and cold. 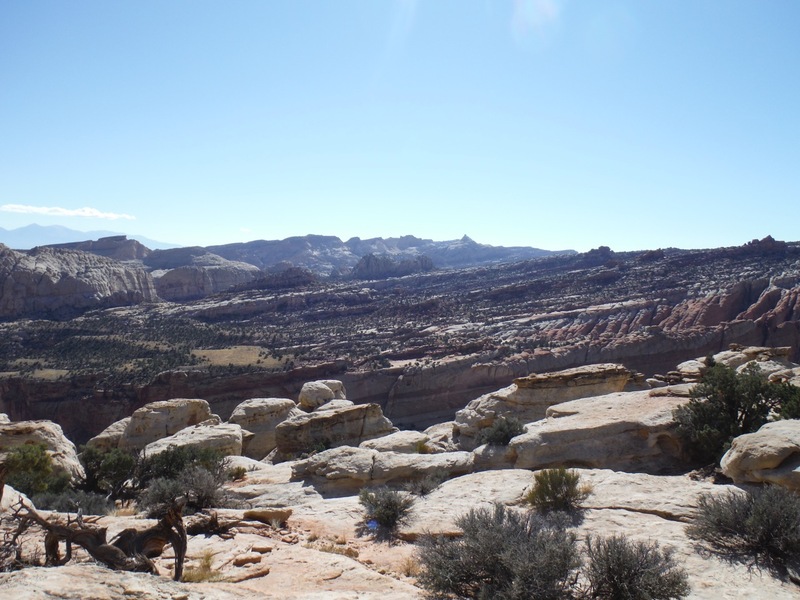 Our plan was to spend about a month exploring southern Utah, and its FIVE national parks! 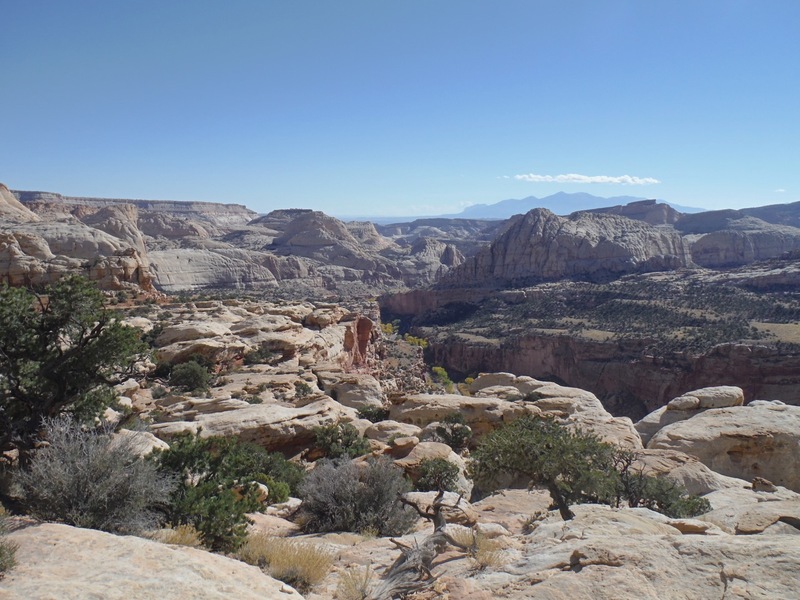 I never realized there was so much to do in Utah until I looked at the road atlas and saw all the green splotches (denoting National Park, Monuments and protected wilderness areas). We camped on the western side of the park, at a private campground that didn’t cost much ($15/night), had hot showers, plenty of space, nice scenery along a canyon wall, very slow Wi-Fi and a cool general store and cafe with wood fired pizza (it supposedly had the #3 best pizza in all Utah, according to whom I never found out). We ended up staying there four nights. 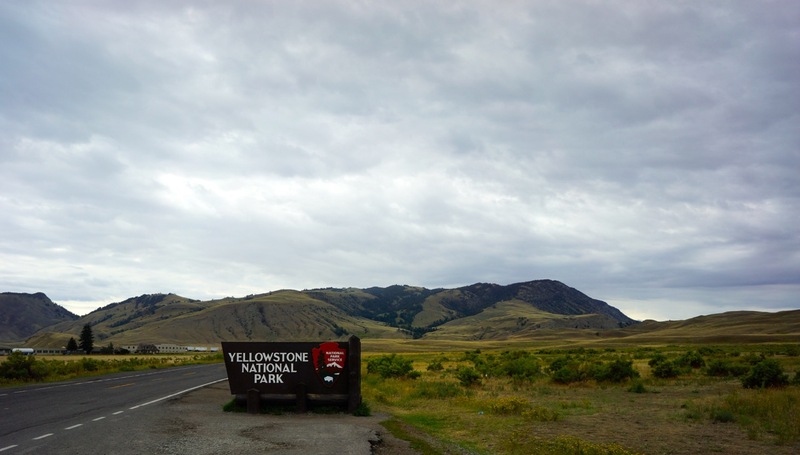 The campground inside the National Park was nice, but very crowded (and full when we got there), and we appreciated our showers (the park camp had none). Alison and I took turns venturing around the park, while the other stayed with the dogs at the campground. 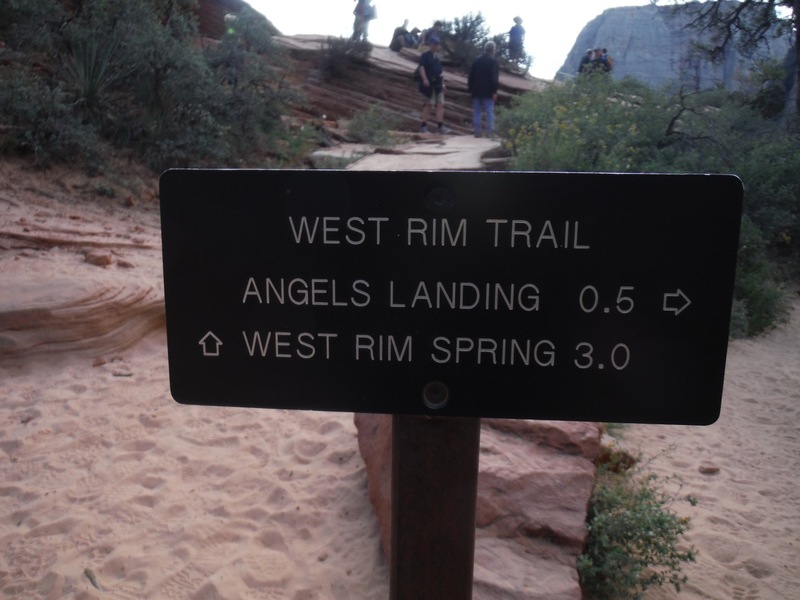 Neither of us did the “Angels Landing” hike, which is the #1 most popular hike to do there. 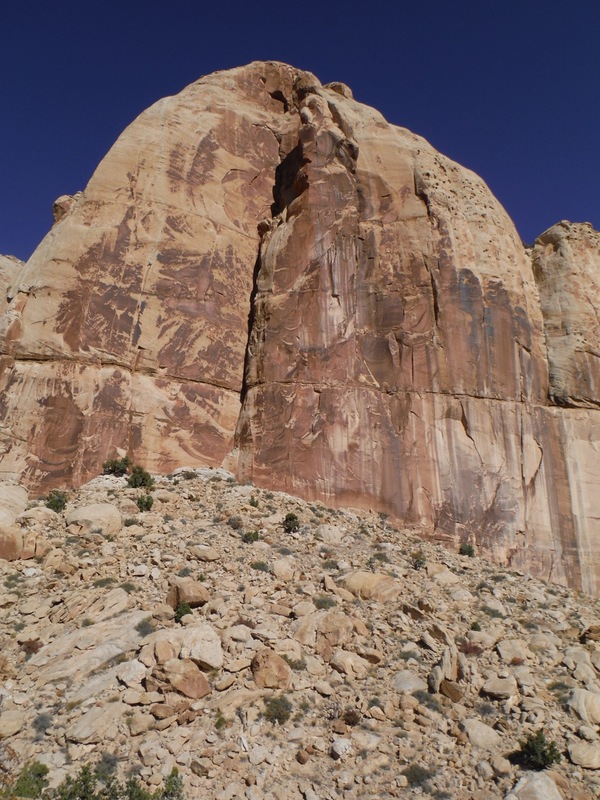 It is also a death-wish, as it proceeds along the knife edge of a sandstone fin almost a thousand feet above the canyon floor. 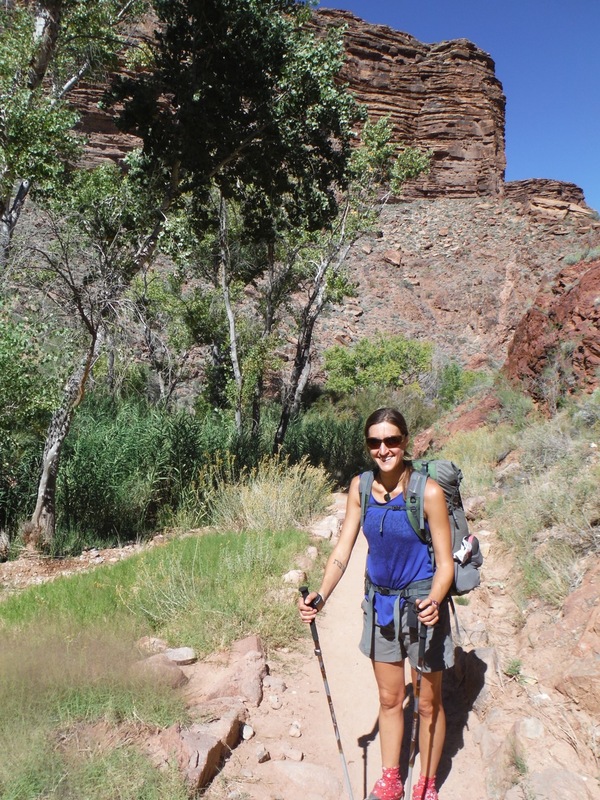 Lots of people do it, including people who shouldn’t (young, old, overweight, etc…), and worst of all, there was always a long line of people waiting to crawl along the trail sing a fixed rope…recipe for disaster. 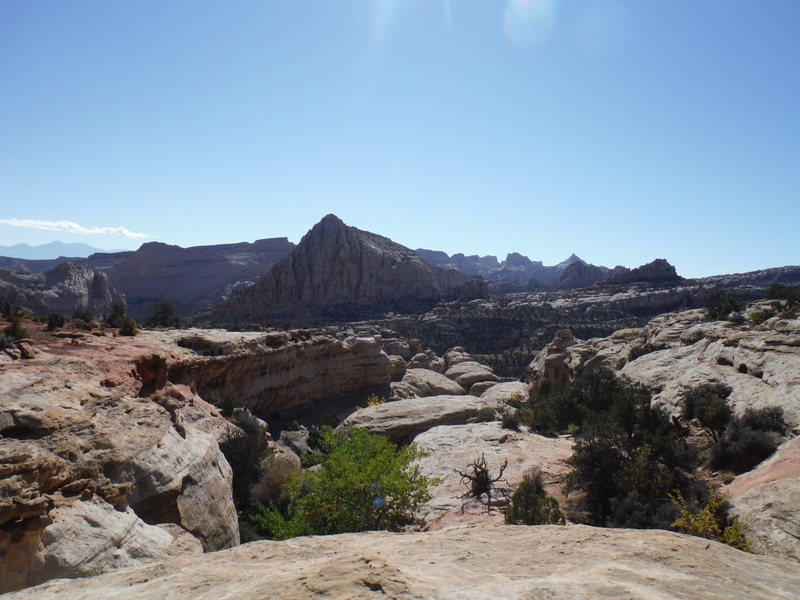 We both hiked partway up the trail, and watched the mayhem. Nobody fell. 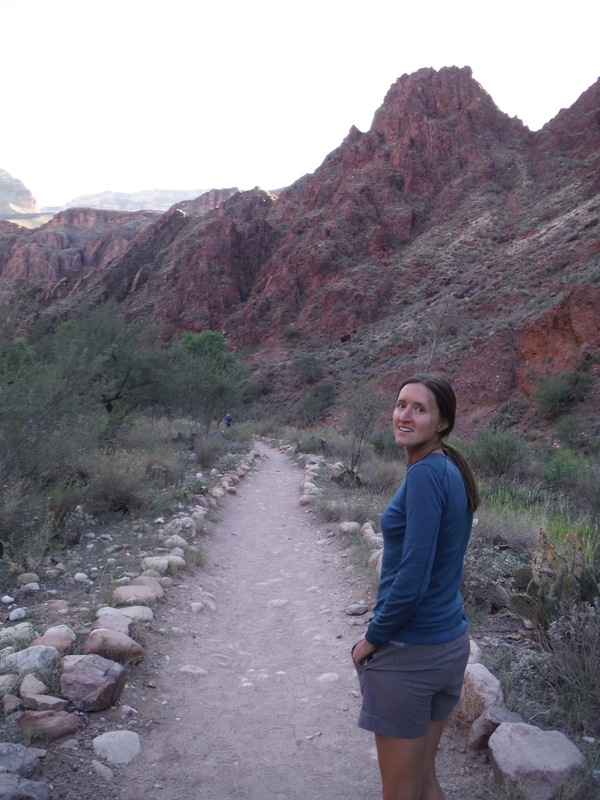 Alison ventured around several other trails, while I spent more time in the visitor center reading stuff and doing a longer out and back hike along the West Rim Trail. 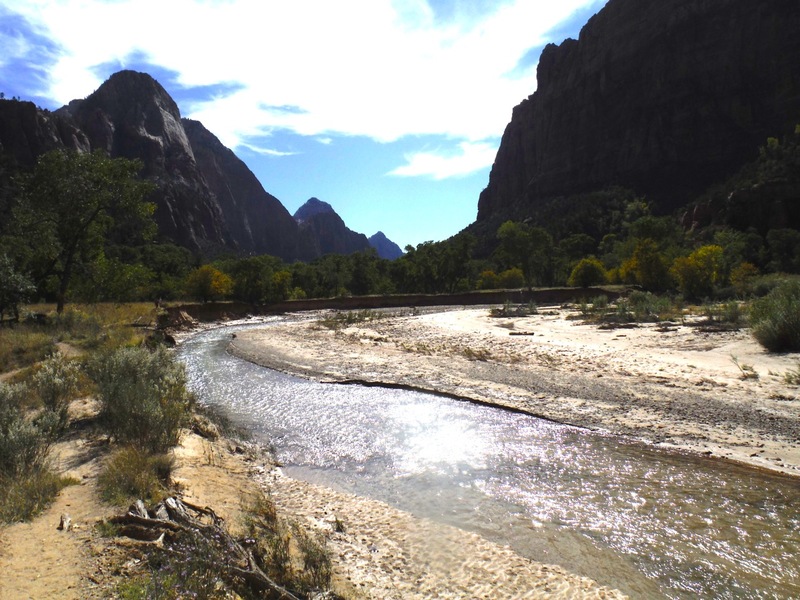 If we had our act together and got permits, we could have done the “Subway” or “The Narrows” hikes that take you through narrow slot canyons and involve wading and at times swimming along creeks….but we didn’t want to put the pups in a kennel and were quite turned off with the massive numbers of people crammed into Zion. The shuttle buses (which you pretty much need to take to see the park, as the canyon road is closed to cars) are packed all day, and the trails are just the same. 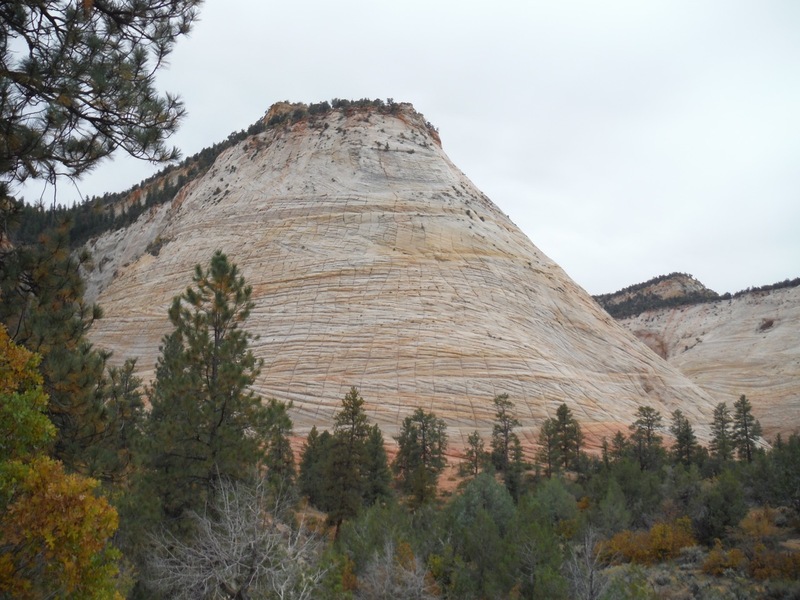 There are parts of Zion that are peaceful, but you will need to hike into the backcountry to find it (or go to the Kolob Canyons area in the northwest corner of the park, about an hours drive from the visitors center). 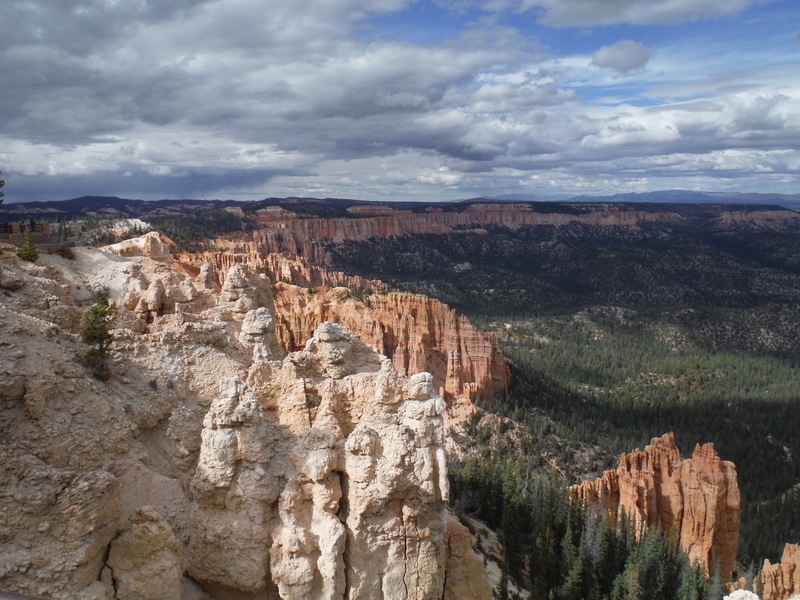 After three nights and four days, much of which was filled with relaxing at the campground, we packed up and headed off for Bryce Canyon National Park and Capitol Reed National Park. 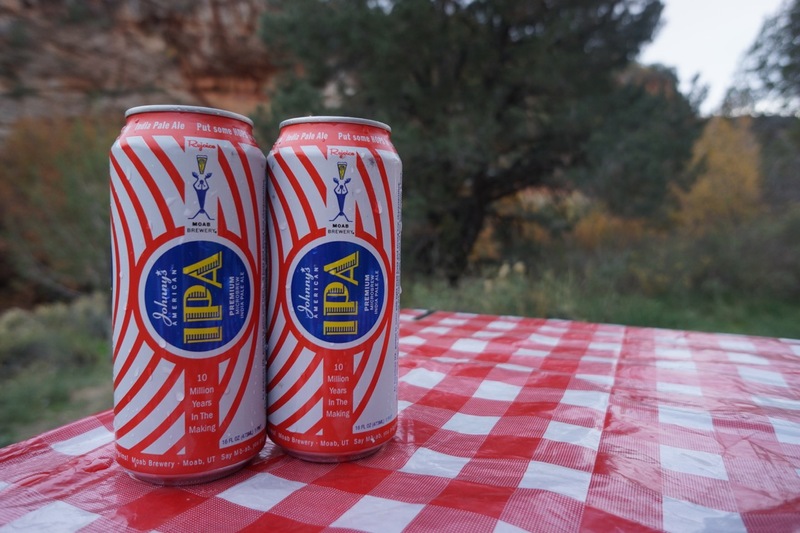 It is tough to find good beer in Utah, with their strict liquor laws…but Moab Brewery IPA was a solid choice…though it is limited at 3.2% alcohol when purchased at a grocery store. 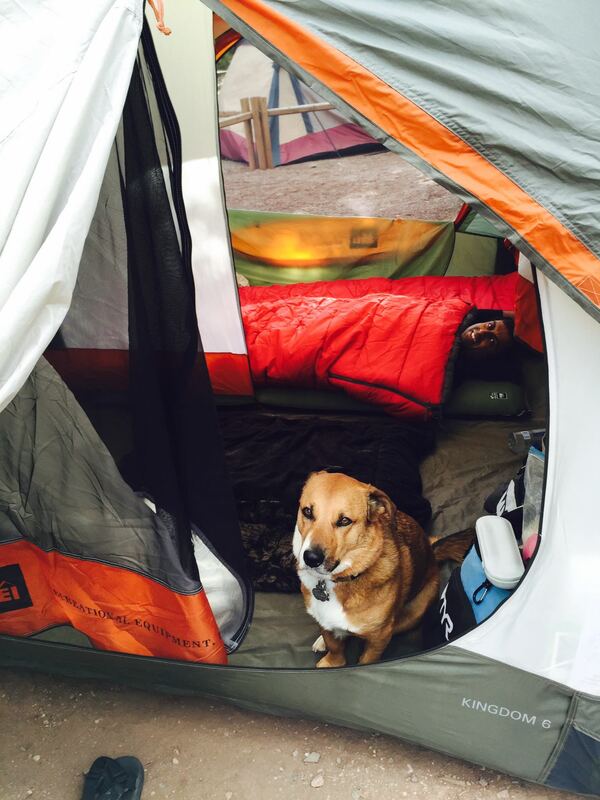 Duke rolled up in his “taco”…a combo of blankets to keep him warm at night! The temps would dip down into the mid 30’s at night. 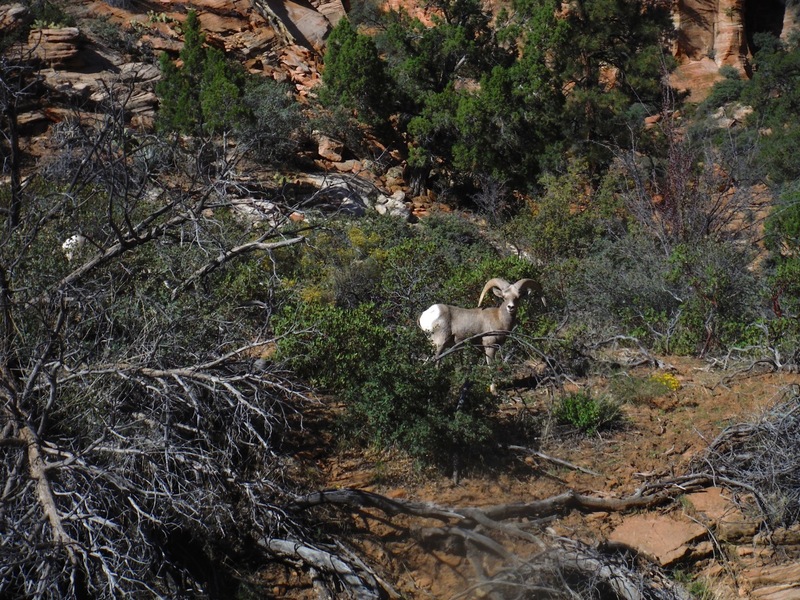 Alison spotted this Big Horn Sheep while driving out the east side of the park! 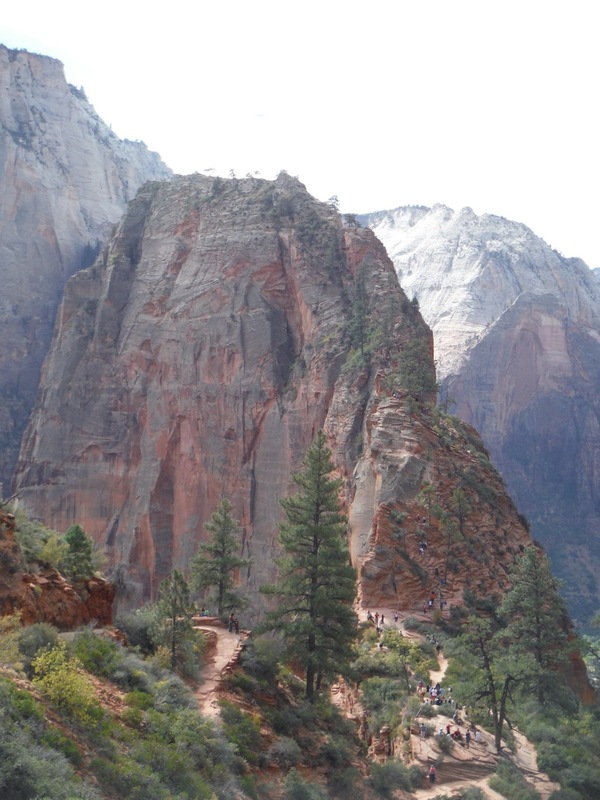 Crazy crown of people waiting to go up the final mile of Angels Landing….some crazy parents went up there with 5-7 year old kids. 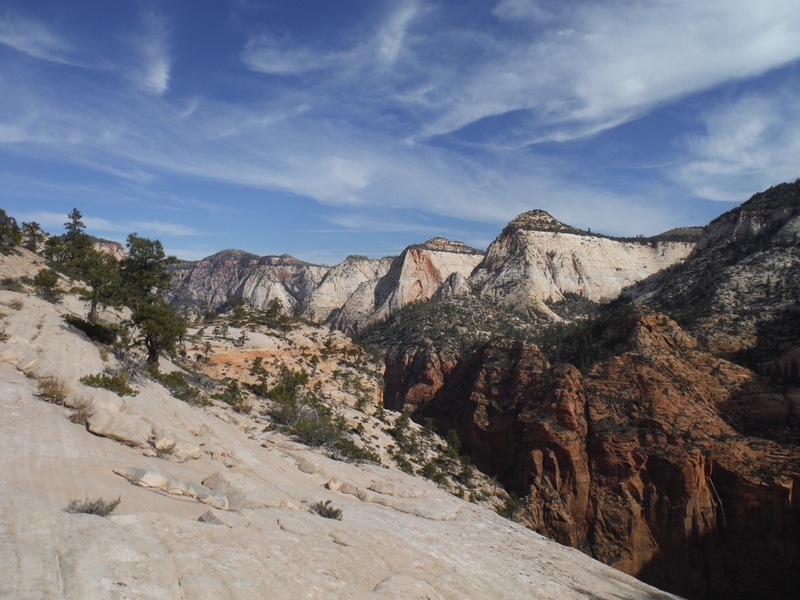 Lots of switchbacks going up to Angels Landing…the first two miles are an uphill slog, then the trail branches out to a death-defying traverse….neither Alison nor I chose to do that….we just hiked to the junction and watched the crazy people clamber out to the edge….and also many turn around! 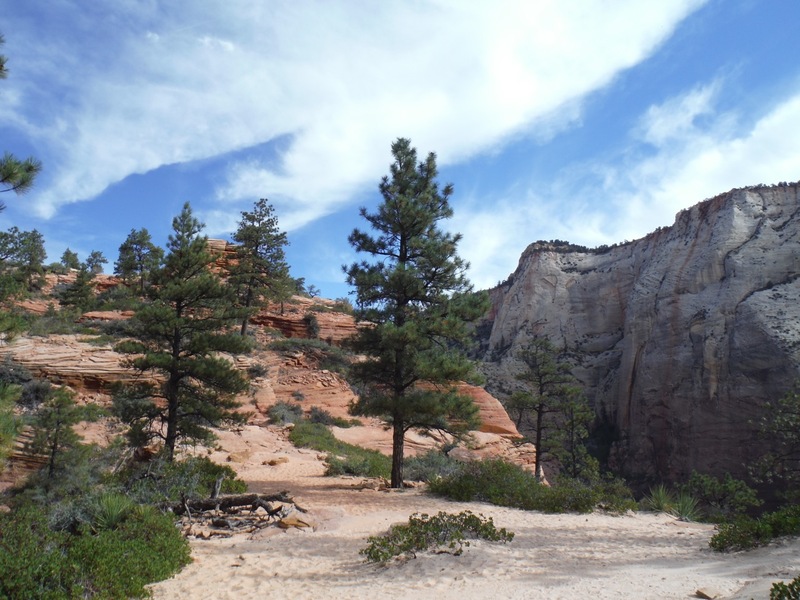 Hiking along the West Rim Trail, past Angels Landing turnoff. 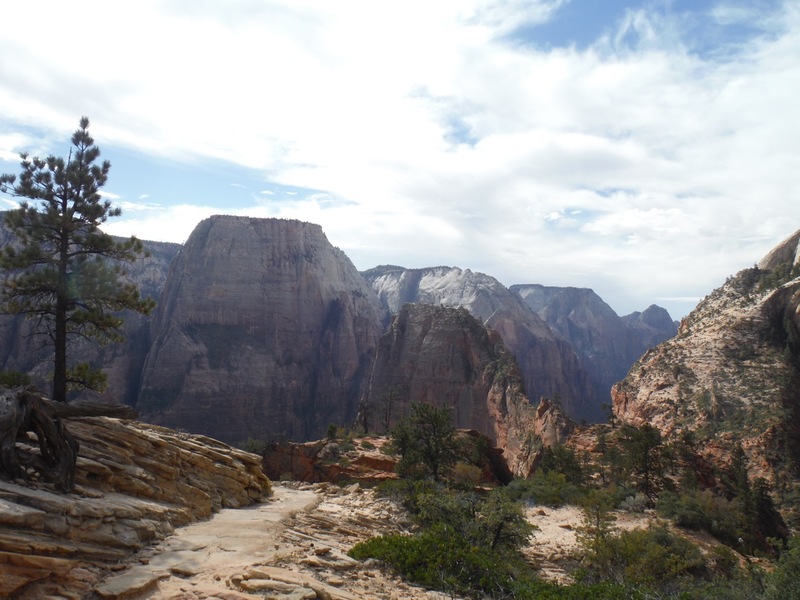 Past the Angels Landing Trail is the West Rim Trail….with very cool scenery and hardly any crowds. 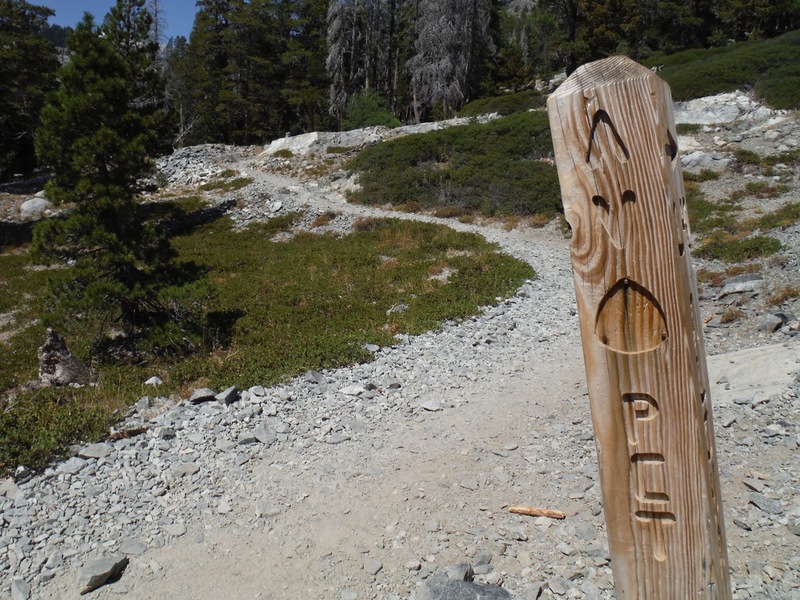 Lots of people were backpacking from the northwest corner of the park to the main park area along this trail. 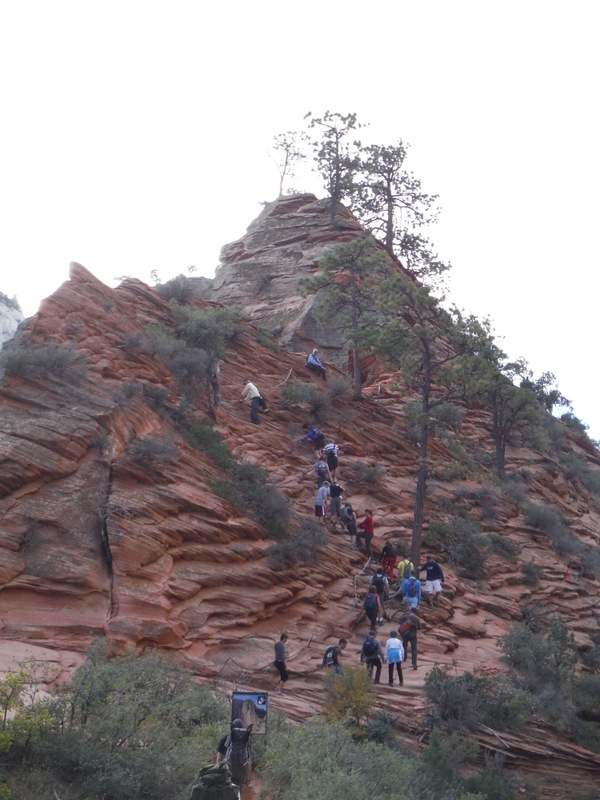 Look at the line of people going up Angels Landing! Disaster waiting to happen if you ask me. 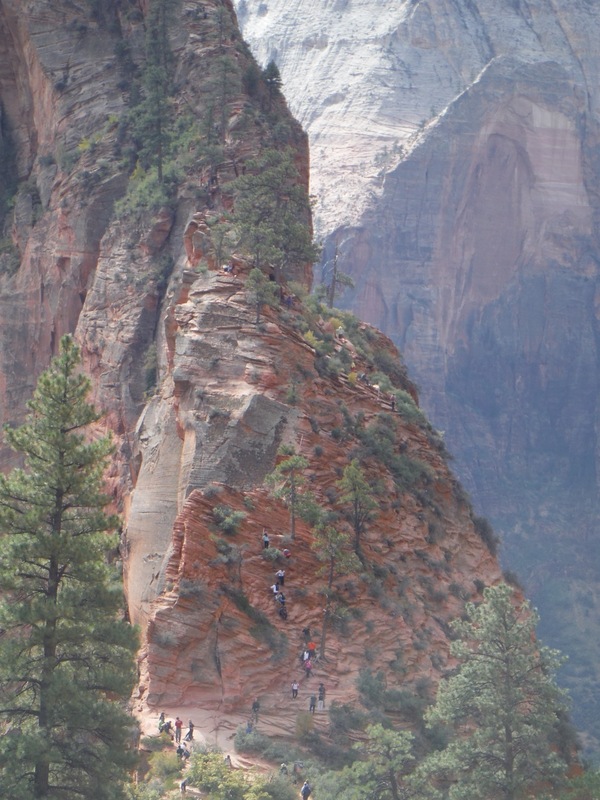 Look closely to see the line of people waiting to go up the final half mile of Angel’s Landing. 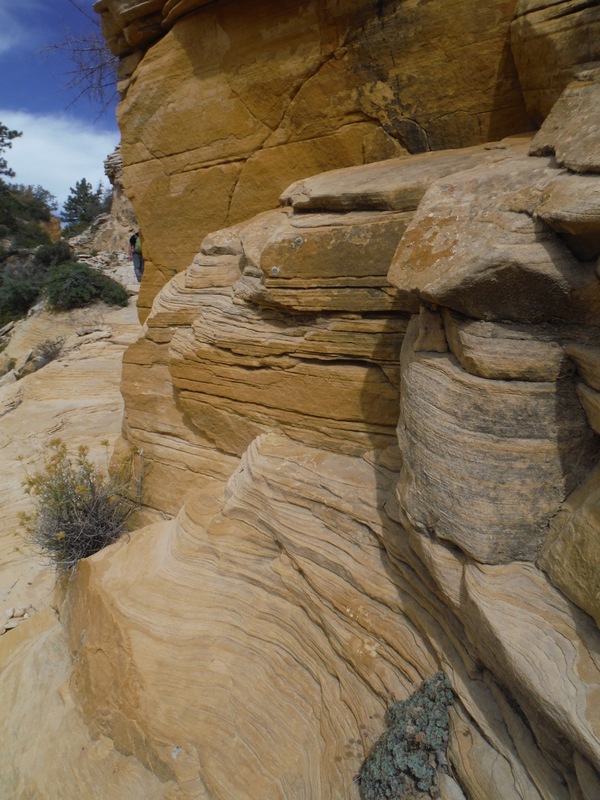 Polished sandstone along the West Rim Trail. 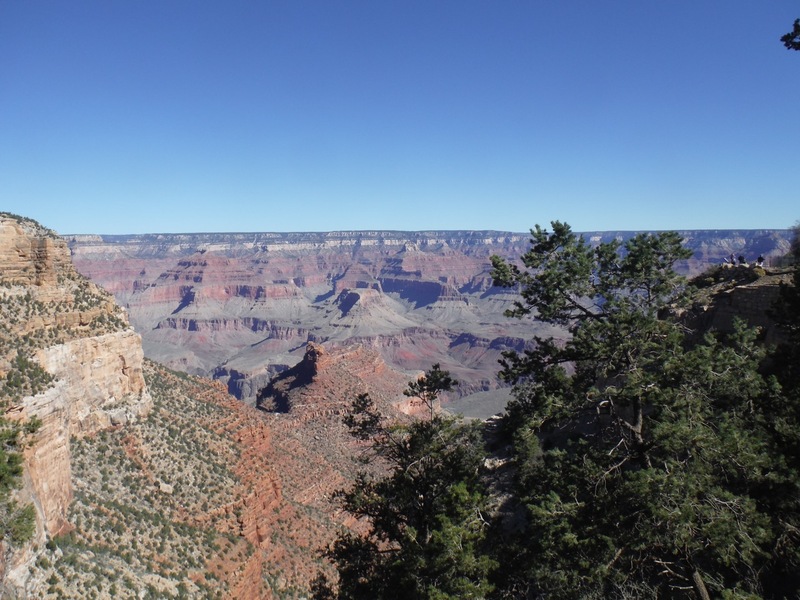 Cool canyon vista along the West Rim Trail. 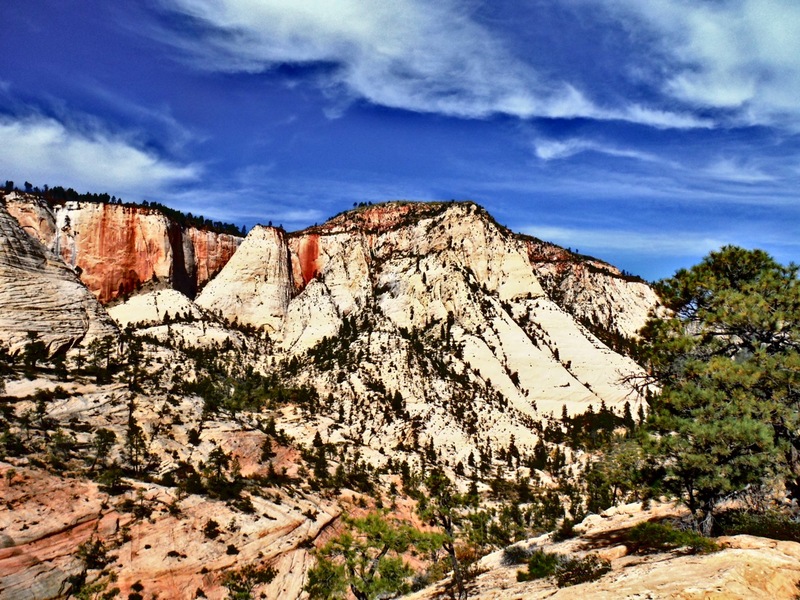 Reminded me of Yosemite’s rounded domes, but with streaks of orange and red. 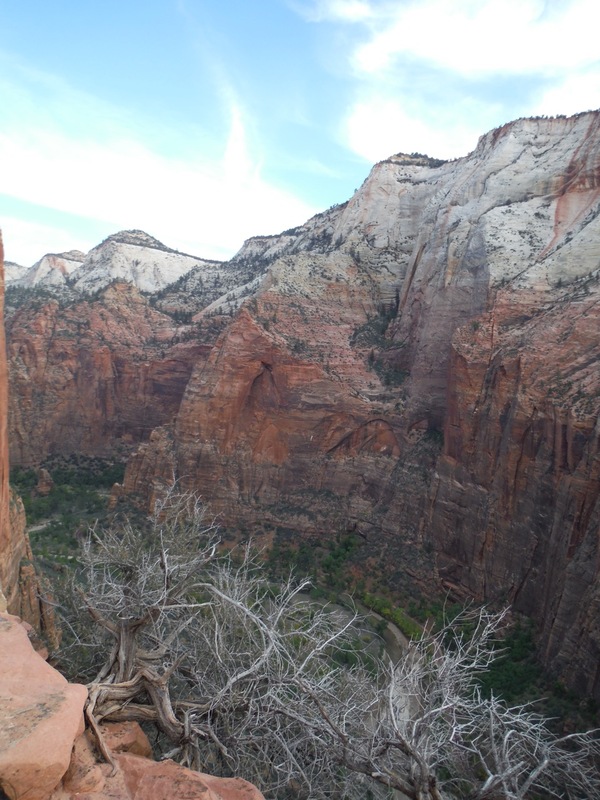 Looking down into the canyon, after walking a mile up the Angels Landing Trail. 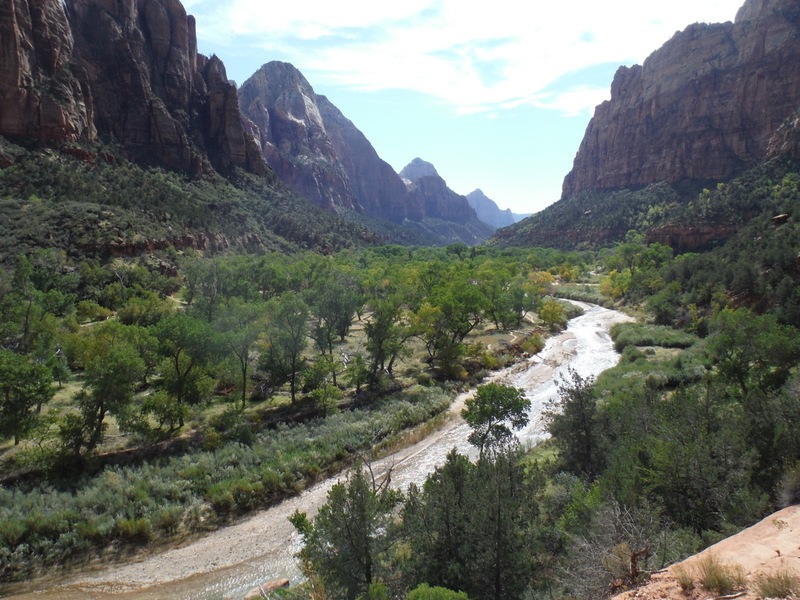 A strong flowing creek traveled through Zion Canyon, amazing to think that this stream, over a million years, has carved out this entire canyon. October 10 – 14, 2014. Post by Ravi. 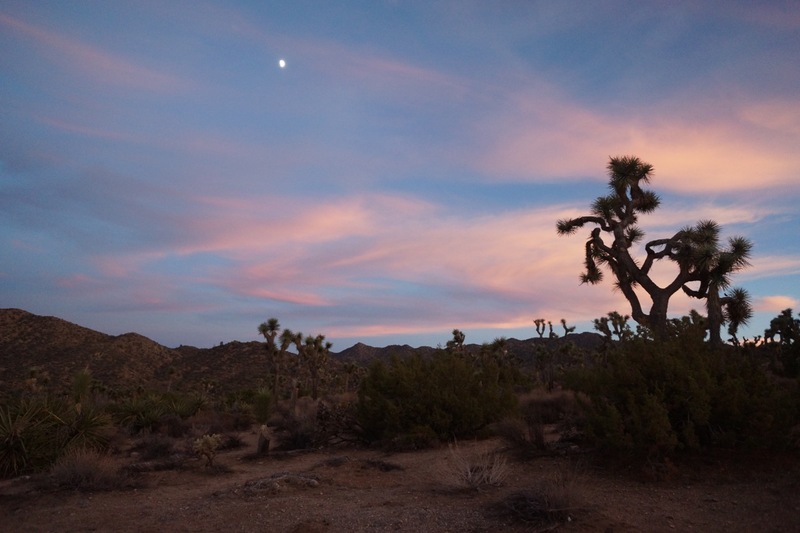 After a sunburned and sand scrubbed four days in Joshua Tree National Park, we made our way across the desert to Phoenix to visit Alison’s Grandma, and then up to Sedona, AZ for a few nights to explore that quirky little town full of crystal shops and mysterious energy vortex’s. 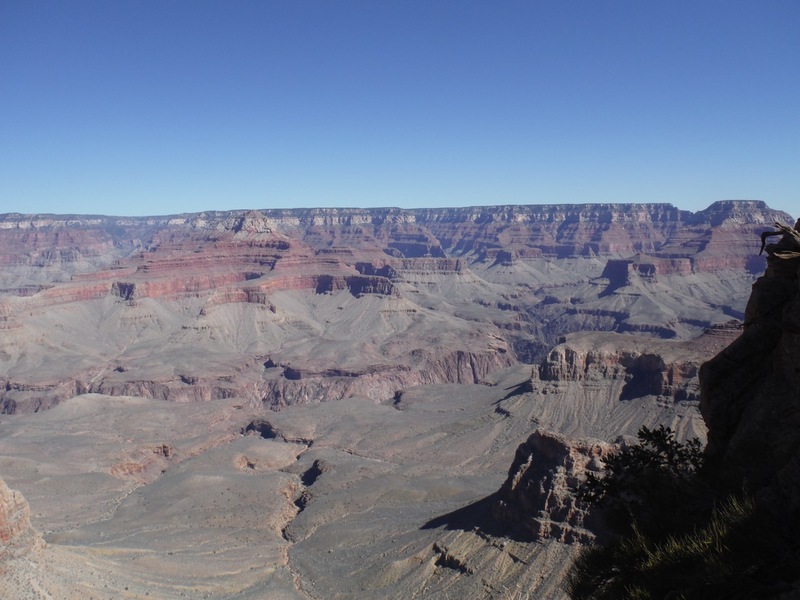 Our next destination, and one we have looked forward to since finishing the John Muir Trail, was the Grand Canyon. 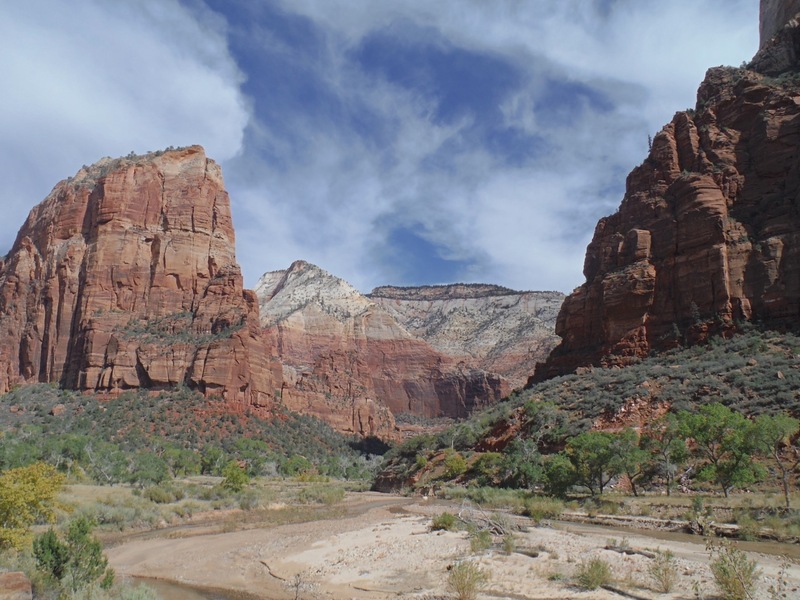 We decided to do another backpacking trip here, from the rim of the southern edge down to the Colorado River and back again in three days. 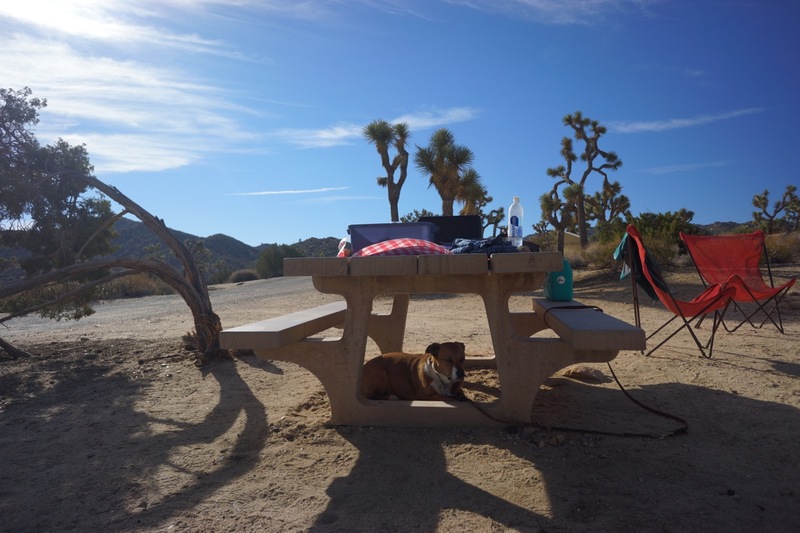 There was a dog kennel within the National Park itself, with very affordable rates ($10/night/dog) and we checked it out to ensure it was clean and safe before dropping off Duke and Spike. The workers there were very nice, and the place was tidy. It helped that we travelled late in the season, when the weather was cool and tolerable but the crowds were slightly less than crazy (and the kennel had lots of room). 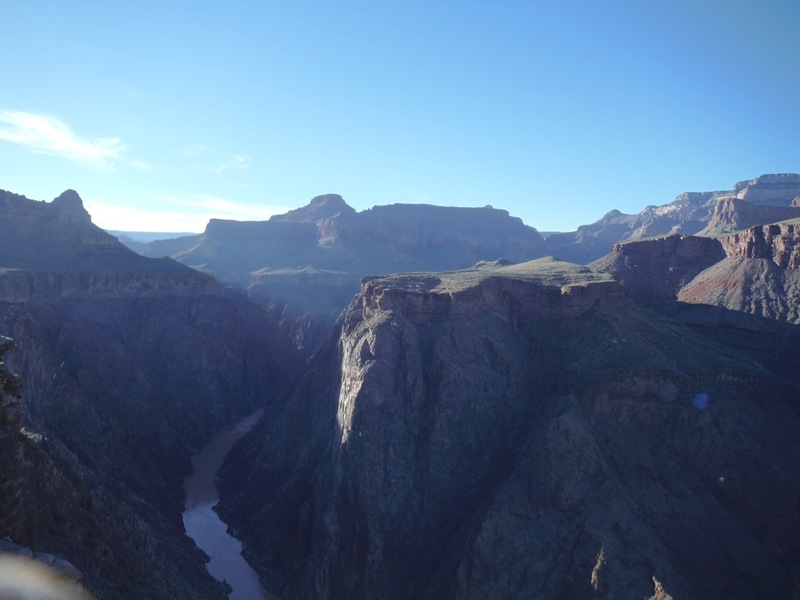 The Grand Canyon is one of the most visited parks in the world, but only 1% ever make it below the rim, and only a fraction of 1% make it all the way down to the Colorado River. 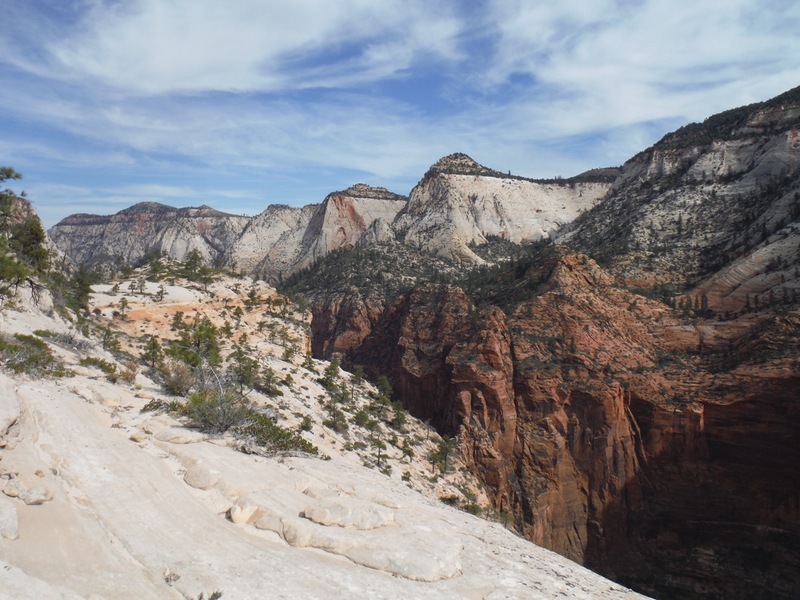 Doing such a thing requires about 5000 feet of elevation loss on the way out, and an equal gain (or possibly more if you hike out on the northern side of the canyon) while hiking out. 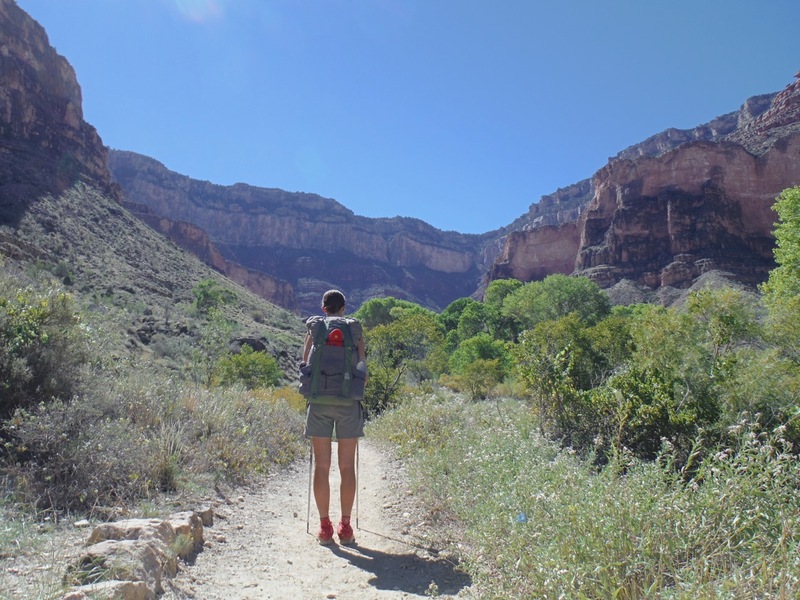 Seeing the Grand Canyon from down into the carved river valley is a very different experience. 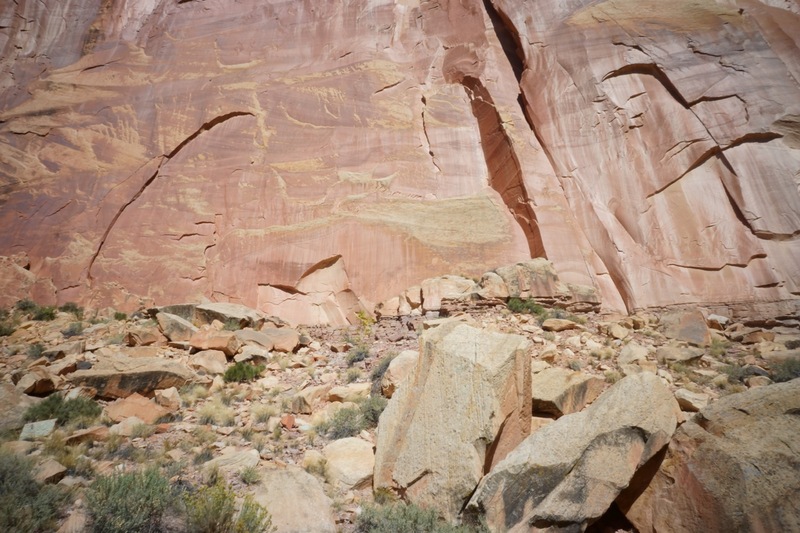 The weather is much hotter, and what looks like sheer walls turns out to be much more interesting curved and carved rock. The play of light during sunrise and sunset also adds another dimension. 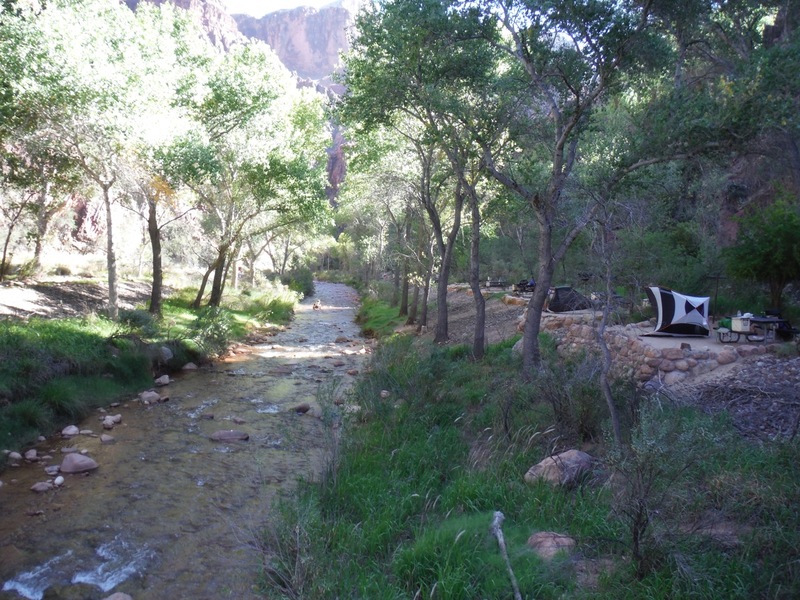 The campsites down in the canyon are also stellar, very clean, with running water and well-kept toilets (they even flush at the valley floor, Bright Angel Campground!). However, there are a ton of people camping every night, and the spots aren’t super spacious, so expect noise and company. 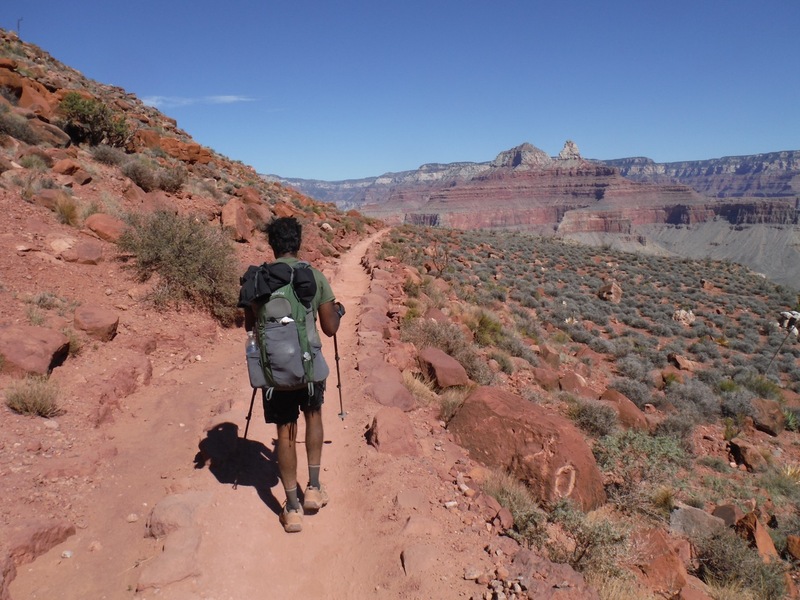 On a future hiking trip to the Grand Canyon, we would venture off the beaten path and “Cowboy Camp” (find a remote campsite with no amenities) for solitude. 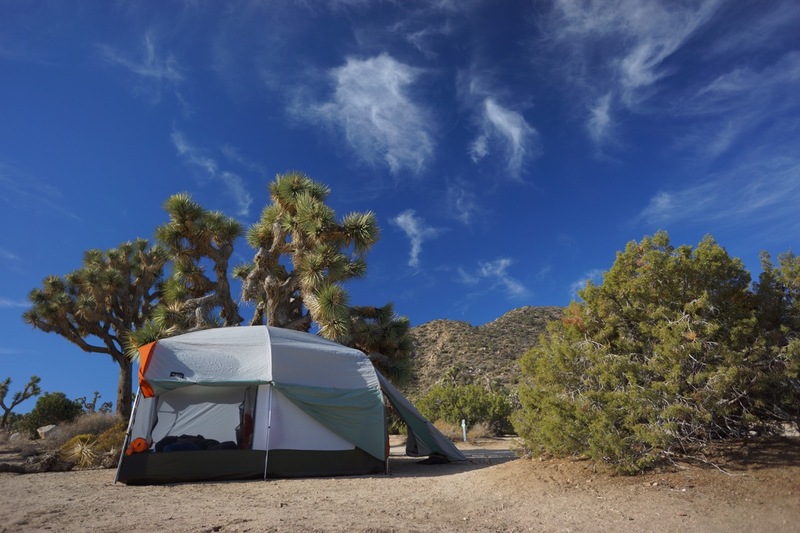 However, a first timer would be amiss to not stay at these established campgrounds. 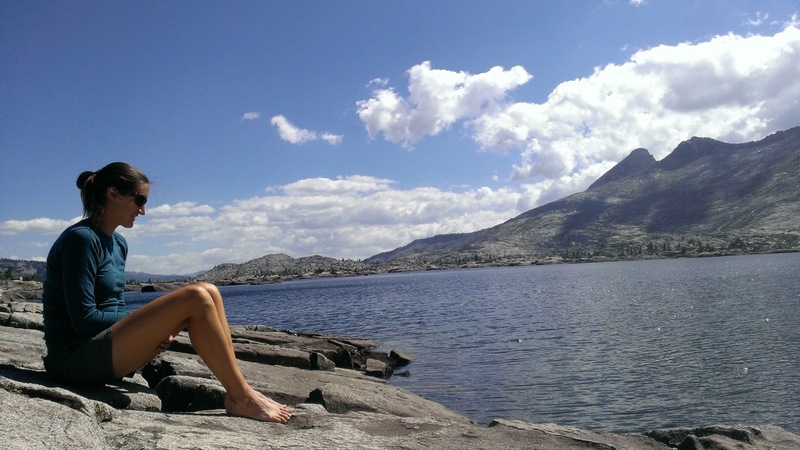 The views are stellar and you will meet interesting people for sure. There is even a ranch near the valley floor that has rustic cabin accommodations (book far ahead if you want to stay here!) and a cafe that serves up breakfast foods, burgers, snacks, cold beer, lemonade, sodas and even proper dinner (if your idea of proper dinner is a big slab of meat and some sides). 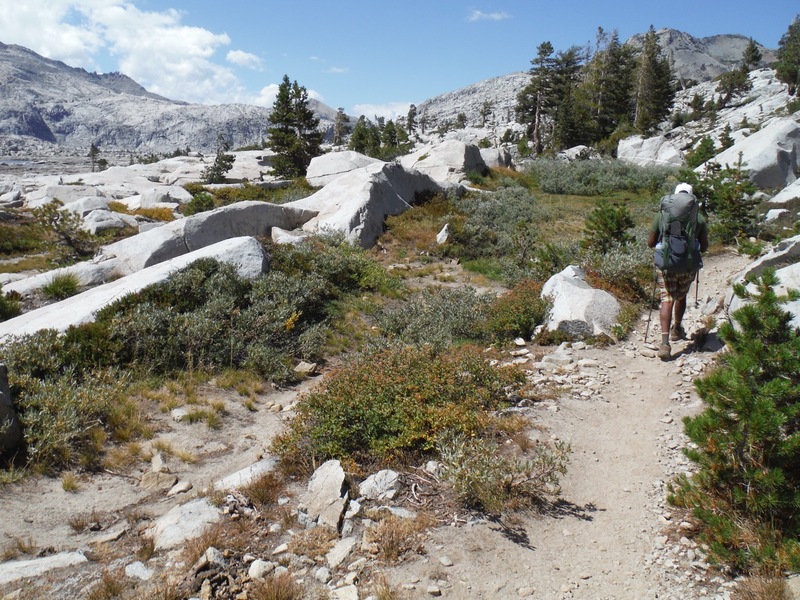 With our ultralight backpacking gear, and our post-JMT fitness, the hike was not hard at all. 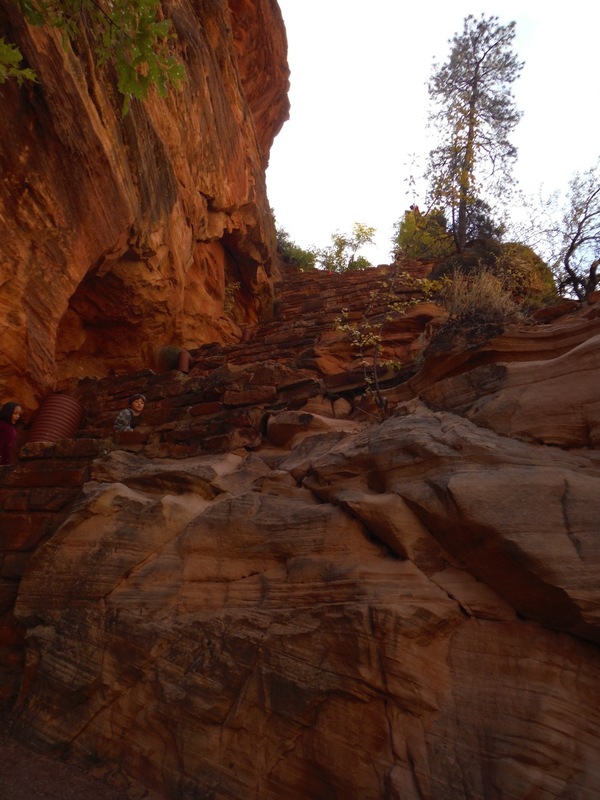 We hiked down to the bottom of the canyon in one day (about 8 miles) and then hiked half-way up and out of the canyon via a different trail on the second day, and the rest of the way up on the third day. 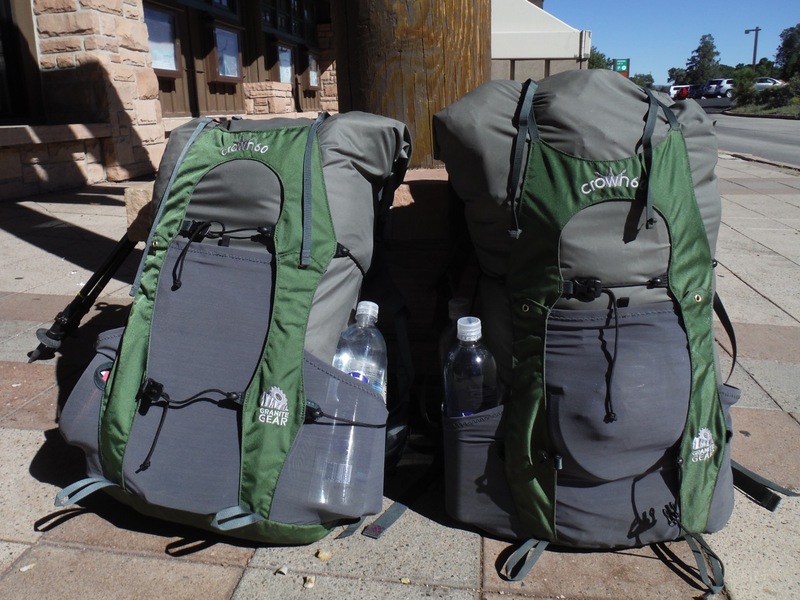 Both our packs weighed in under 25 pounds when we started the hike, since there was no water on the way down to the bottom of the canyon (via the South Kaibab Trail) and we carried a ton of it. 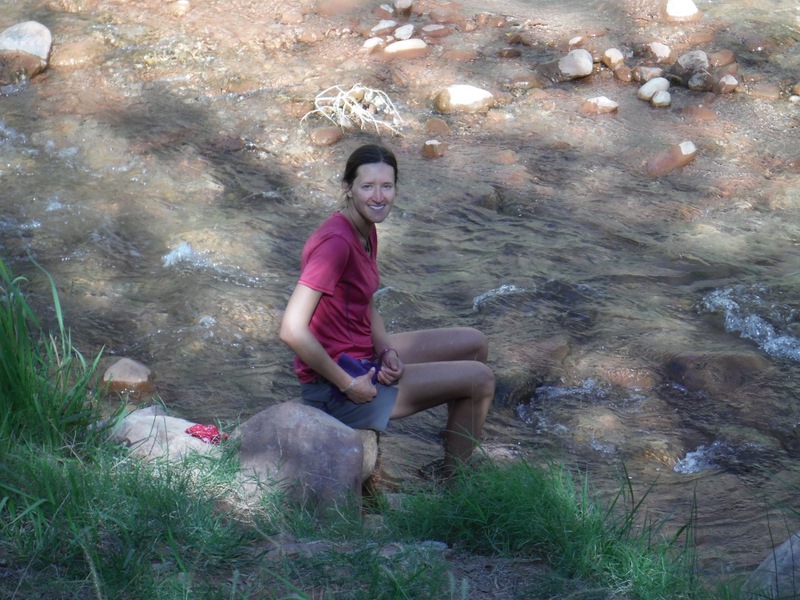 However hiking up along the Bright Angel Trail, there was plenty of water along the way (filtered, not via a stream), so we carried less and our packs weighed closer to 20 pounds. 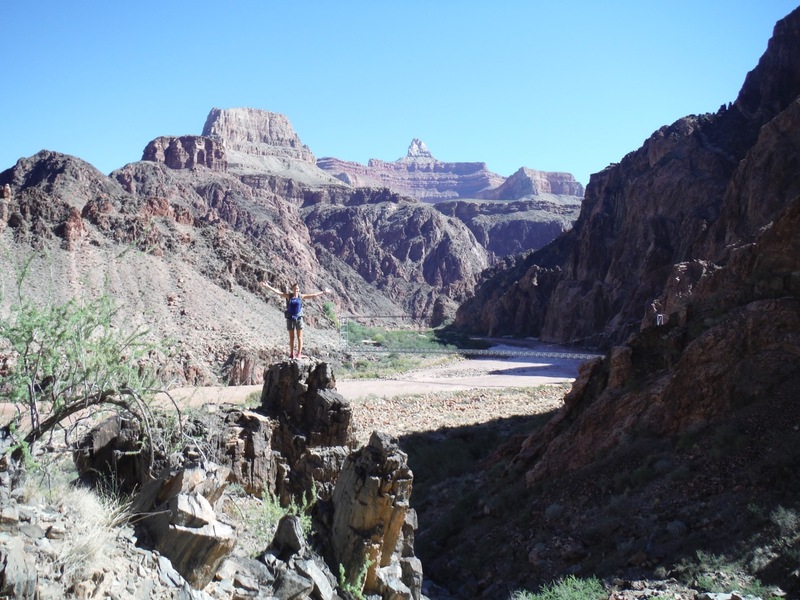 If we go back to the Grand Canyon, we will probably trail run the thing in a single day. 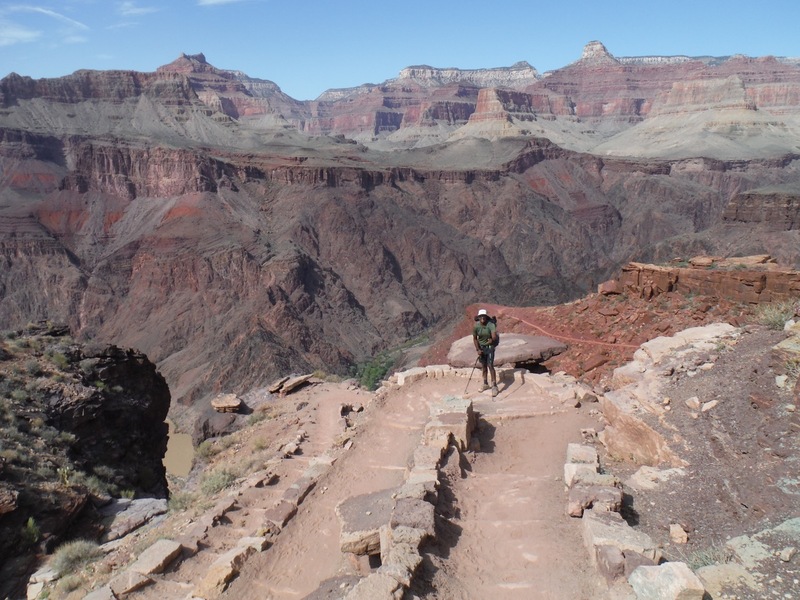 It has become the cool thing to do lately, and we saw plenty of people plodding along down and up in a single day, some doing so from the south rim and back to south rim (12-14 miles), others doing it from the north rim to south rim (22 miles) and a few doing south to north AND BACK in a single day (44 miles). 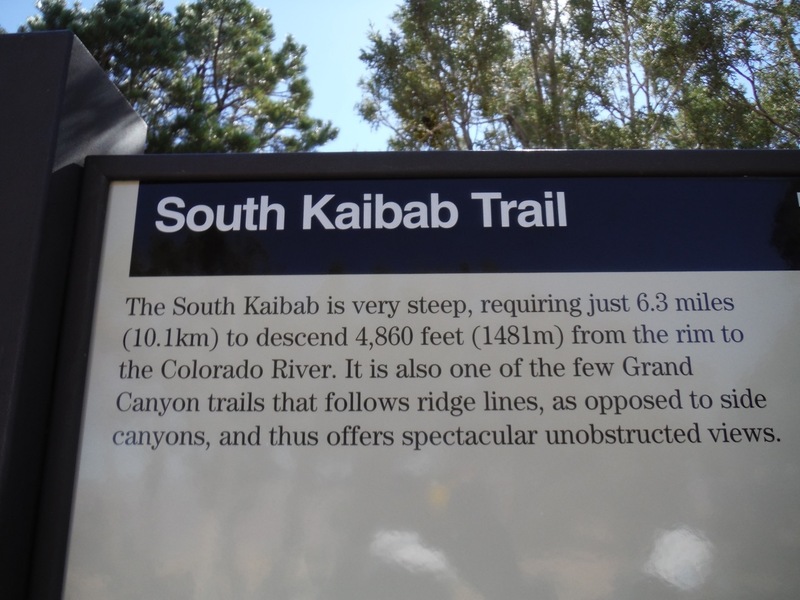 Aside from a few stretches where the trail is sandy, steep and slippery…the trail is totally runnable. The gradient isn’t that bad. I’m saying that now from the comfort of a motel while I type this post! Pics of this adventure below. 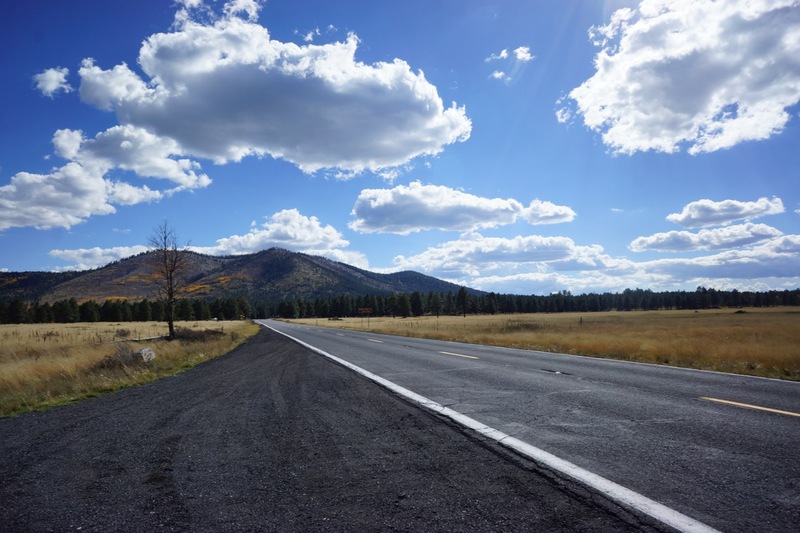 Driving to the southern rim of the Grand Canyon from Flagstaff, AZ. 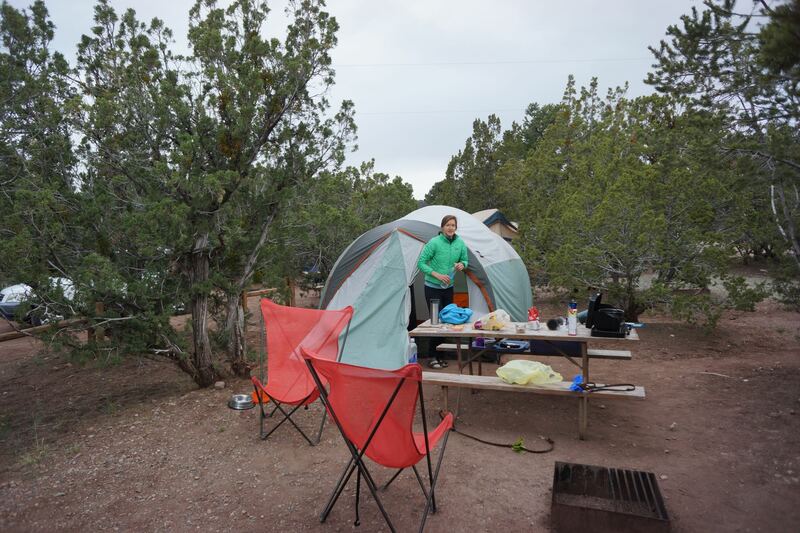 The Grand Canyon campground was full, so we snagged a 100% free camping spot in the national forest about 5 miles away. There were no toilets (you dig a hole in the ground) and no water (we always travel with 3-5 gallons of water with us), but it was pretty quiet and we had plenty of space. 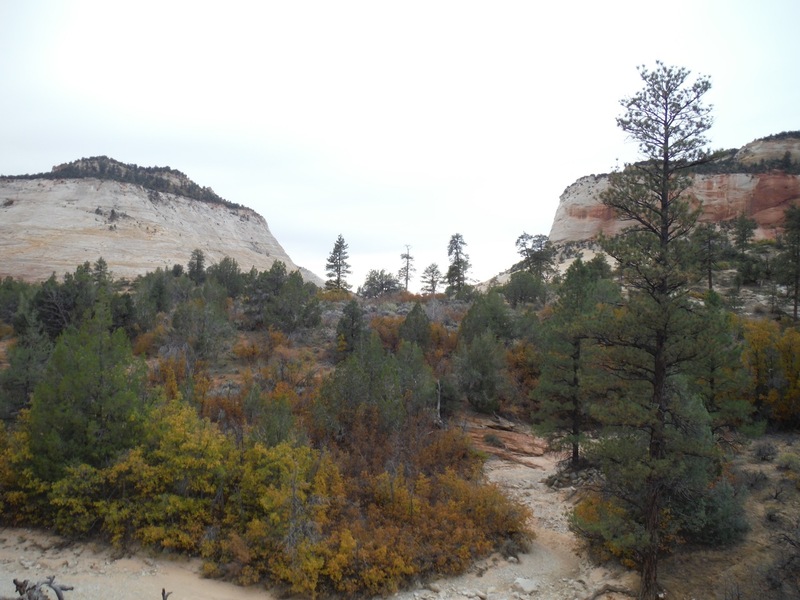 The view in the other direction from our campsite. Our packs, post weight in. We caught a shuttle bus to the trailhead. 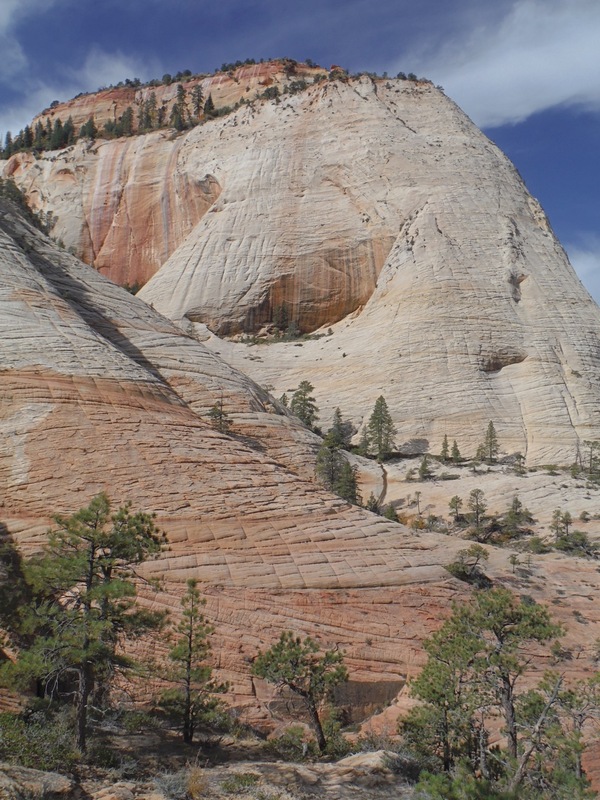 We didn’t have a permit when we arrived (you need one to stay in a campsite below the rim), so we stood in line the day before and got one. 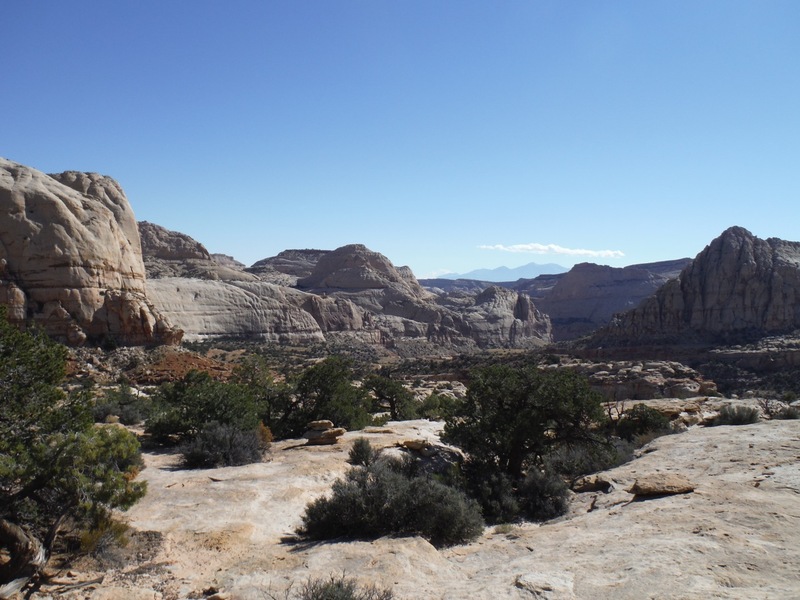 Make sure you get a number from the permit office two days before you plan to hike, and the next day just show up when the office opens and they will call you up in number order to see what spots are available for camping. We were number 7 in line and got what we needed. The trail we took down to the bottom. 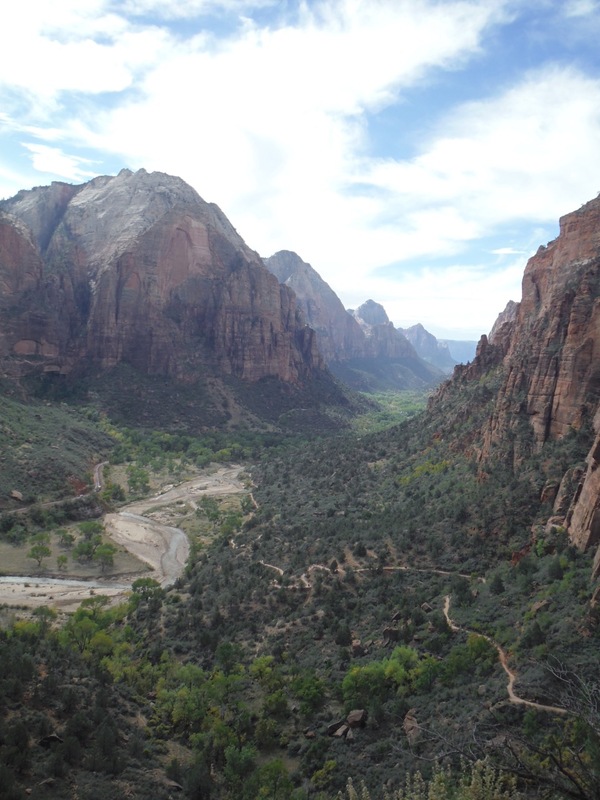 It is steeper than the other option (Bright Option) and has no water along the way, but the views are better. Lots of people do this. 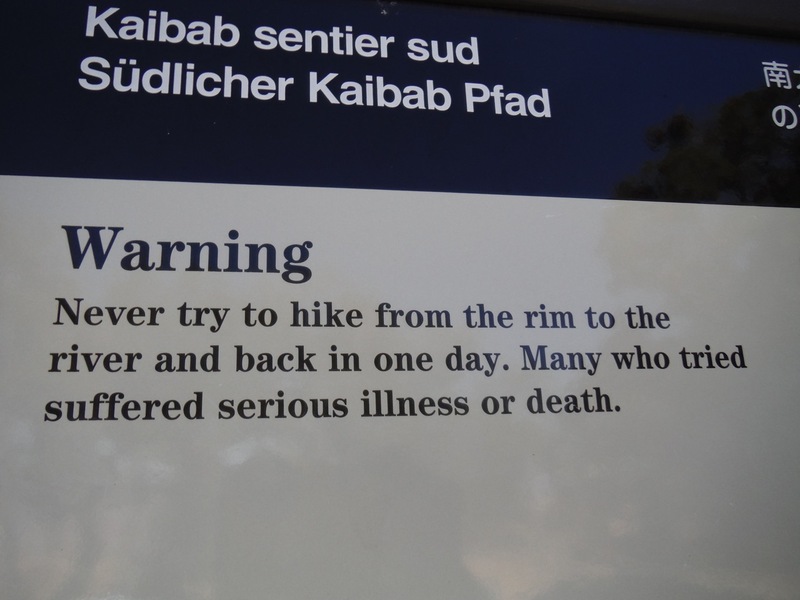 There are warning all over the Grand Canyon about people perishing from falls, dehydration or exertion. 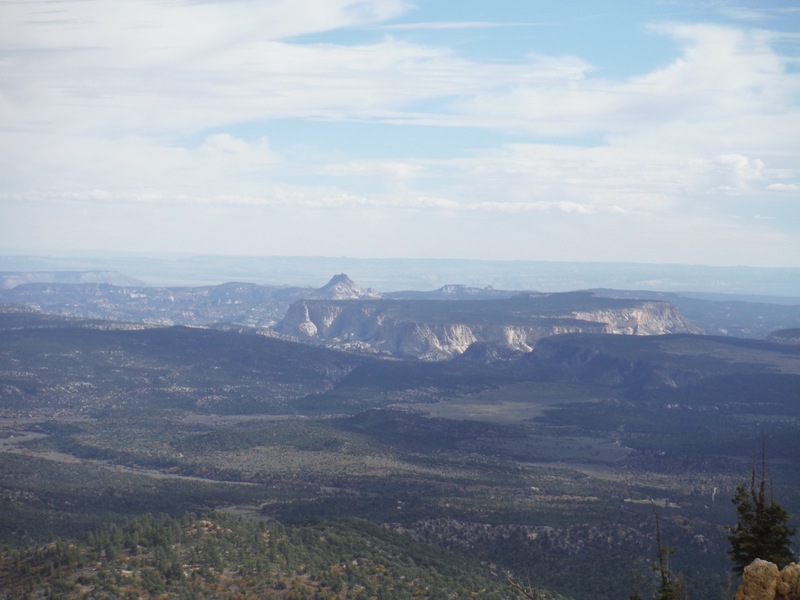 First views of the rim. 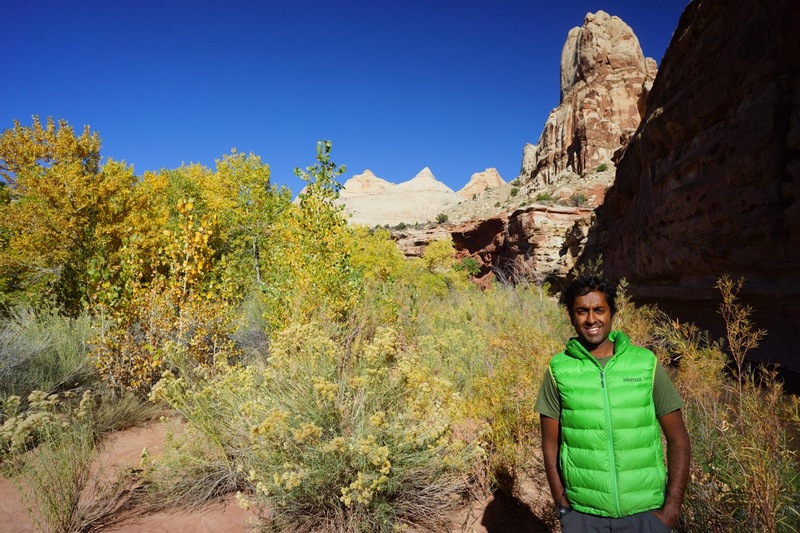 Prior to the hike, I (Ravi) purposely avoided looking at the canyon from the park roads when we drove around. I wanted it to be a surprise for the hike. 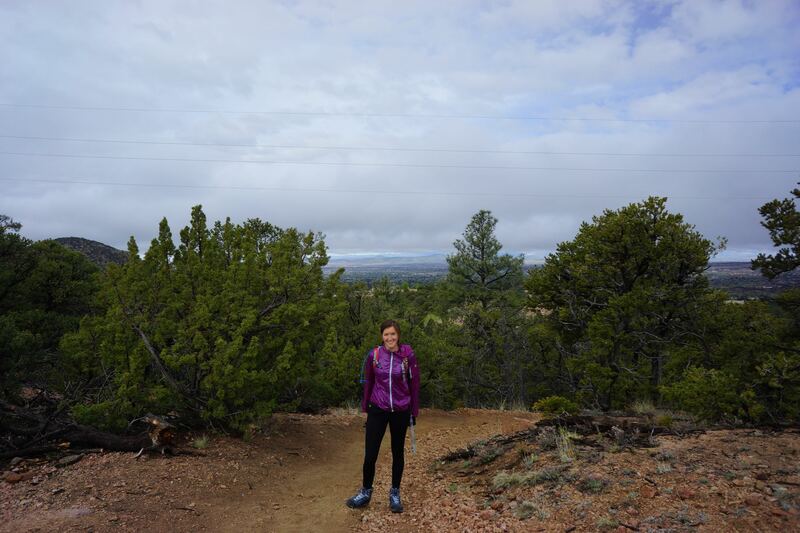 Alison, however, did a full 13 mile run along the southern rim trail the day before we hiked. 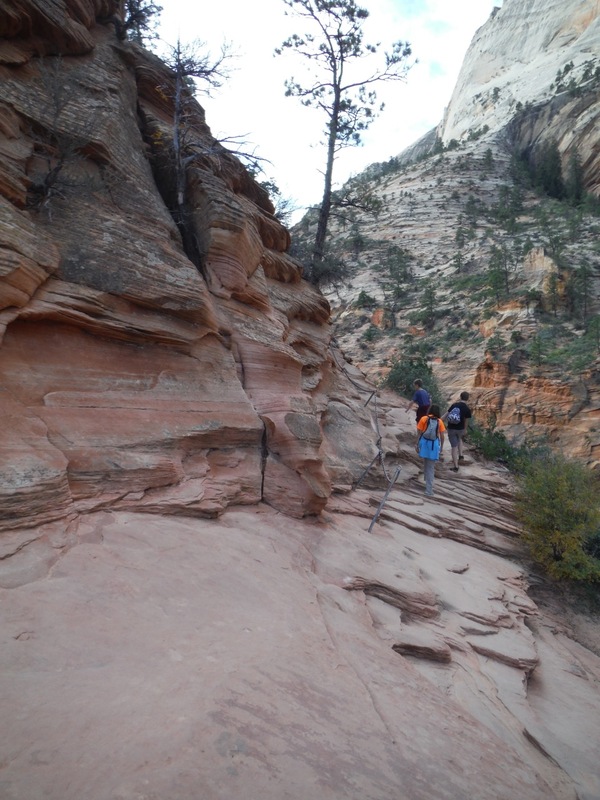 Tons of switchbacks….the trail was steep at the start, but then dropped to a pretty manageable gradient. 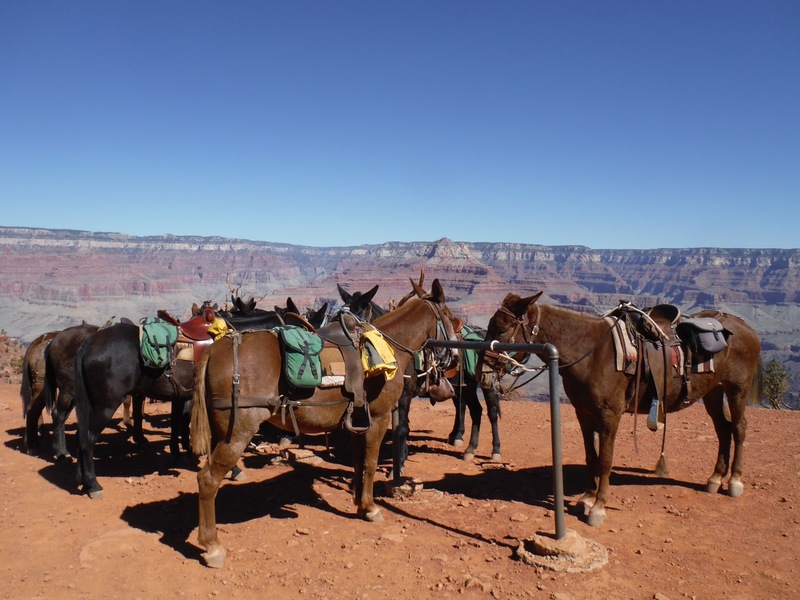 Every single beer, burger and piece of trash that goes down to the ranch at the bottom of the canyon and back up…does so on a mule. These are cross-bred mule/horses….super strong and sturdy. They occasionally carried people as well. 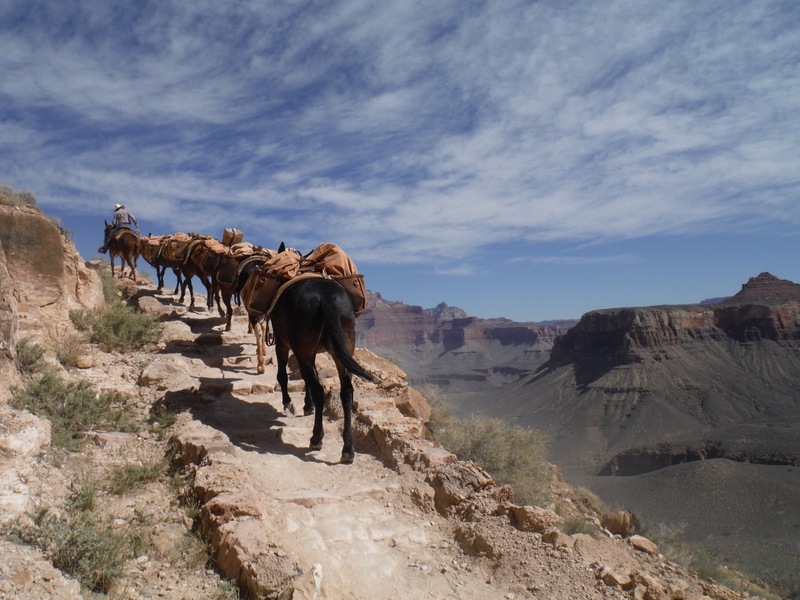 Some pay to do a “pack trip” (where you ride a horse down and up) and they also carry people who are injured. 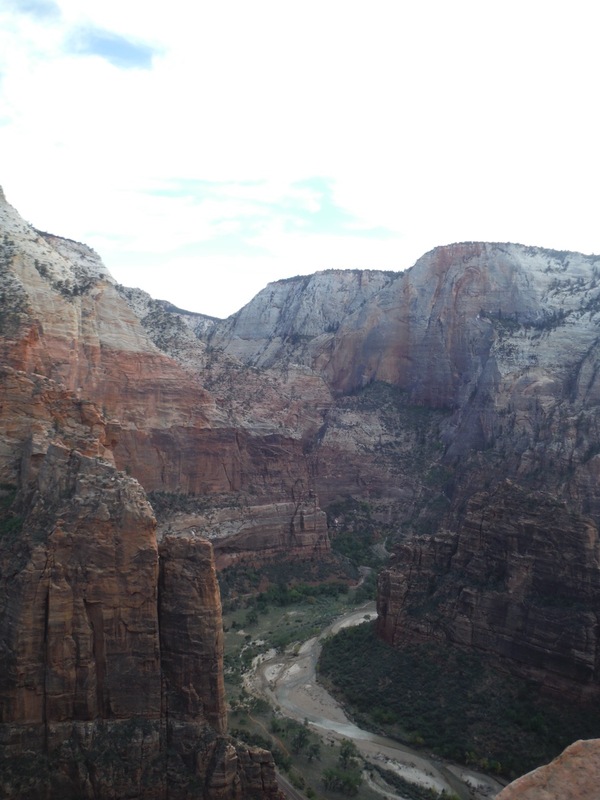 I would be scared to death riding a horse down or up out of the canyon. The scared to death look afflicted several people I saw riding them! 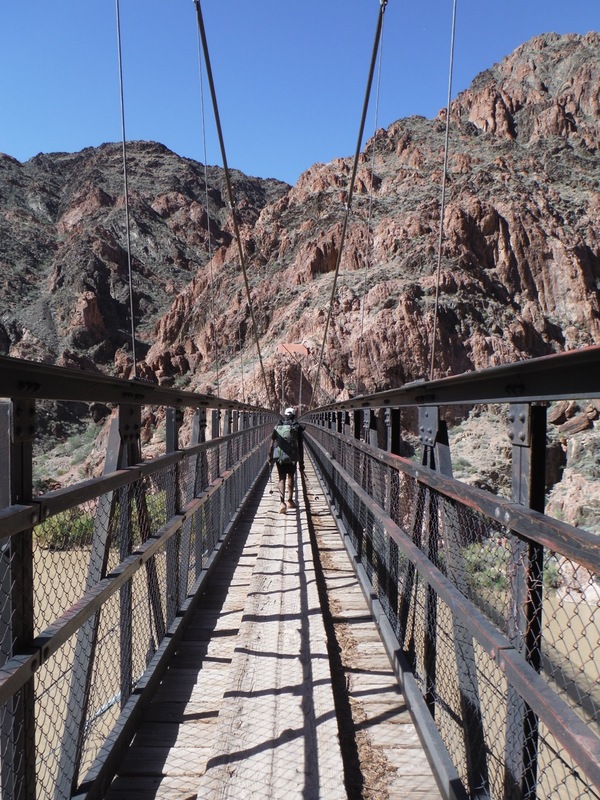 They have two of these massive steel bridges down there. 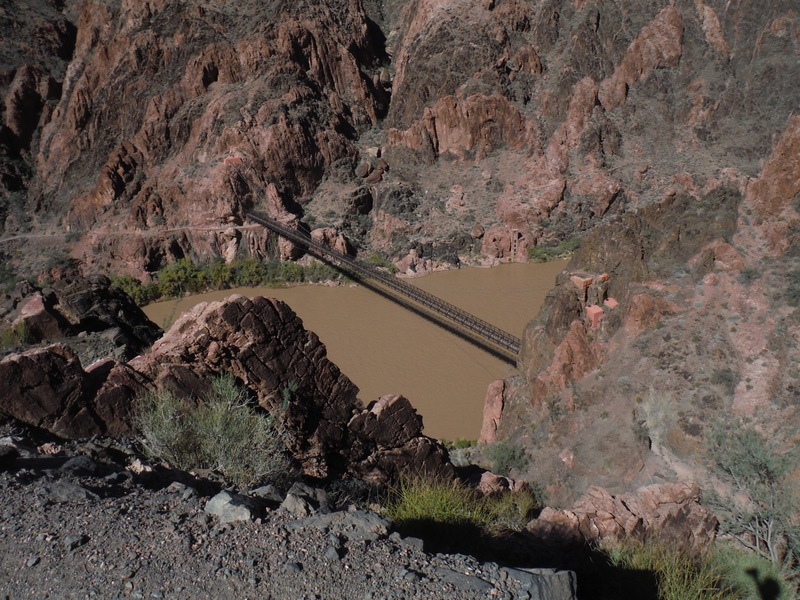 The Colorado River! It moves very swiftly. 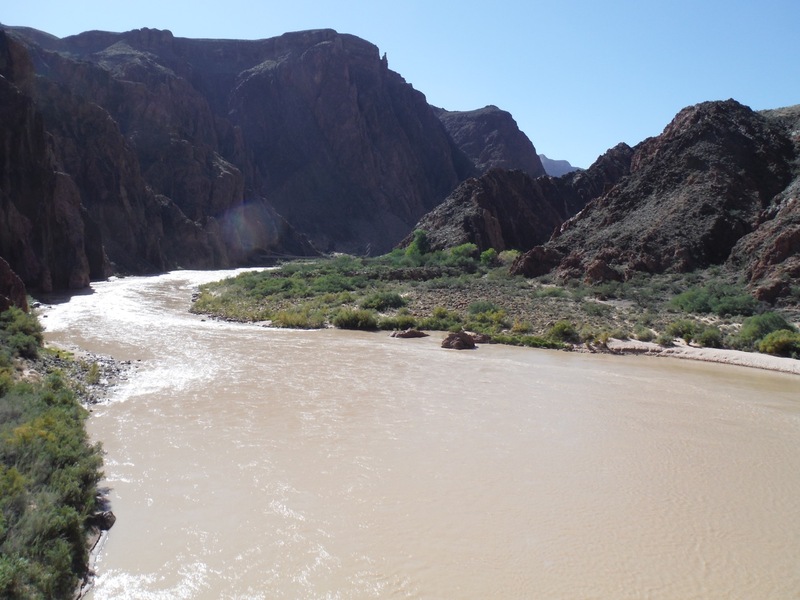 Not a good idea to swim in it…aside from aircraft crashes (helicopters and scenic planes), more Grand Canyon deaths have occurred in the Colorado River….rafting or swimming…than any other way. 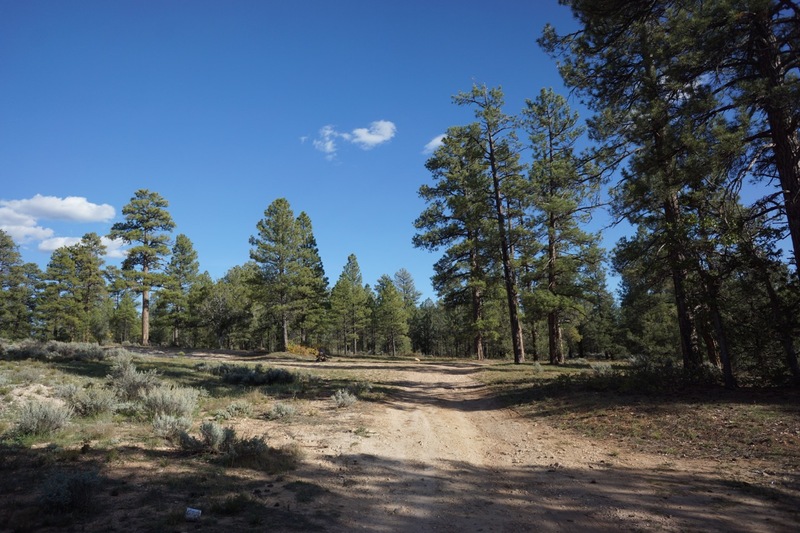 Approaching our campground at Bright Angel. 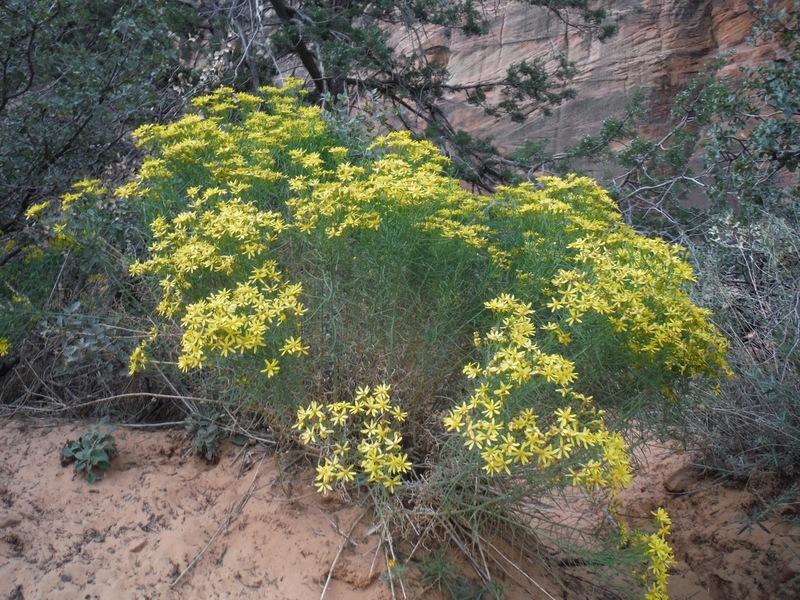 The scenery at the bottom of the canyon is very different than the top. 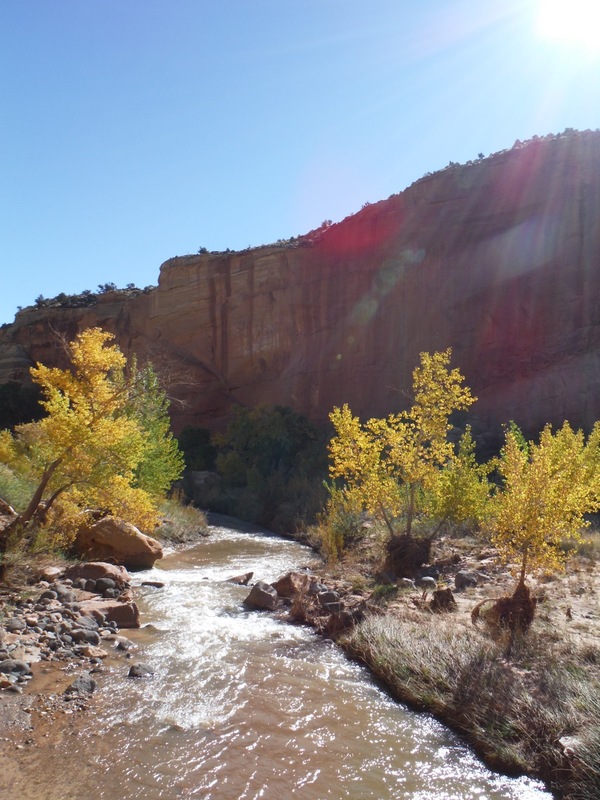 It is much hotter (10-20 degrees hotter with less wind) and there are a few creeks where big cottonwoods grow). There are also a ton of deer down there (and they all look emaciated). 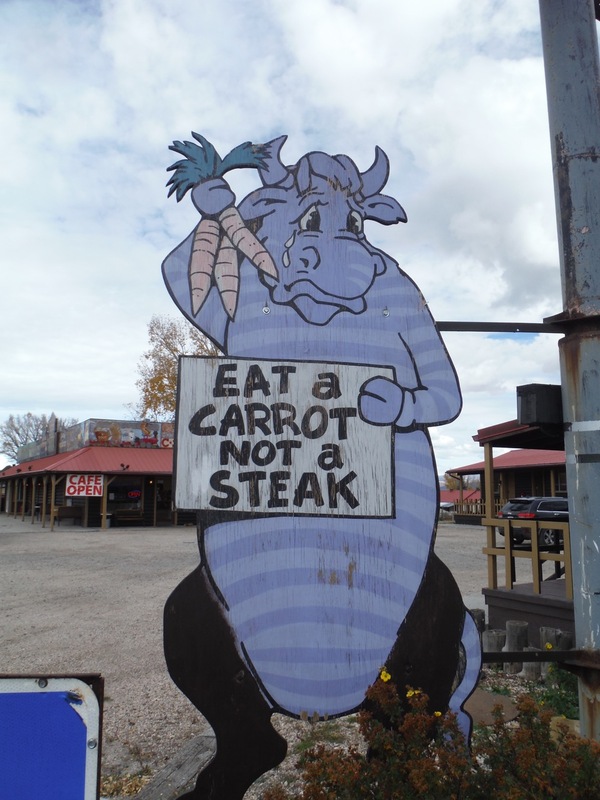 There is not a ton to eat down in the canyon. The park service monitors the deer and if straights get too dire, they have been known to cull their numbers (i.e. shoot them). Poor things. Our site! 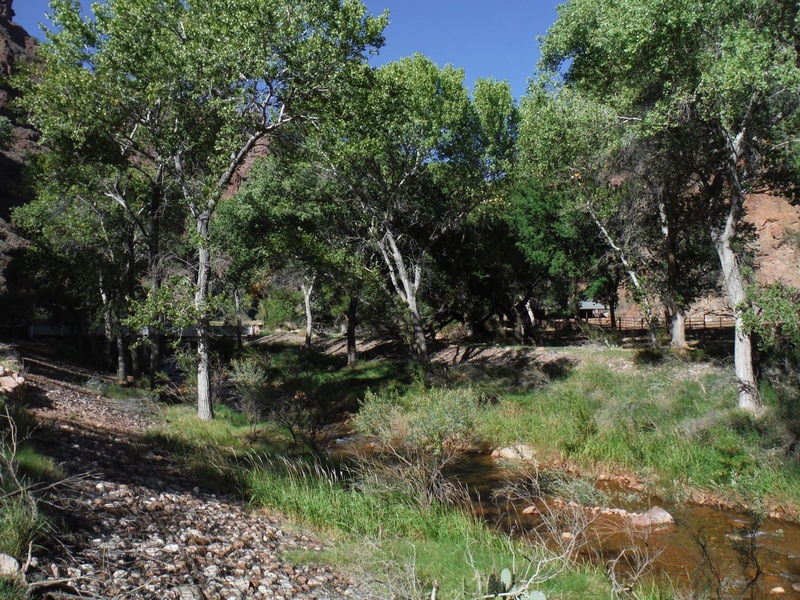 All the sites were neatly arranged along a creek, with plenty of shade and sandy platforms. The bathroom even had flush toilets, running water and there was a cafe 1/2 mile away serving snacks and cold beer! 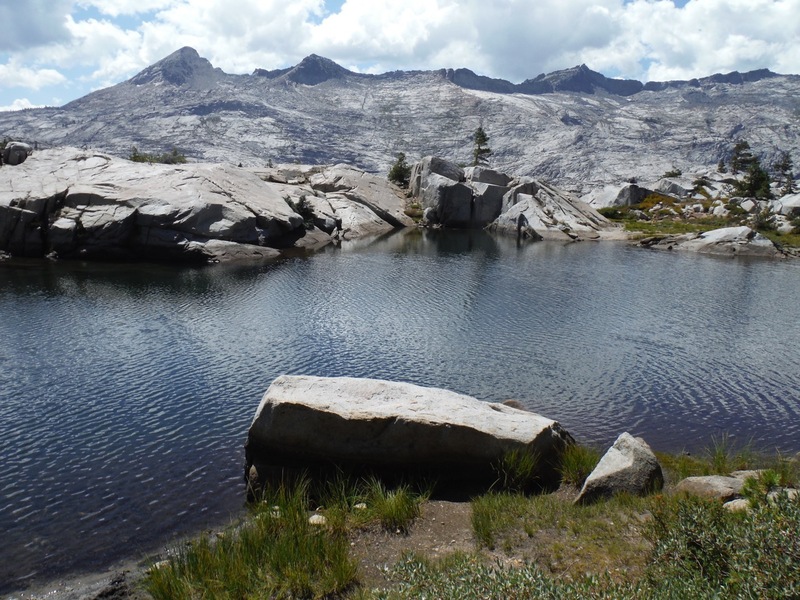 The stream was cool, but nothing compared to the snowmelt along the JMT. 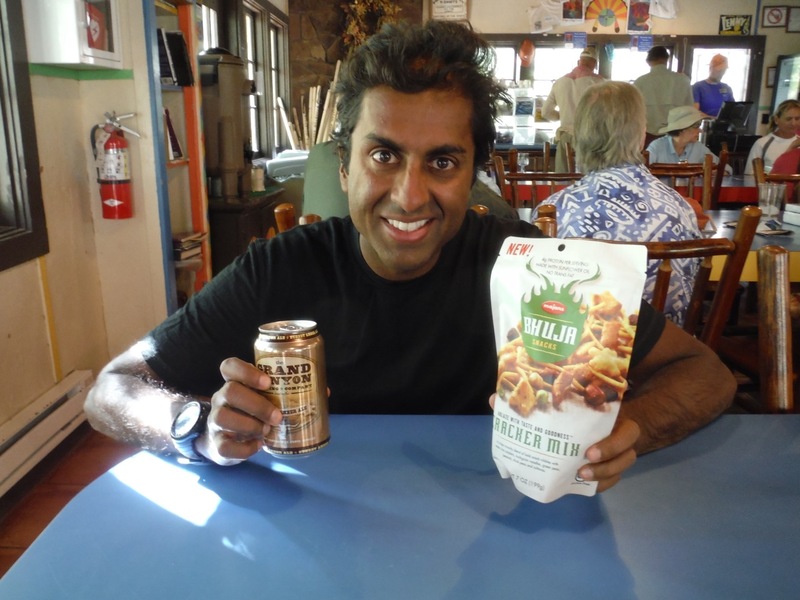 Grand Canyon Beer and some Indian hot mix snacks we brought from home. If you look closely you will see a telephone line that is up on the hill, and is still in use. 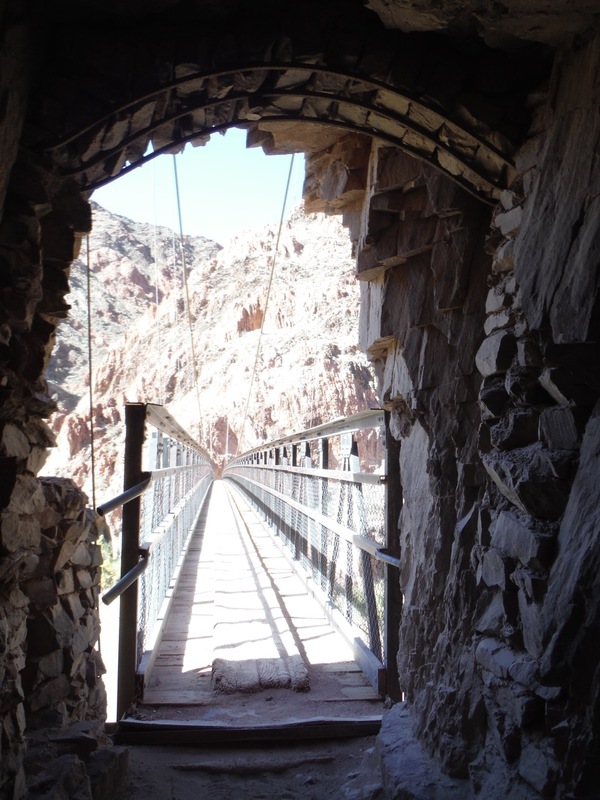 It is a historic item now…built in the early 1900s and running all the way from the rim to the bottom. Bright Angel campsites all lined up neatly in a row. Walking to the cafe for a beer! The lemonade was also amazing. 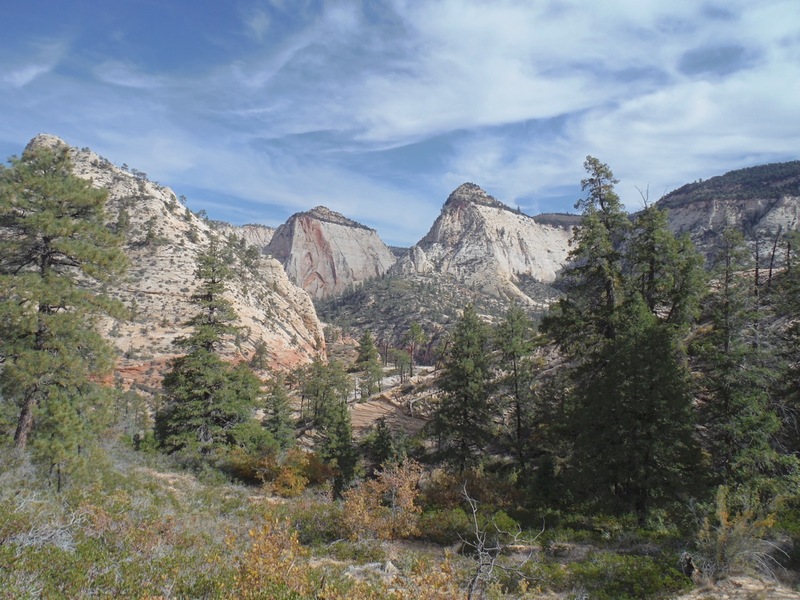 On the second day, we hiked just 4 miles to our next campground, gaining about 1500 feet. 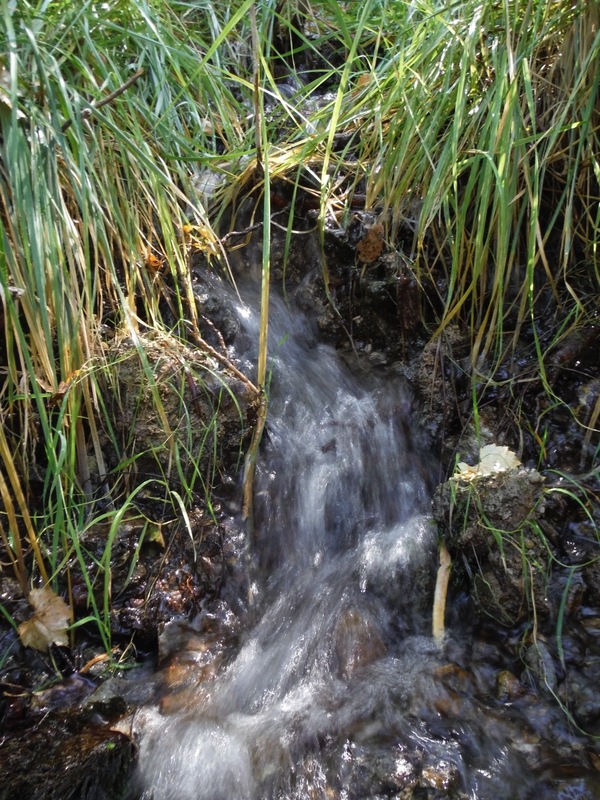 Along the way we saw this little stream, an oddity in the dry terrain and hot weather. 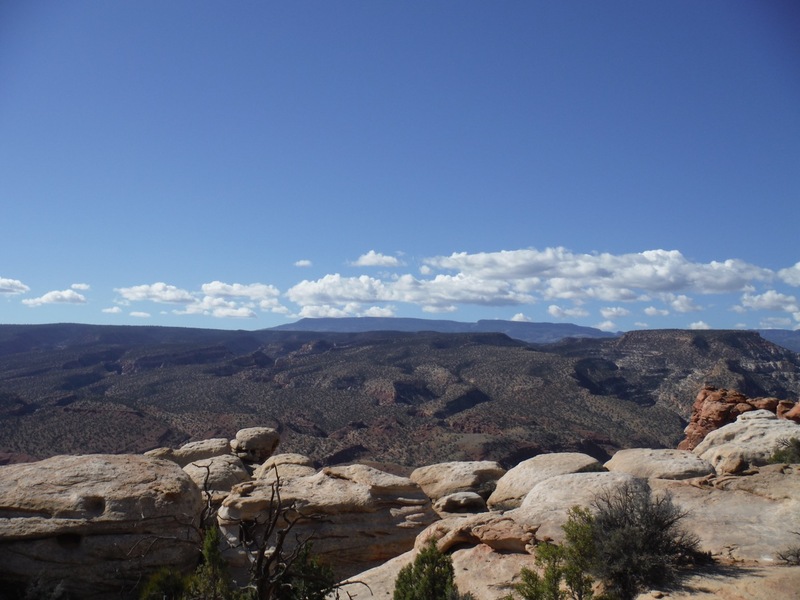 As we approach the Indian Garden Campground, our home for the second night, we look up and see the southern rim of the canyon. 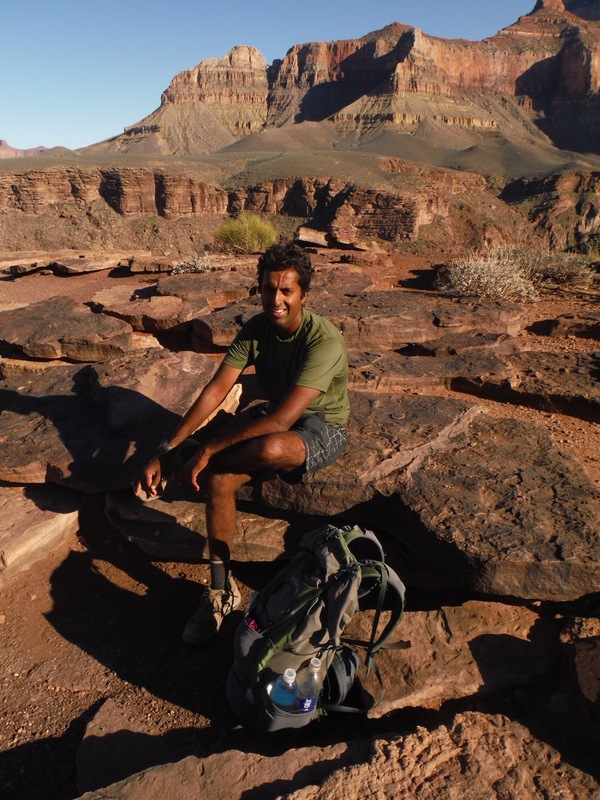 We did a flat hike out to Plateau Point after dropping our gear at Indian Garden Campground. It was supposed to be one of the best sunset spots in the park. It surely was, but out camera was not that good and all the pics were washed out. If you have a good camera, or are content with just looking at it instead of capturing it, it is worth visiting here for sunset. 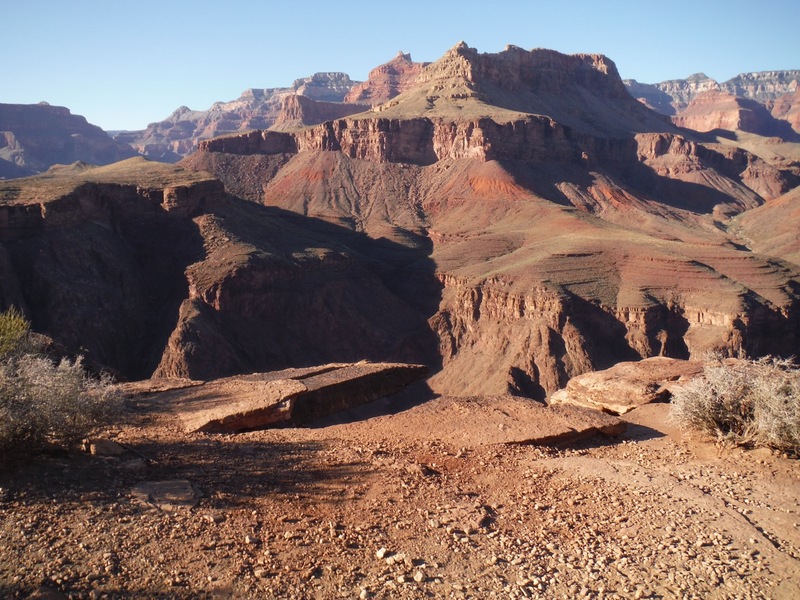 The view from Plateau Point. 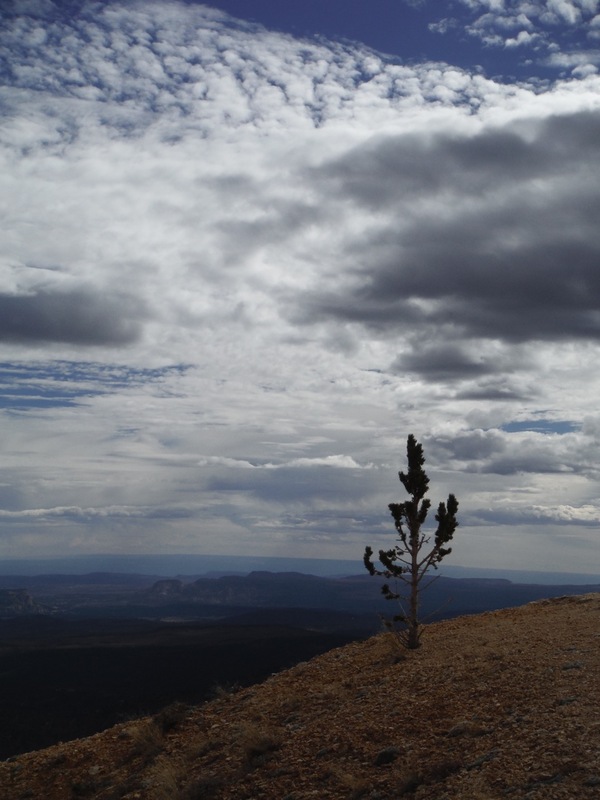 The final day, hiking up 3000 feet and 4-5 miles to the southern rim. It went by quickly. 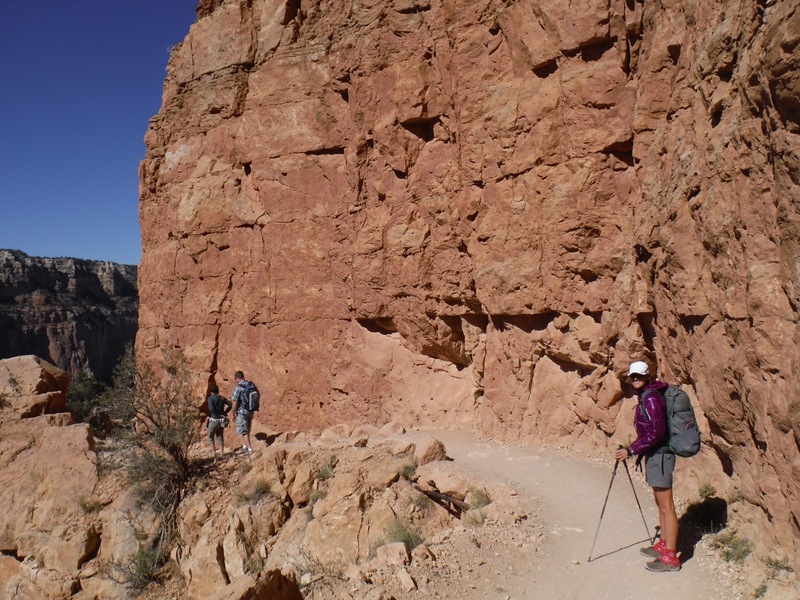 Back on top at the Bright Angel Trailhead. 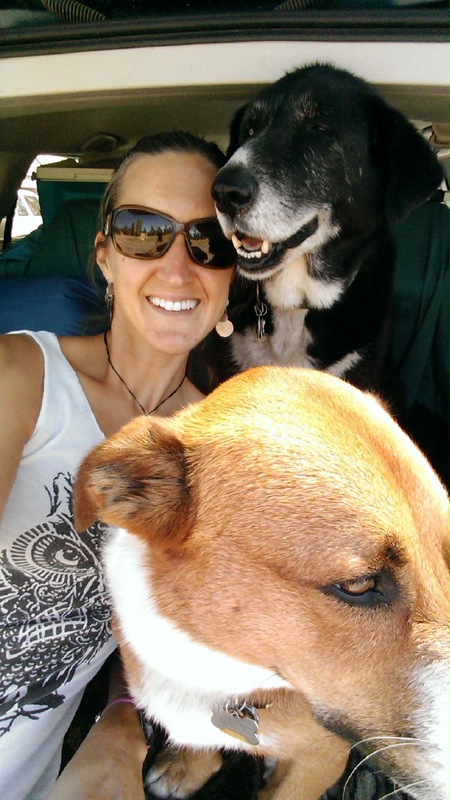 Following the JMT, we picked up the pups (Duke and Spike) and spent almost a week in Milpitas, CA (just south of San Fran)with my brother and his family. 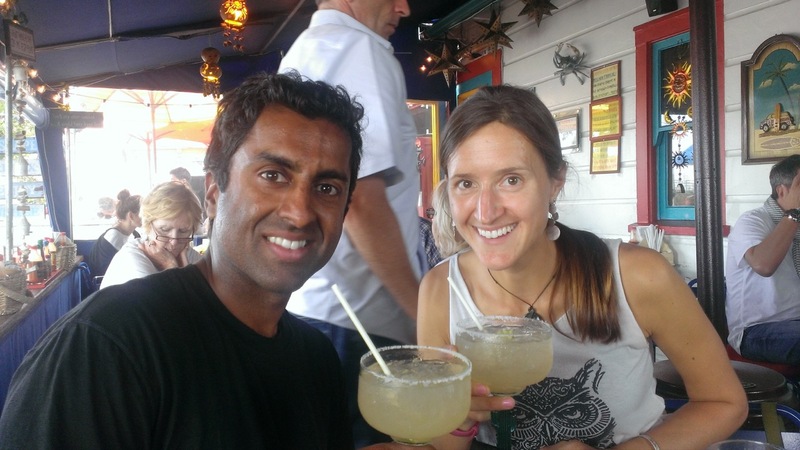 We lots of great home-cooked Indian food and went to Bikram Yoga several times to work out the kinks in our joints and spine. 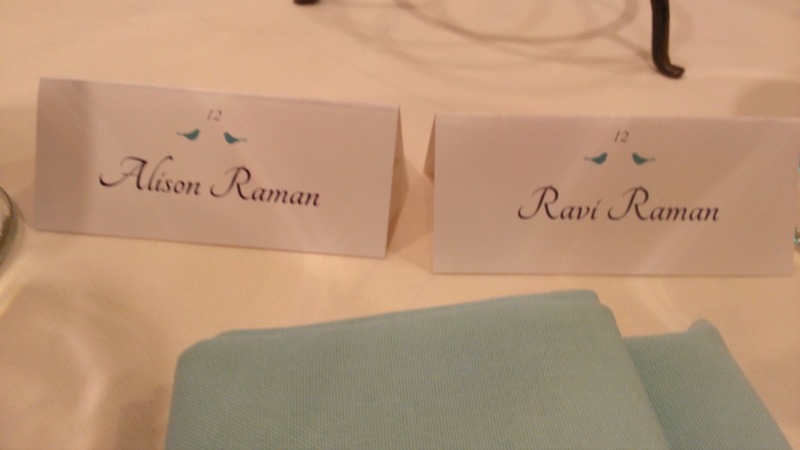 We also caught up with a good friend, Kapil, for dinner one night. We tried to meet my friend from college, Ben, but unfortunately, the San Fran insane traffic caused us to miss our meeting time (we waited in gridlock for over 2 hours). 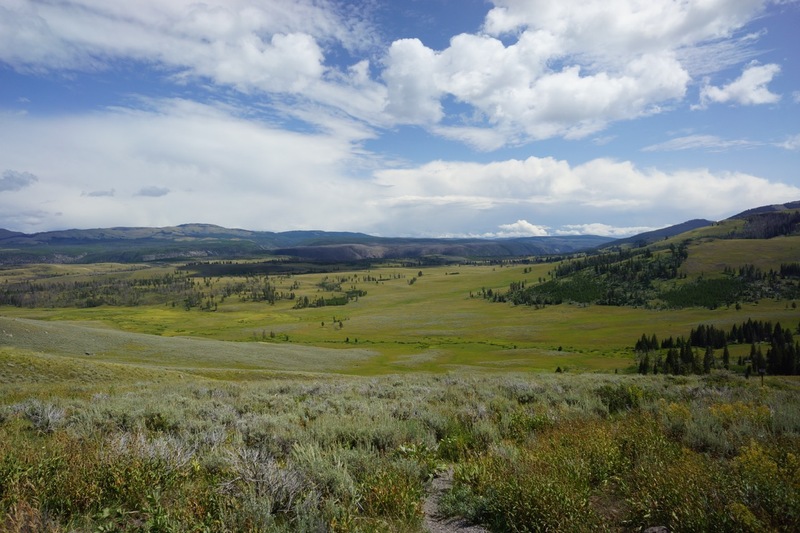 Have I said how much we love living in the traffic-free wilderness? 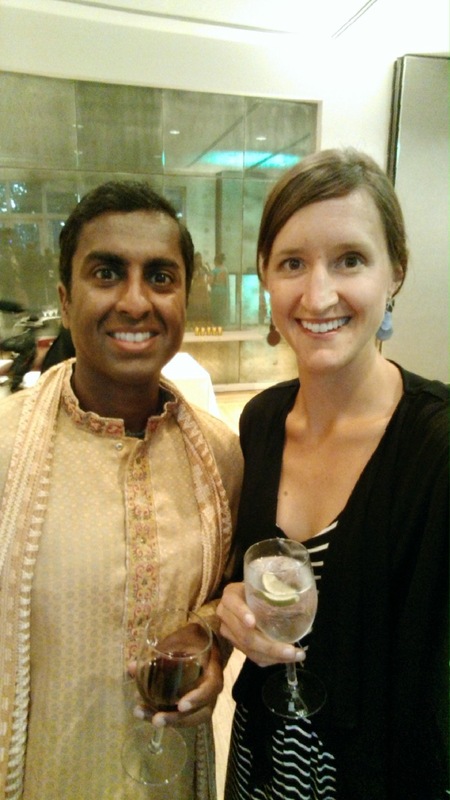 We also had a fun time at the wedding reception for my friend Ayush, who was married in India (we missed his Wedding by 1 day when we were on tour in Jaipur earlier this year) but had a reception for his USA friends in San Fran. 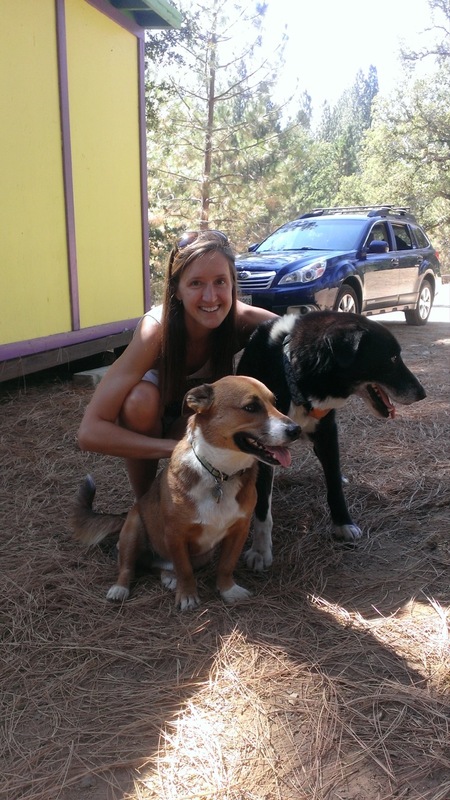 Picking up the pups from doggy care after hiking the JMT! 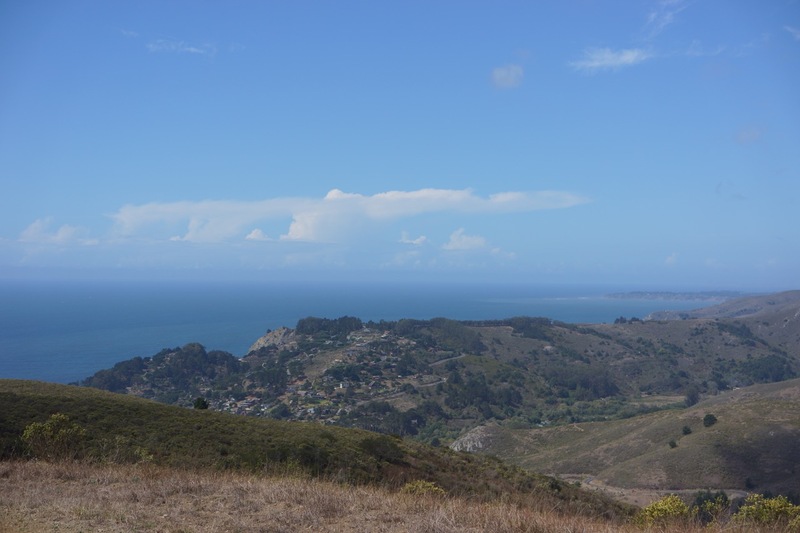 Views of the ocean from Marin Headlands. 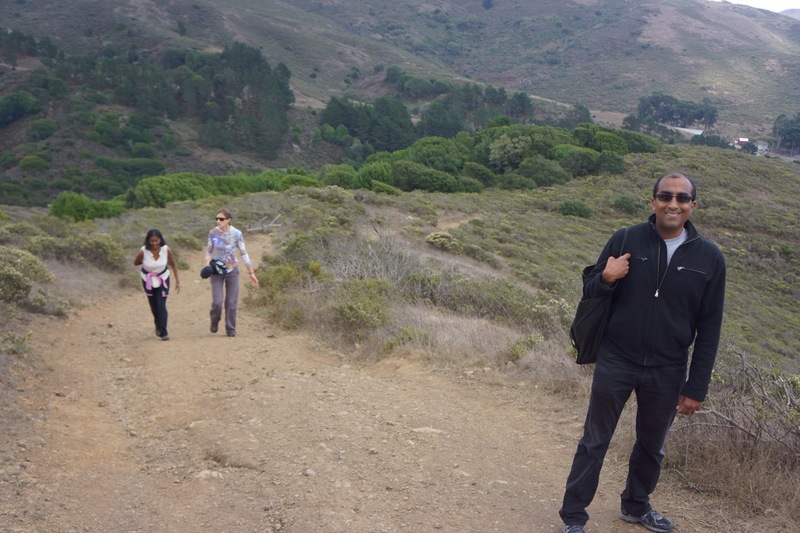 Starting our hike, with Lakshmy and Kumar. 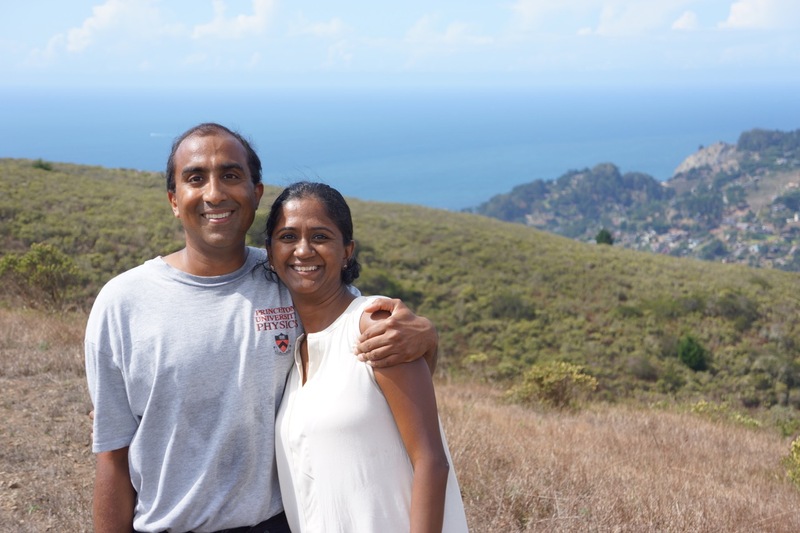 Kumar and Lakshmy, at Marin. This park is a treasure, just twenty minutes from San Fran downtown. 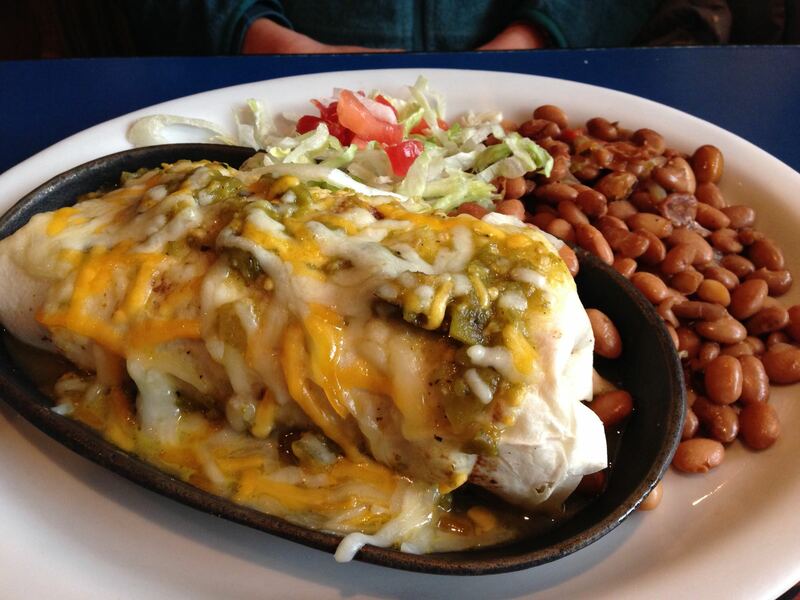 Great Mexican food in Sausalito. The most dressed up we have been since our own wedding! We left Milpitas and decided to take the scenic route to LA, along coastal route 1. Unfortunately, we cannot find the pictures from the drive along the coast, so you will have to take our word for it. The road was super beautiful. 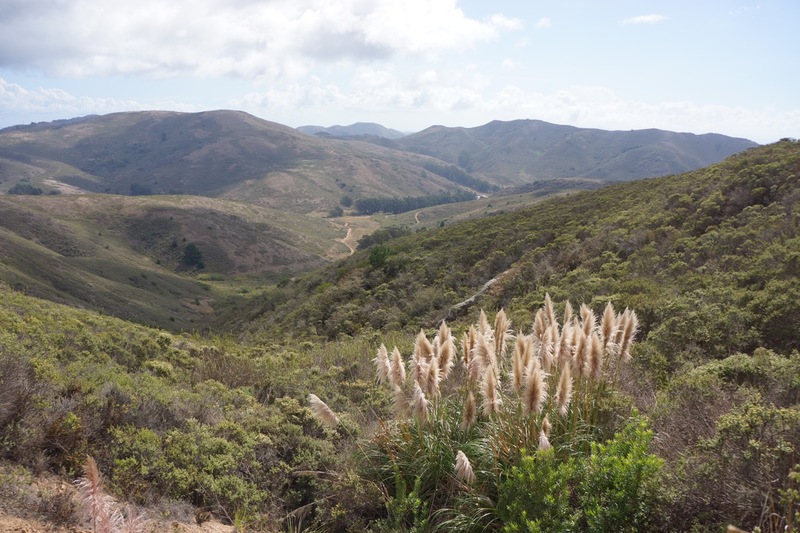 We spent two nights camping en route, once at a State Park near Hearst Castle and another time in the national forest campground high up in the hills above Santa Barbara. 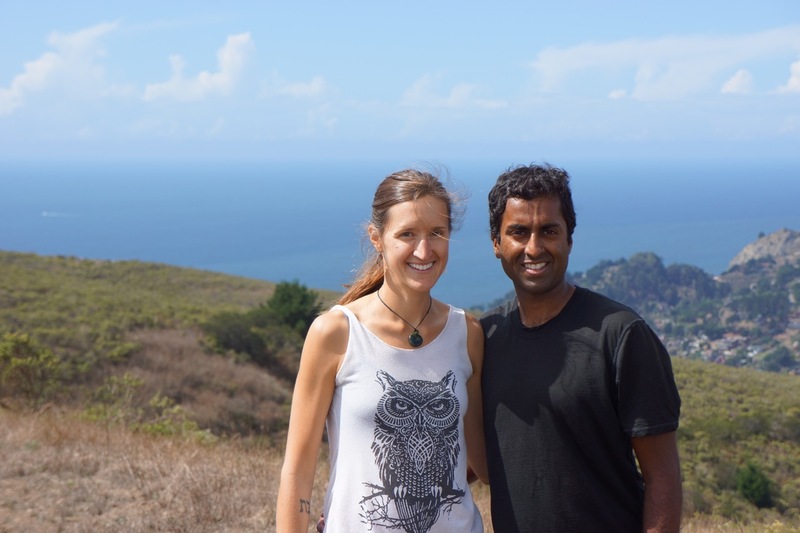 We also stopped by San Luis Obispo, a cool college town, where we ate some awesome vegan food and met up with Matt, one of Alison’s friends who has since relocated there. 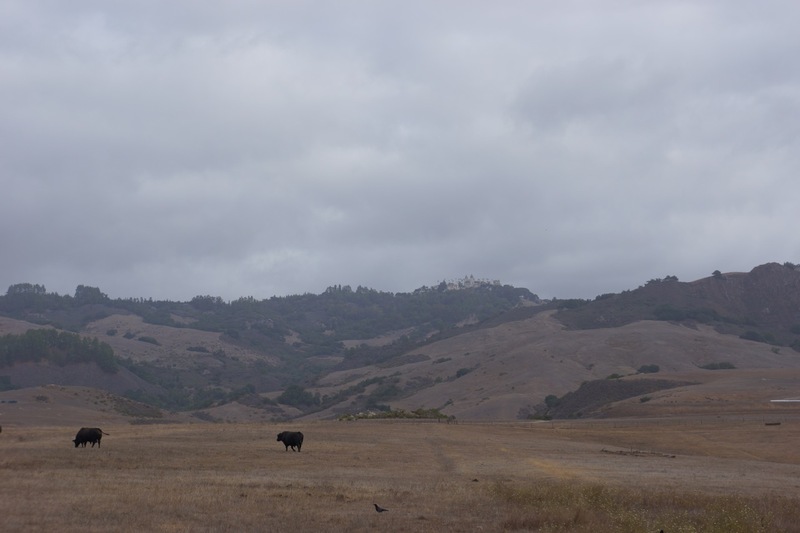 If you look really close, you can see Hearst Castle perched high up on the hill…can you see it? We didn’t do the tour through the castle grounds, though it looks super cool. 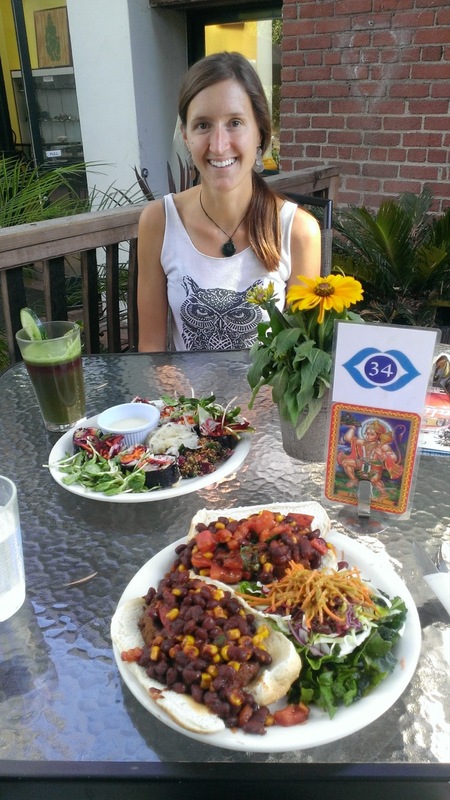 Awesome vegan food at Bliss Cafe in San Luis Obispo, just south of Santa Barbara. 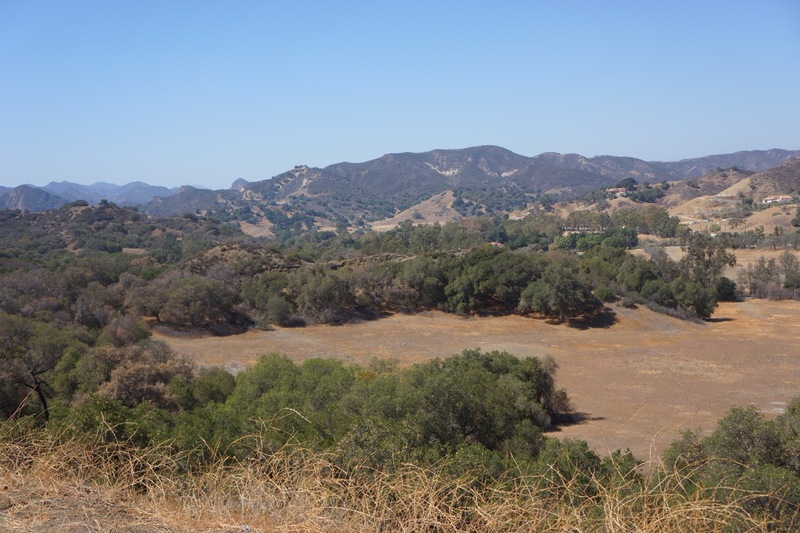 In LA, we found a fantastic campground in Malibu, at Malibu State Park near Calabasas which is where Justin Bieber and the Kardashians live, but no we didn’t see either!. 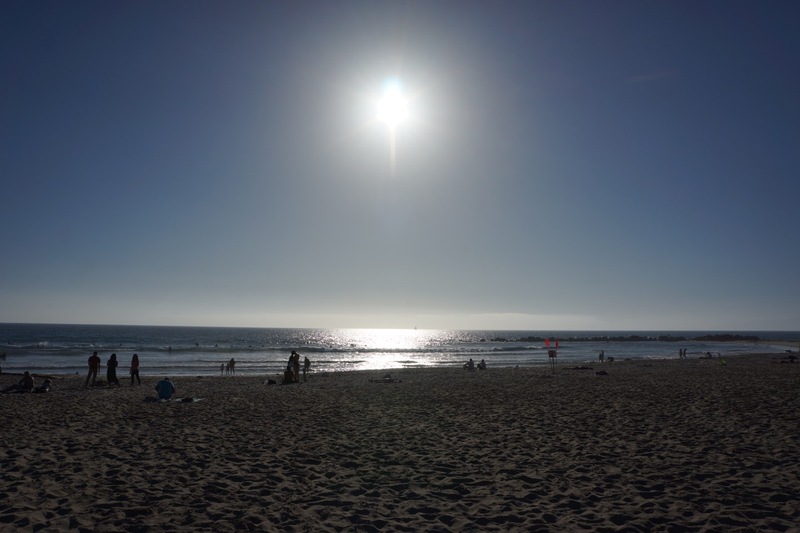 We caught up with a friend, Kat and her little boy and spent some time walking around Manhattan Beach and Venice Beach. 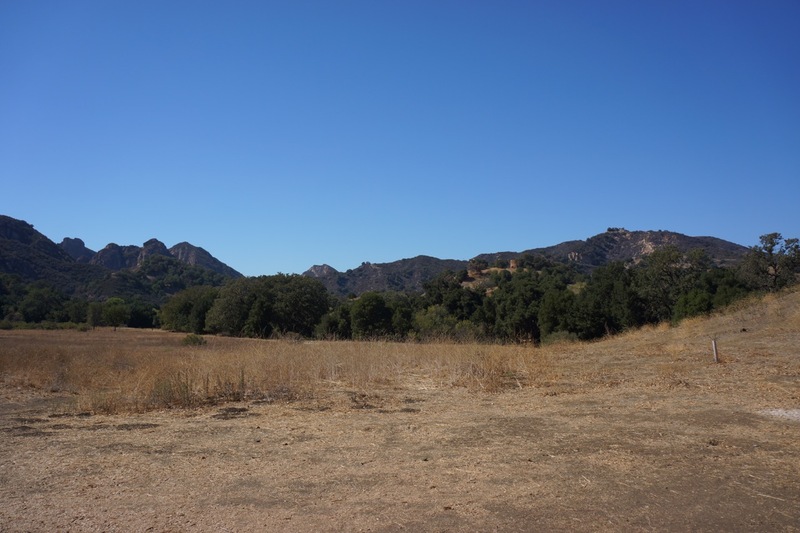 Malibu Creek State Park, our campground for several days. Hard to be believe this quit spot is just ten minutes from Malibu Beach. 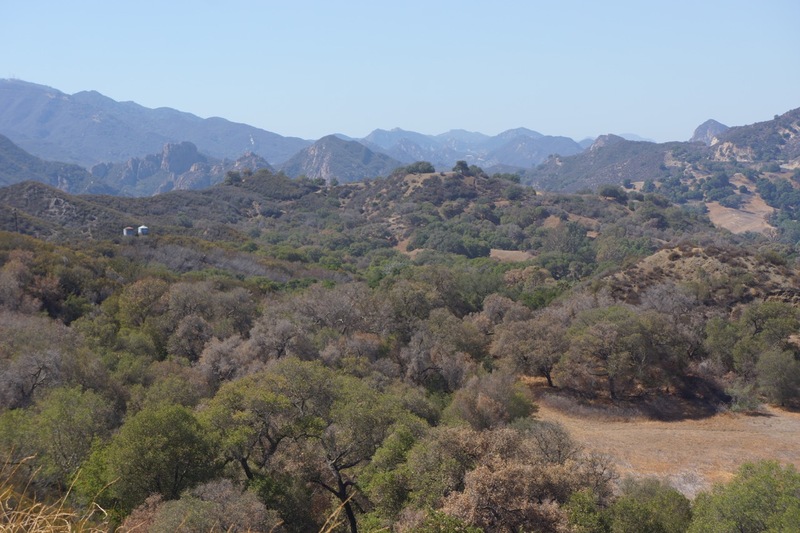 Malibu Creek State Park is land that was once owned by MGM – the TV/Movie company. 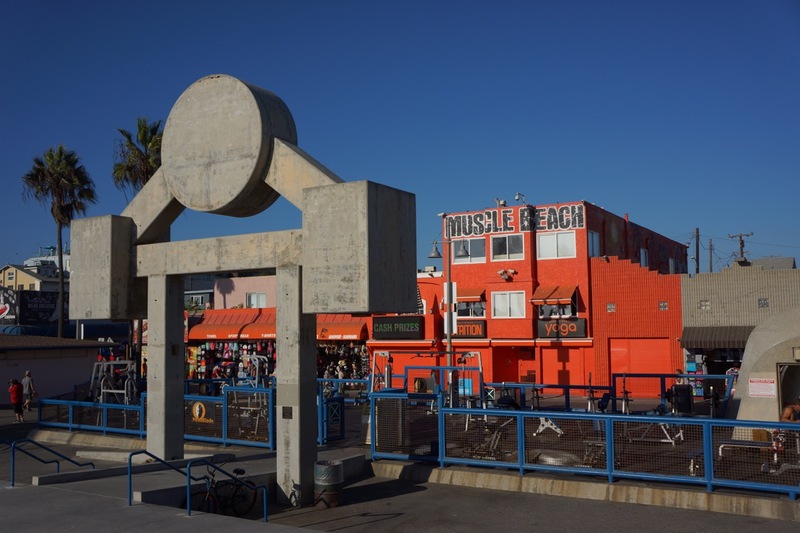 Many movies were filmed here, including the original Planet of the Apes. It was also the set location for the M.A.S.H. tv show! 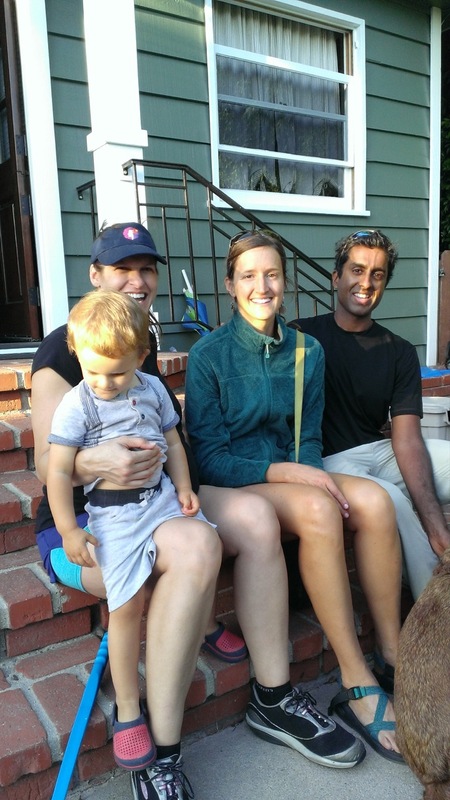 Meeting Kat and her adorable baby boy, Grider, in Manhattan Beach (LA). 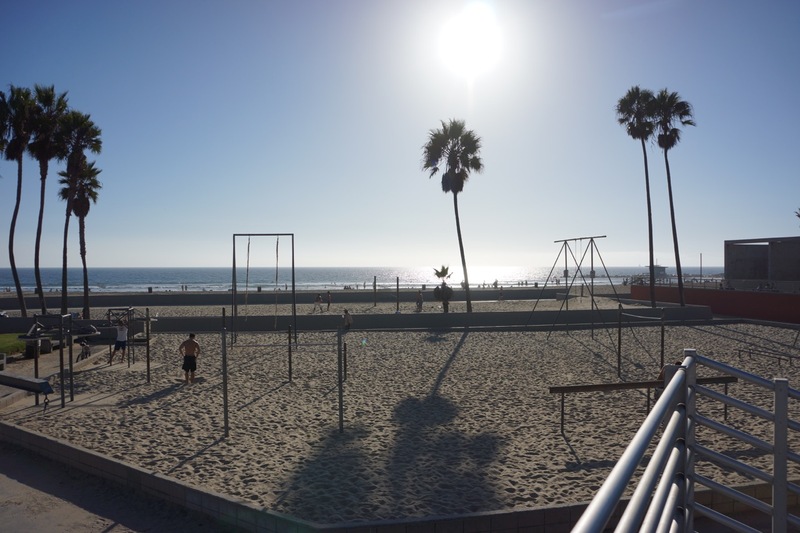 The outdoor adult jungle gym area at Venice Beach. Unfortunately, dogs were not allowed on the beaches so that limited the time we wanted to spend in LA. 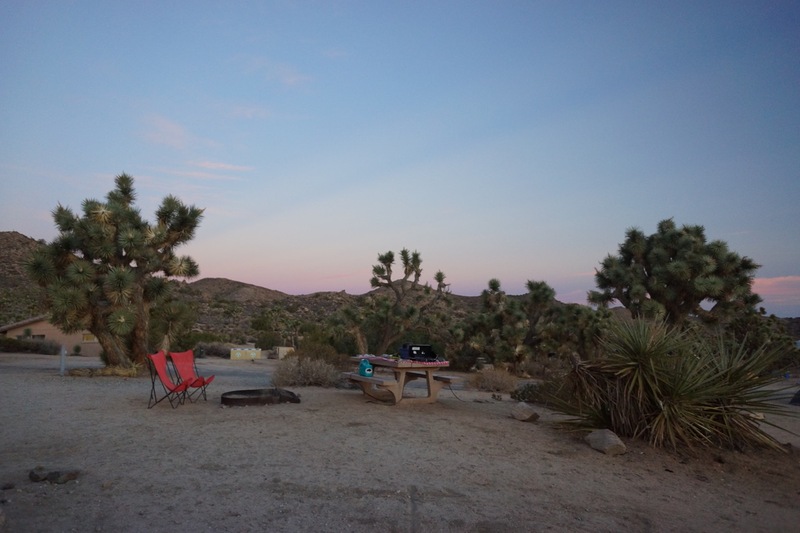 We were also itching to get back to the wilderness camping lifestyle, and cruised over to Joshua Tree National Park after three full days in LA. 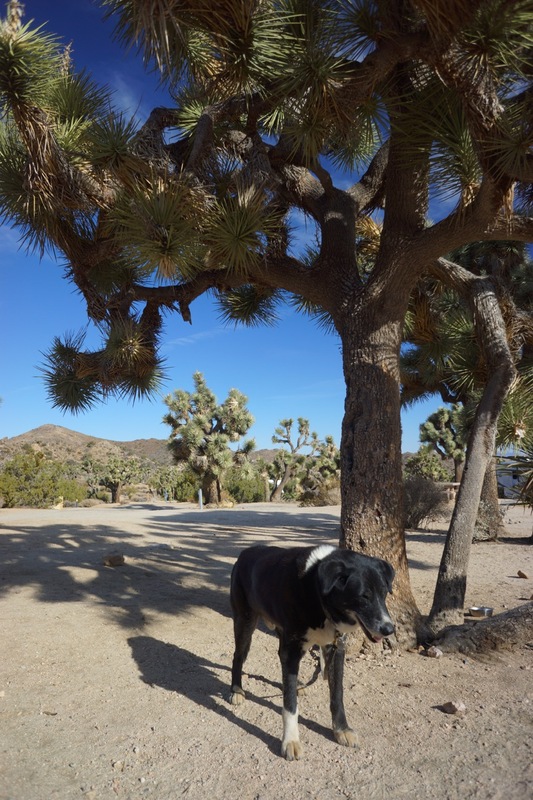 Joshua Tree was amazing. 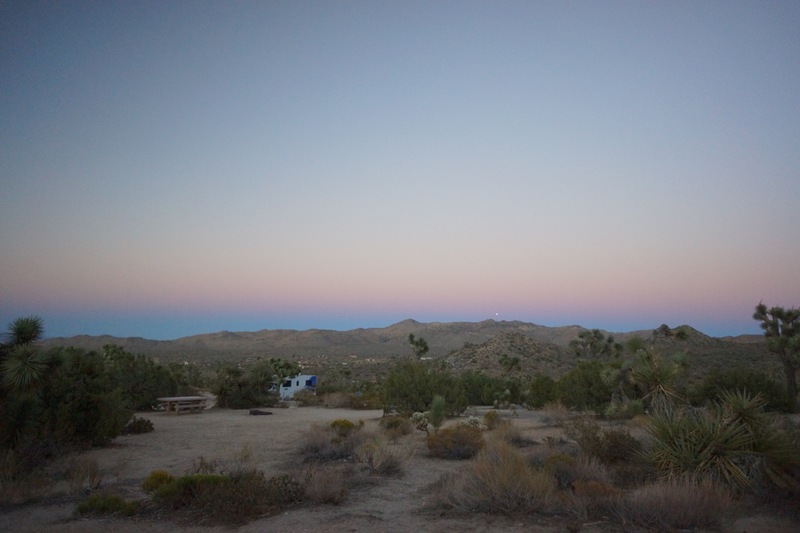 We stayed there three nights, at a high desert campground right on the edge of the National Park. The sun was bright and hot (but not too hot) during the day, and the nights were crisp and cool. 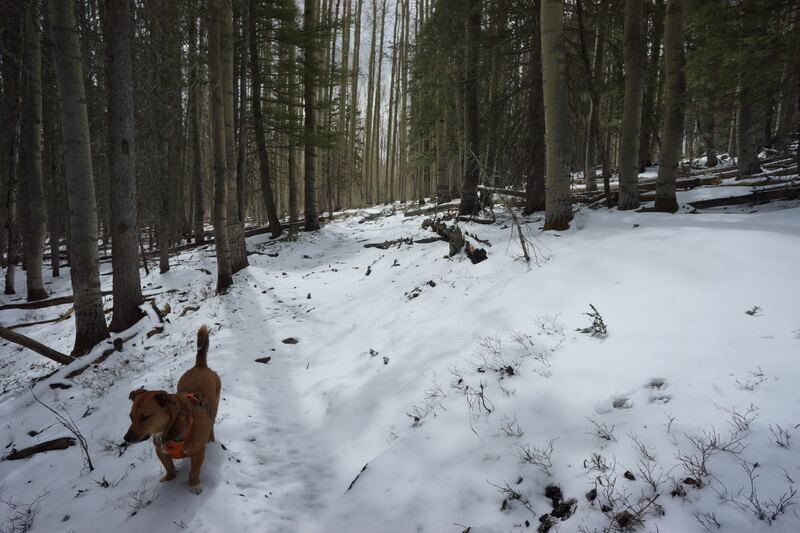 We had a variety of sandy trails leaving right from the campground, and we took full advantage of them with daily trail runs. 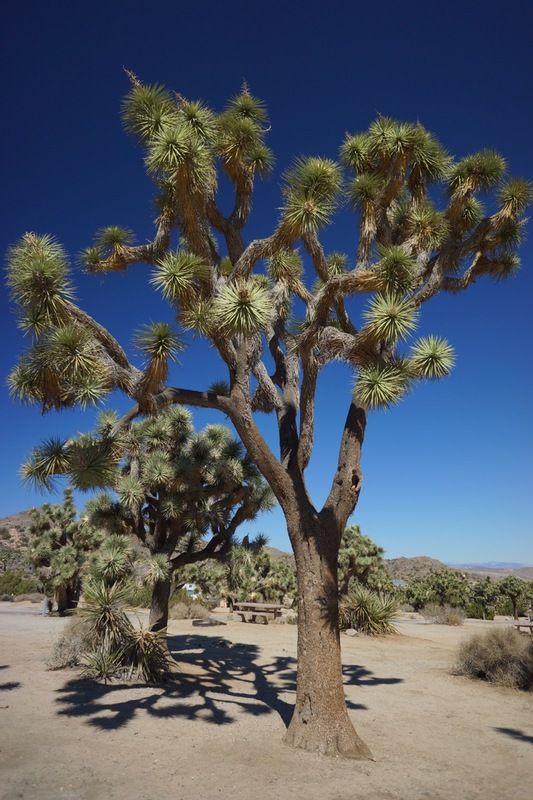 Joshua Trees (a member of the Yucca family) were abundant. 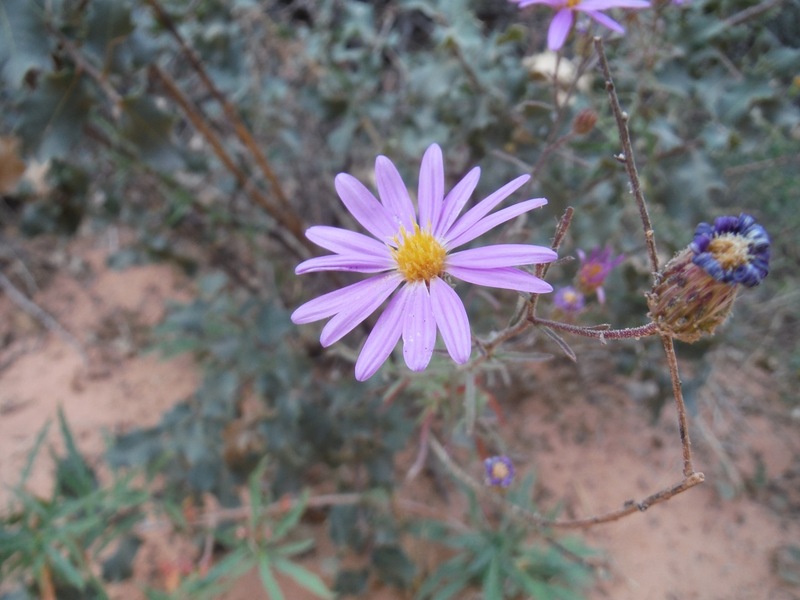 Some people think the desert is bleak and empty, but Alison and I think otherwise. 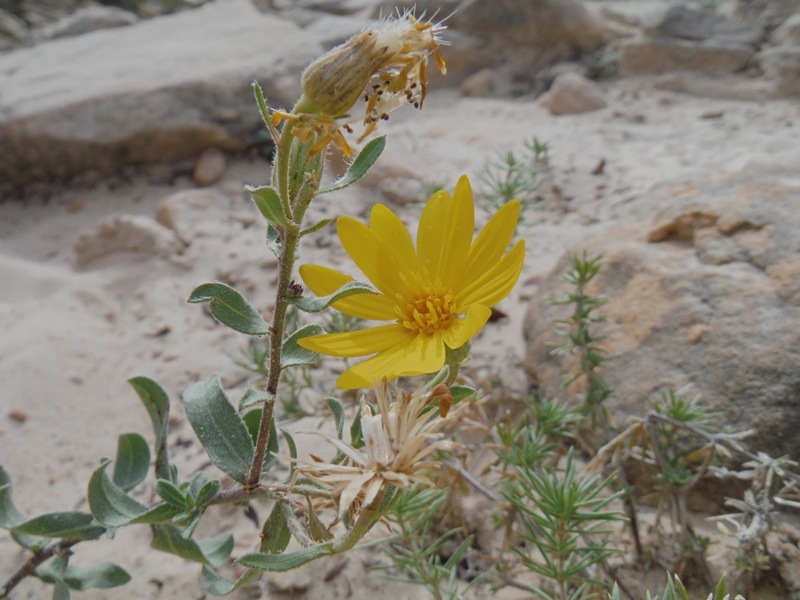 There is lot to see and appreciate in the desert. 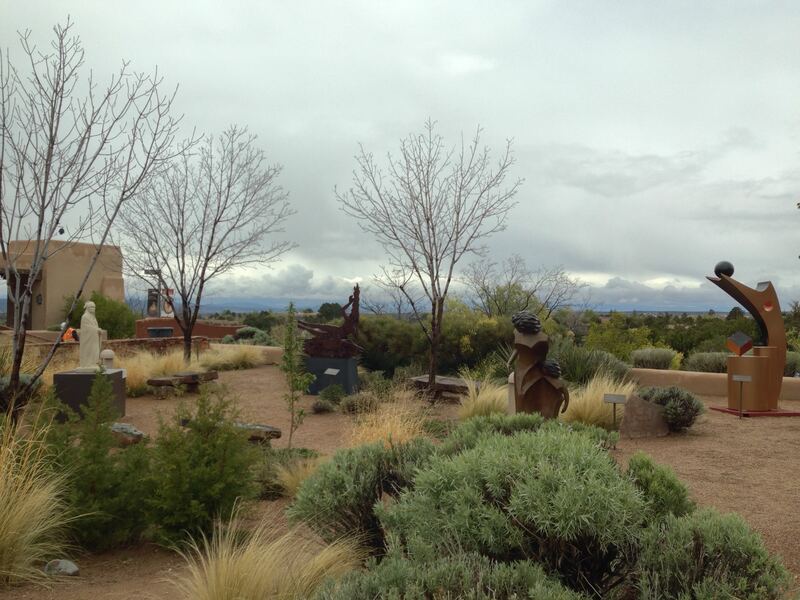 Lizards, birds, and a variety of Yucca, Cactus, Mesquite and other shrubbery. 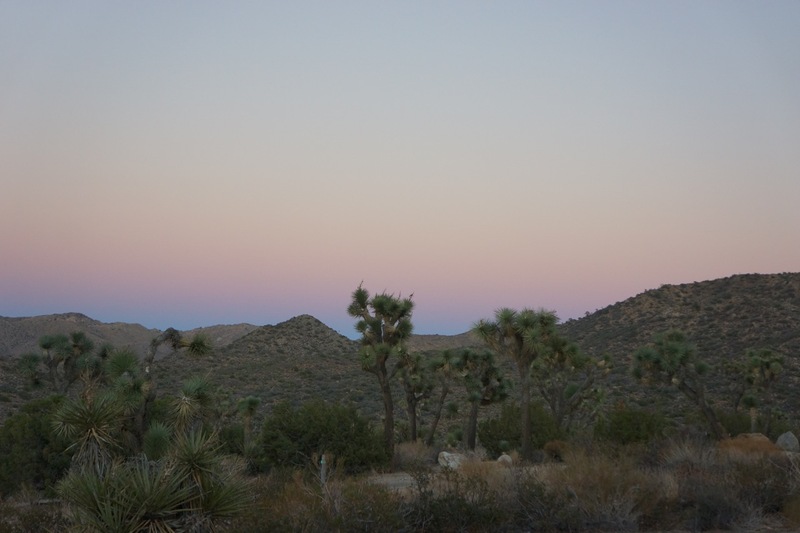 The clear air means that sunrise and sunset views are epic and the night stars are as bright as you would see anywhere. 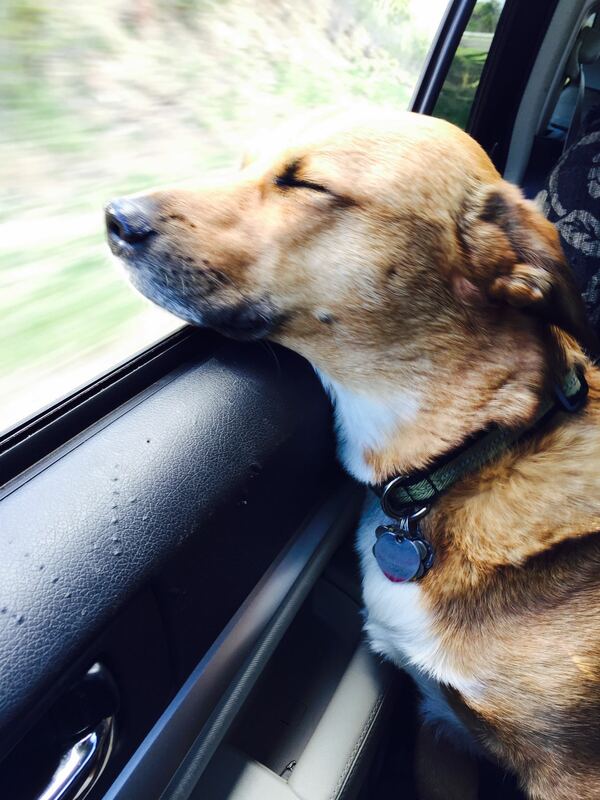 We spent a day driving through the park. 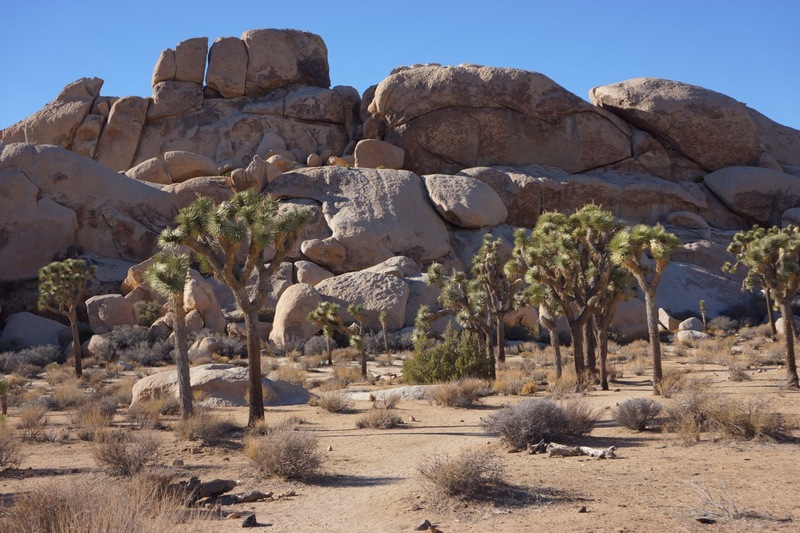 There were a lot of cool rock formations, and of course, a ton of Joshua Trees everywhere. 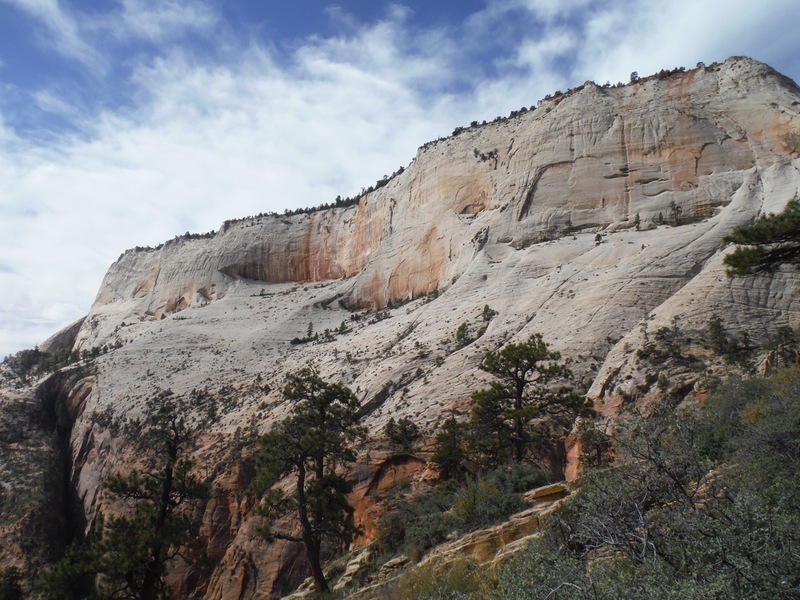 It is a climbers paradise. Since we were with the dogs, we didn’t do any epic hikes in the park. 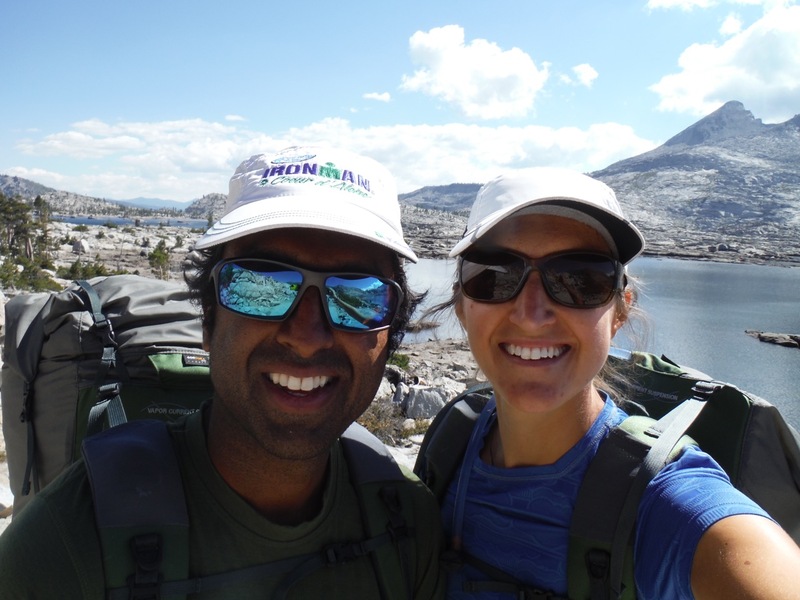 We just saw the sights from the scenic road, and spend most of our time hanging out at our campsite – cooking vegetarian food, trail running, reading and napping. 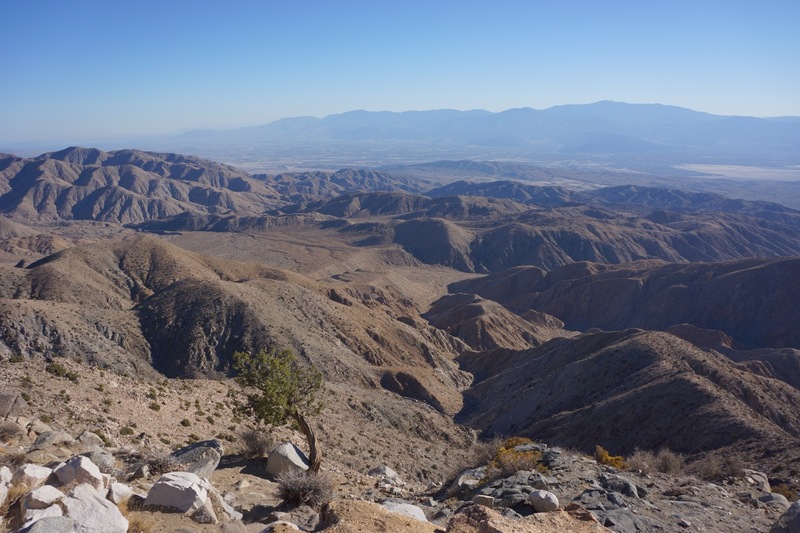 View from scenic overlook in Joshua Tree National Park. 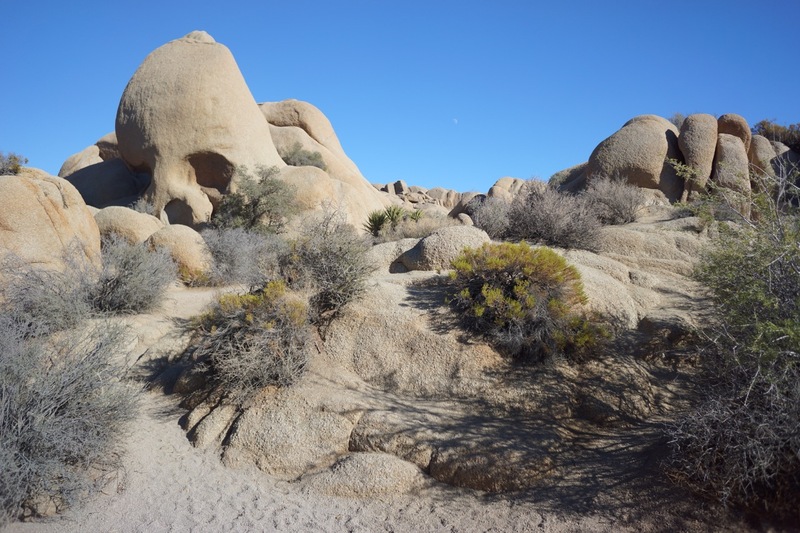 Cool rock formation are all over the place in Joshua Tree National Park. After Joshua Tree, we headed into Palm Springs to load up on food, and then headed over to Phoenix to visit Alison’s grandma, and then cruised up to Sedona, Flagstaff and the Grand Canyon. Details on those places to come! 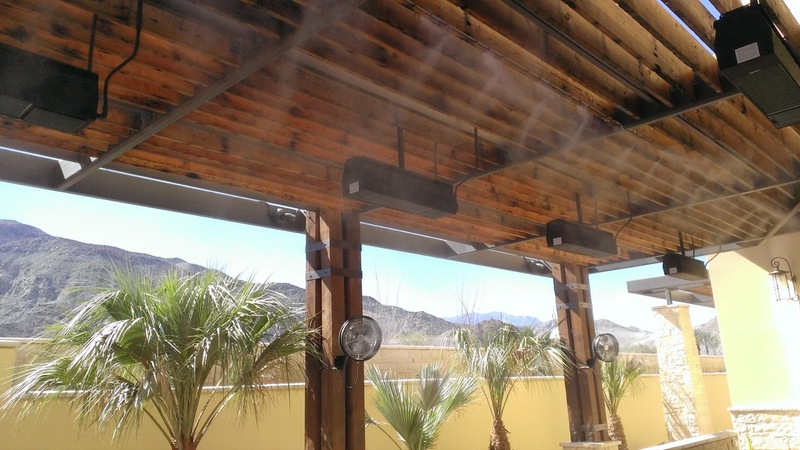 Palm Springs was super hot (well over 100 degrees, with little breeze and lots of pavement)….the Whole Foods had this crazy mister system to make the outdoor patio more pleasant. 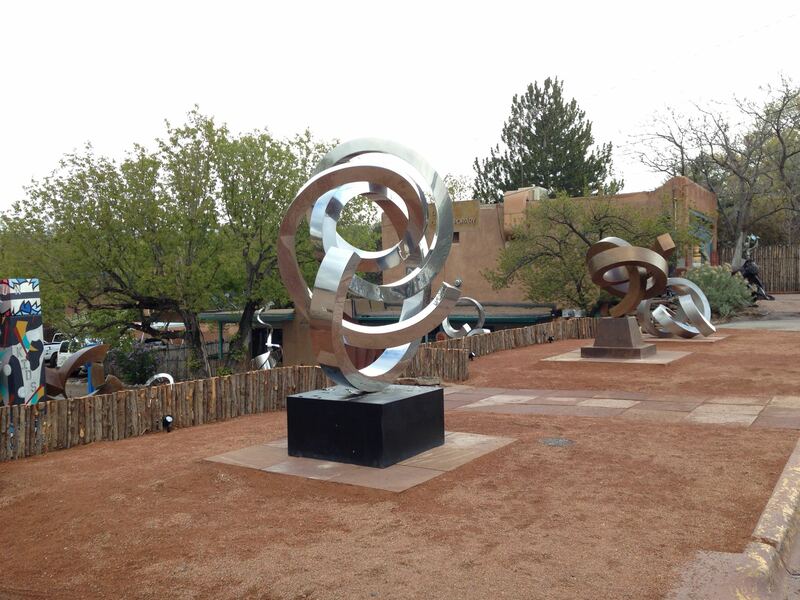 These misters are a common sight in upscale desert towns. 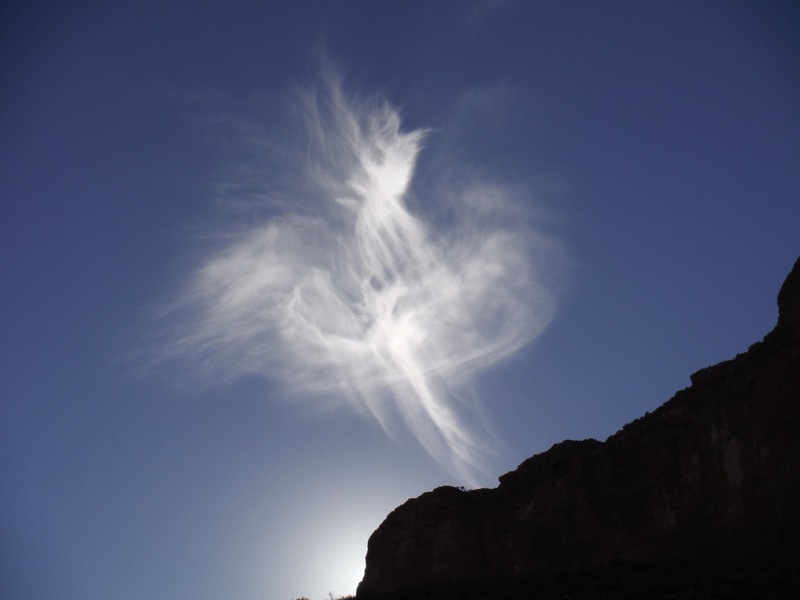 Ironic how often people move to the desert for the sun and the heat, only to sit inside in air conditioning and do crazy things like this just to make it cooler! Hello from Moab! 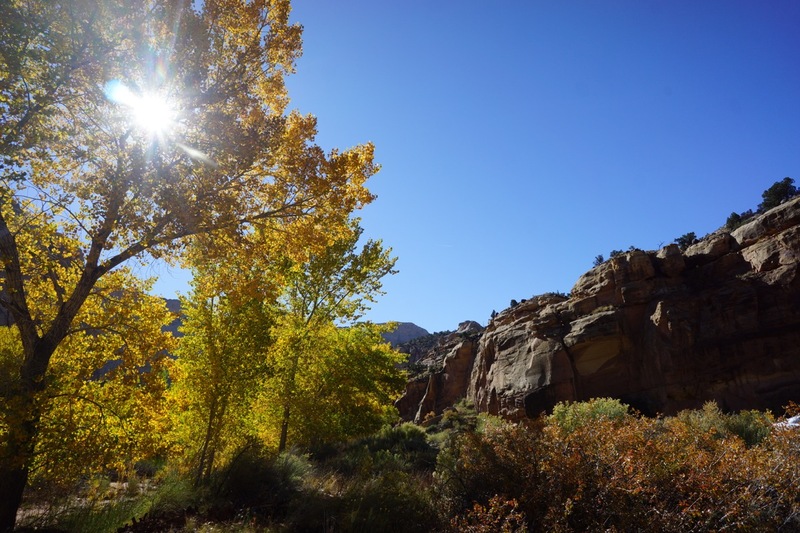 We’ve been traveling through Southwest Colorado the last couple days and made our way back to Moab to enjoy the last bit of warm weather before we head north to Canada for our Nordic skiing adventure set to begin mid-November. 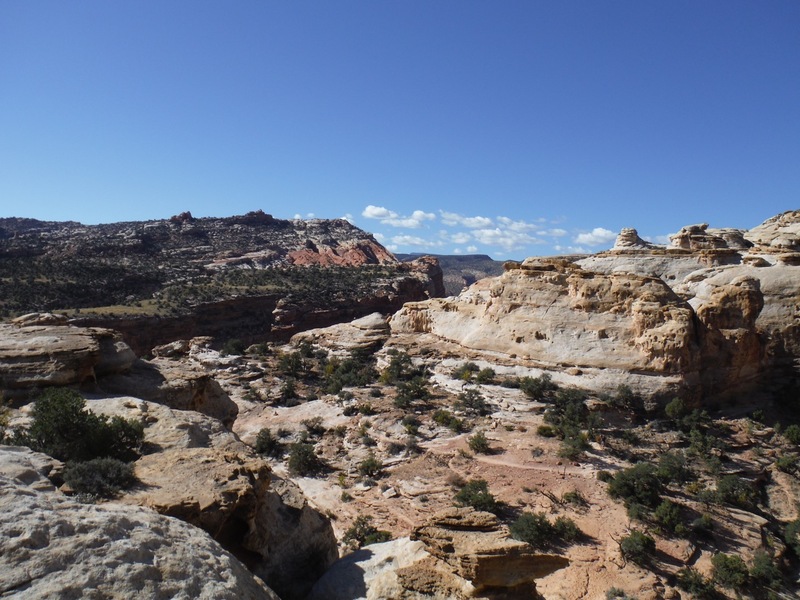 We have some reliable internet access as we’ve been crashing at cheap motels the last few nights to avoid the freezing temps in CO, hence the blog updates. 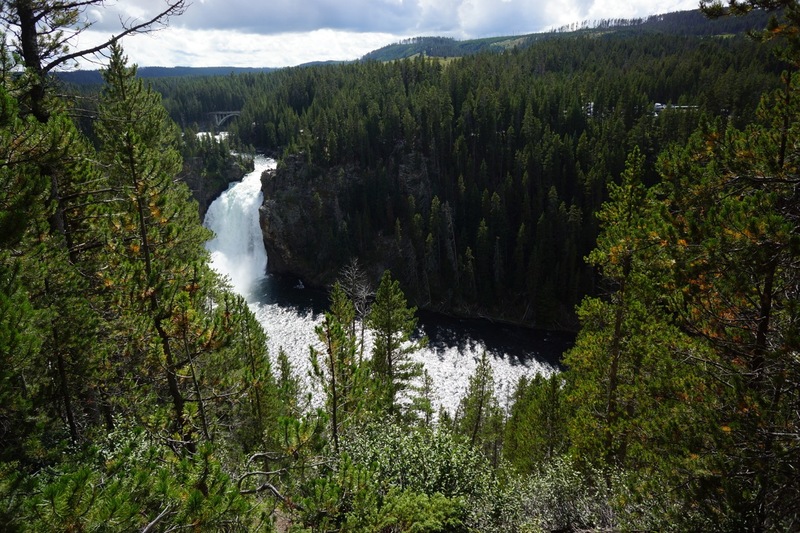 This post picks up after our stop at Yellowstone and before our JMT hike. 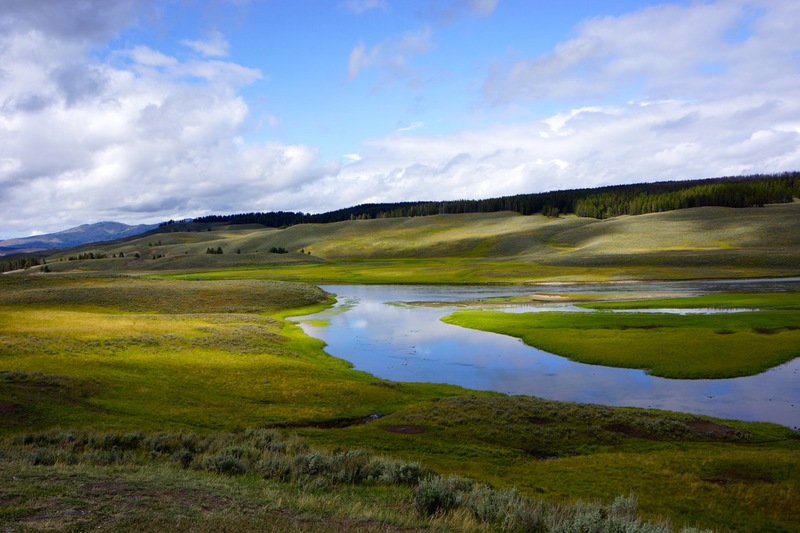 After a chilly few days in Yellowstone we were hoping to spend quite a bit of time in Jackson and the Tetons, but the weather was horrible so we opted to drive through, visiting with a friend over dinner, and making our way toward the sun in Tahoe. 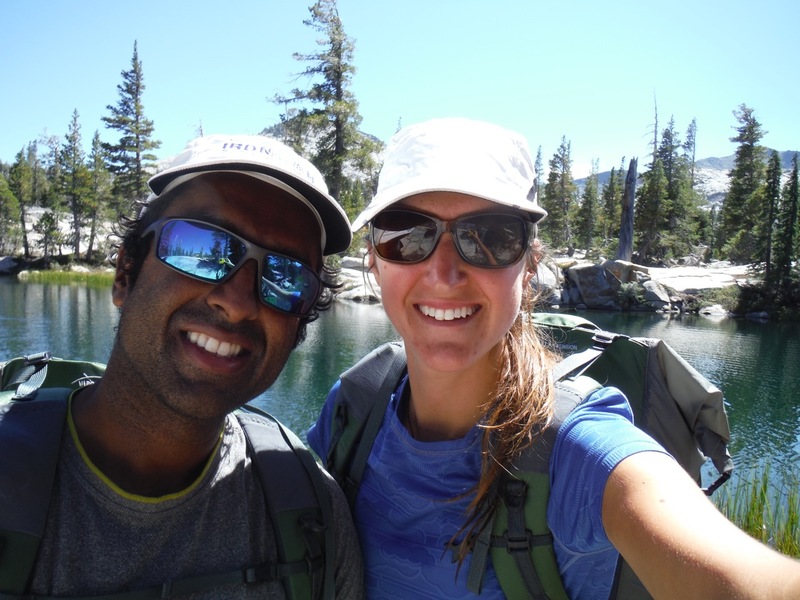 We spent about 4 days in Tahoe enjoying the scenery, testing our gear for the JMT hike, and trying to acclimatize a bit to altitude. 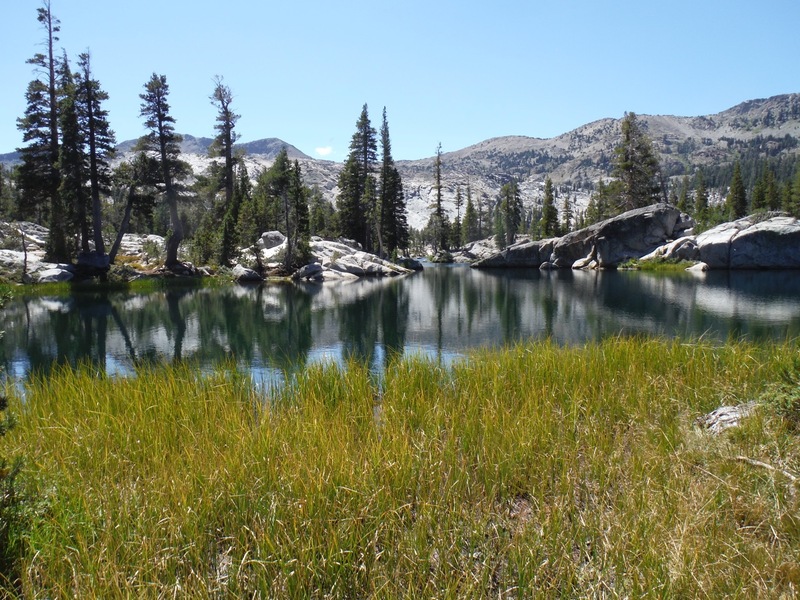 Tahoe was like the appetizer to the JMT; we did a couple of hikes in the Desolation Wilderness and got a taste of the granite peaks we would see in Yosemite, Sequoia, and Kings Canyon. 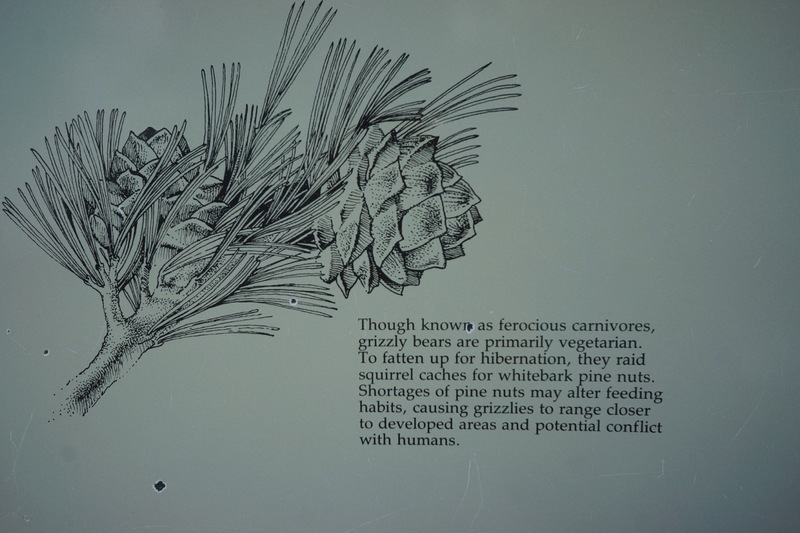 We stayed at a lovely state park, Sugar Pine Point, about 12 miles North of South Lake Tahoe. 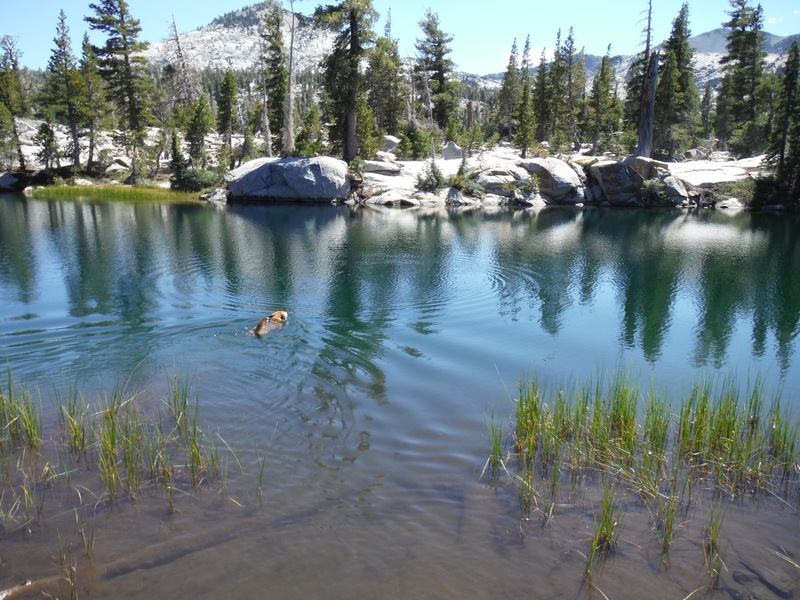 The park had some great trail running on the nordic trails used in the 1960 Squaw Valley Olympics, beach access to Lake Tahoe, and spacious campsites. 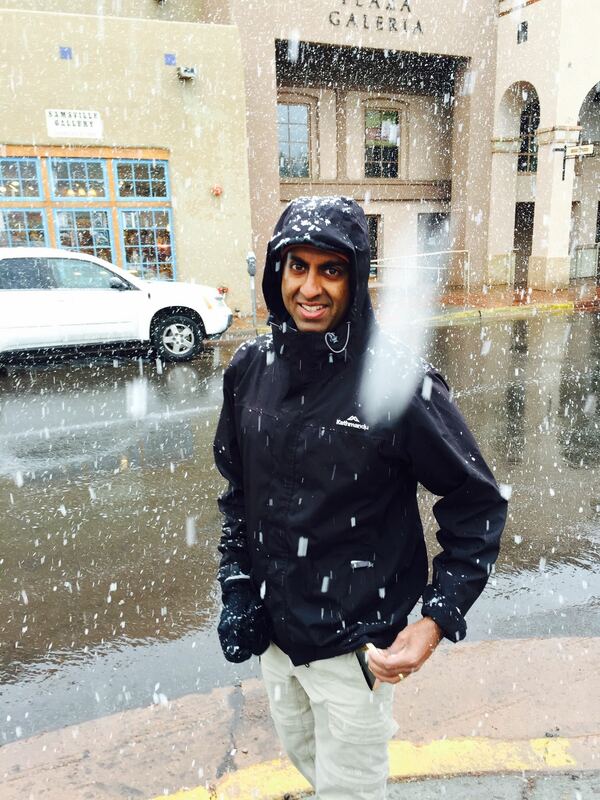 Lastly, a trip to Tahoe wouldn’t be complete without sampling some of their delicious food establishments. 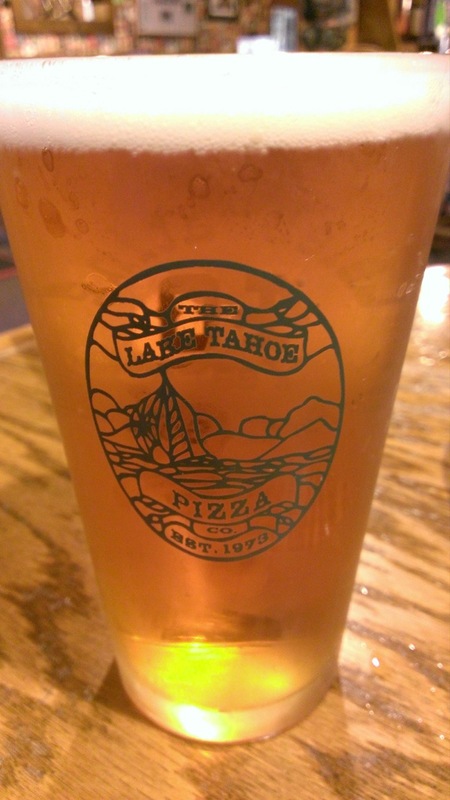 We enjoyed picking up some groceries at Grass Roots (Natural Foods store), vegan pizza and beer at Lake Tahoe Pizza Company, Pho at Yama Noodles, and veggie burgers at Sprout’s cafe. Definitely lots of good food options. After Tahoe we headed to the bay area to spend a few days with Ravi’s brother and his family before heading out to Yosemite. 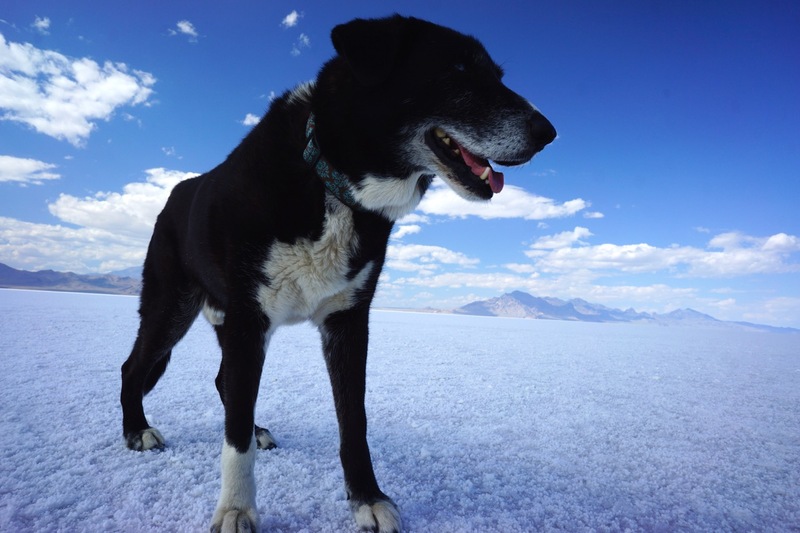 On the way to Tahoe we stopped at the famous Bonneville Salt Flats for a little photo shoot. Spike stole the show. 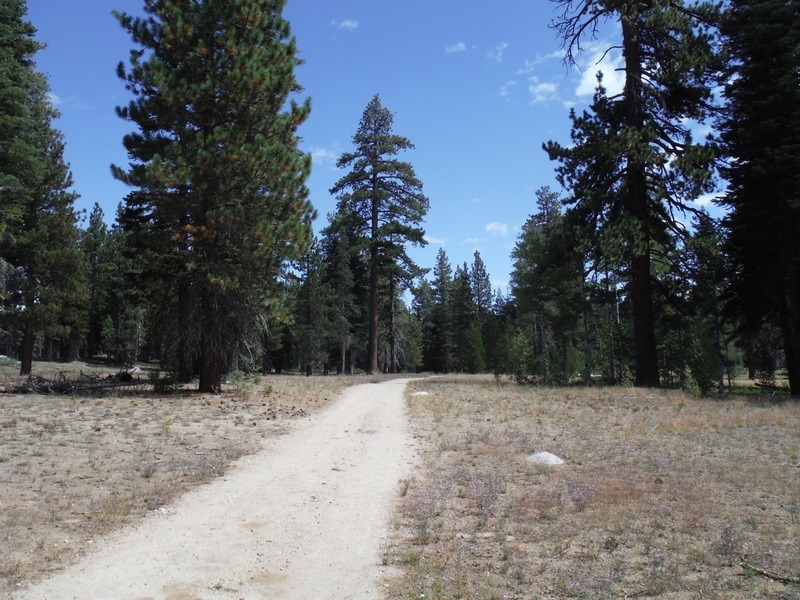 Running the Nordic trails at Sugar Pine Point State Park. 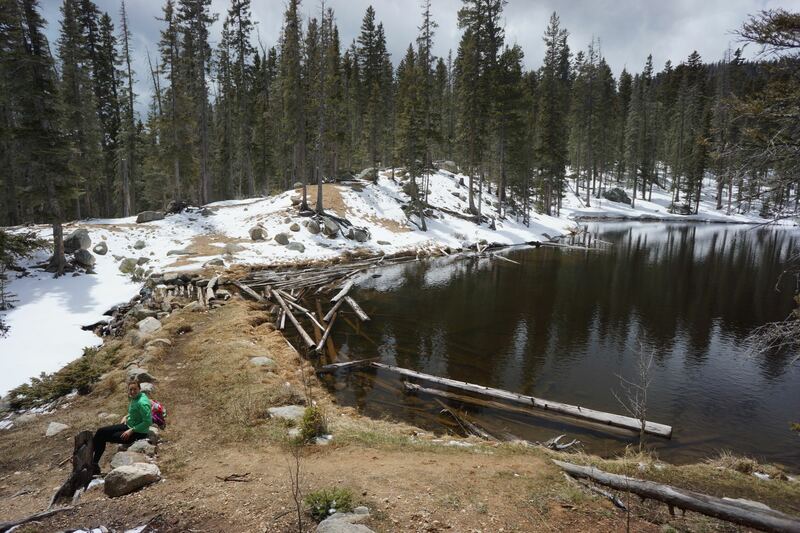 Testing our gear on a section of the PCT leading up to Aloha Lake. 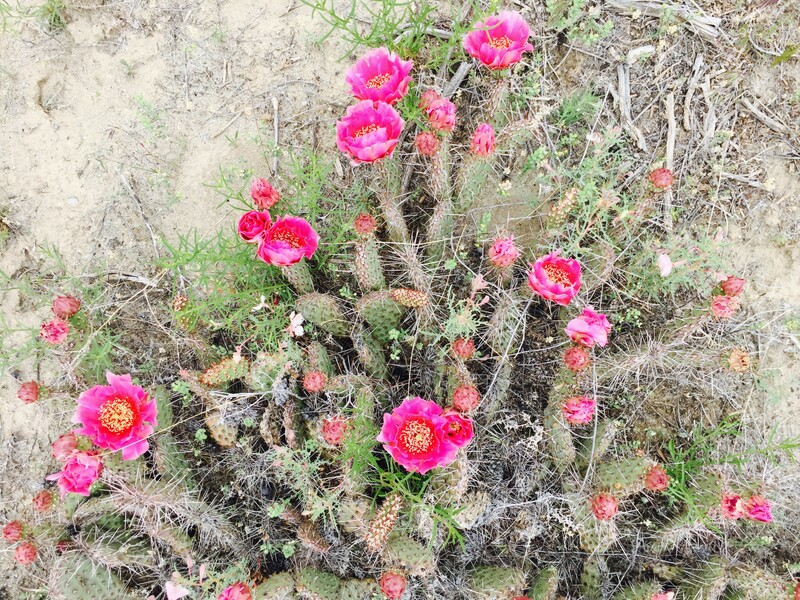 On a section of the PCT. 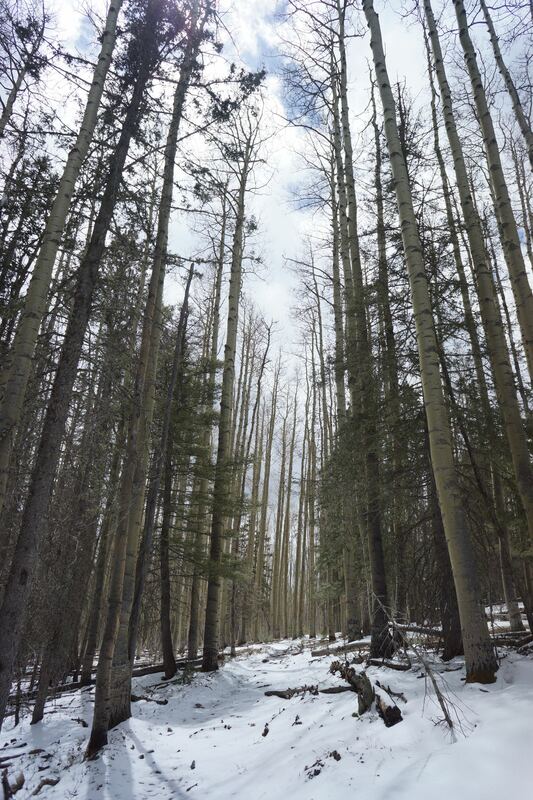 Hefty trees to withstand the tough winter. 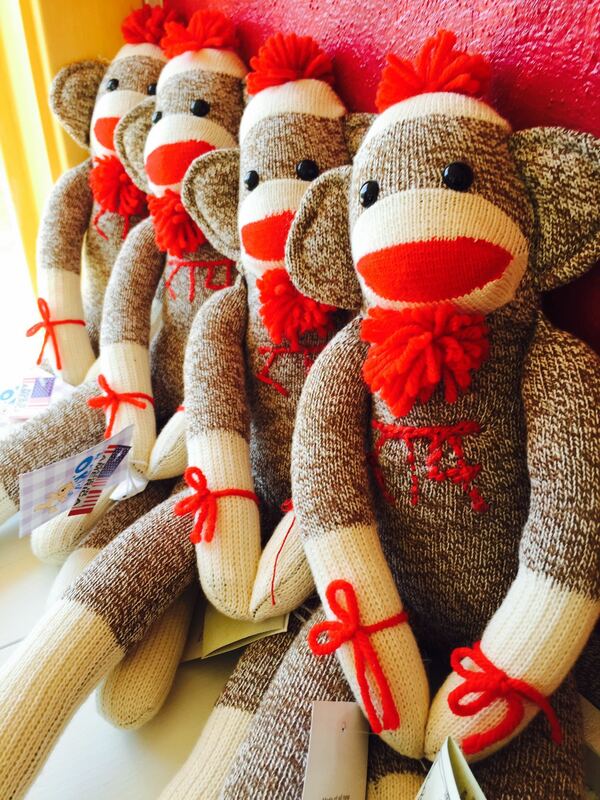 These guys would make for some good tree hugging. 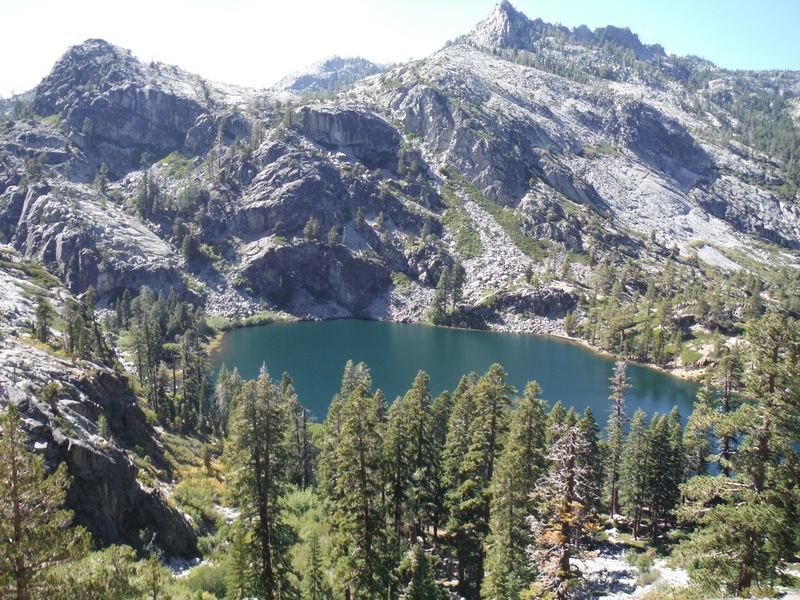 A sampling of the granite peaks we would be seeing further south in the Sierra’s. Vibrant colors at Aloha lake. Too chilly to swim but very nice to soak my feet. Amazing views at Aloha Lake. Duke loving the alpine lakes. We took a dip, albeit a chilly one, before Duke got in. After lunch and a swim. 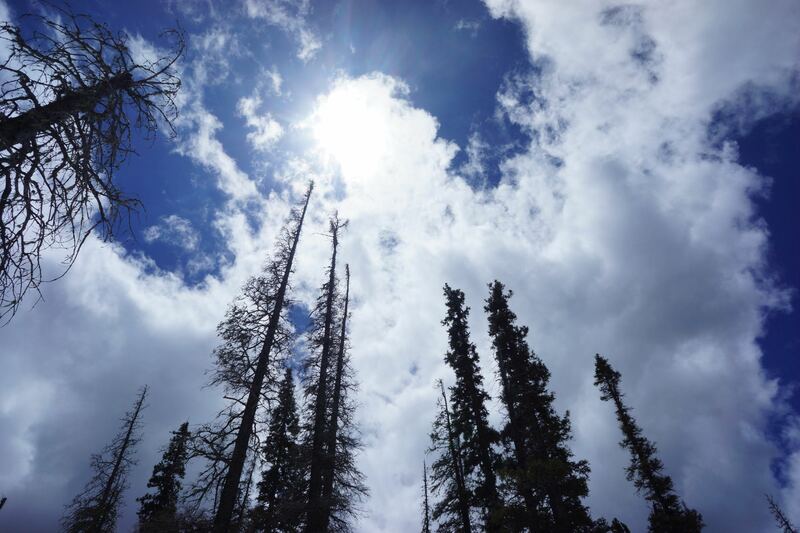 On the way to Velma Lakes. 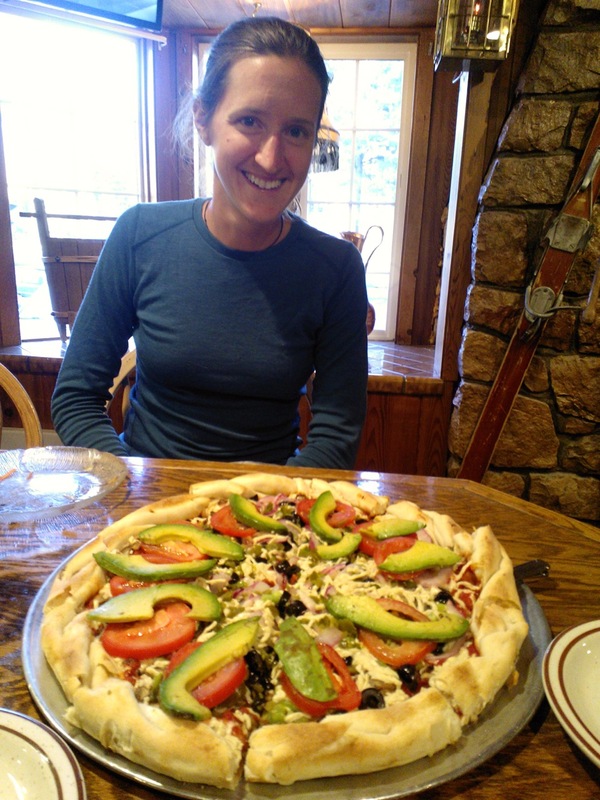 Vegan Pizza at Lake Tahoe Pizza Company. Pho at Yama Noodles. It was so good we ate here twice. 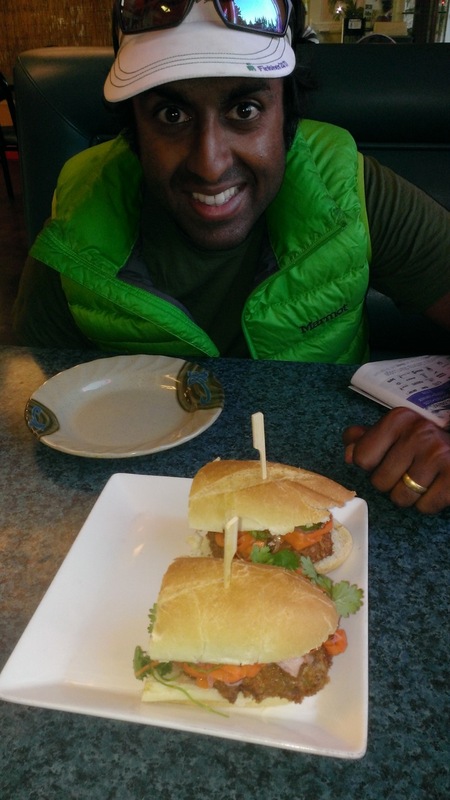 We also loved the “Jolly Green” Edamame Croquette Bahn Mi. Hanging out with the boys while Ravi is checking out a gear store. 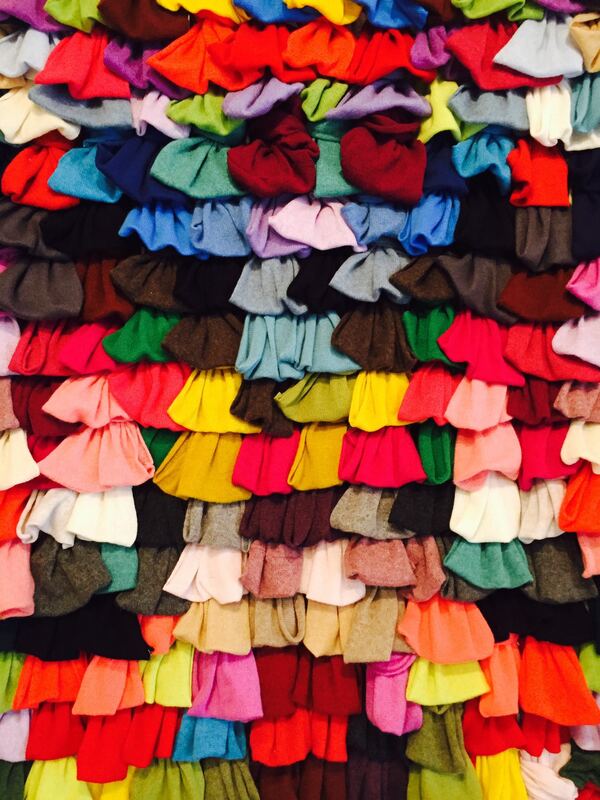 We are catching up on a backlog of posts from the past few months. 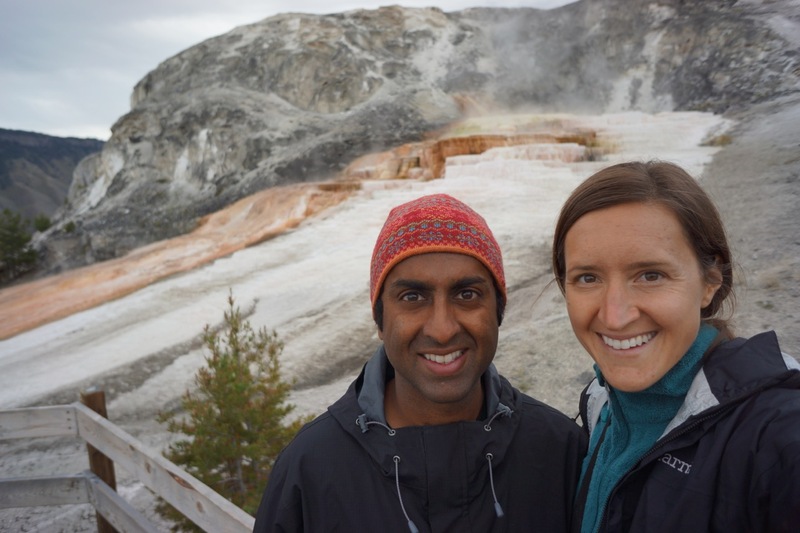 We visited Yellowstone and Lake Tahoe in August, 2014, prior to hiking the John Muir Trail. 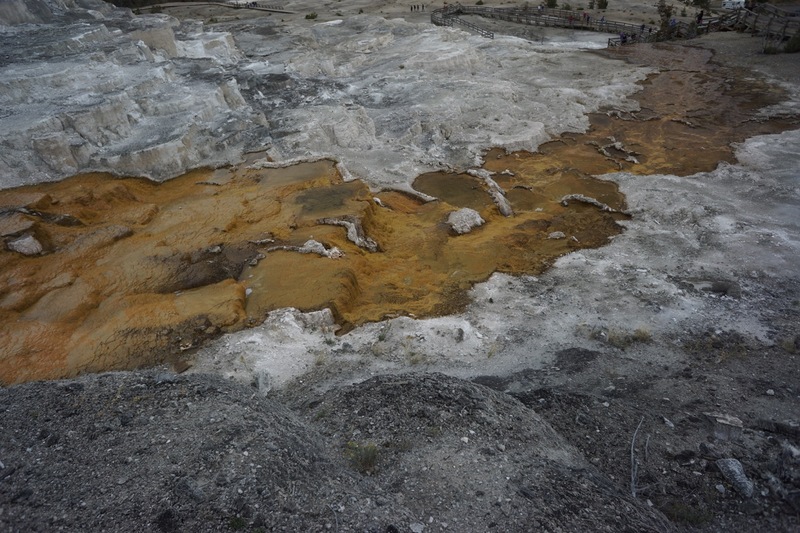 Here are some shots of Yellowstone. 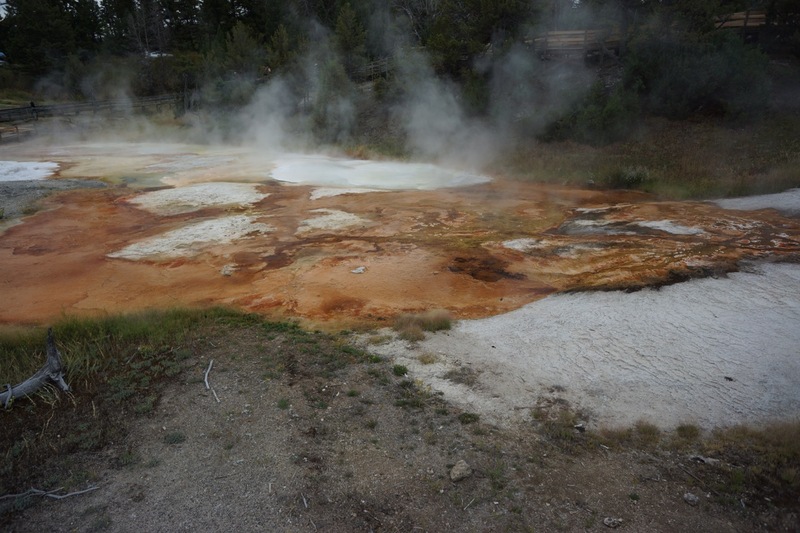 I don’t remember the names of all the pools, geysers, etc! But they sure are pretty. 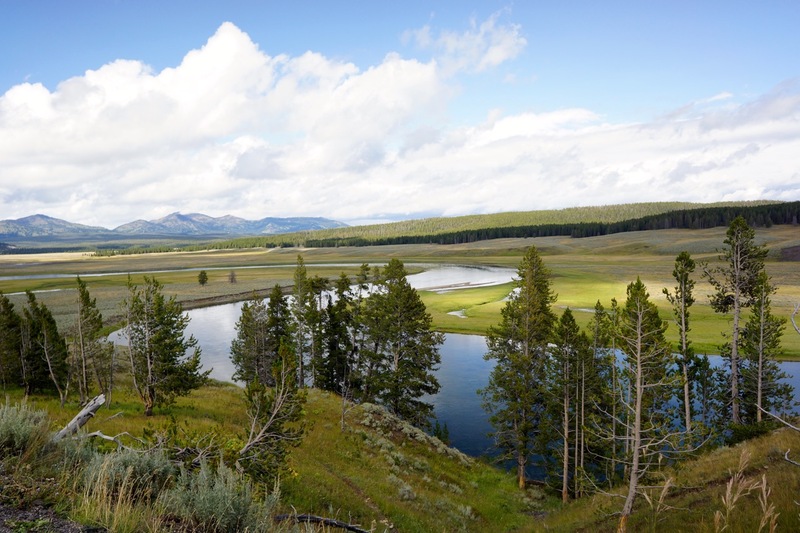 Yellowstone National Park is to many the quintessential American Park. 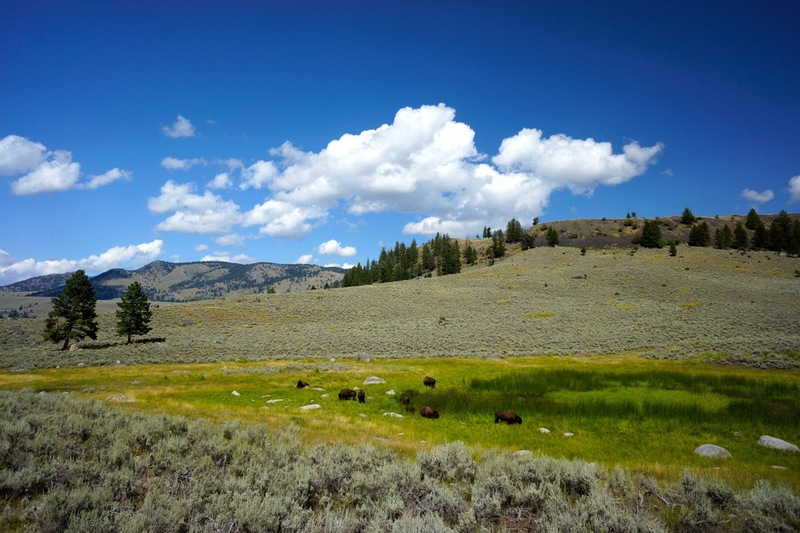 The wildlife, stunning scenery, and seemingly geologic wizardry draw millions of people each summer to see buffalo, bears, wolves, rivers, waterfalls, and of course Old Faithful. 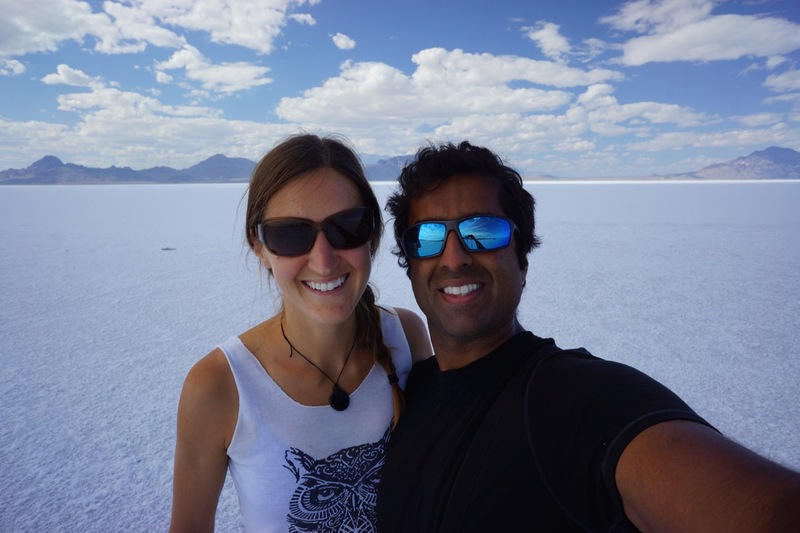 Ravi and I did a 50K nordic ski race in West Yellowstone a couple winters ago but neither of us had spent much time in the park besides a very cold snow coach tour (which by the way we highly recommend if you visit in the winter). We were expecting the weather to be warmer as we visited toward the end of August on our way back out West, but it was cold and rainy! 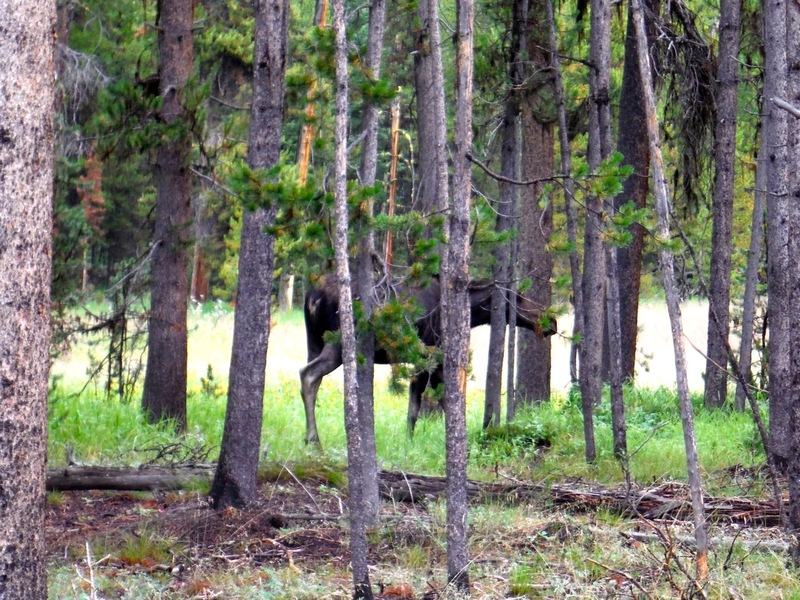 We still enjoyed our time and were lucky to see abundant wildlife; moose, bear, a lone wolf, buffalo, and elk. 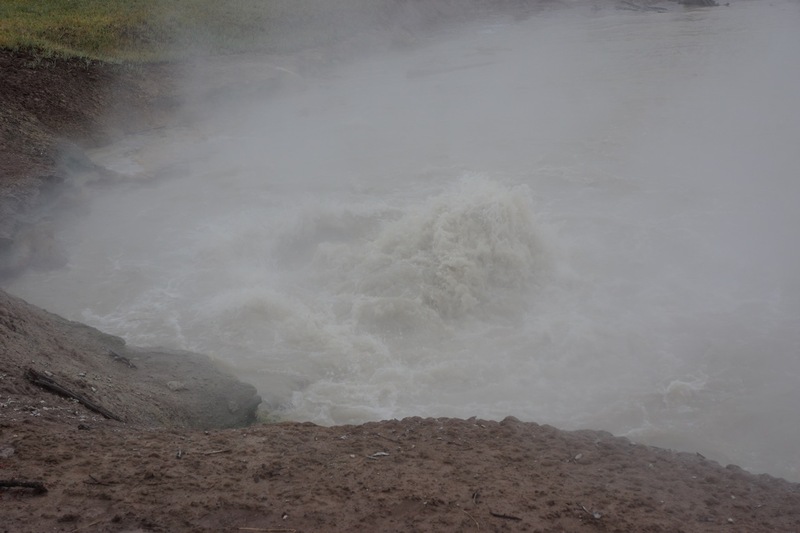 The benefit of the chilly weather was that we could both meander around the bubbling springs, fumaroles, mud pots, and geysers while the dogs relaxed in the car. 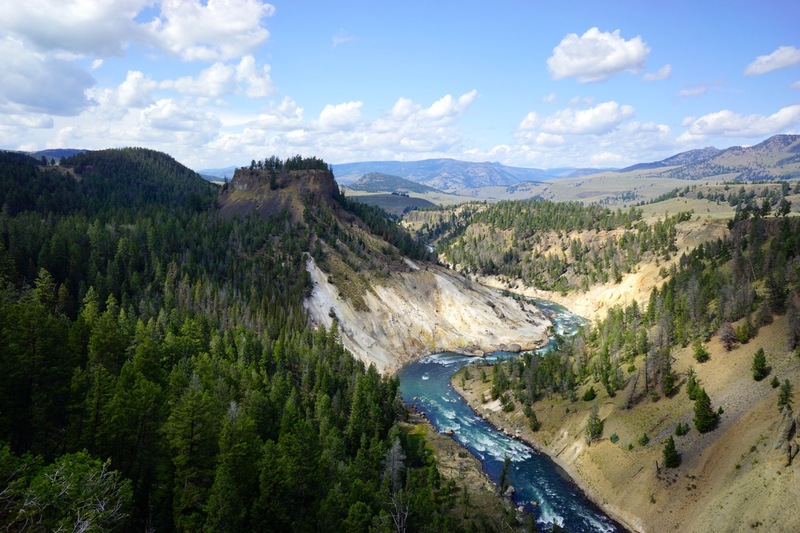 Yellowstone is actually quite high with an average elevation of 8,000 ft but the rolling mountains make it appear much lower. 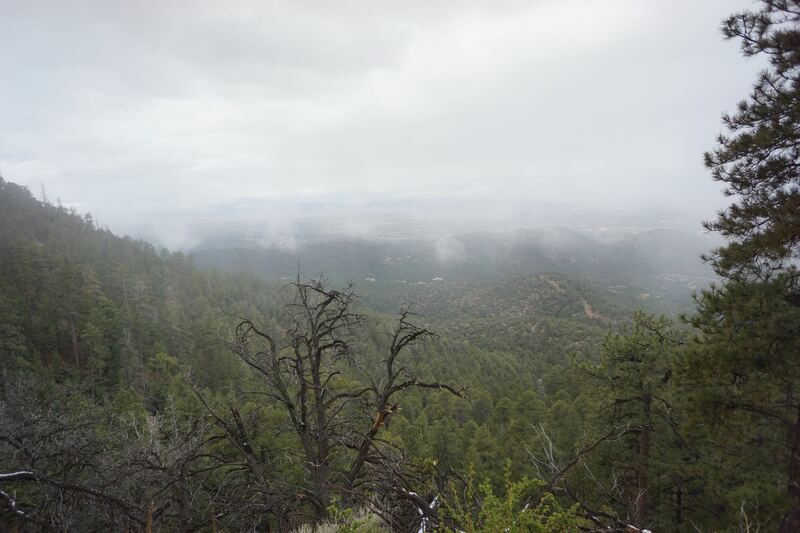 The cloudy weather made for some spectacular scenery. This feature, Dragon’s Breath Cave, is named after the roaring sound coming from the cave. Boiling water. 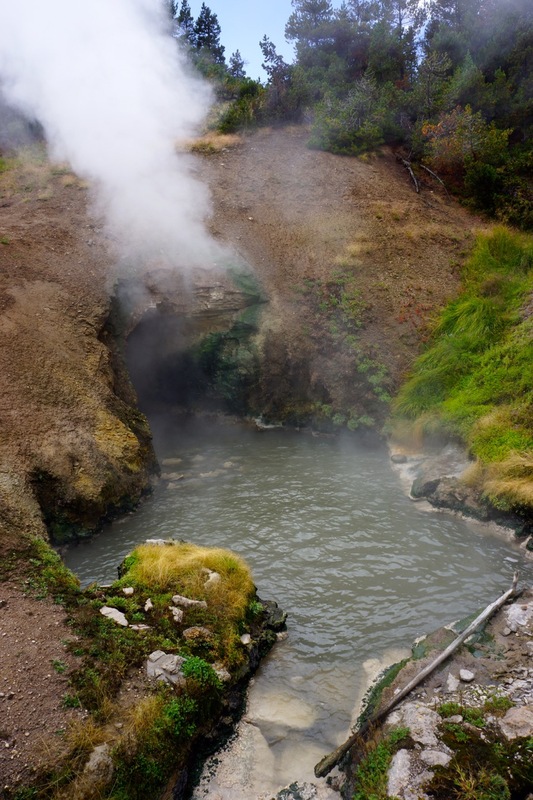 Part of the intrigue of the geothermal features are the unique sounds they make. It’s not all about their looks! 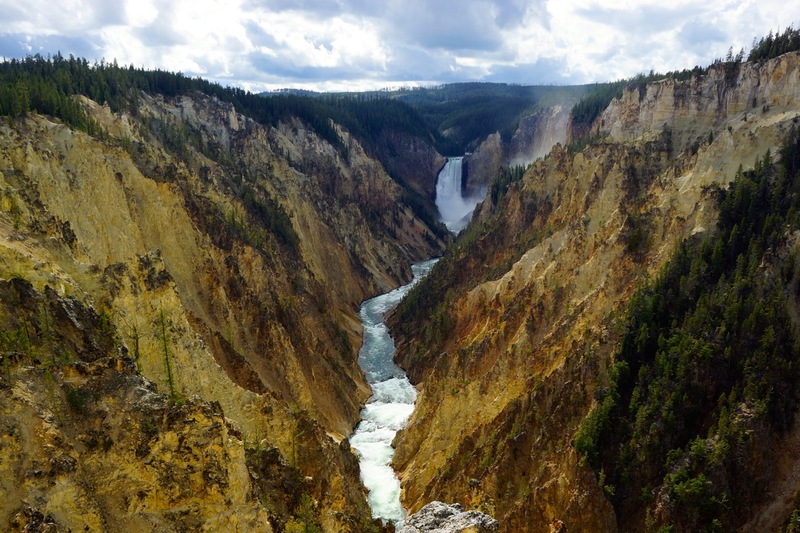 The Yellowstone River winds it’s way through the canyons, drops, and curves making for epic waterfalls. Lone moose with about 20 tourists taking photos from the road.